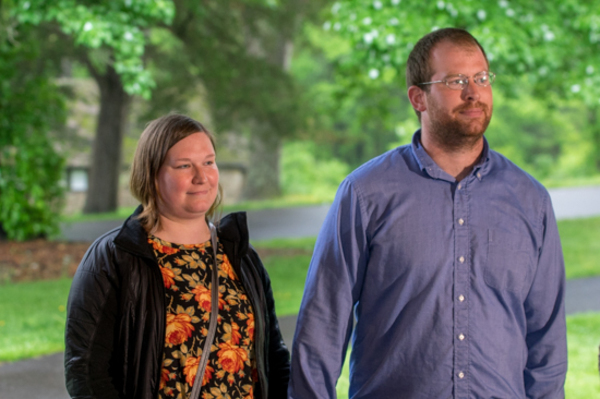 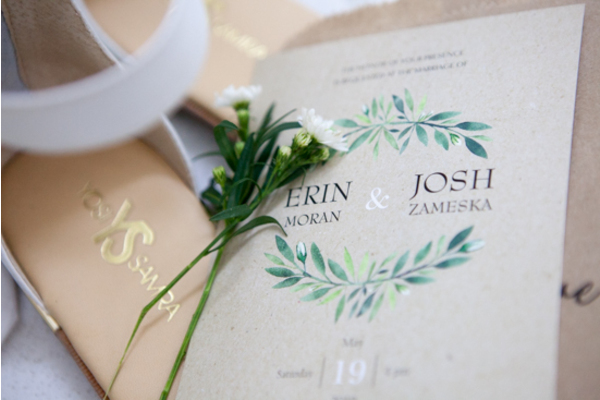 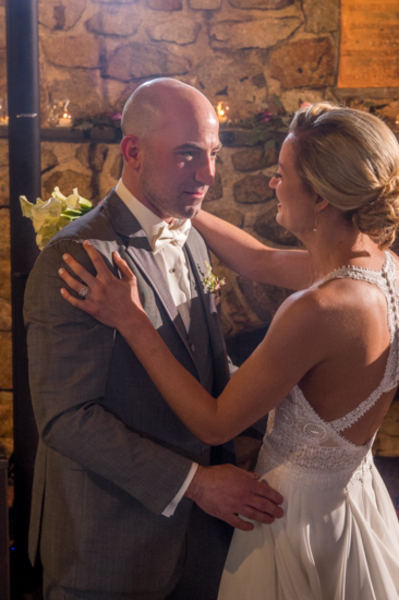 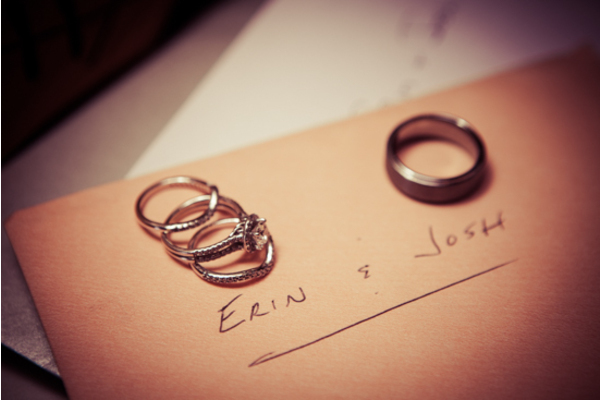 Congratulations to Erin and Josh on their recent marriage. 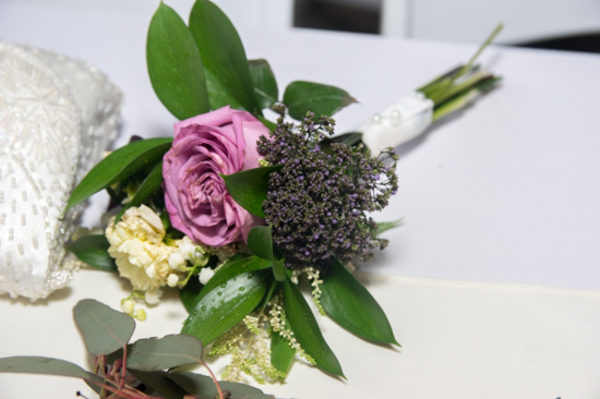 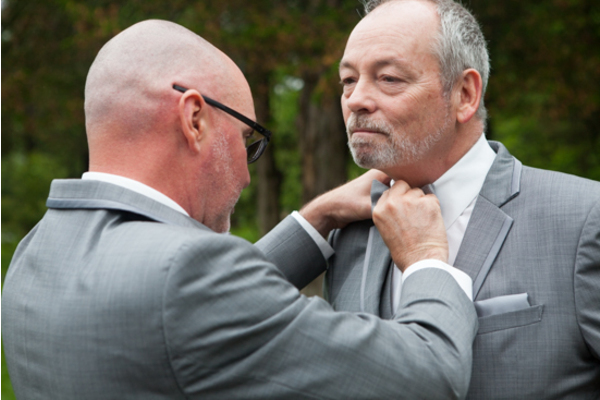 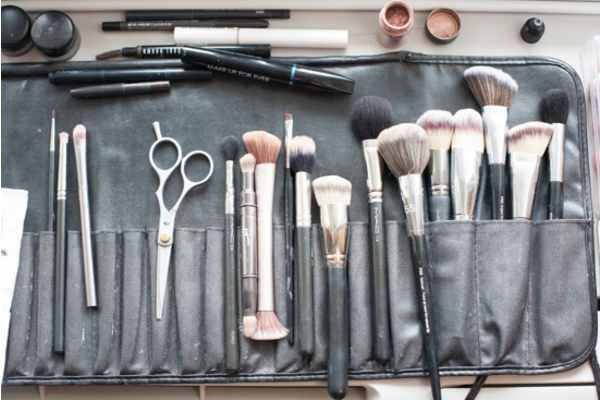 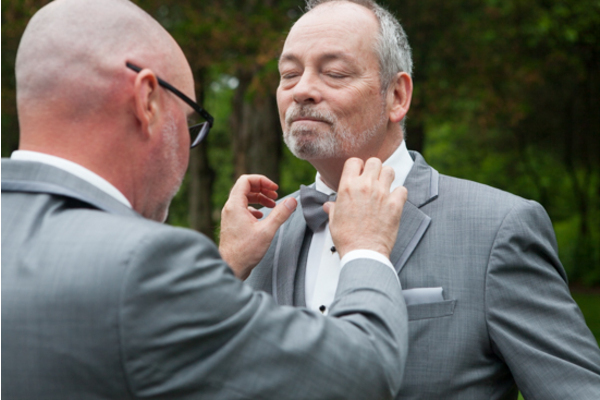 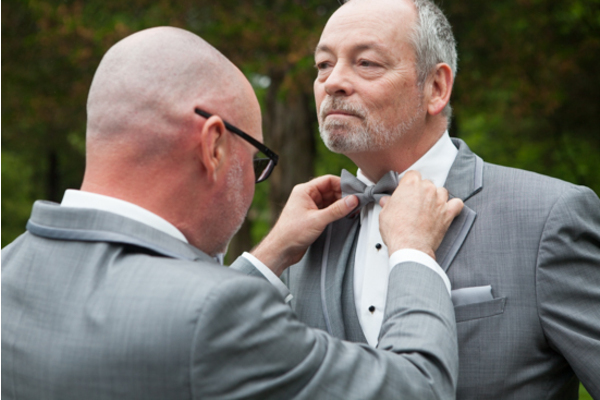 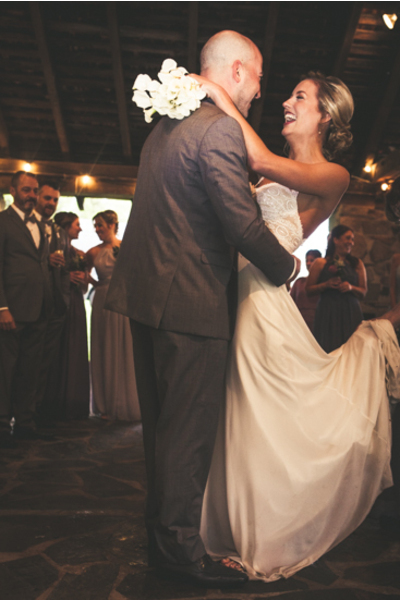 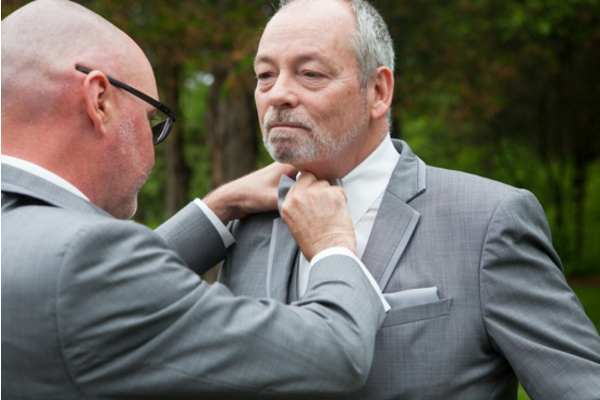 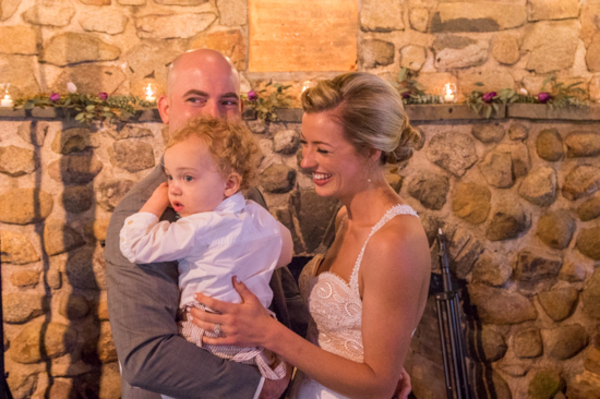 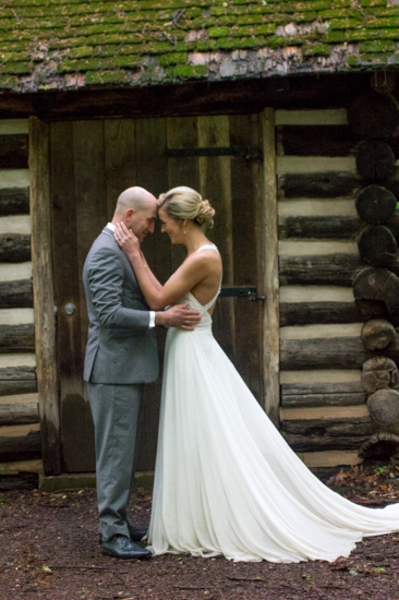 It was love at first sight for this beautiful couple! 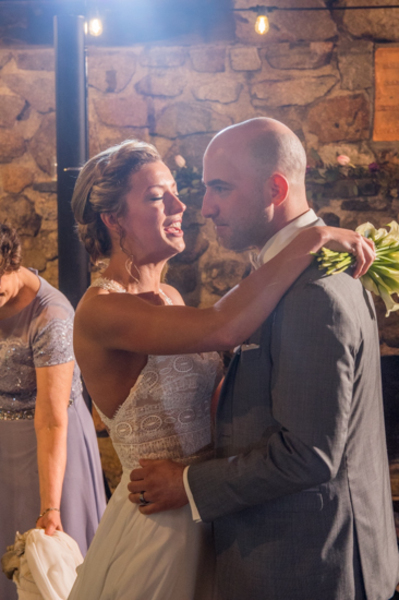 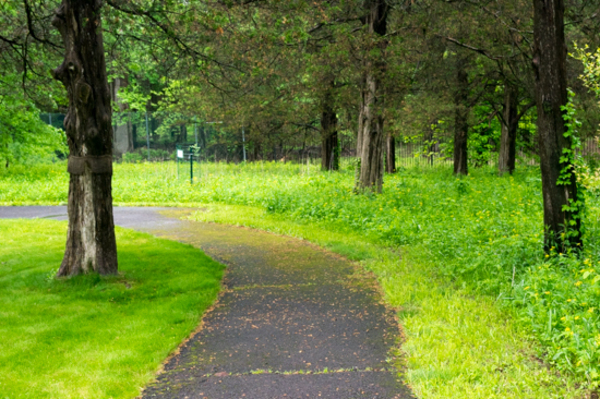 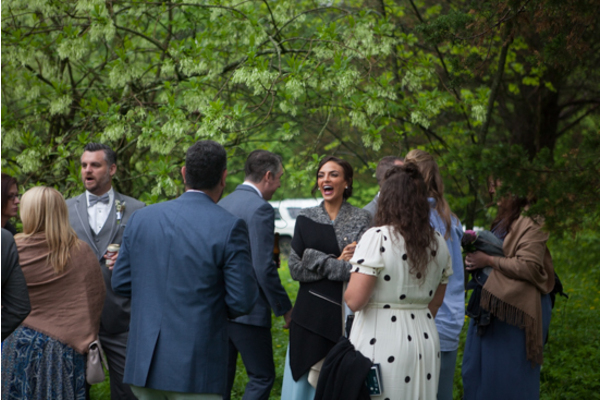 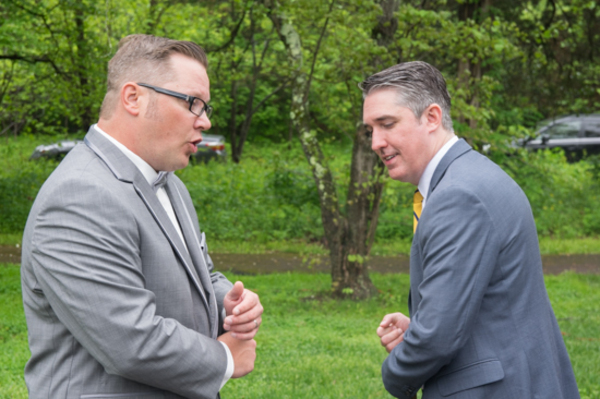 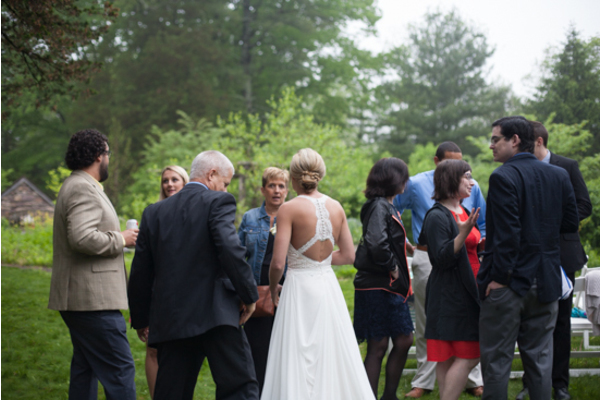 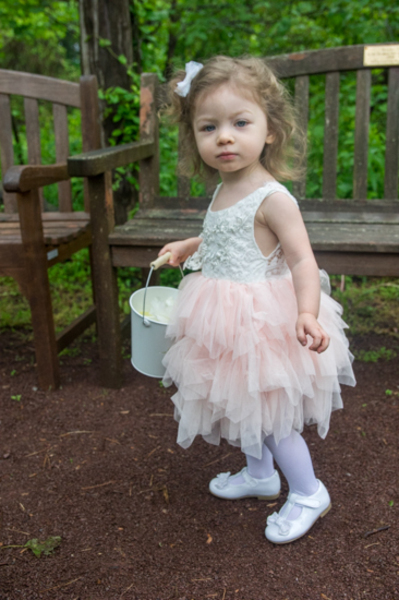 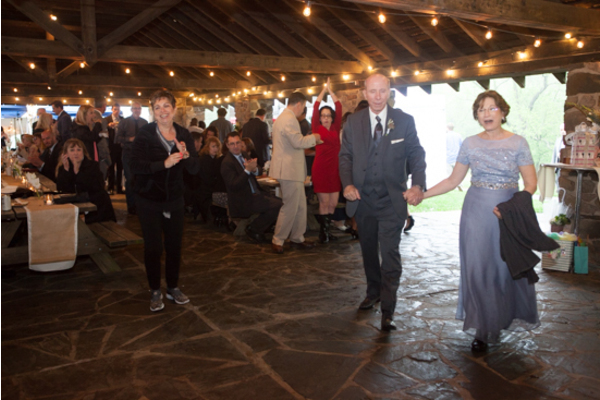 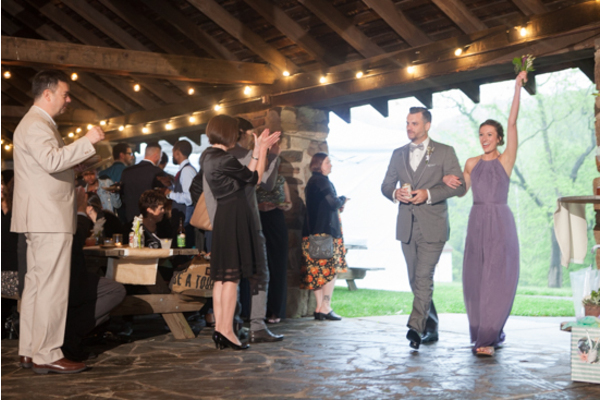 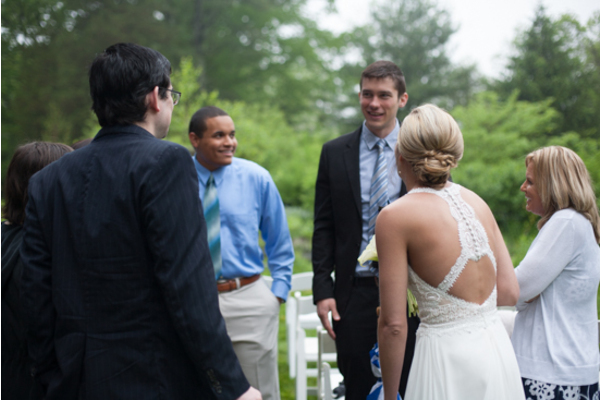 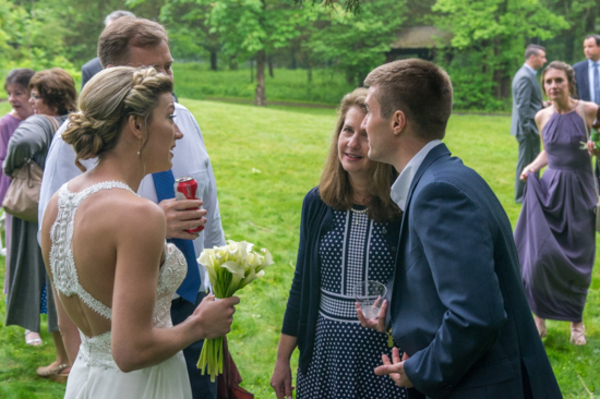 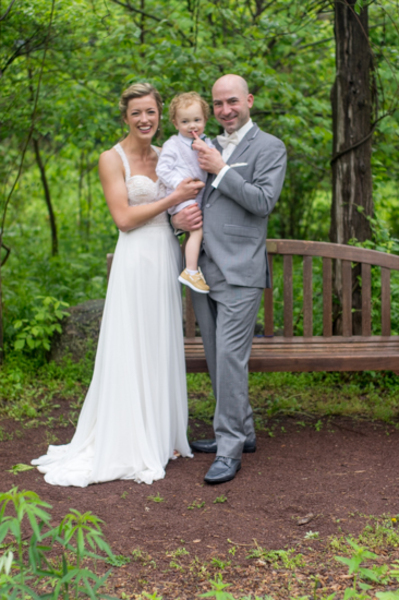 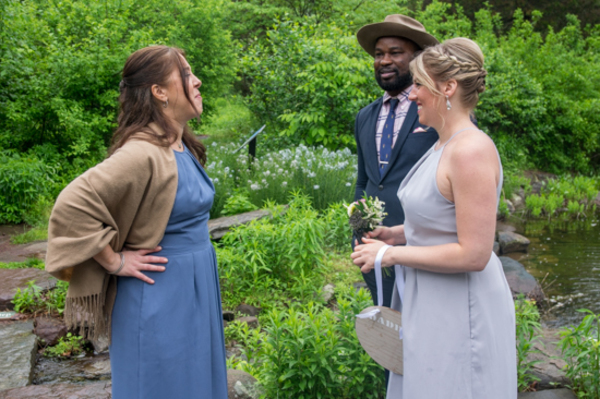 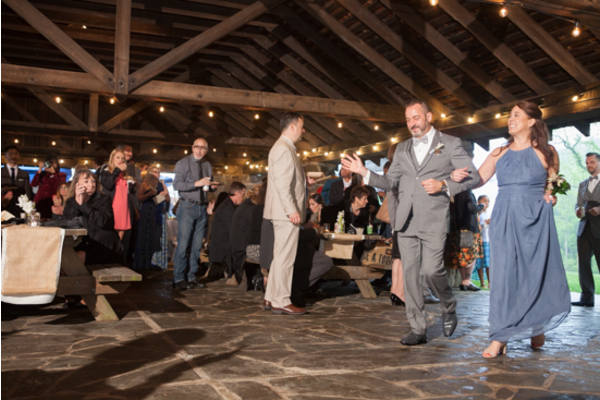 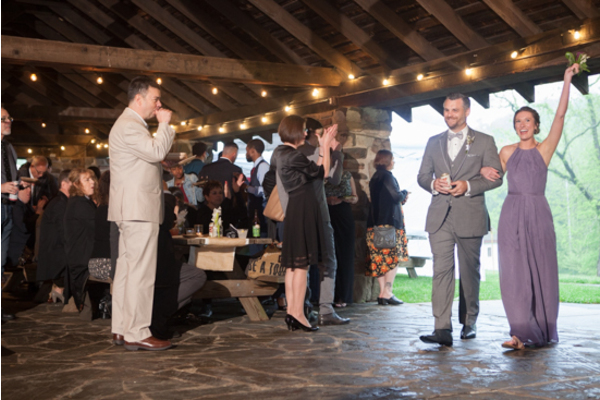 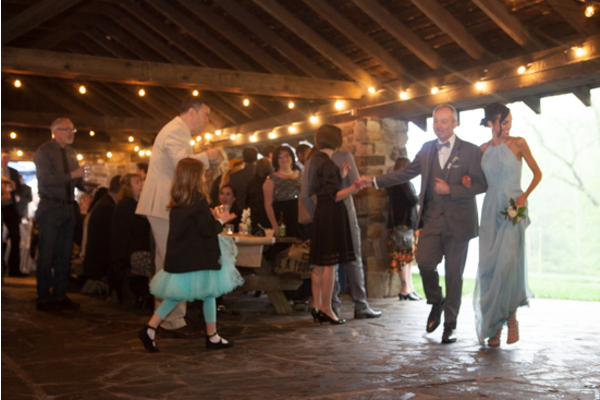 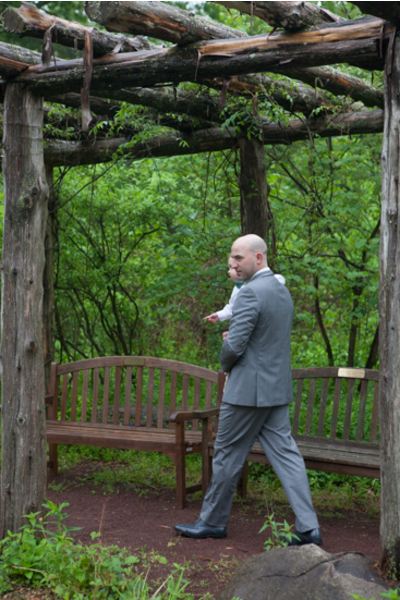 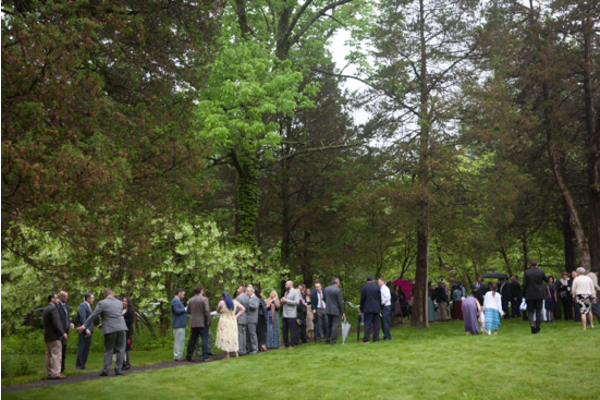 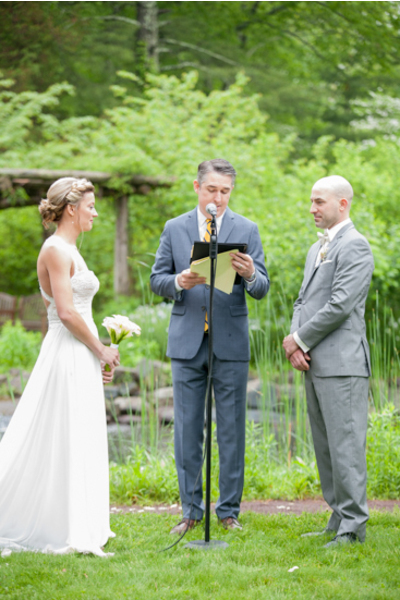 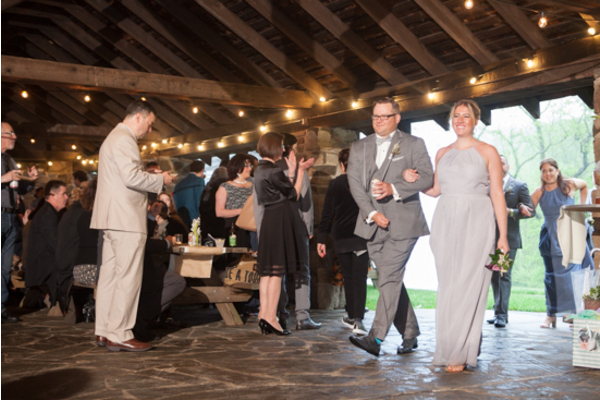 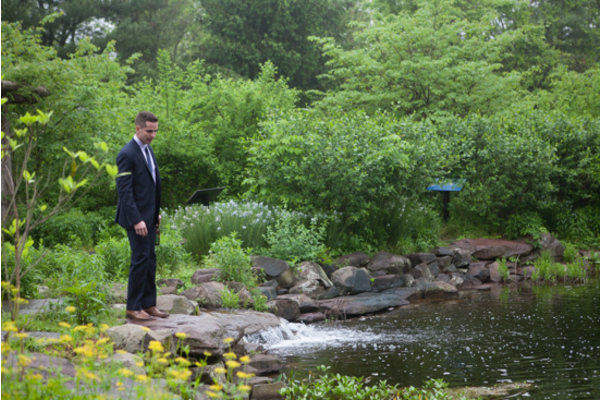 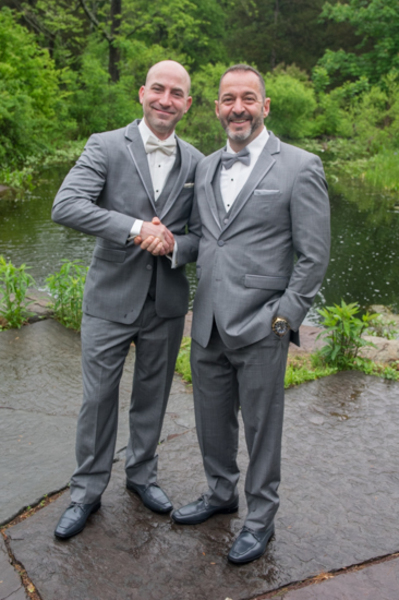 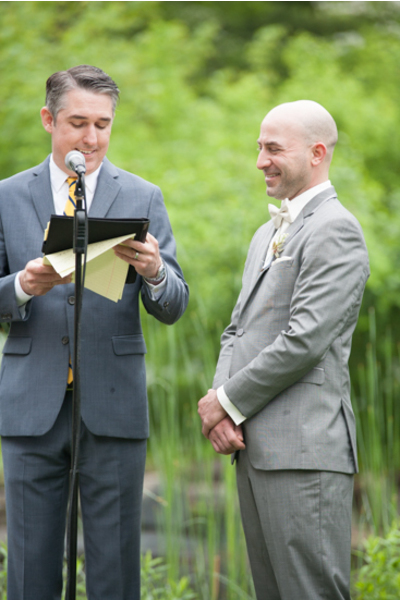 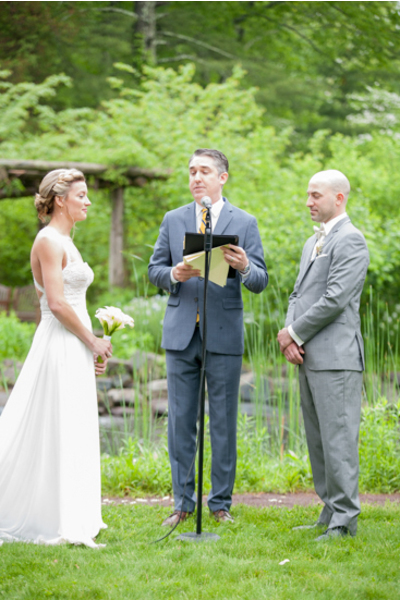 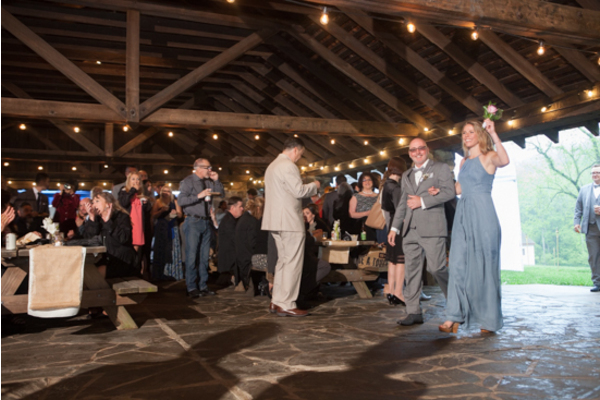 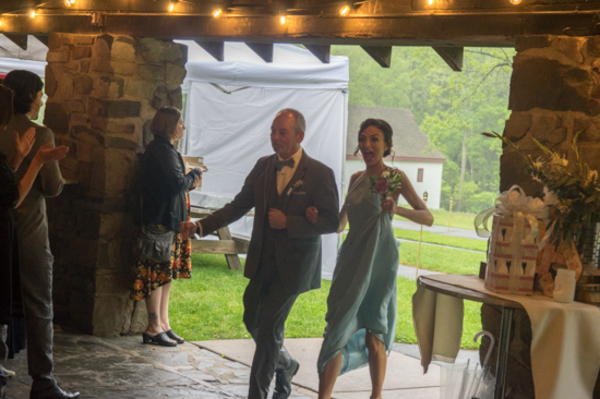 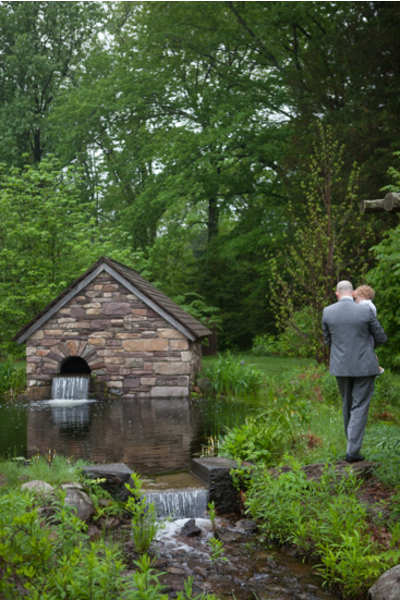 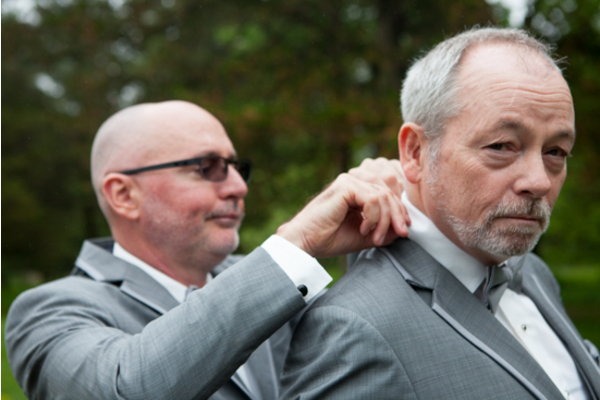 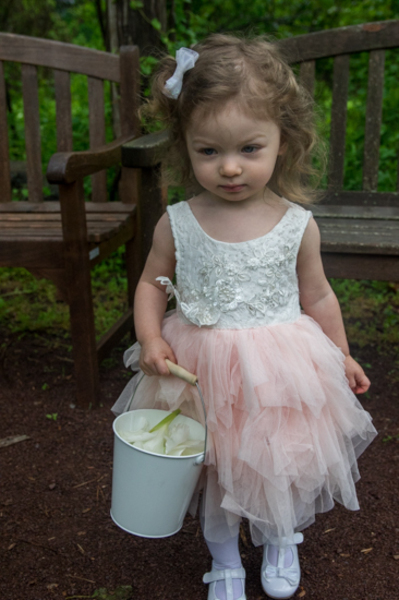 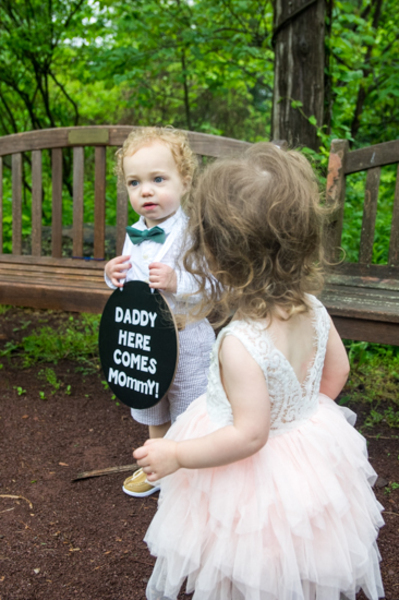 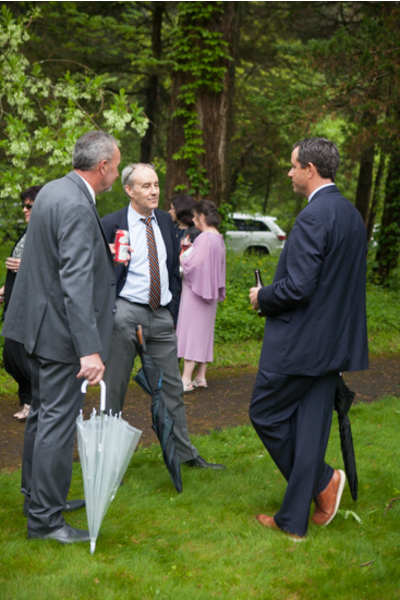 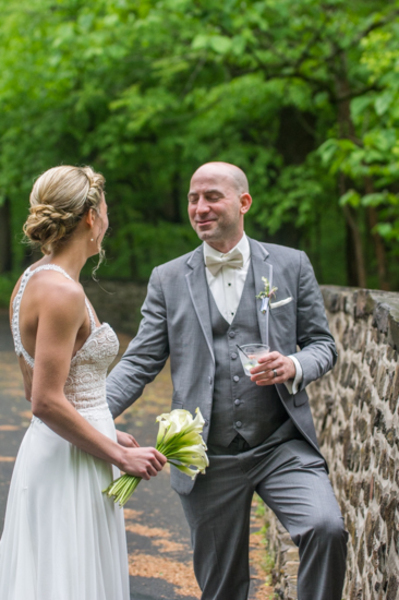 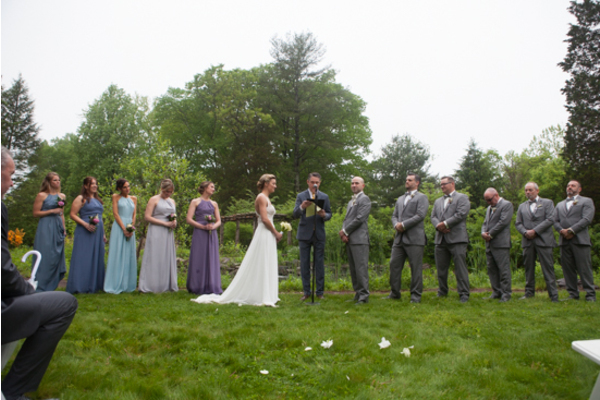 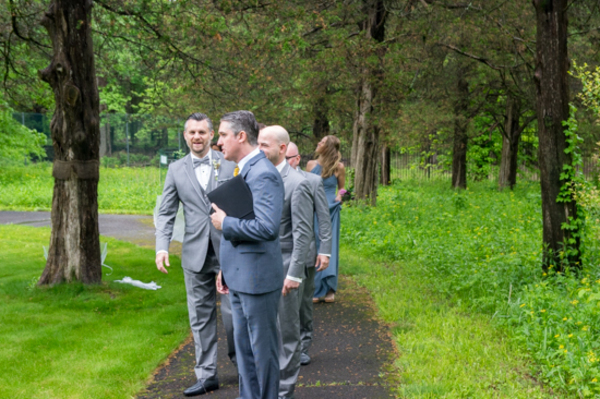 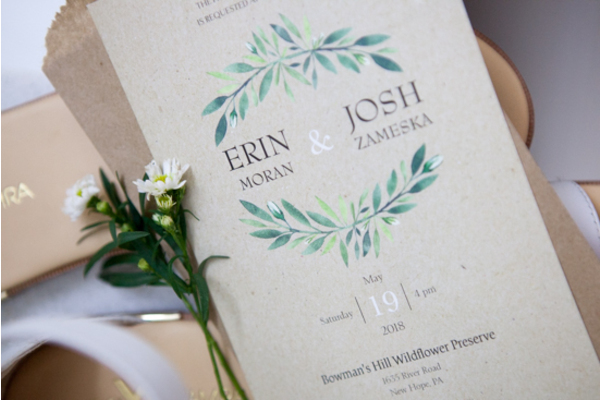 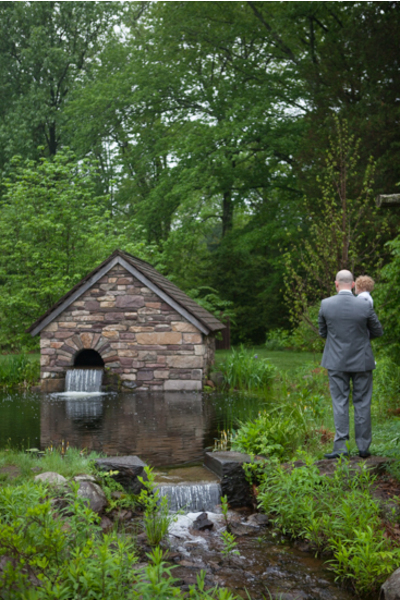 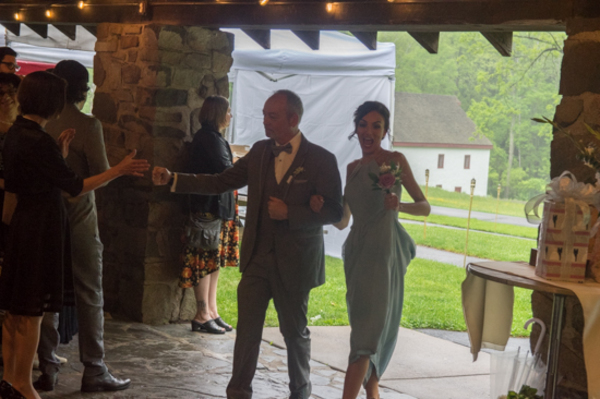 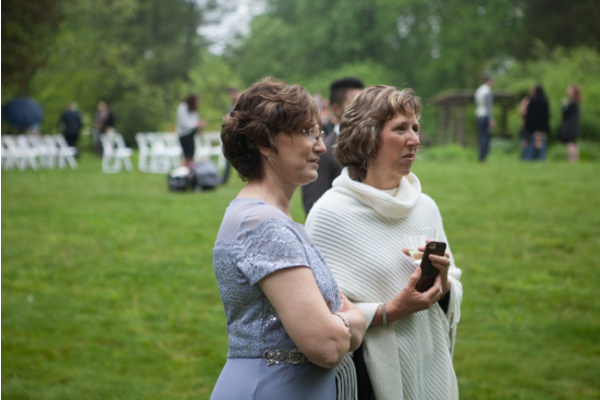 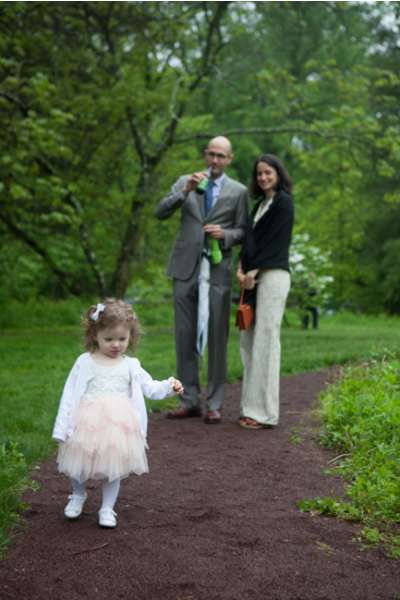 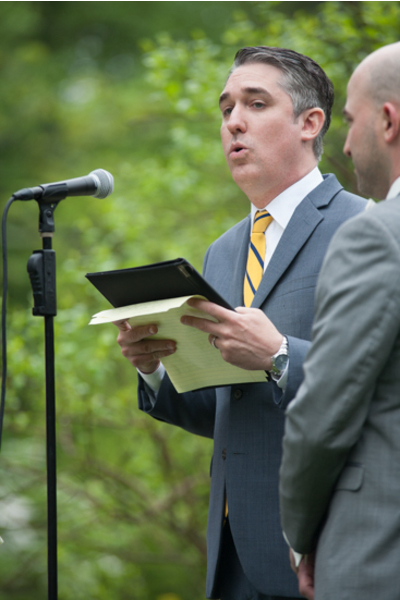 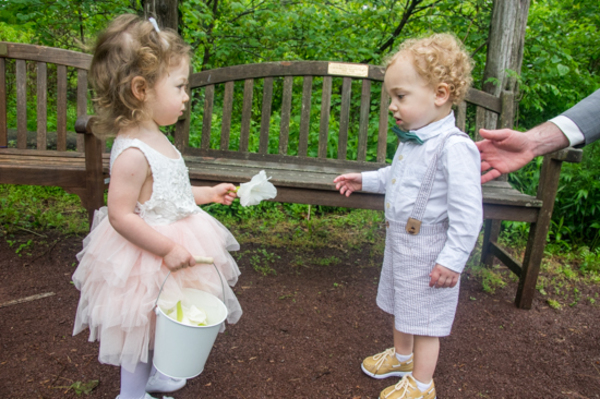 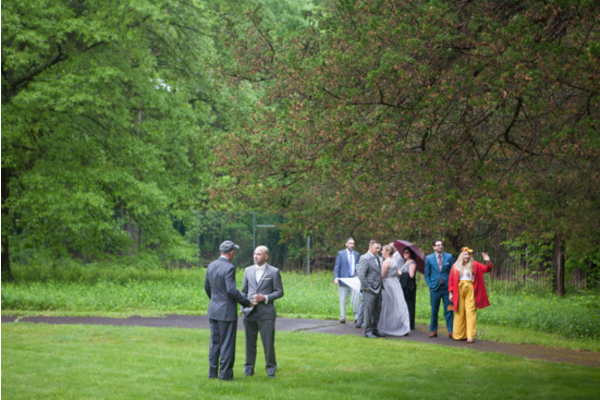 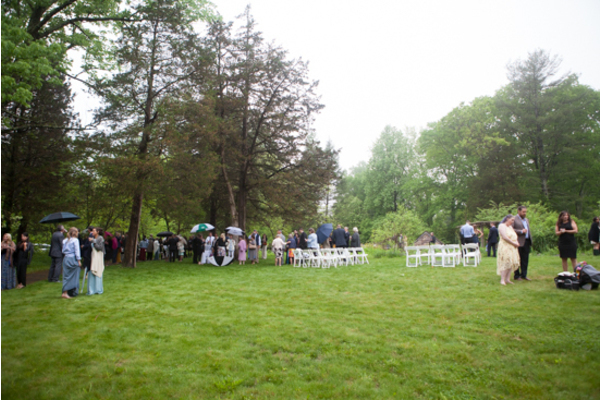 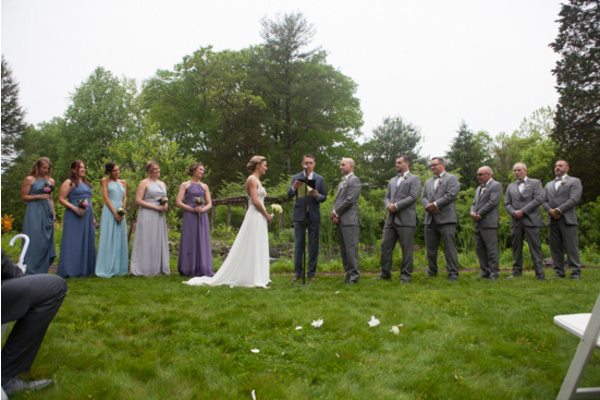 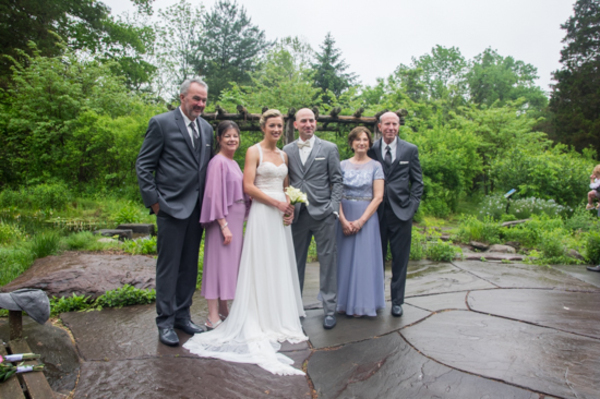 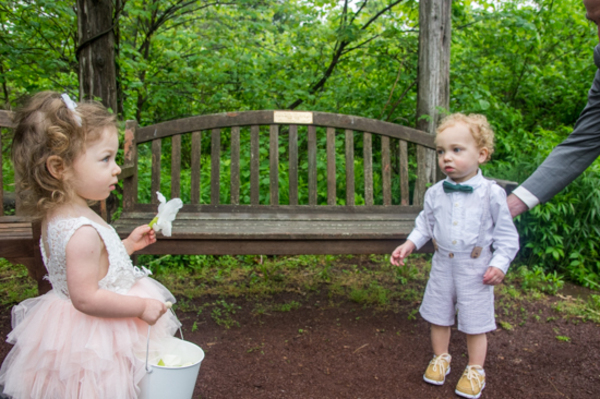 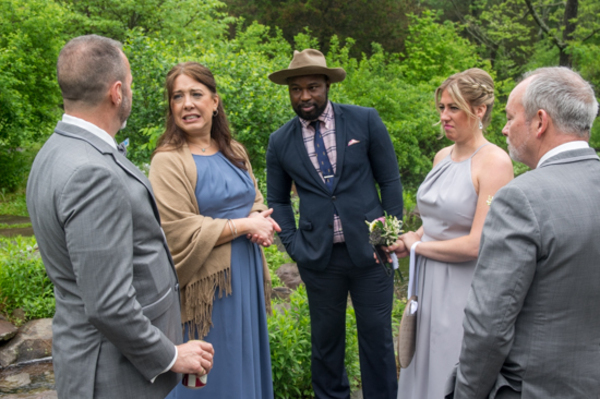 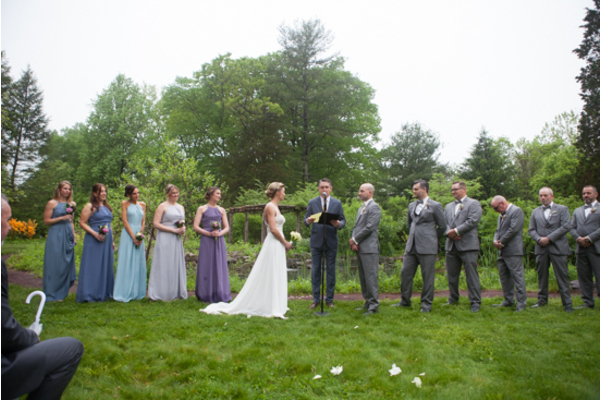 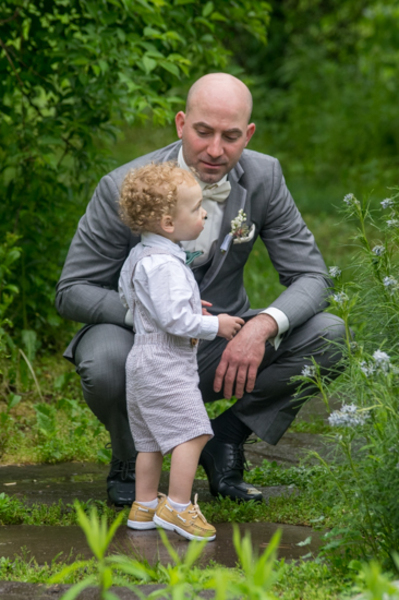 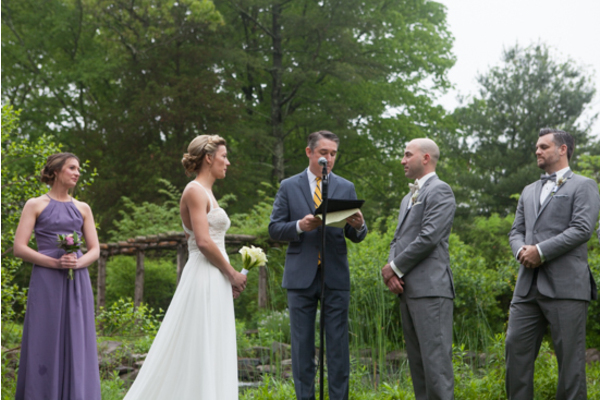 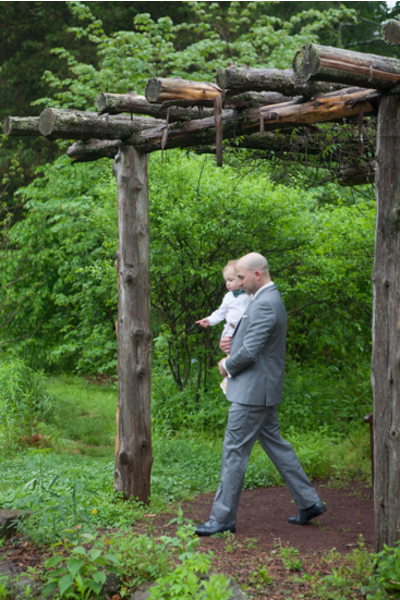 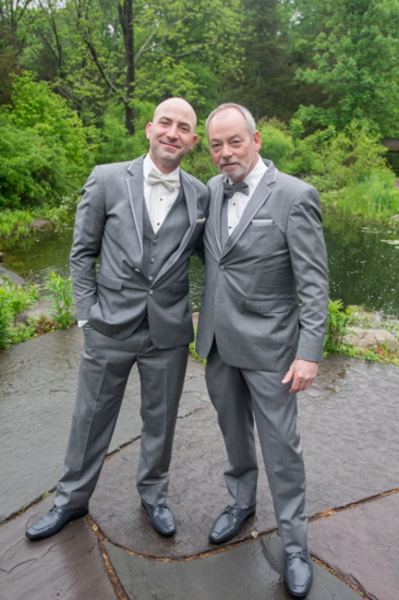 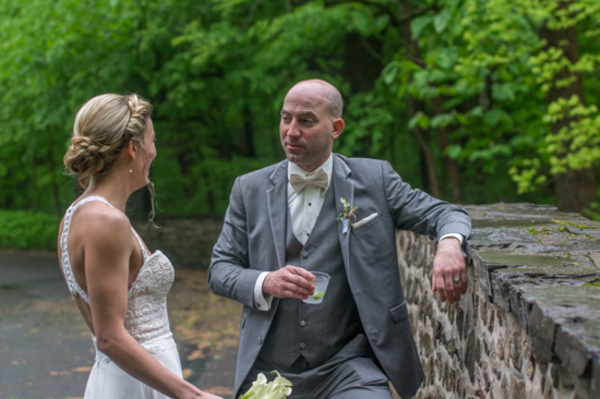 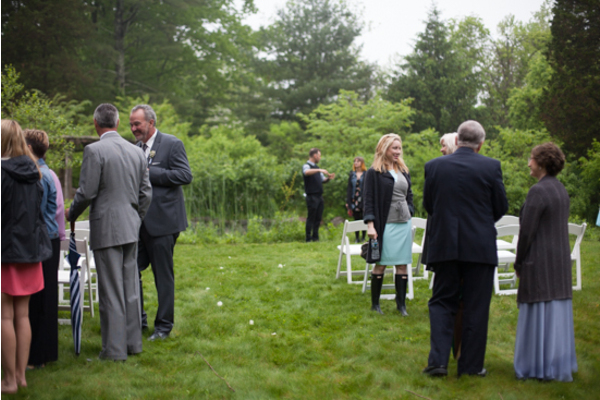 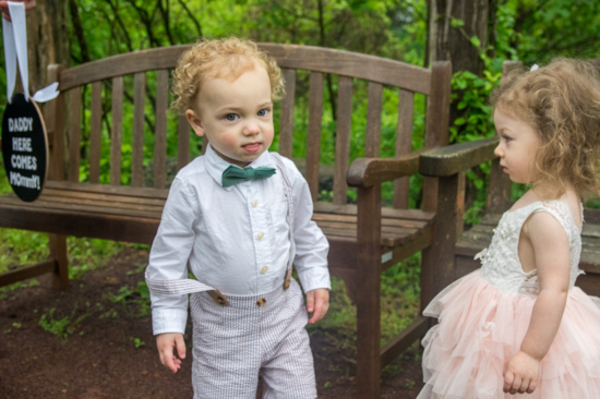 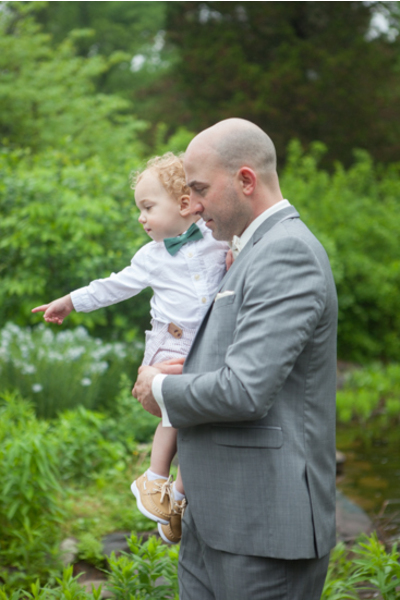 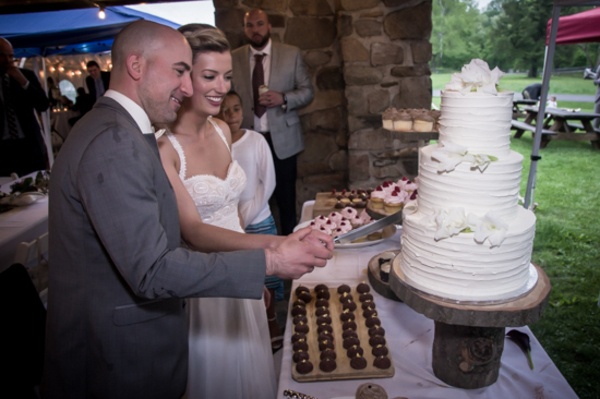 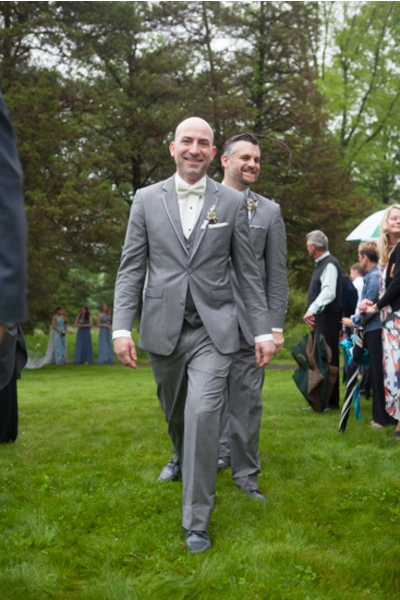 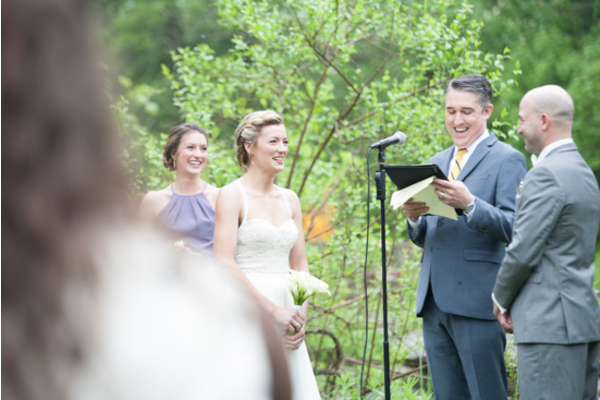 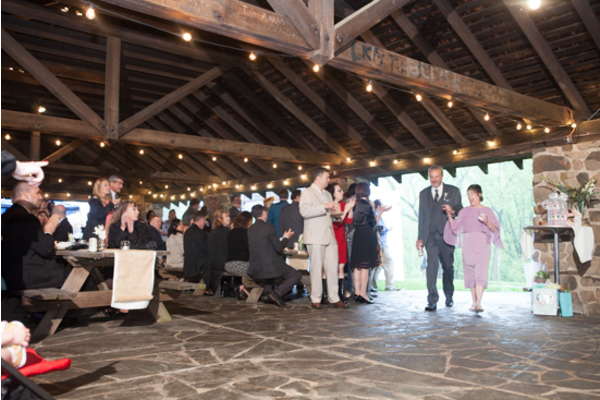 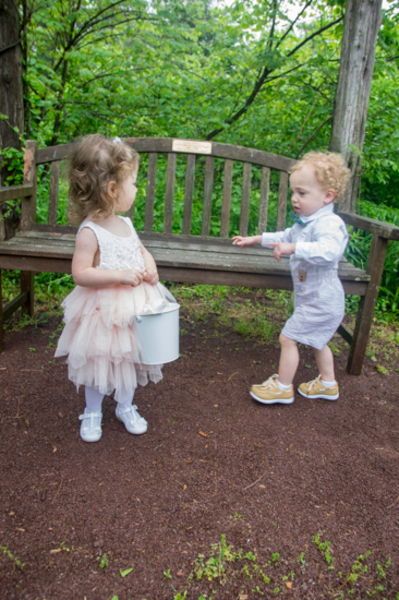 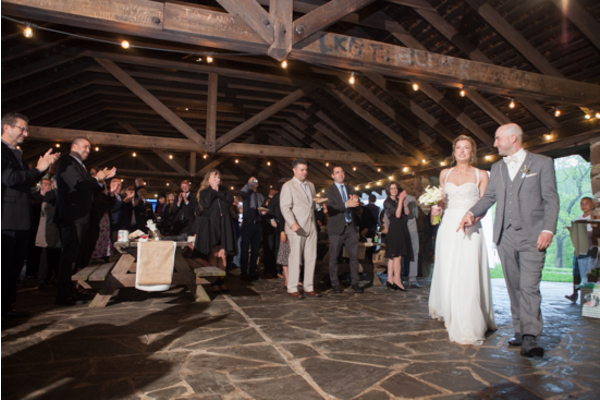 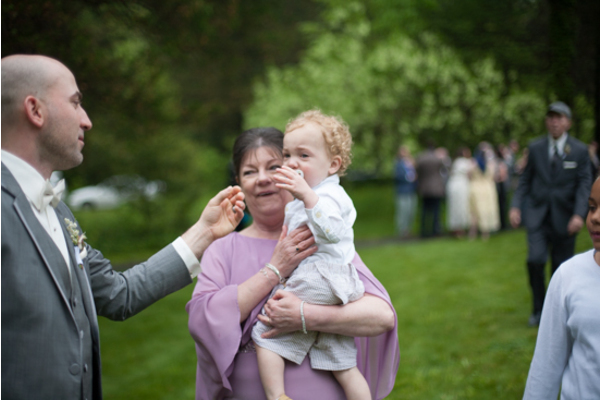 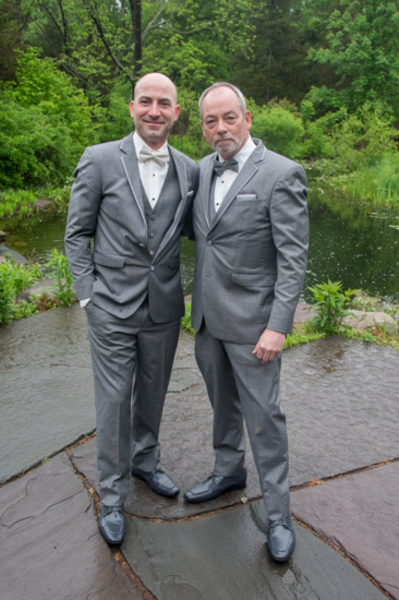 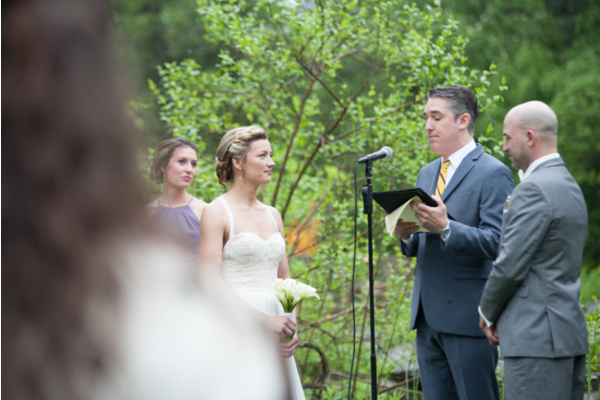 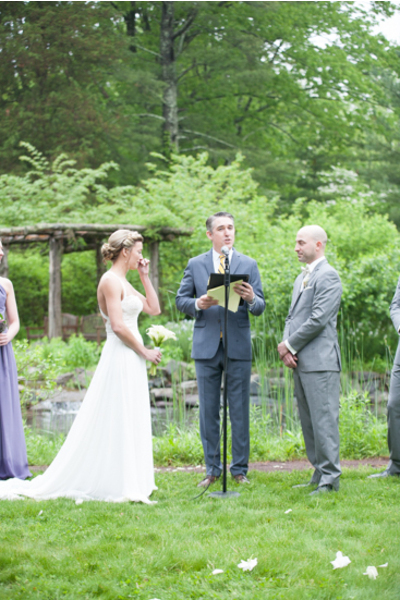 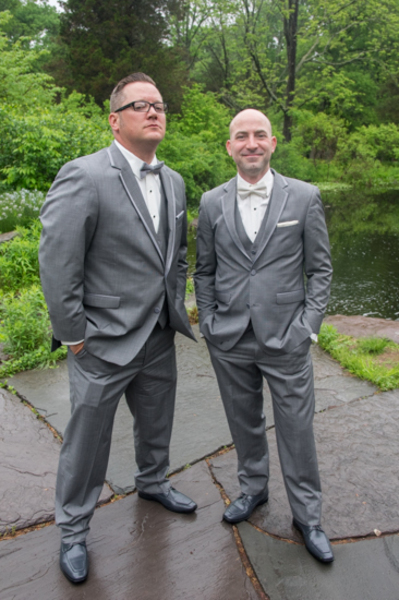 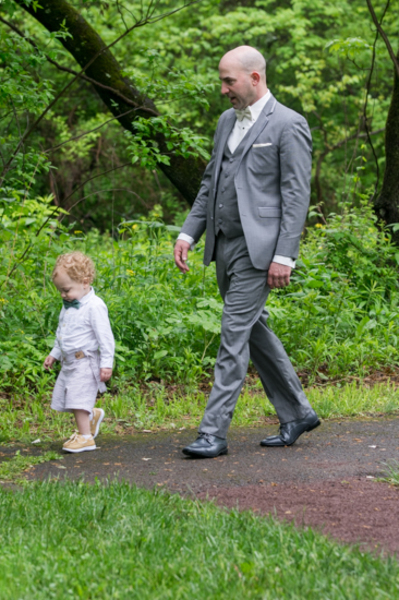 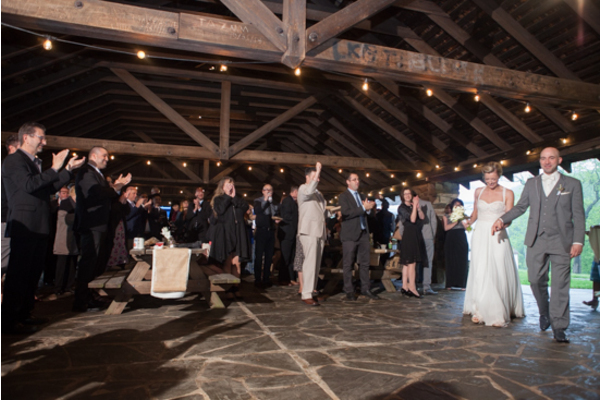 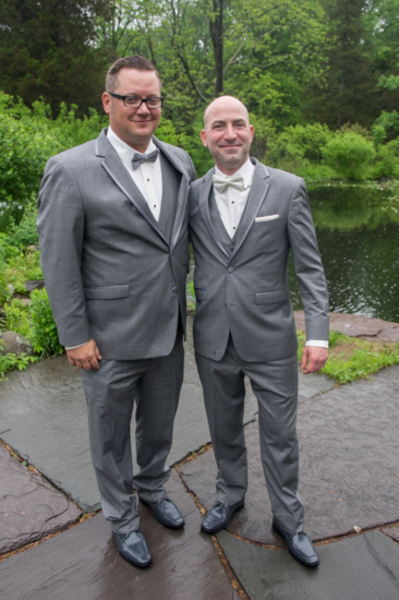 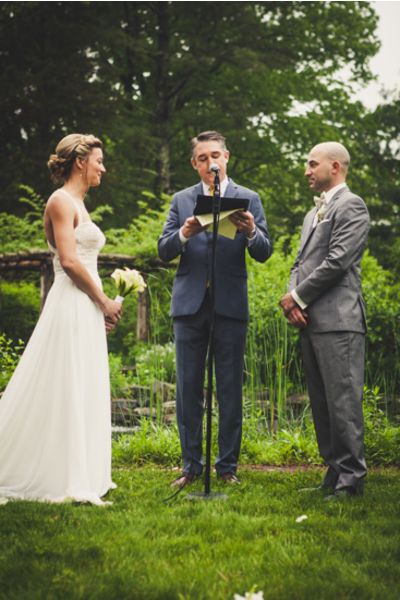 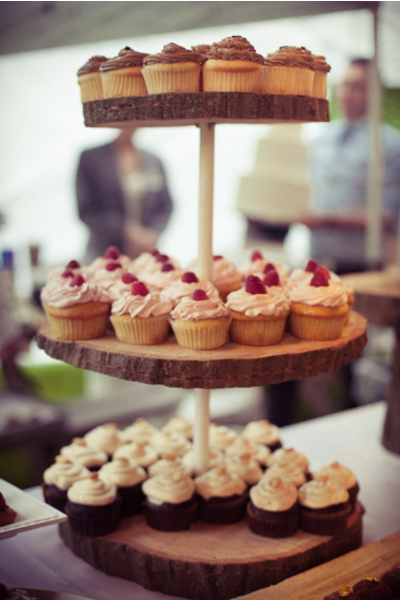 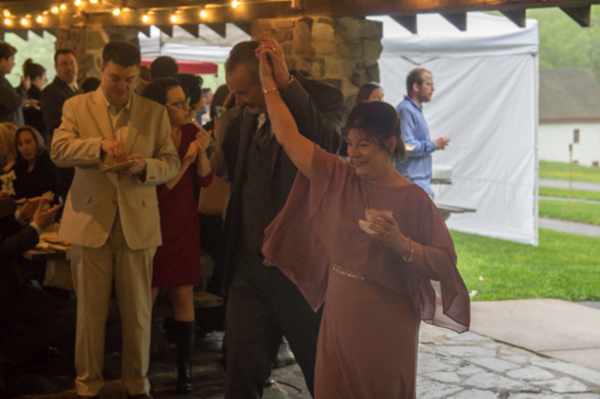 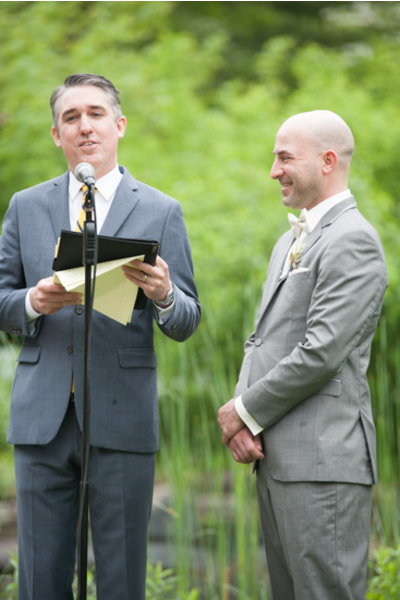 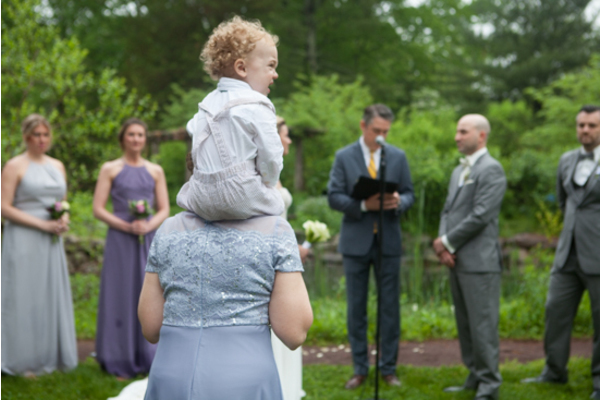 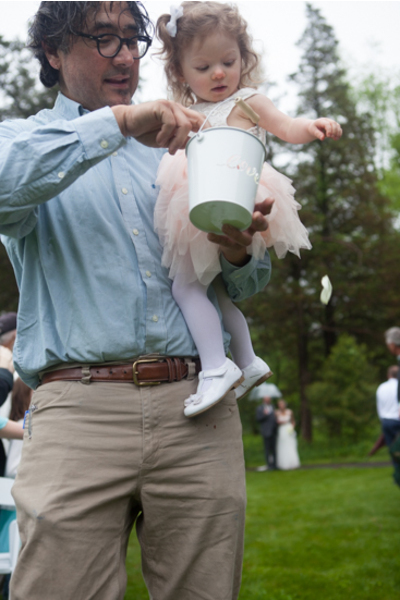 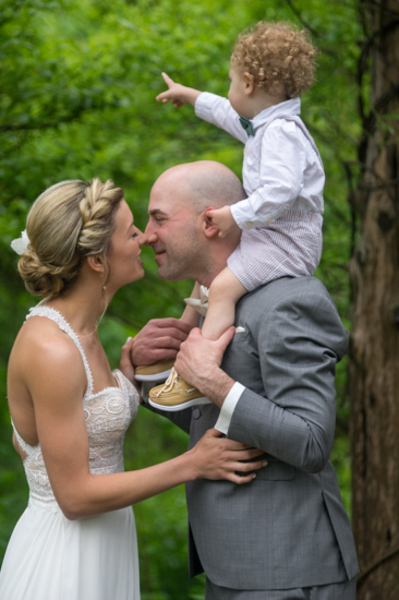 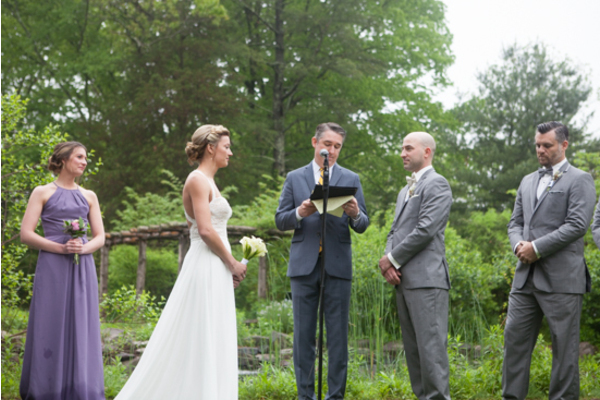 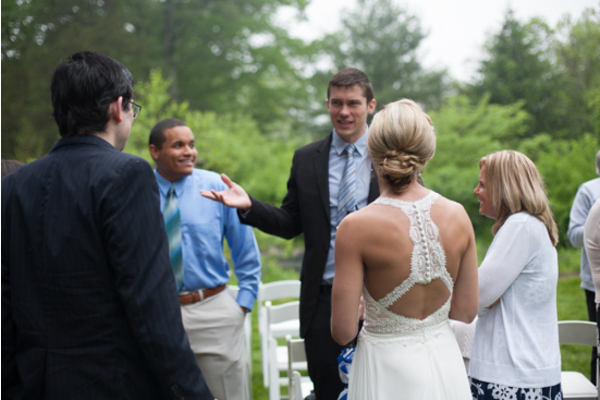 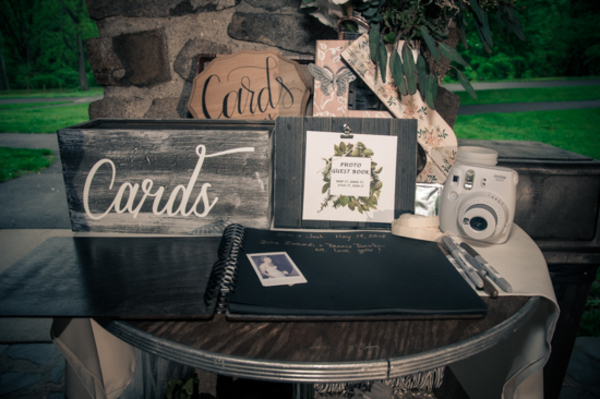 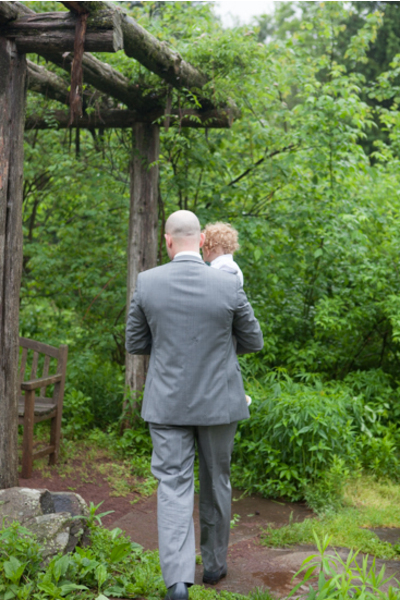 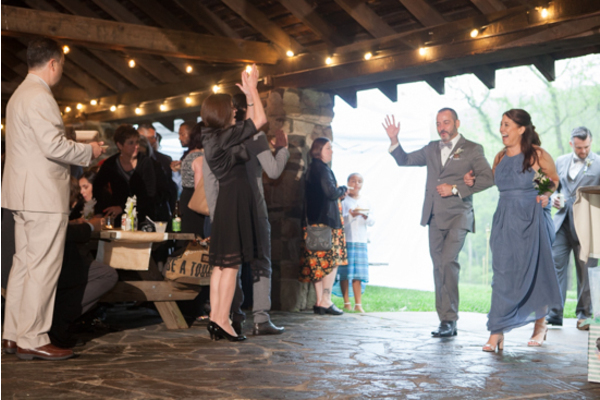 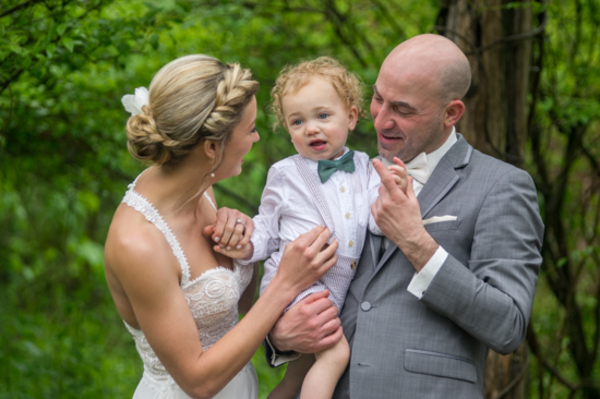 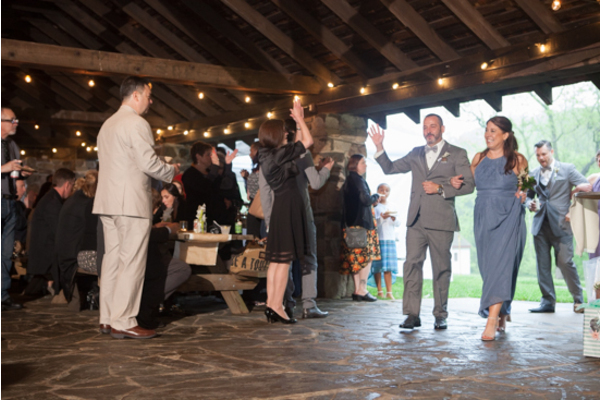 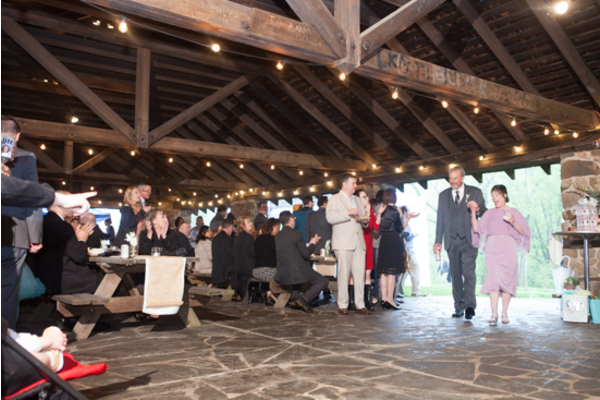 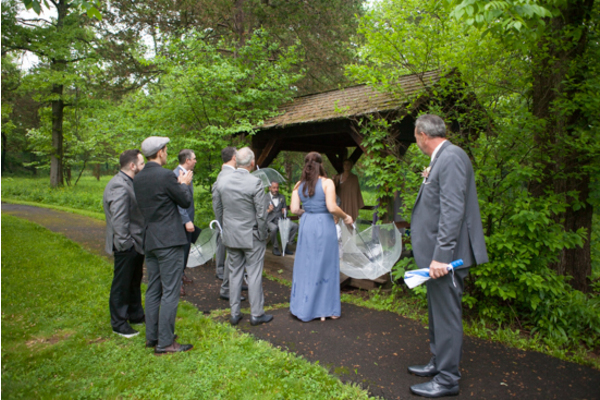 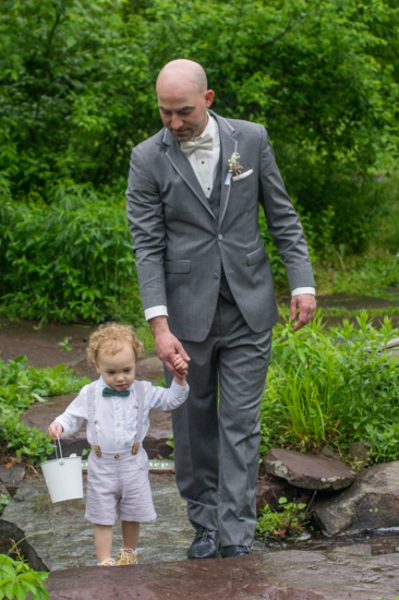 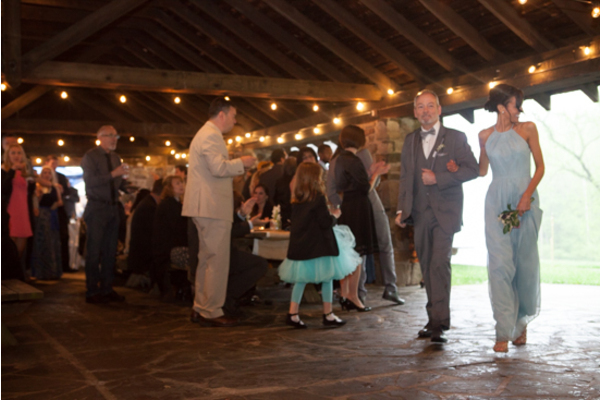 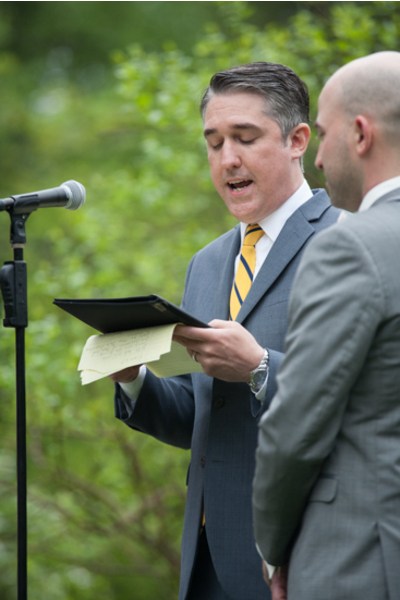 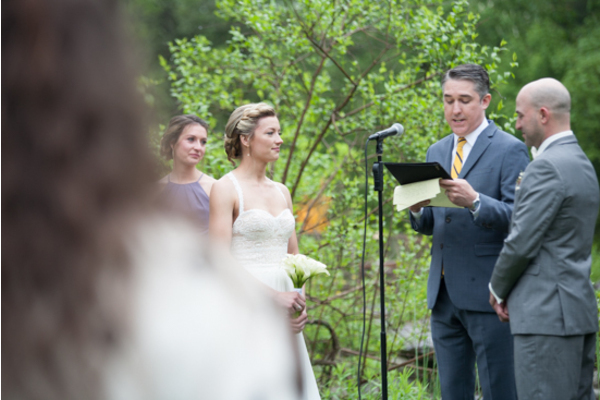 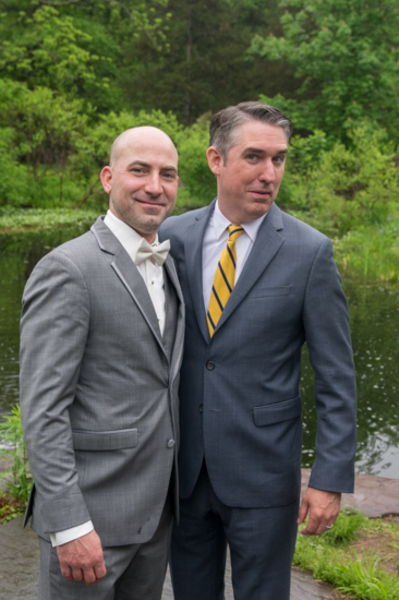 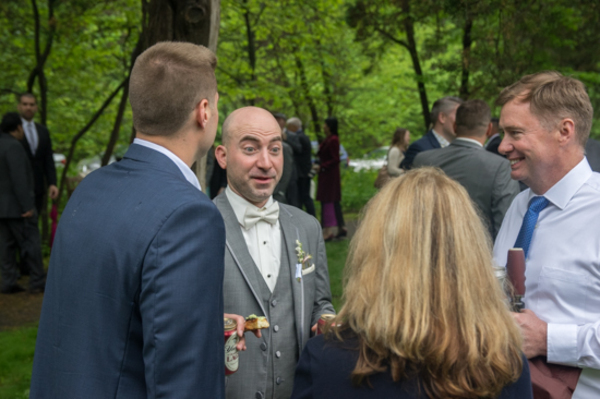 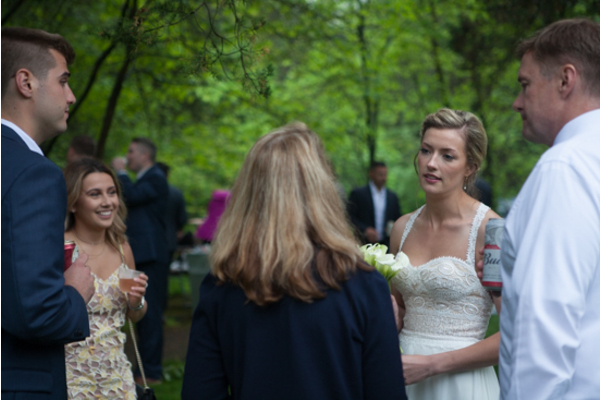 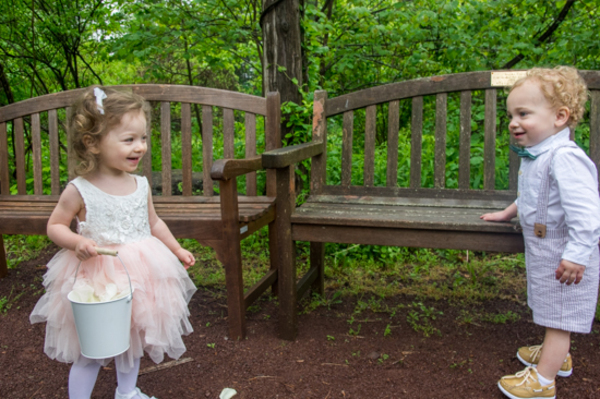 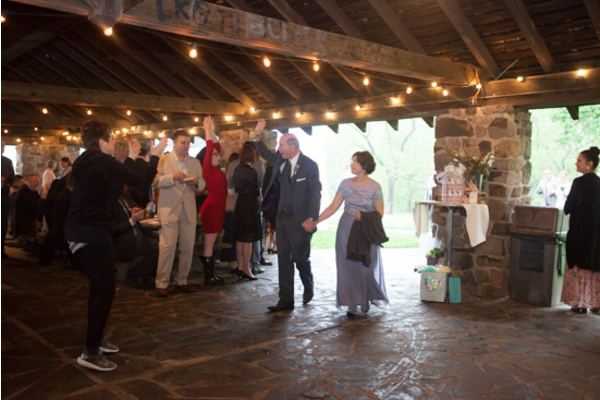 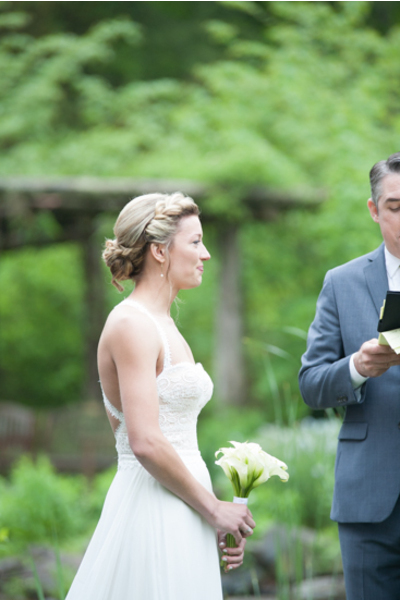 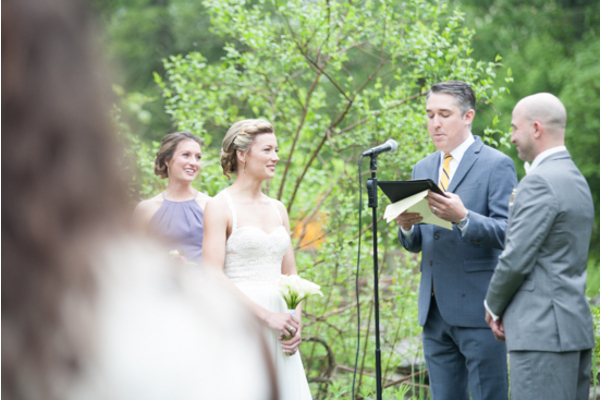 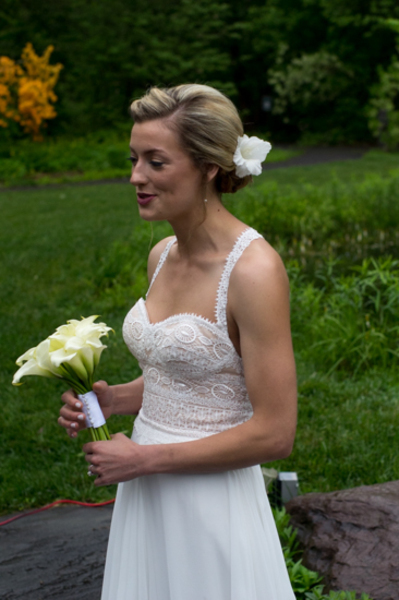 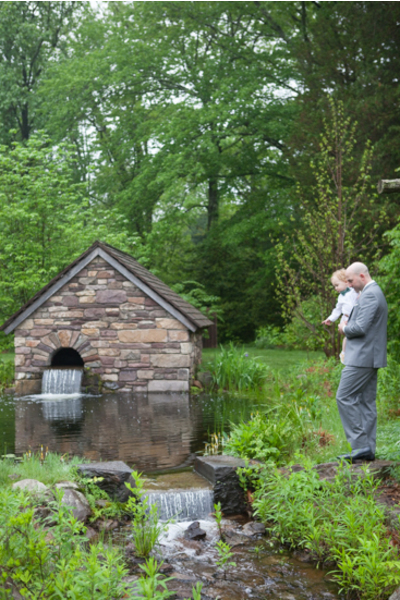 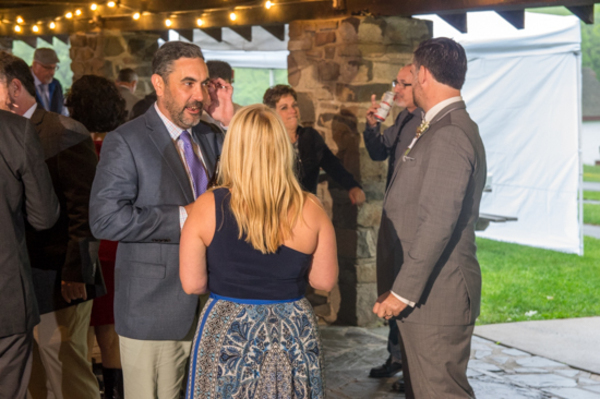 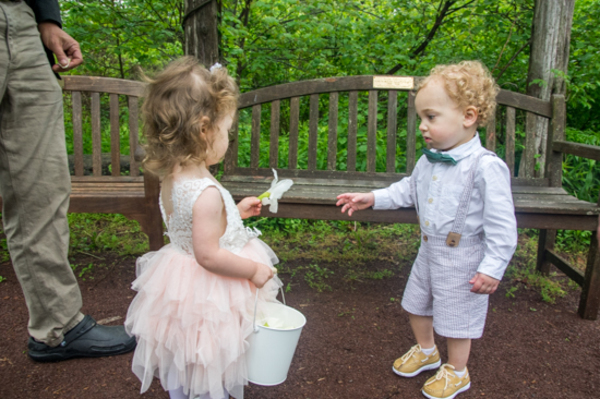 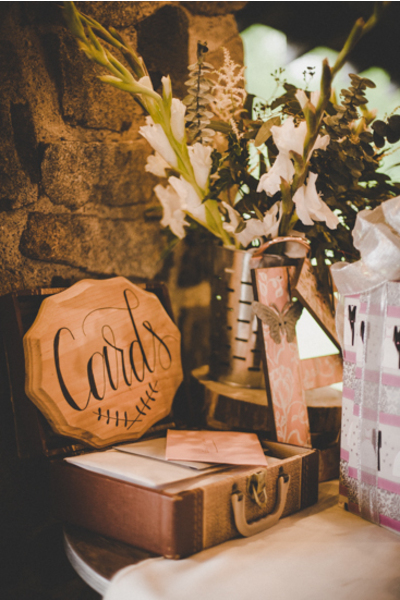 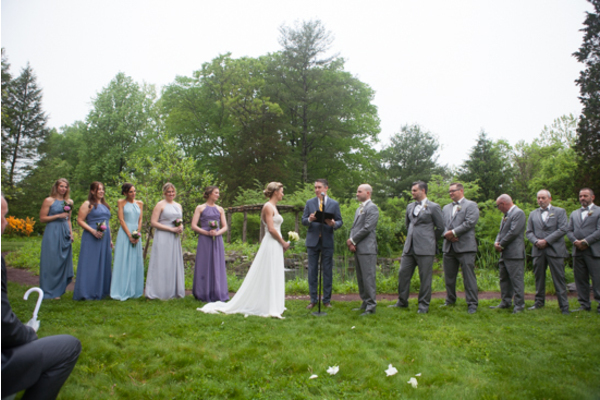 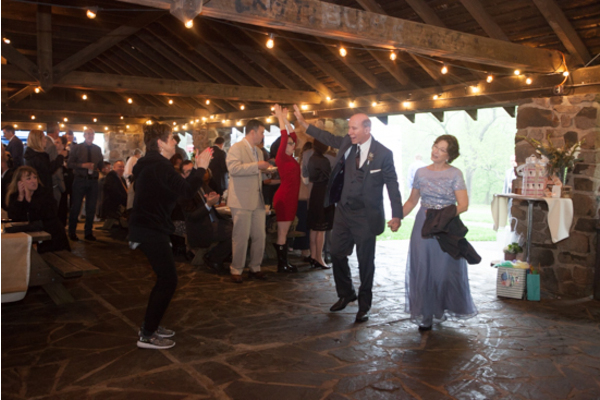 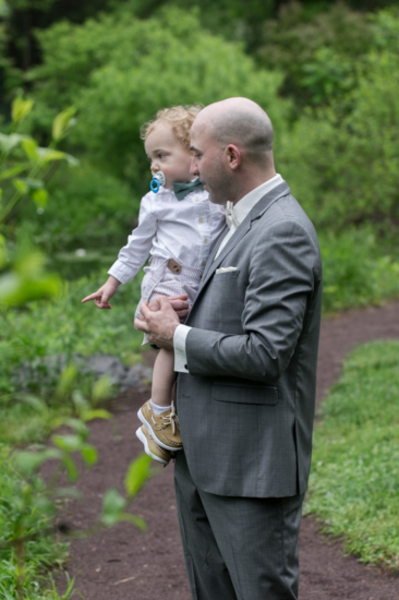 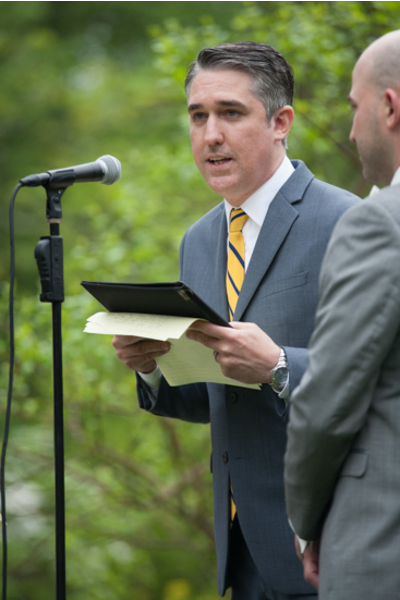 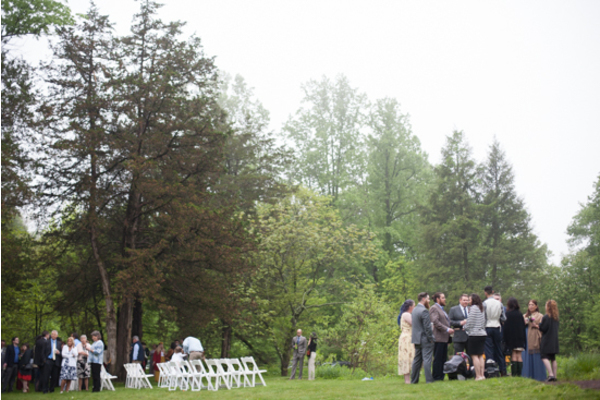 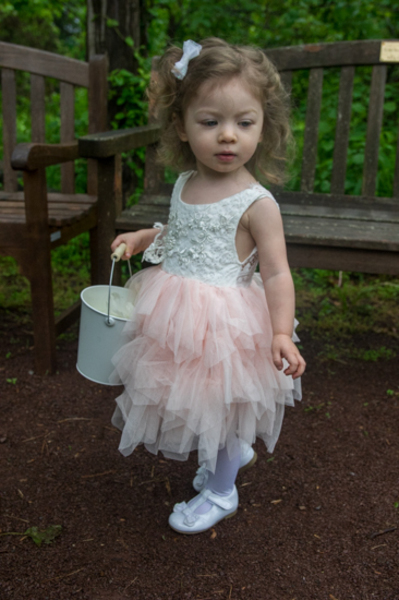 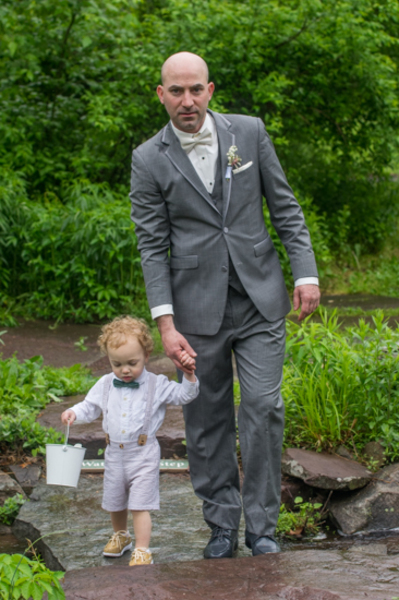 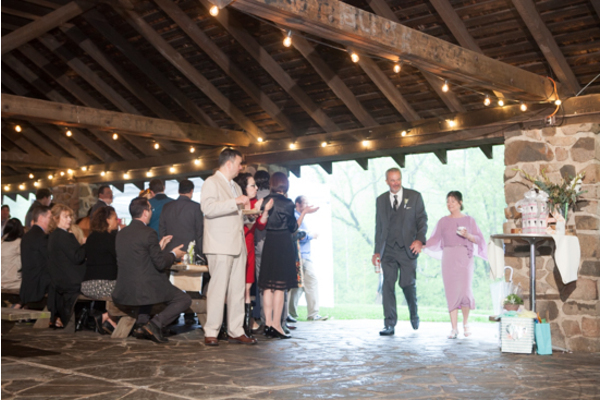 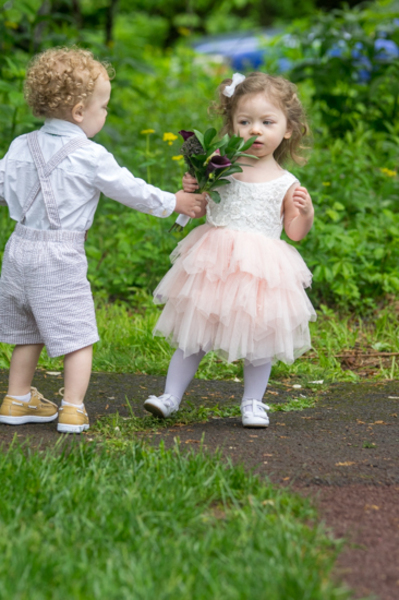 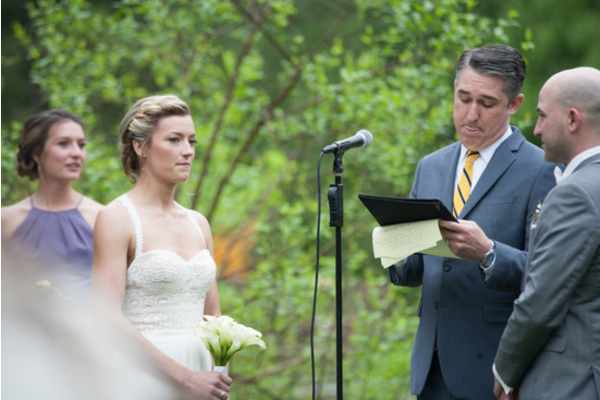 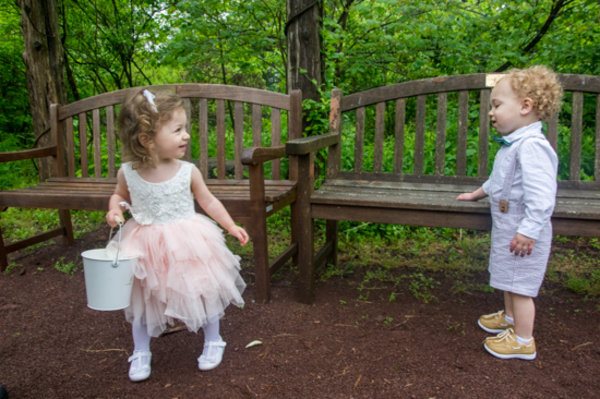 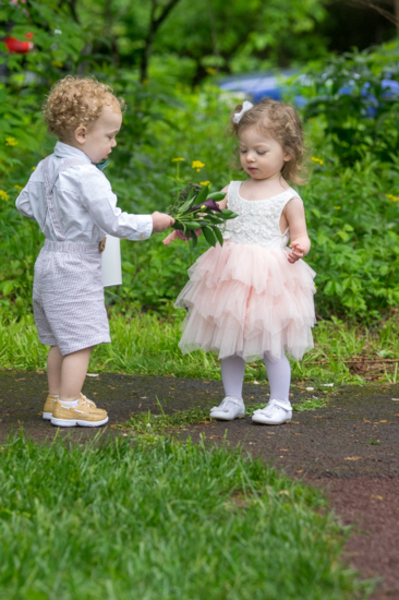 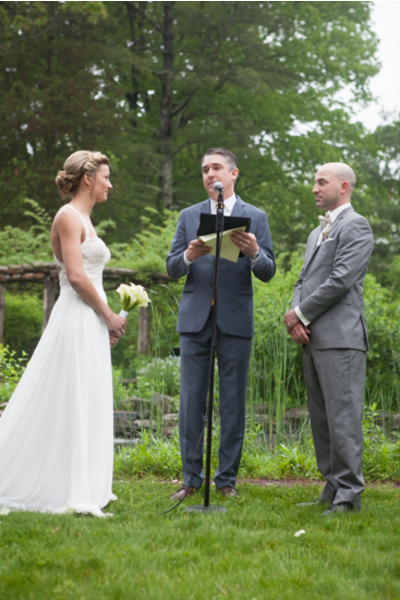 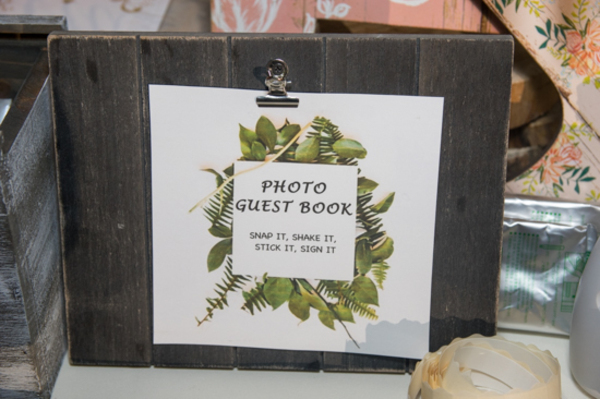 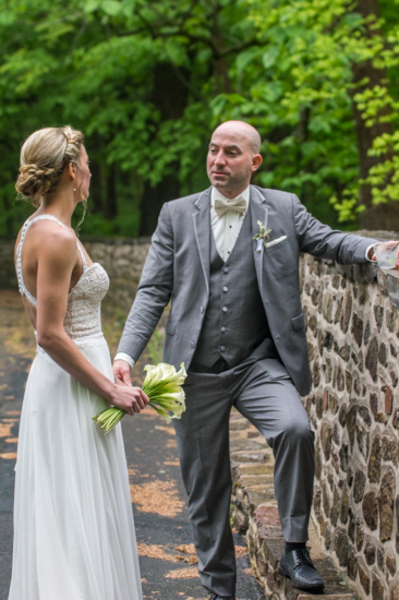 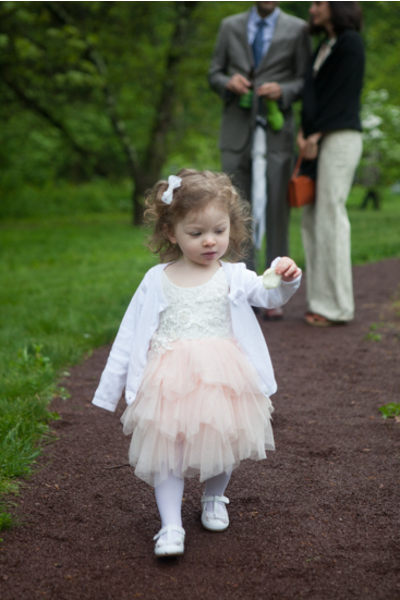 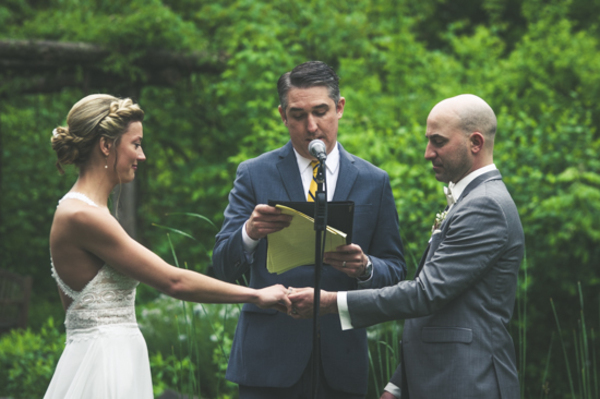 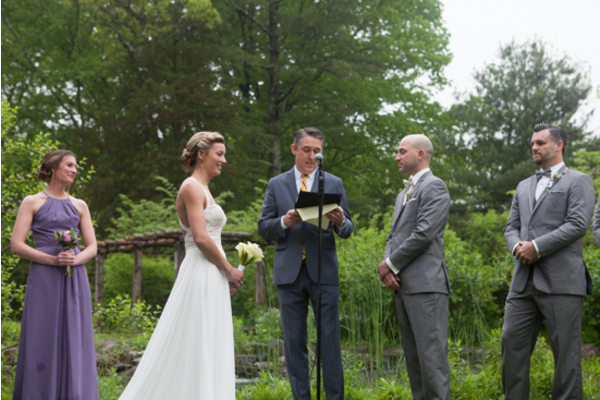 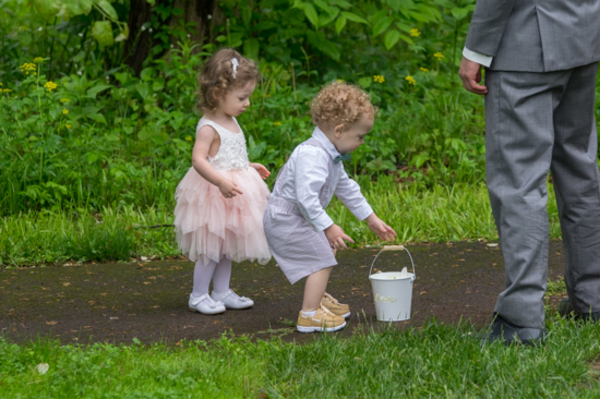 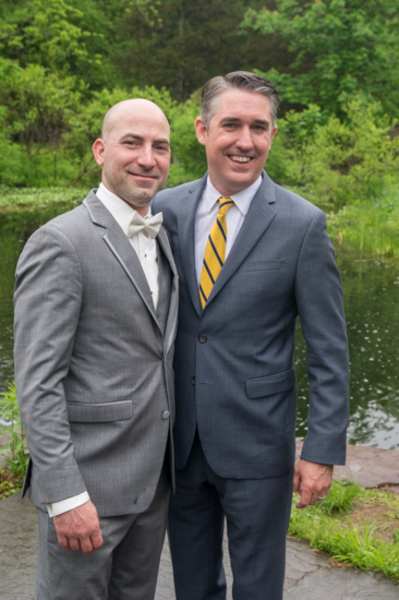 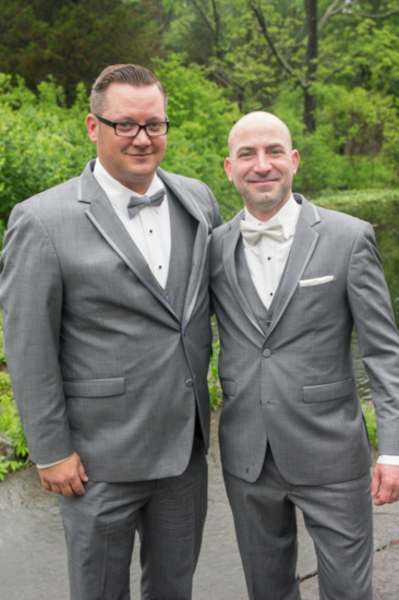 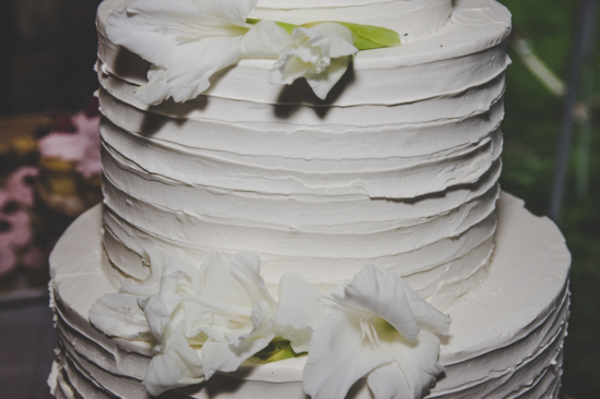 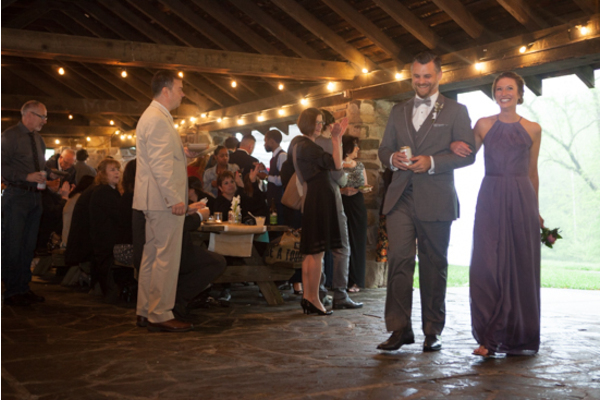 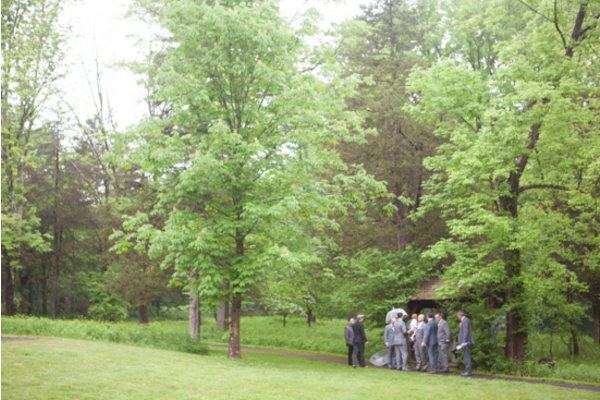 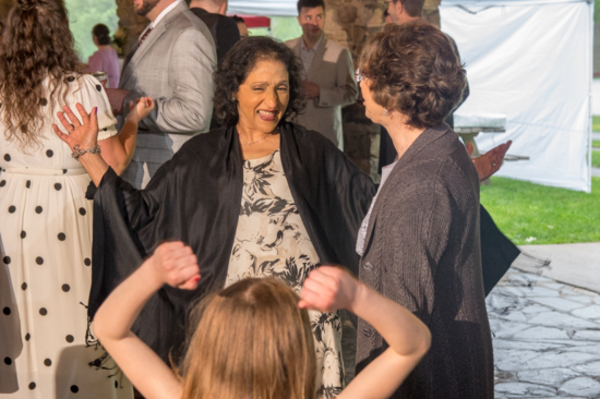 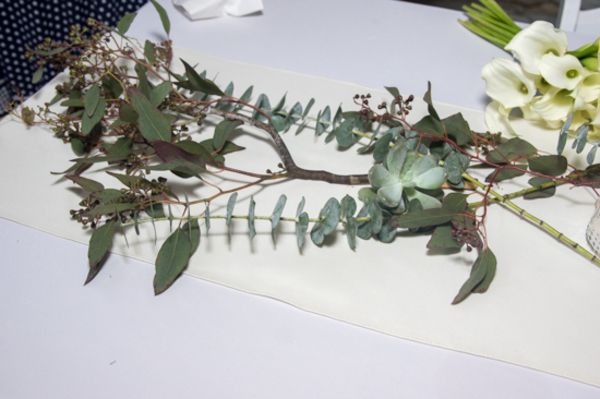 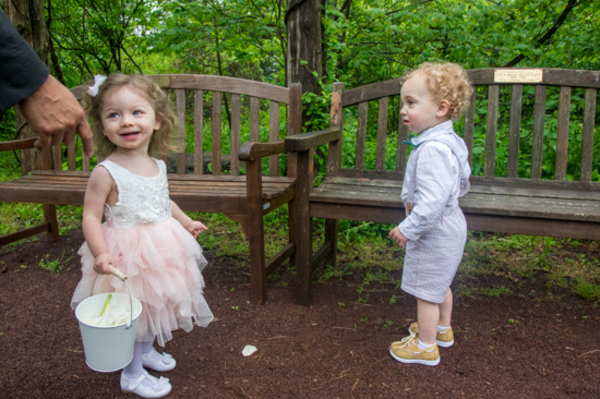 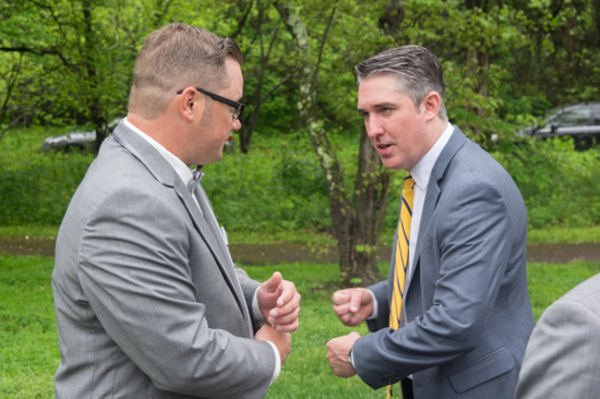 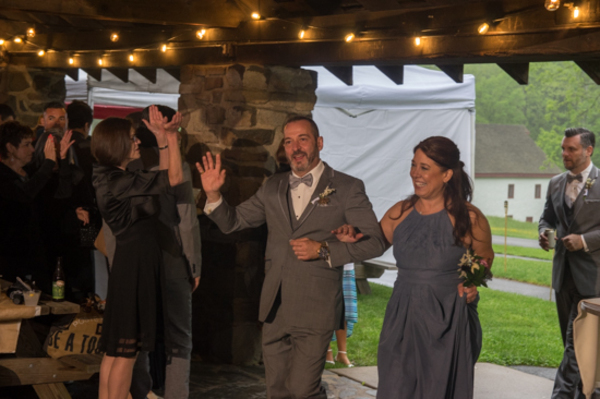 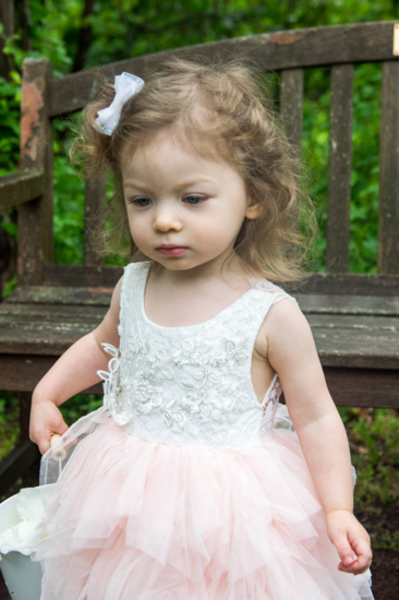 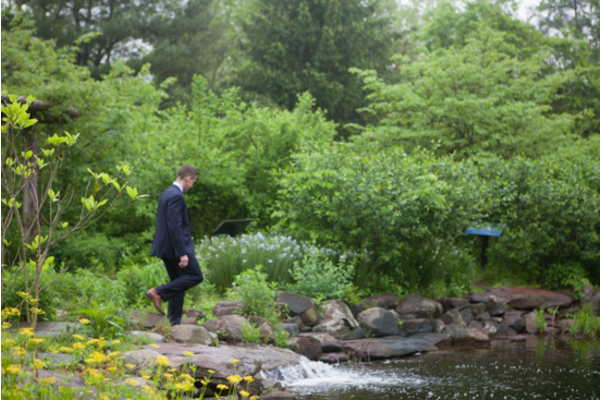 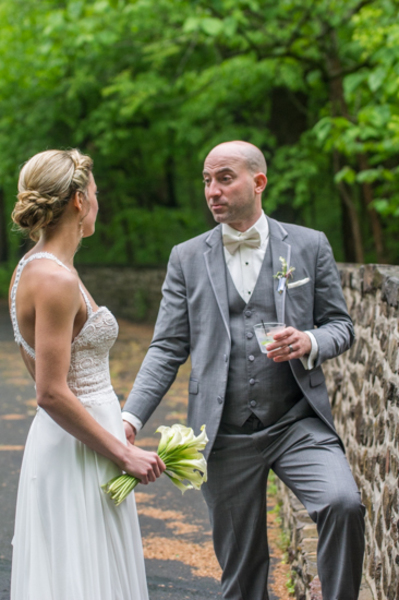 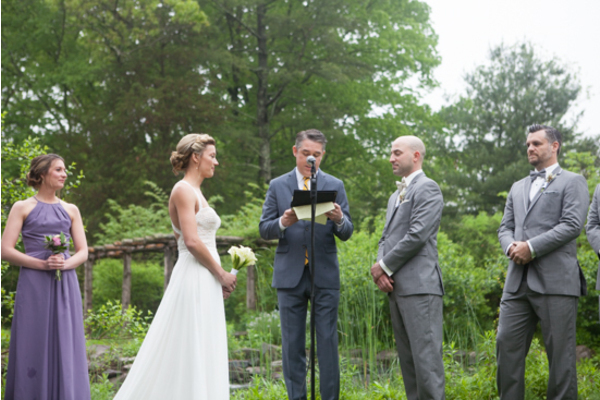 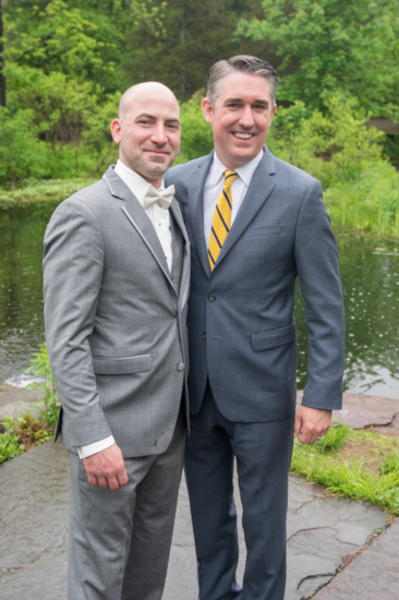 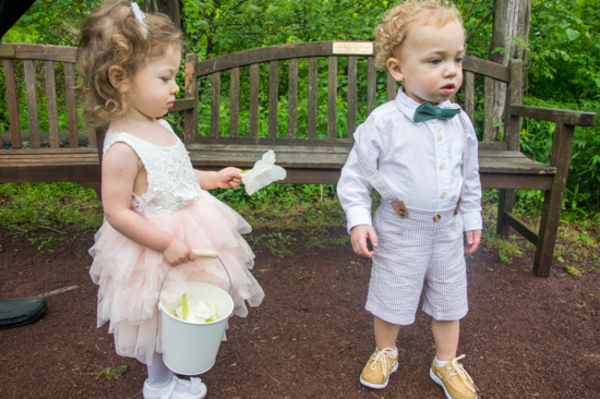 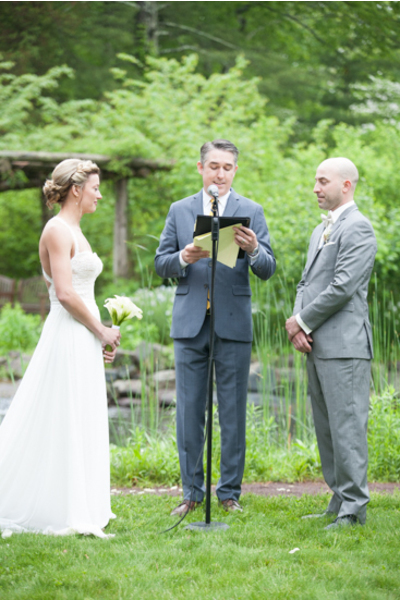 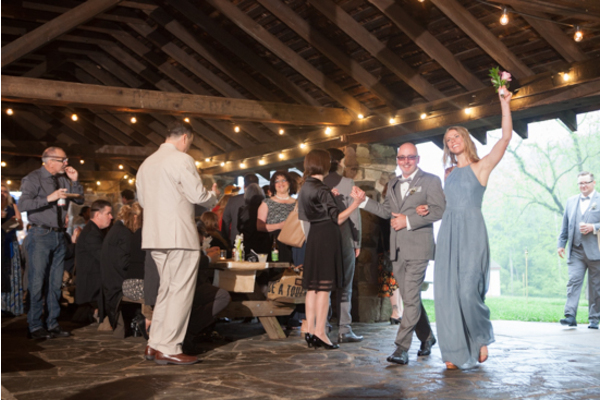 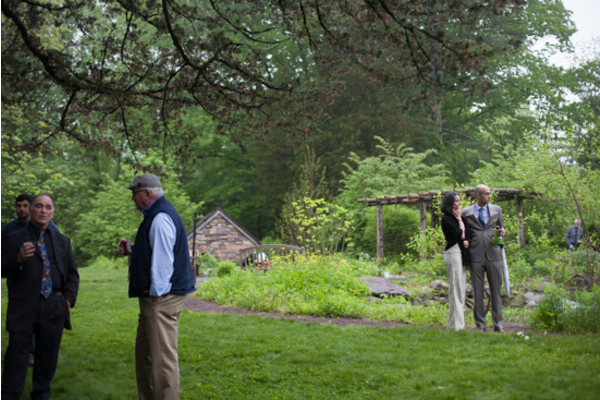 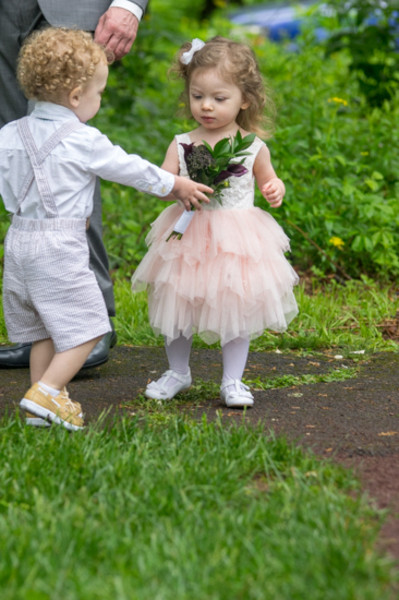 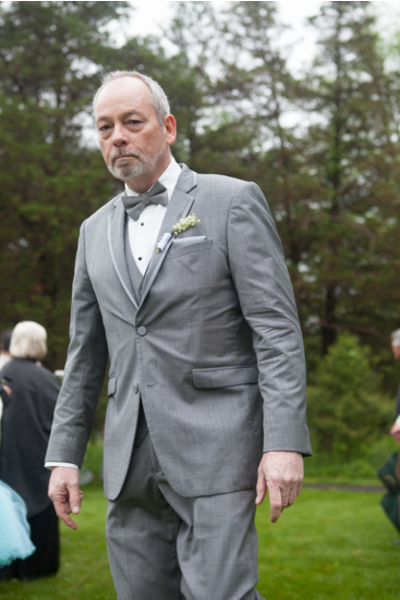 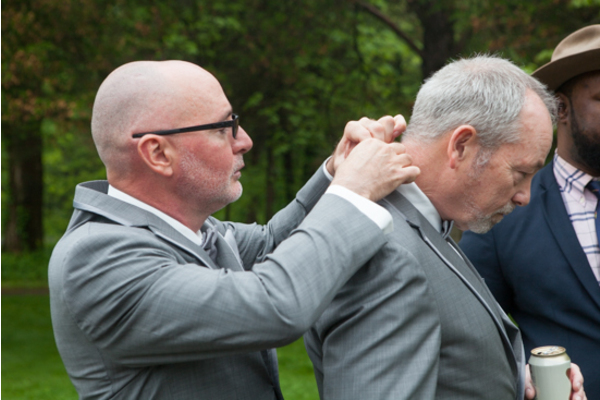 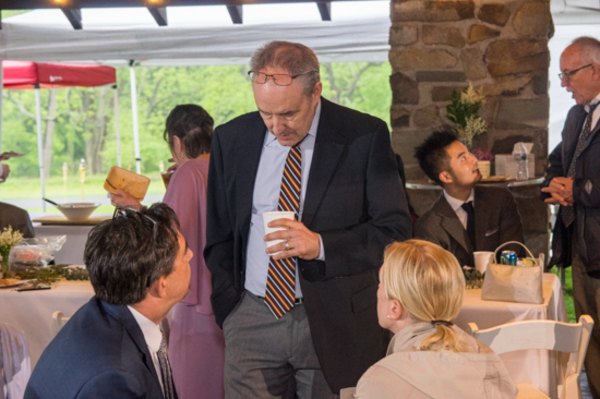 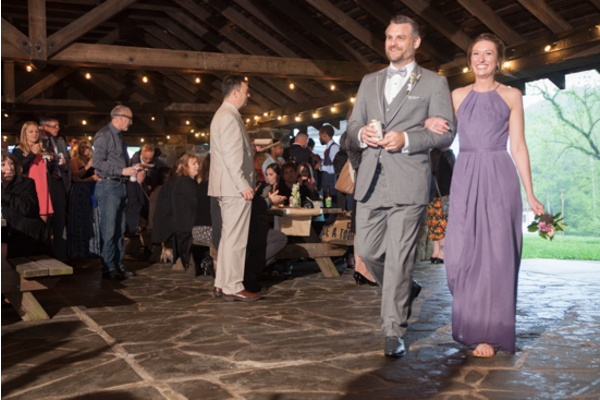 The reception was held at the Bowman’s Hill Wildflower Preserve located in New Hope, NJ. 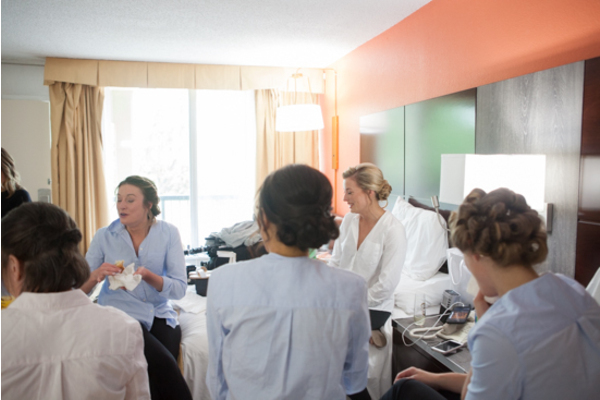 Erin and her closest friends spent the morning in matching button-ups, dancing around, and laughing as they prepped for Erin’s grand entrance. 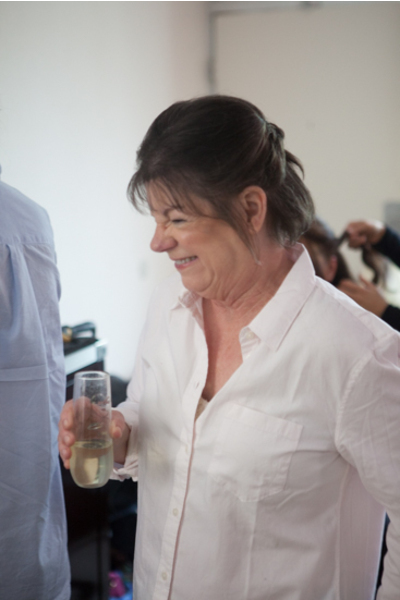 She would not have wanted her morning any other way! 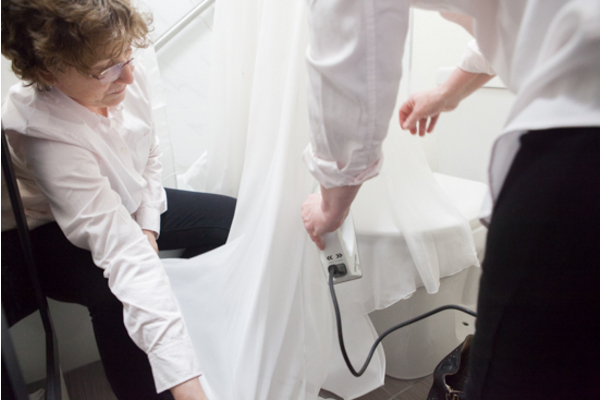 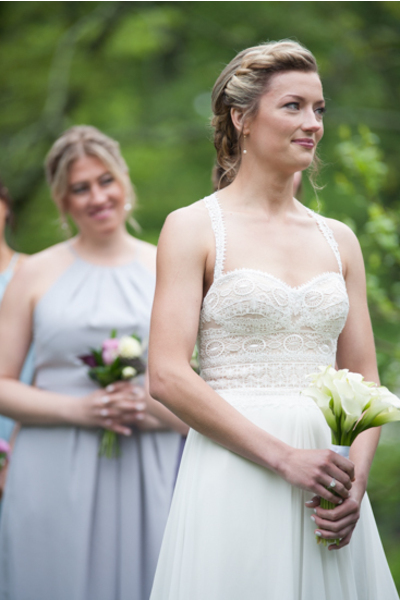 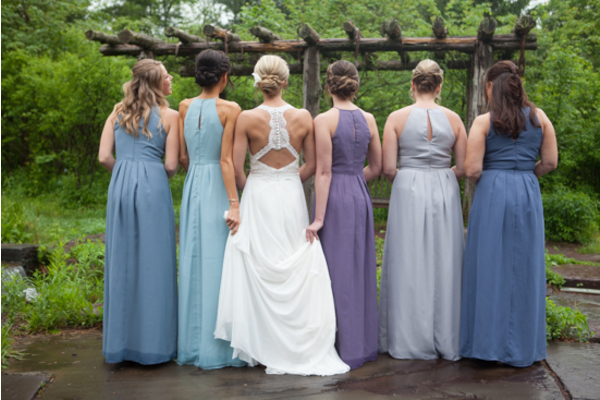 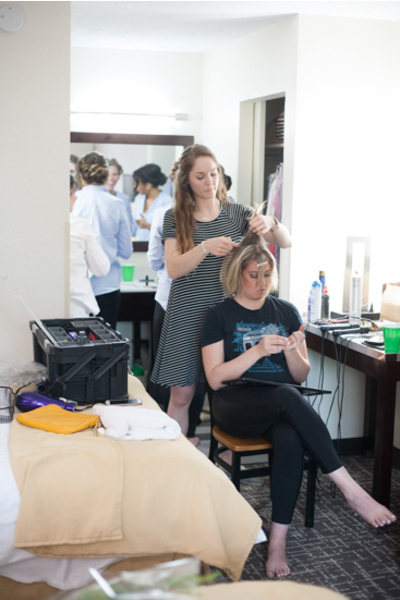 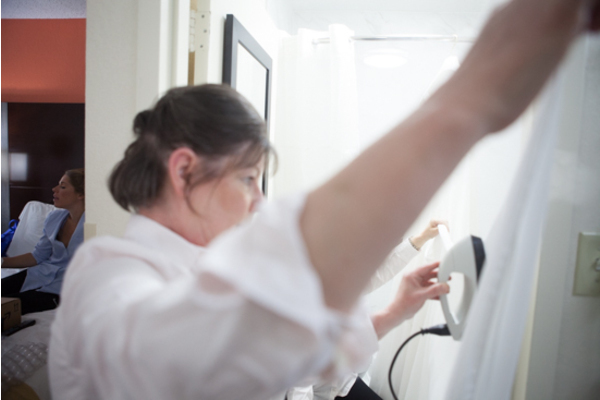 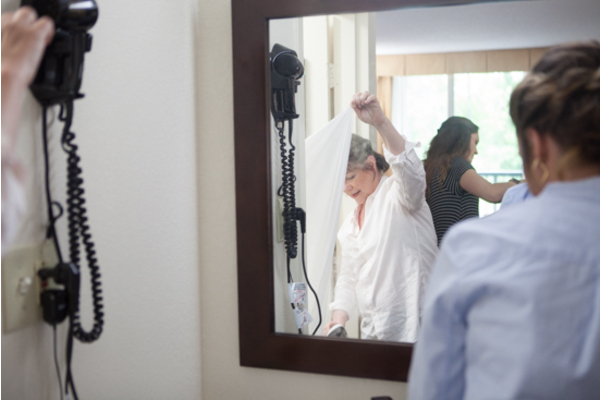 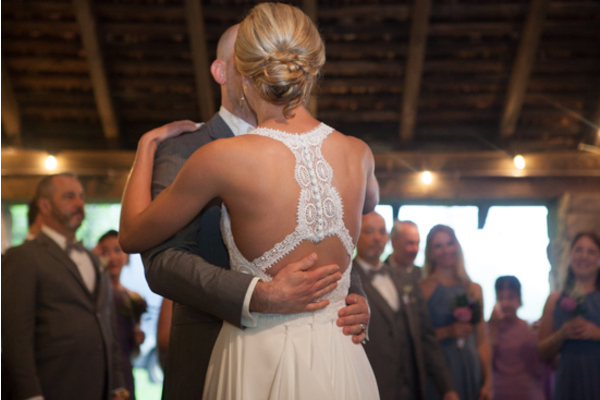 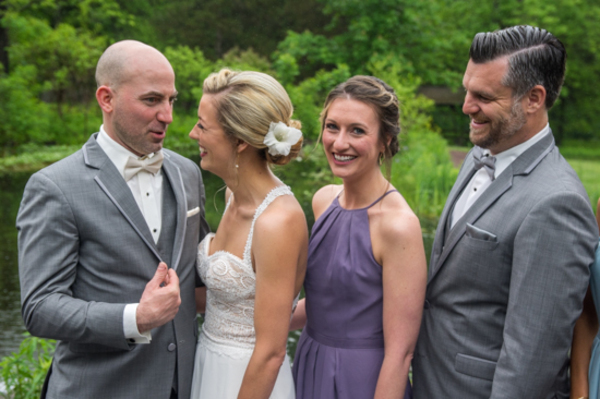 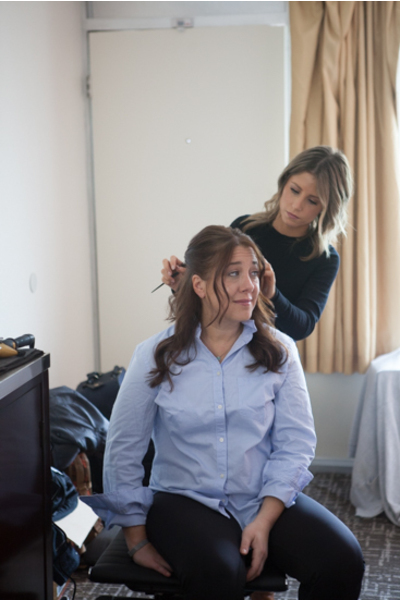 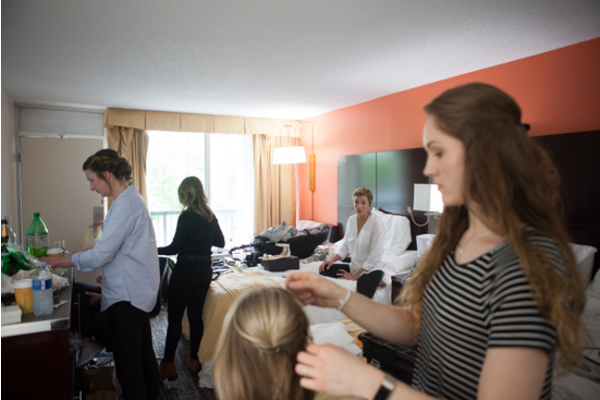 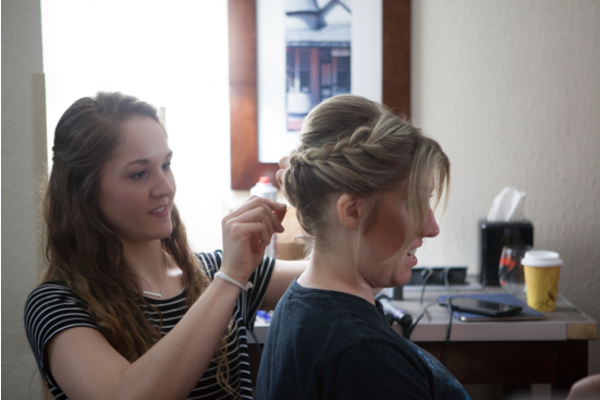 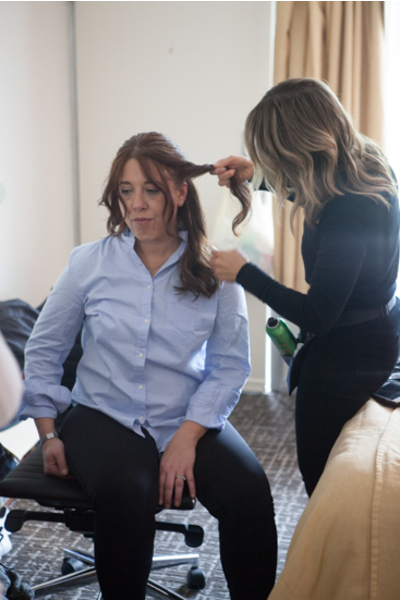 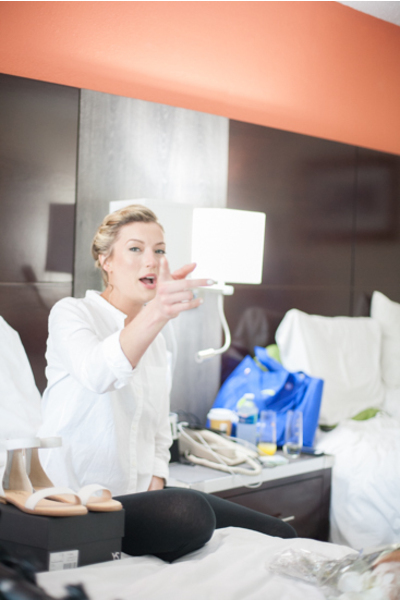 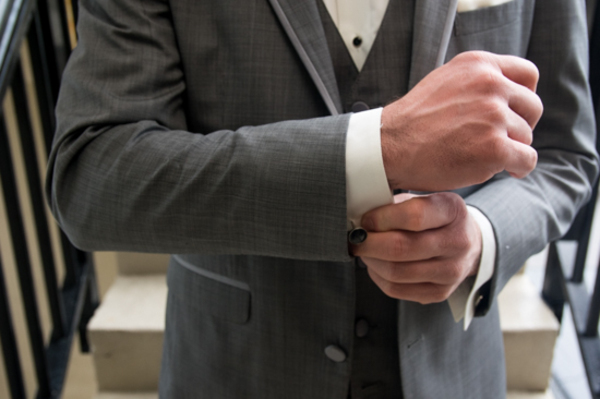 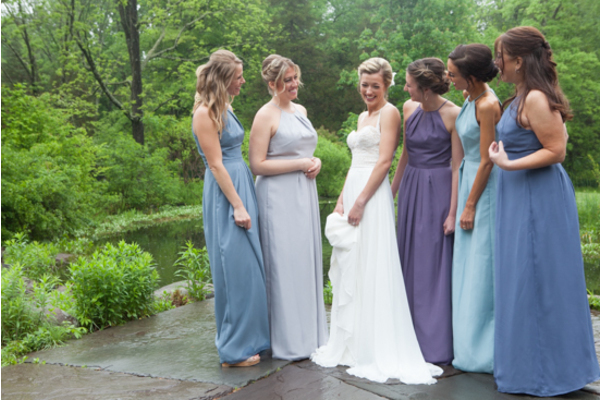 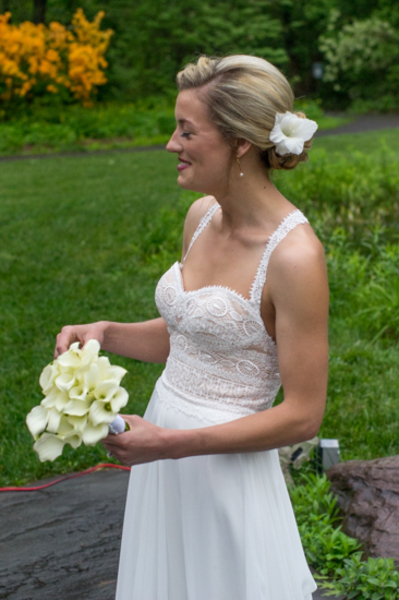 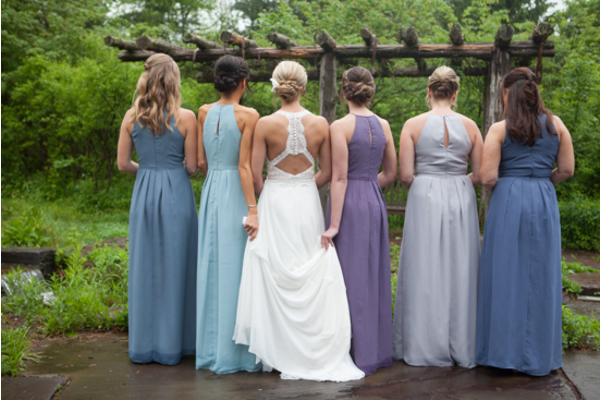 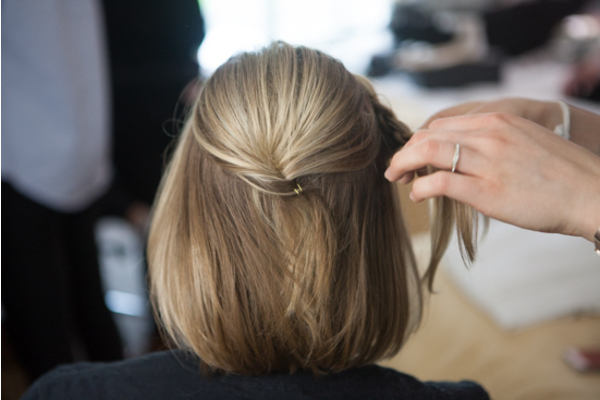 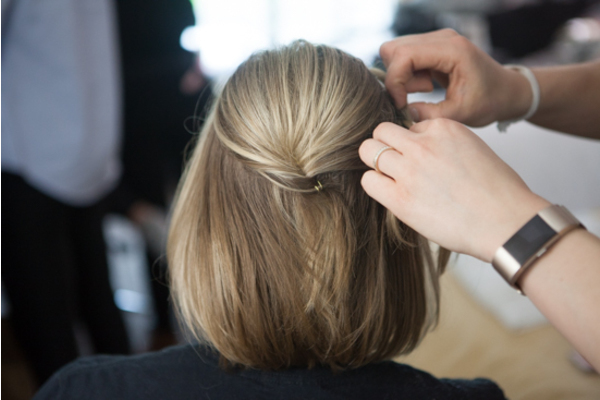 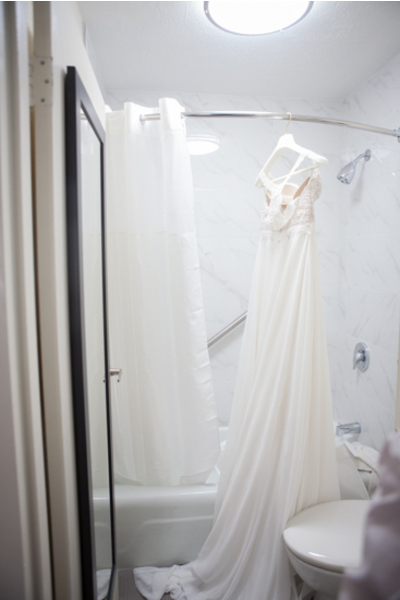 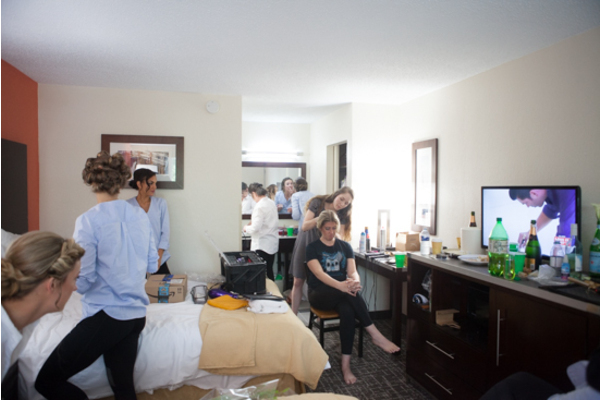 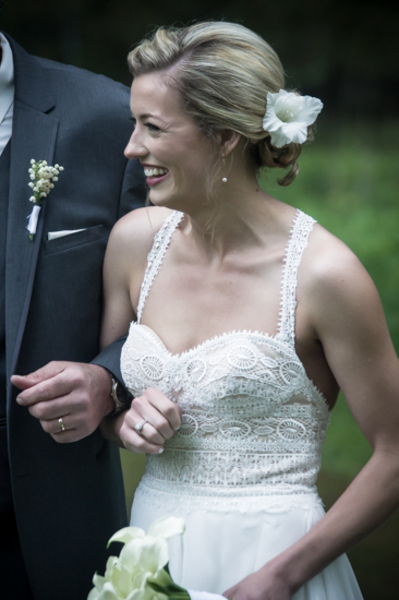 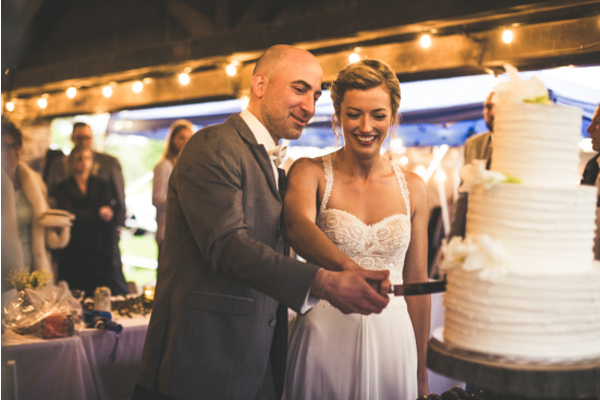 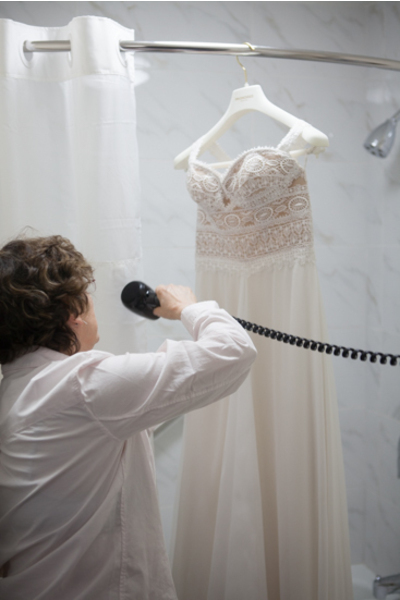 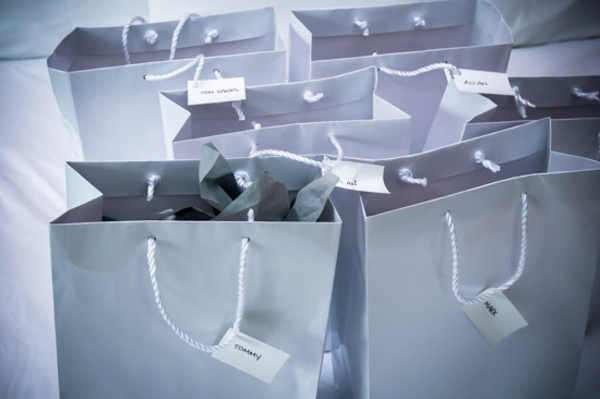 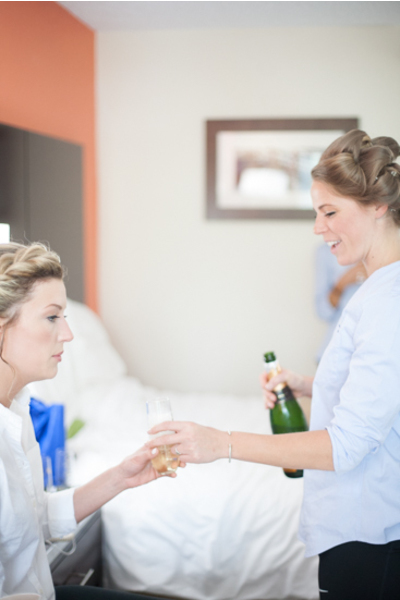 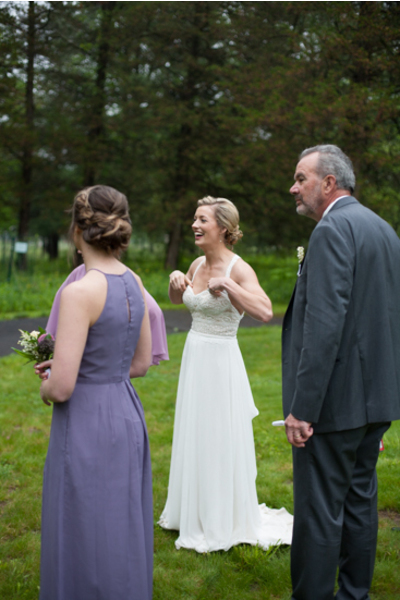 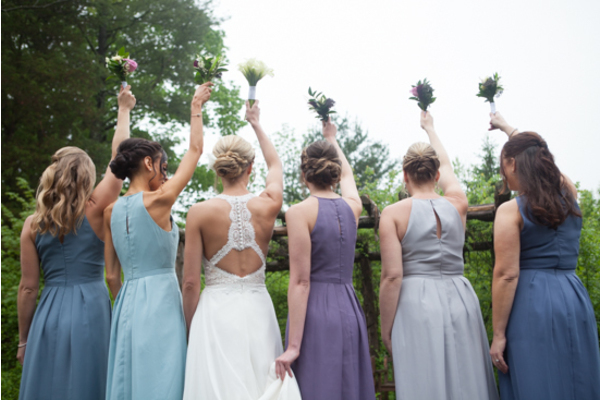 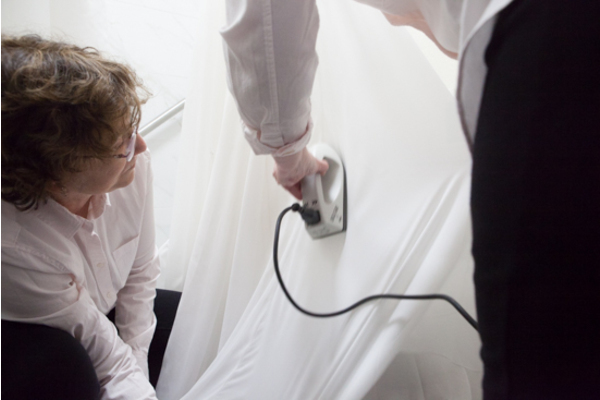 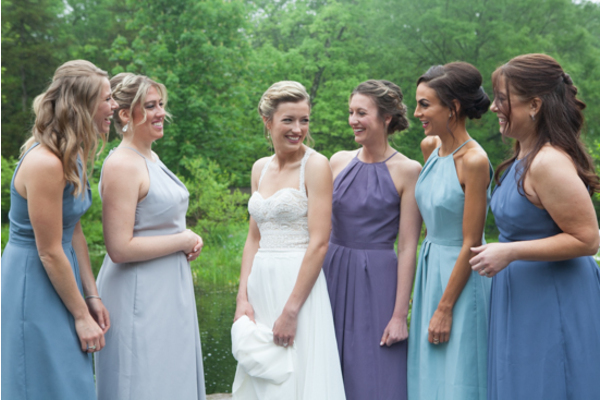 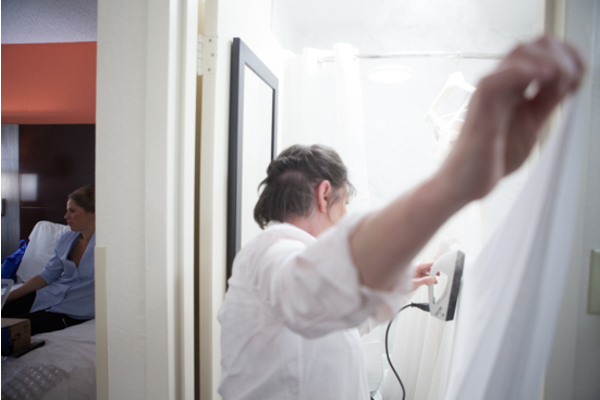 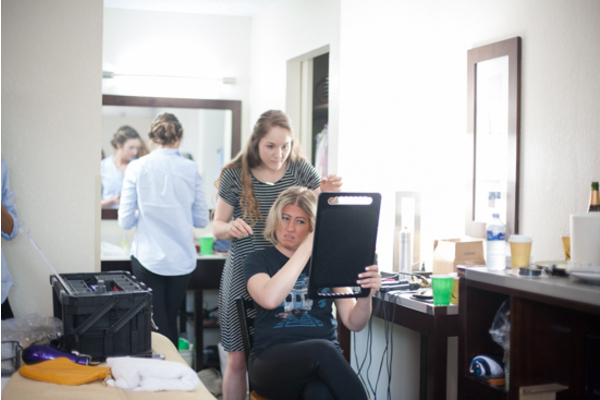 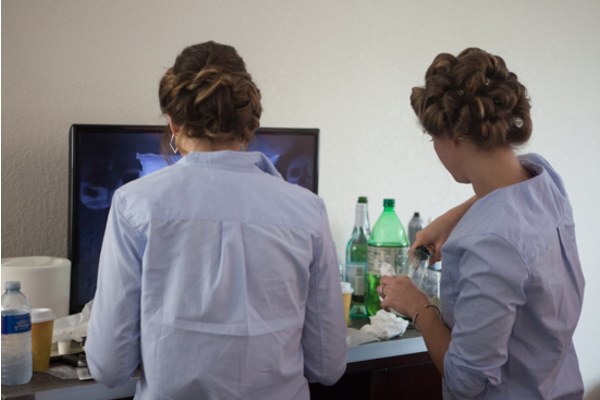 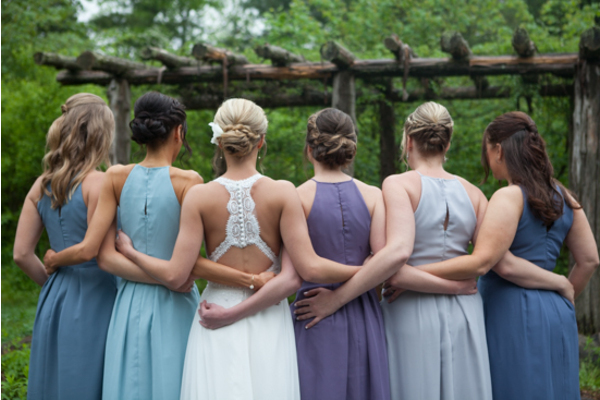 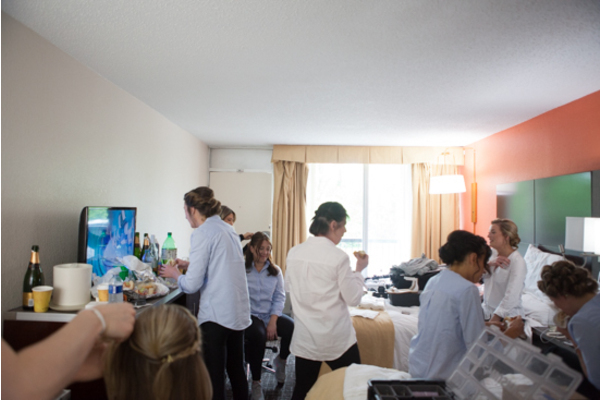 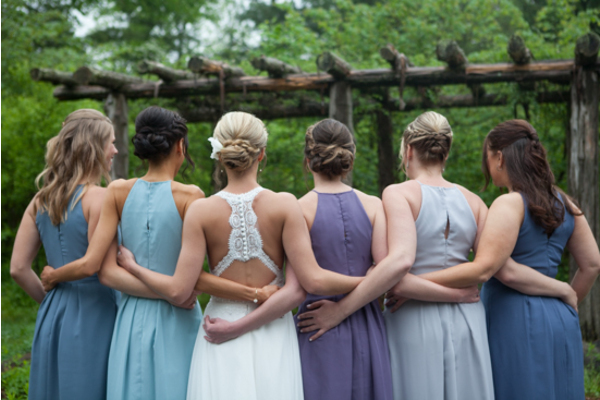 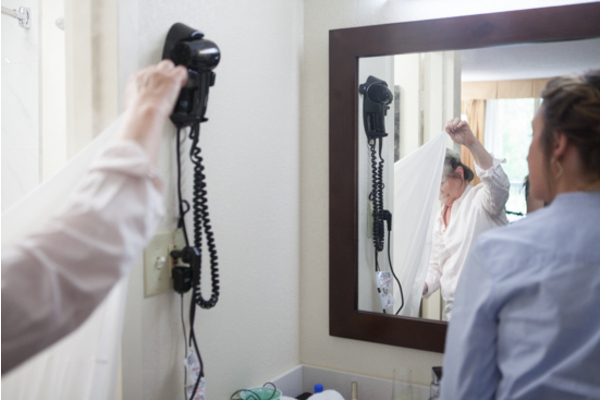 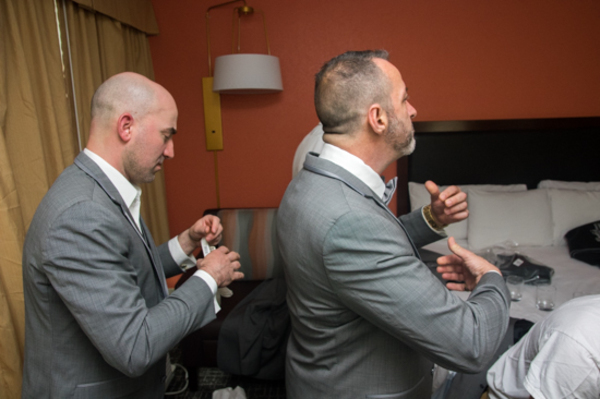 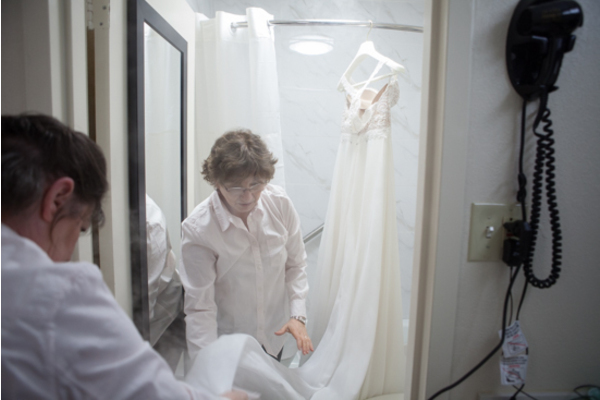 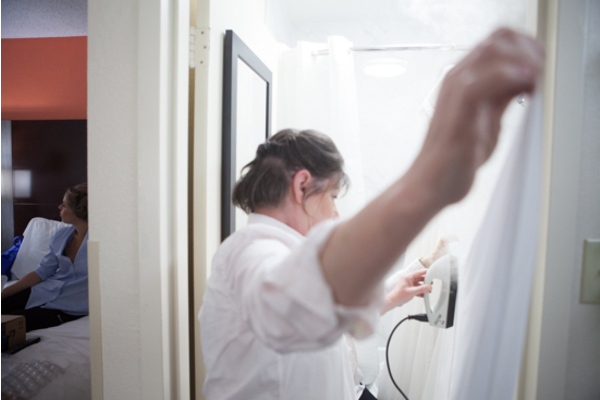 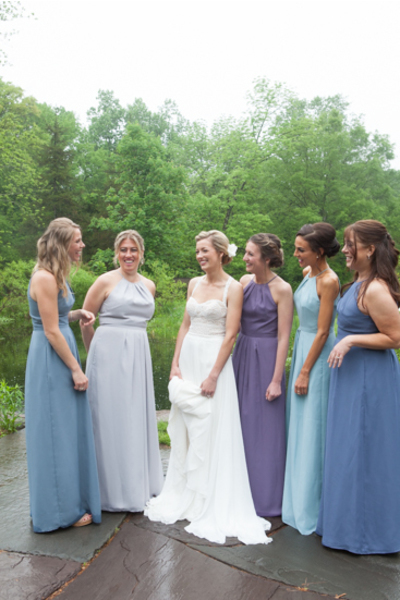 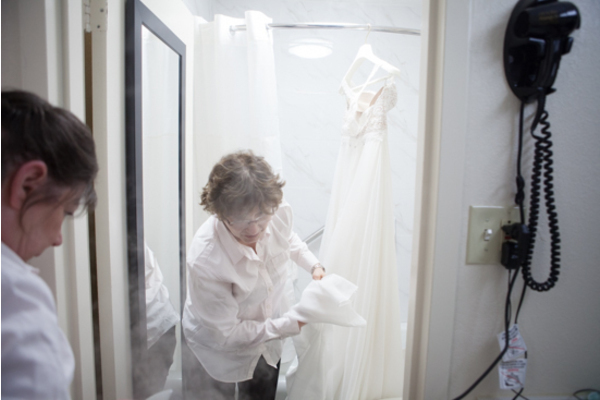 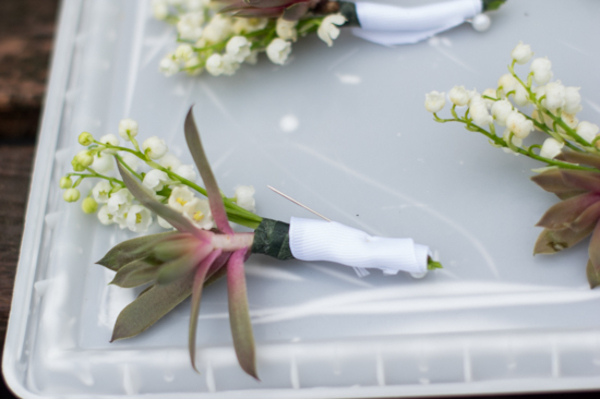 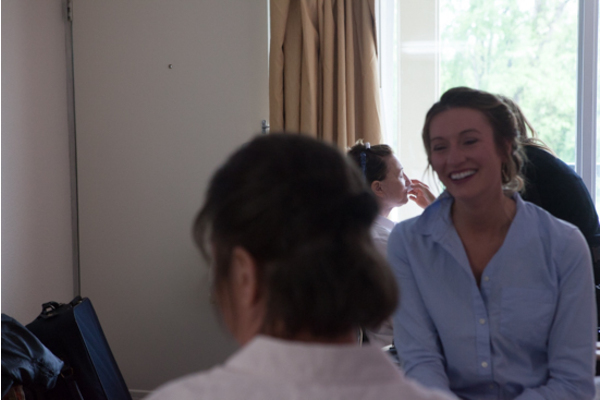 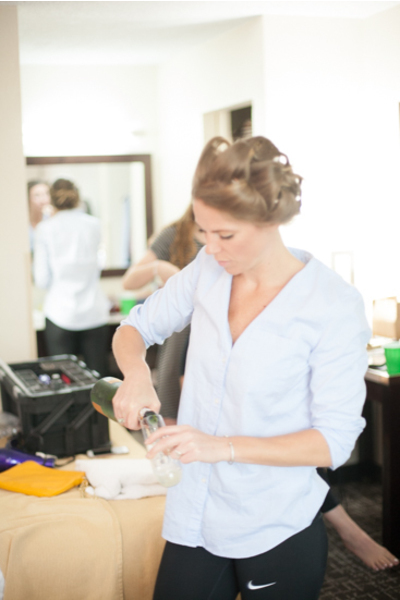 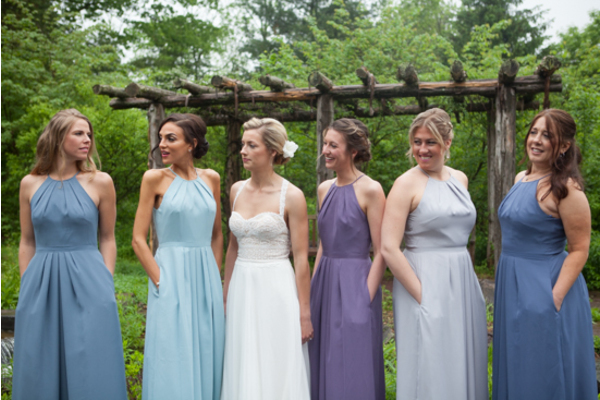 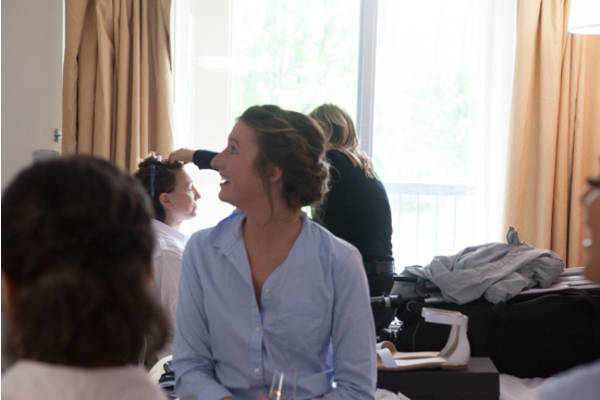 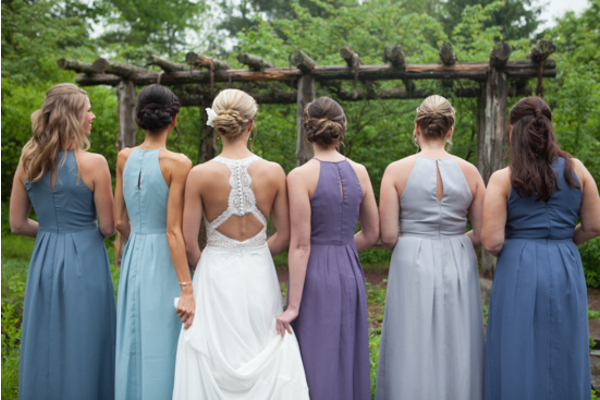 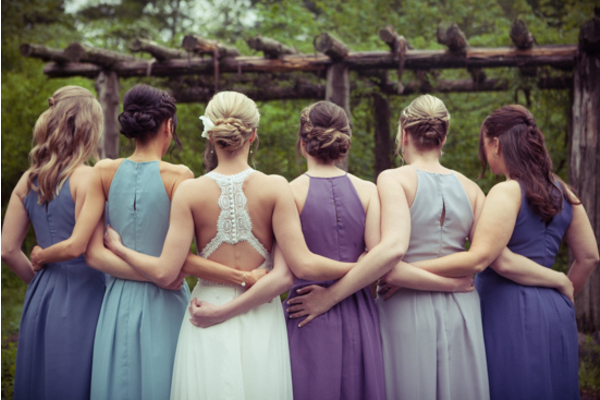 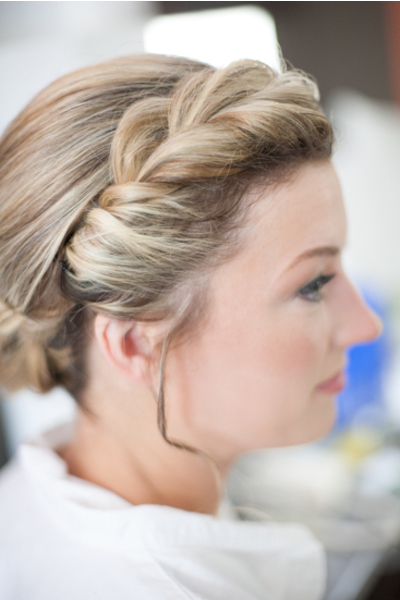 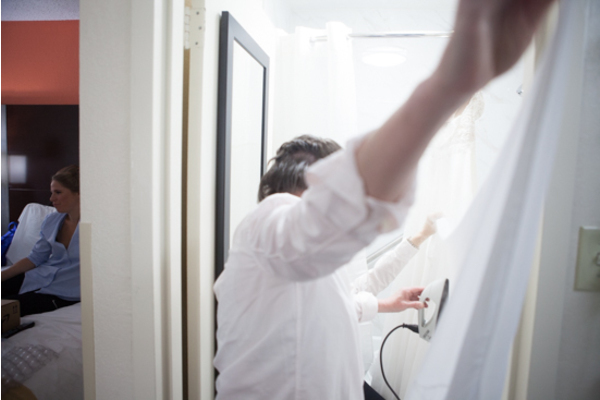 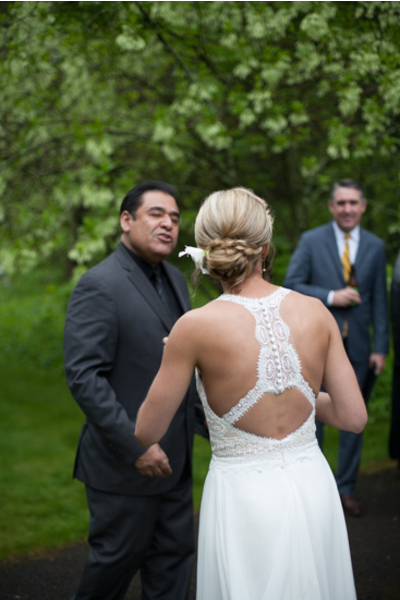 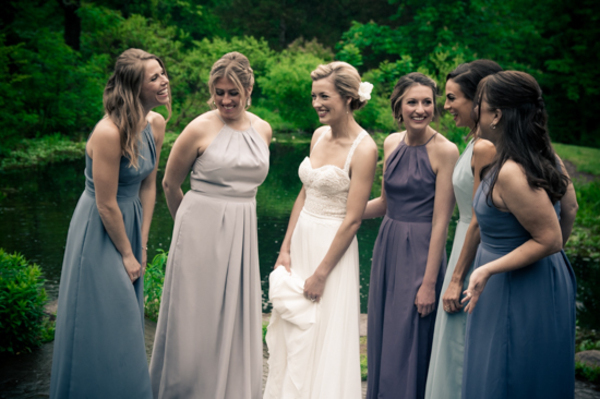 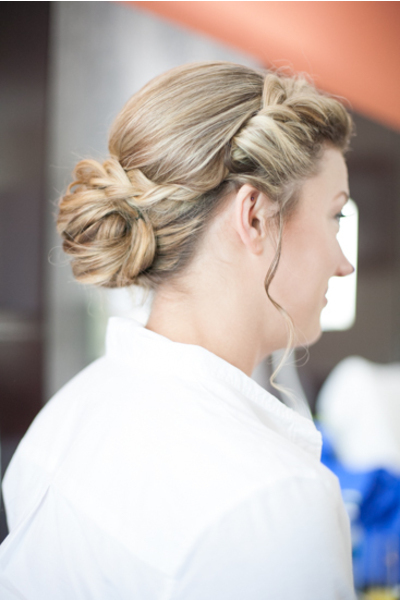 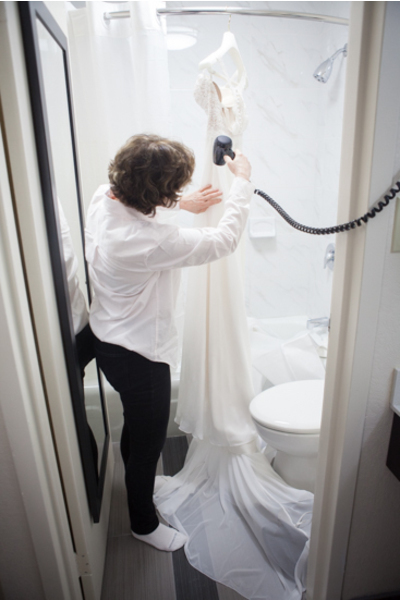 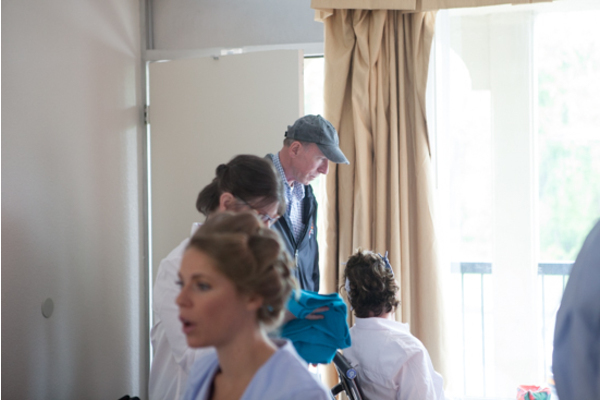 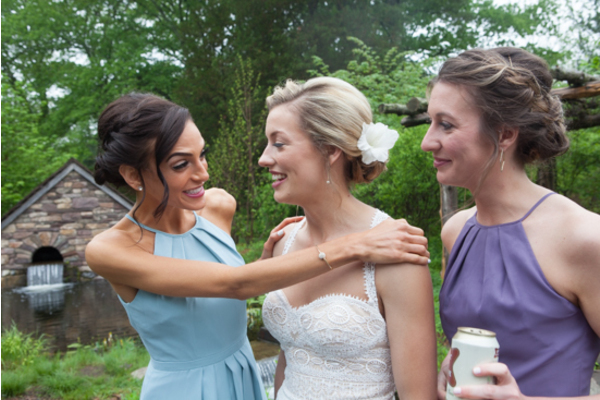 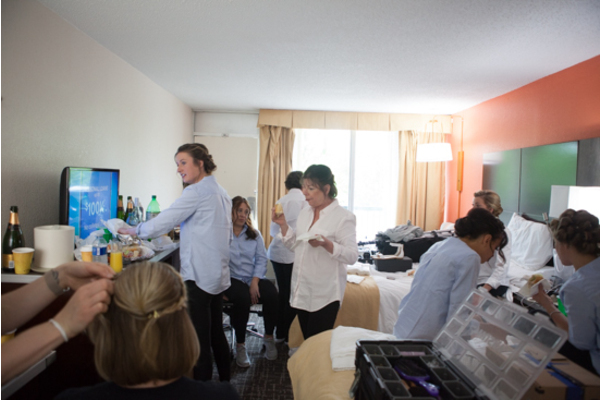 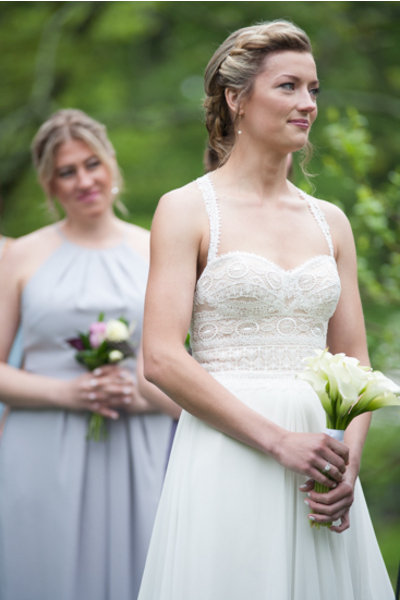 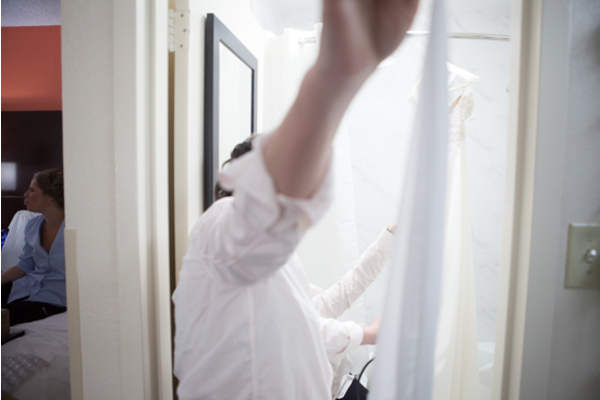 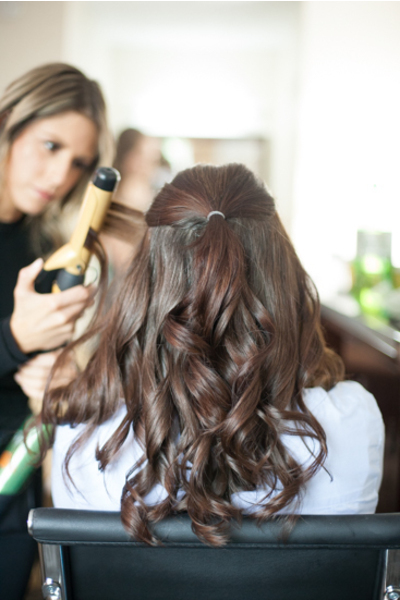 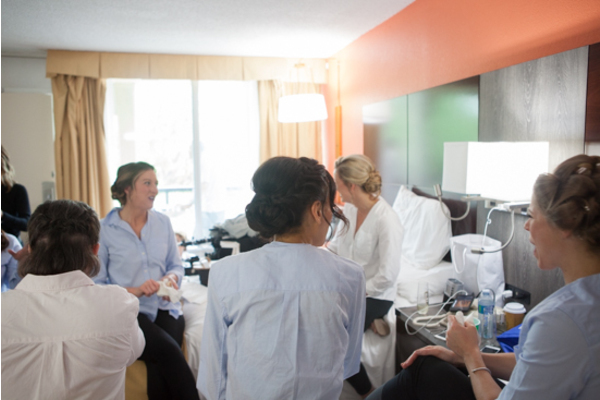 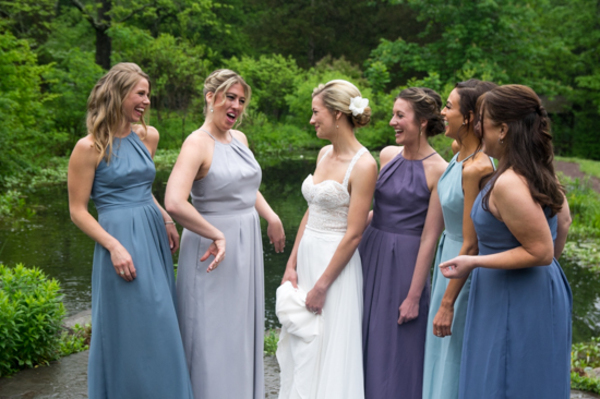 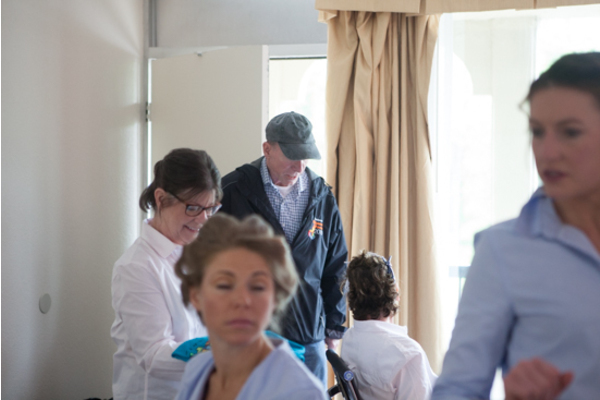 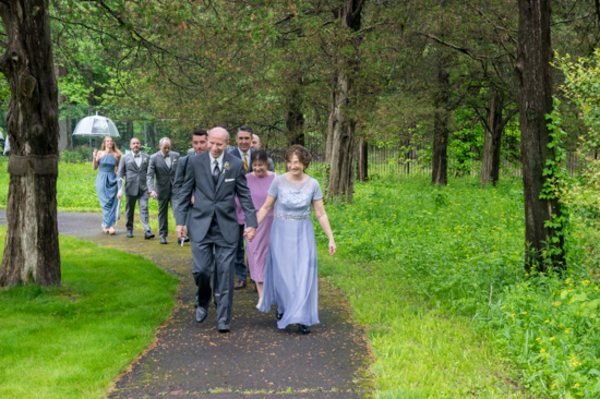 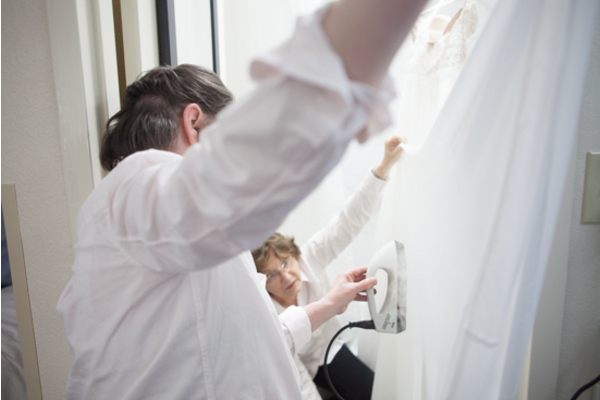 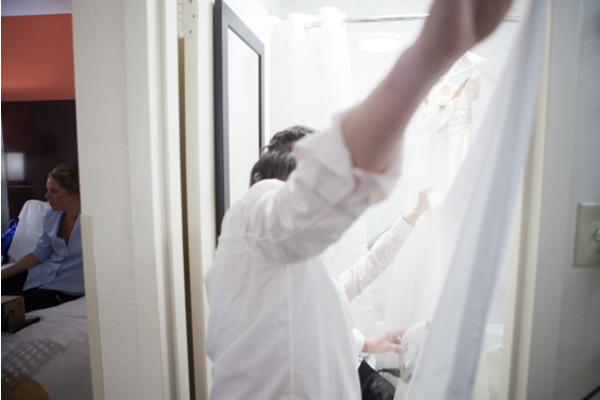 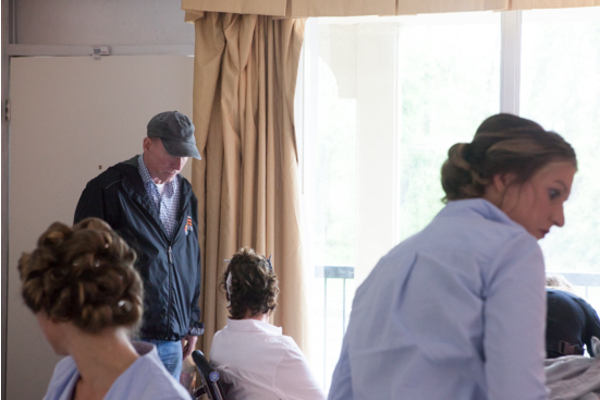 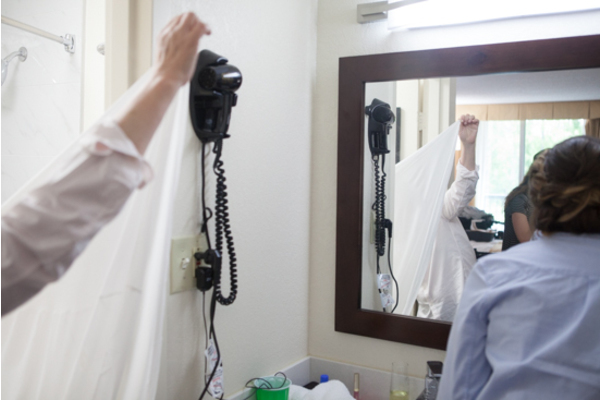 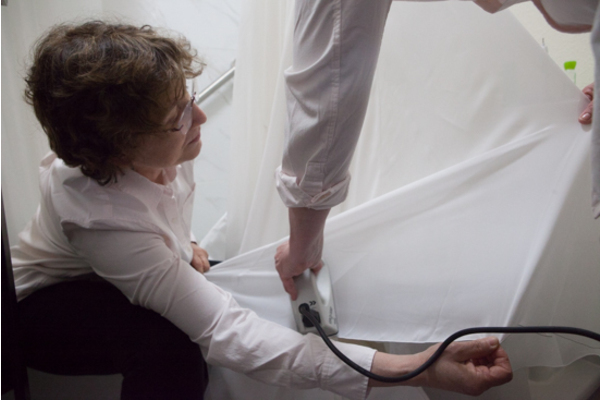 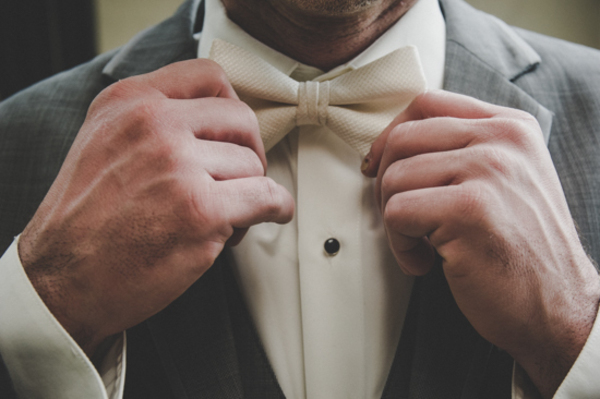 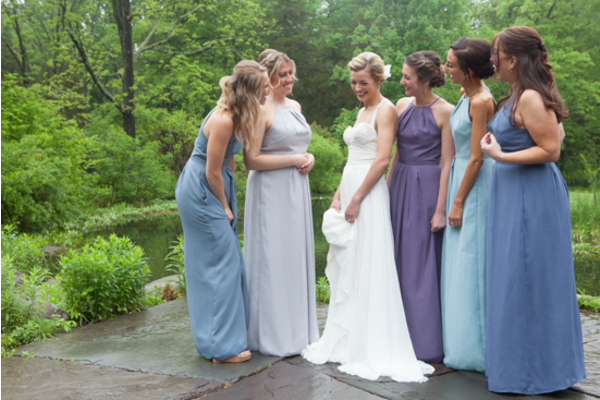 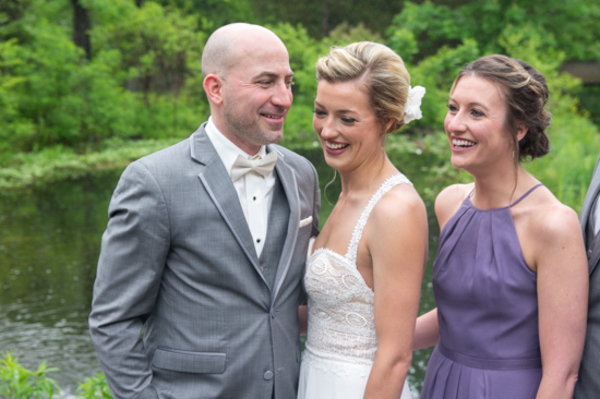 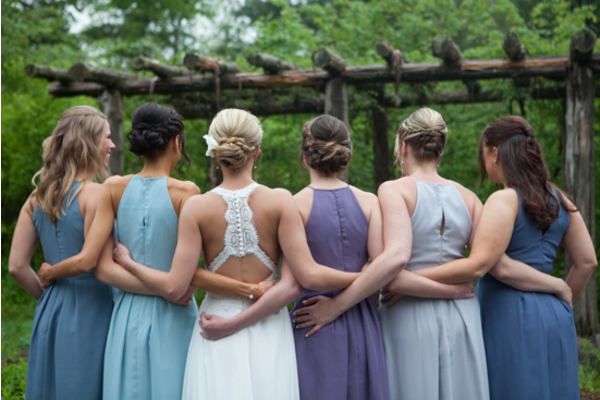 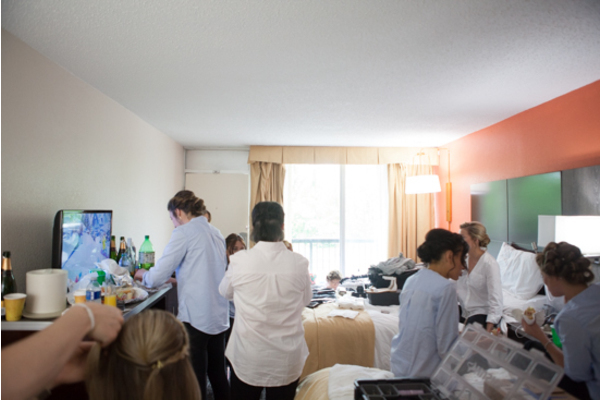 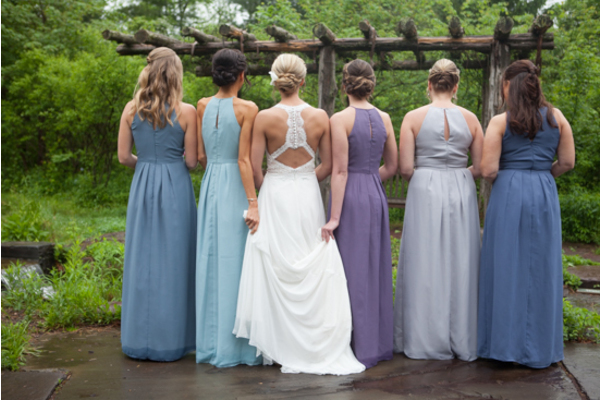 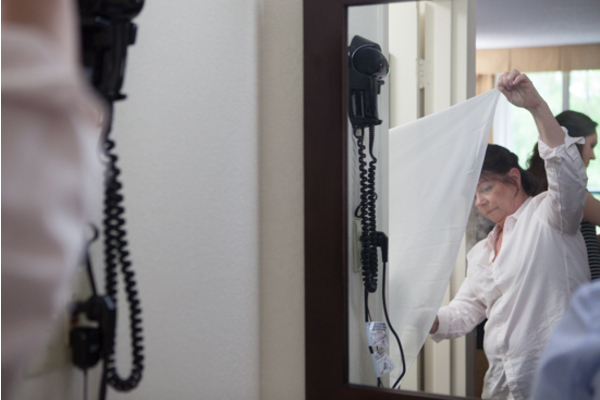 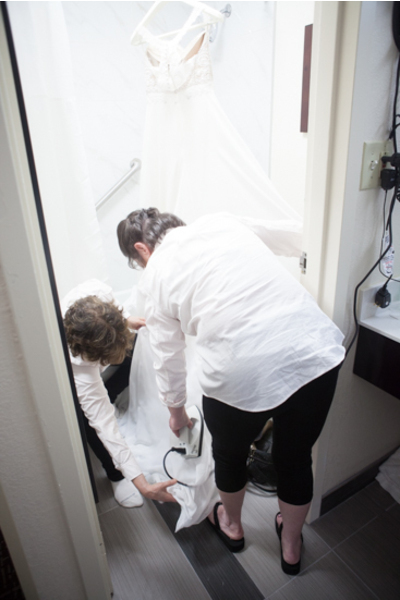 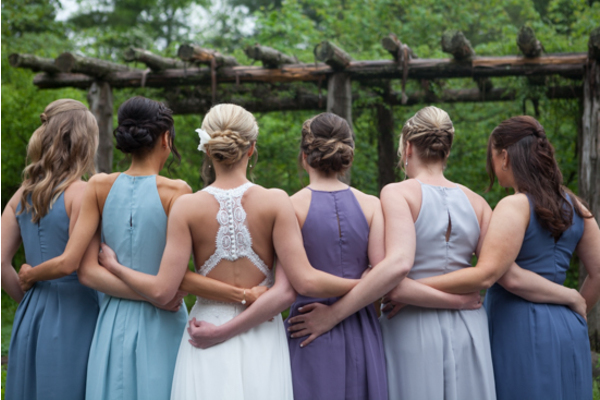 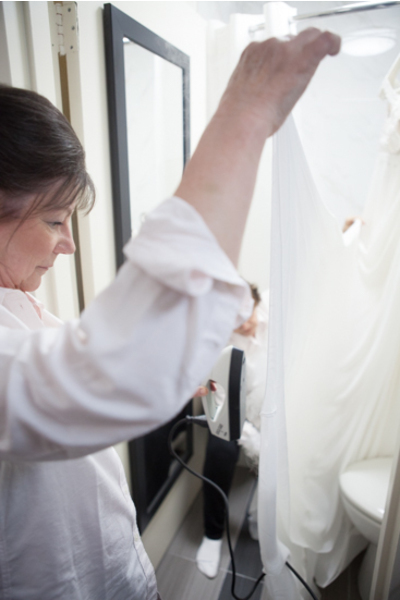 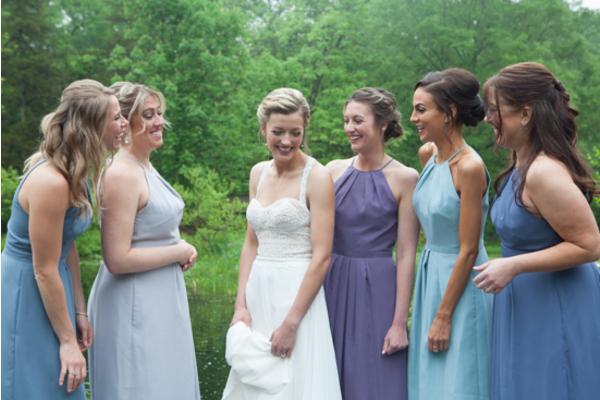 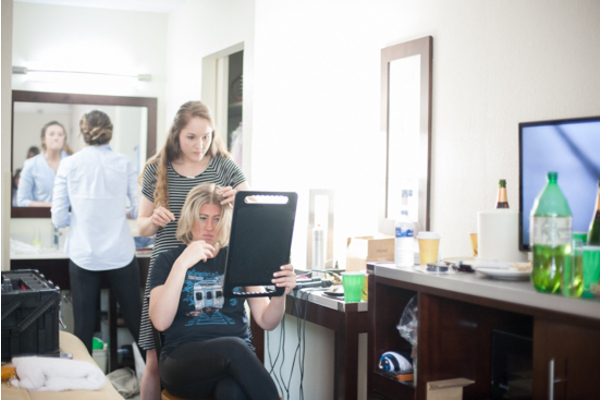 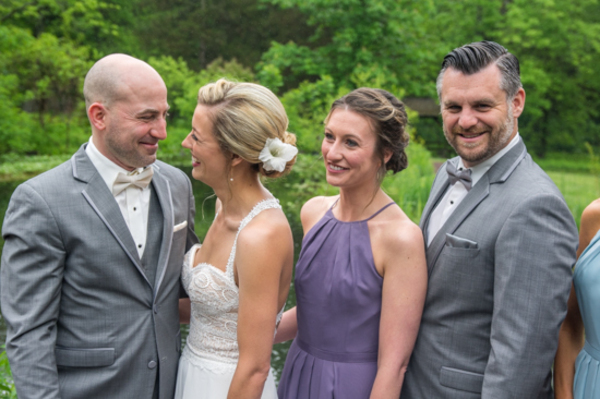 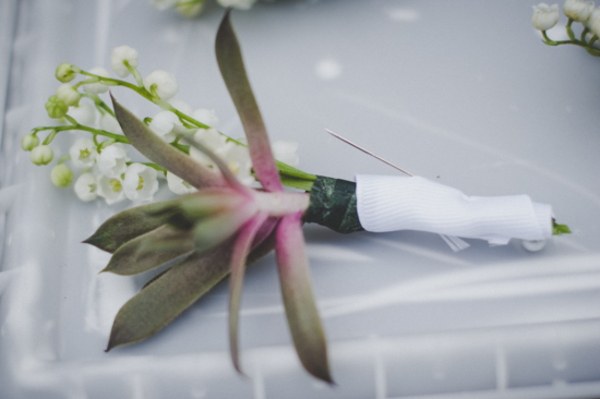 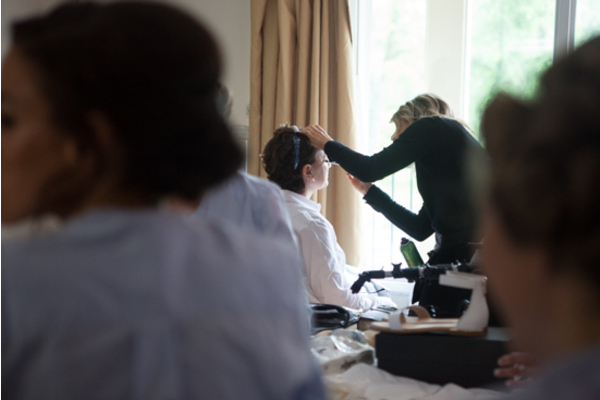 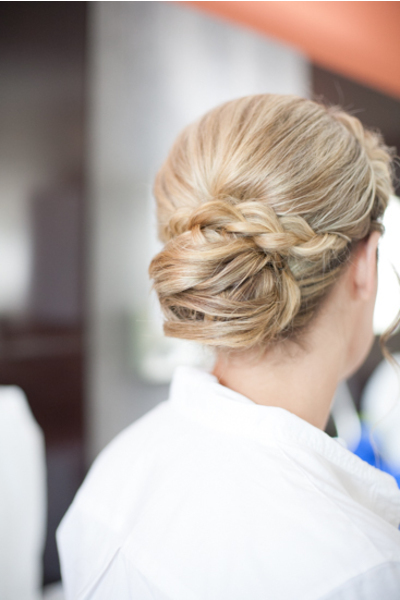 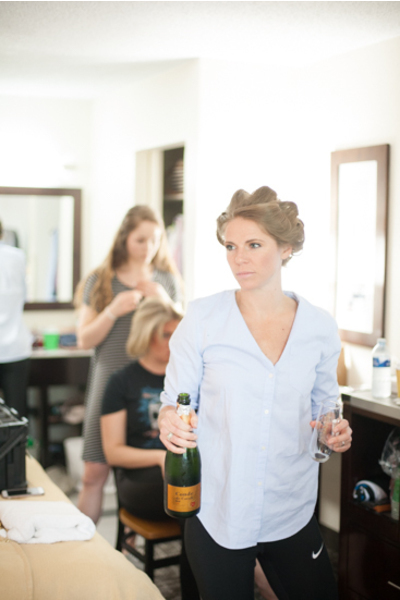 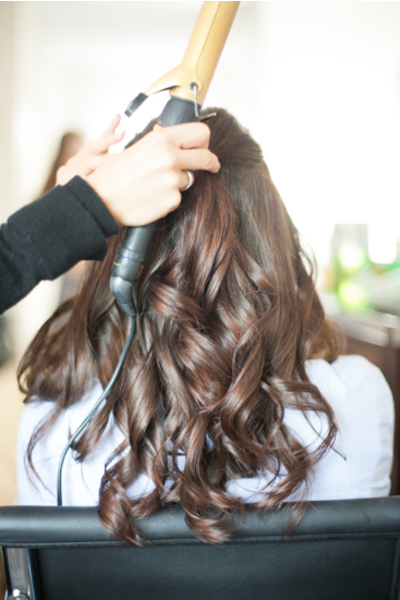 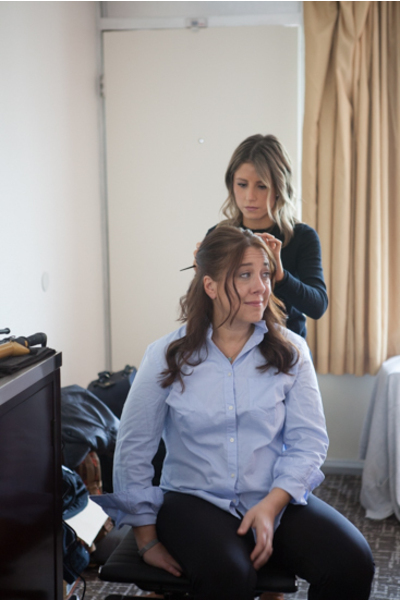 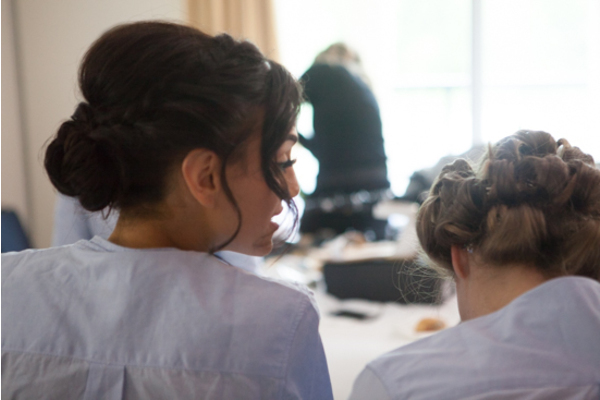 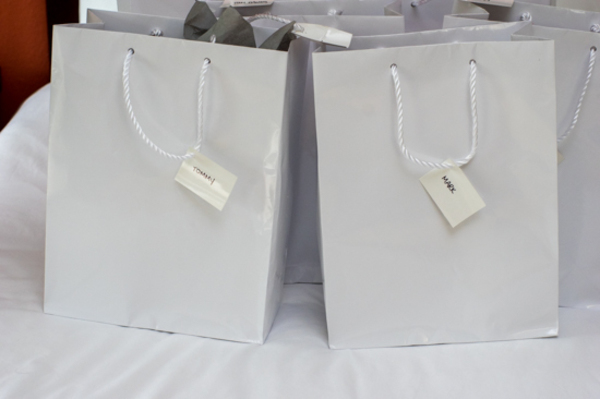 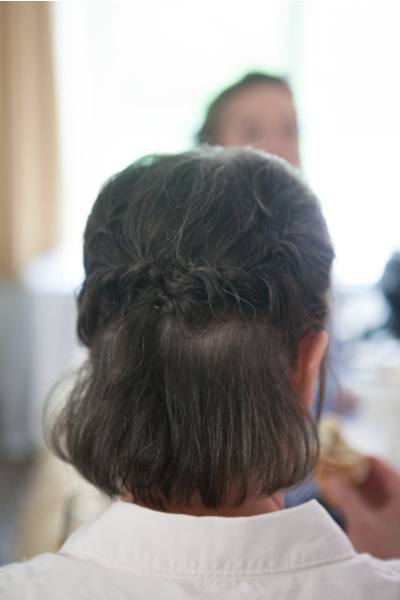 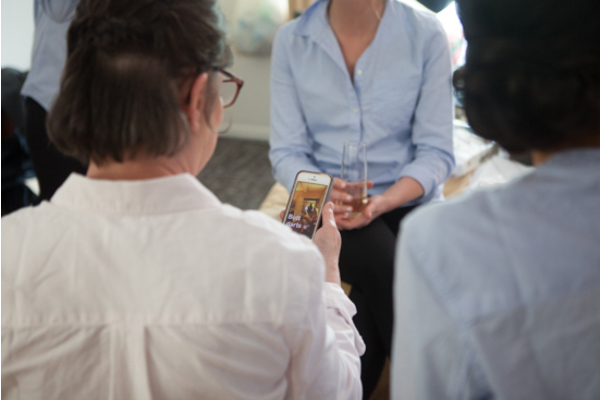 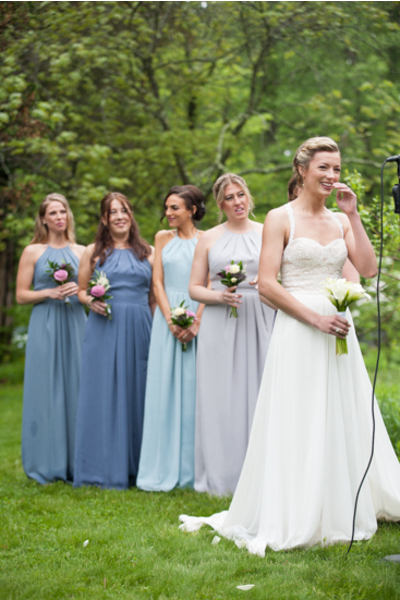 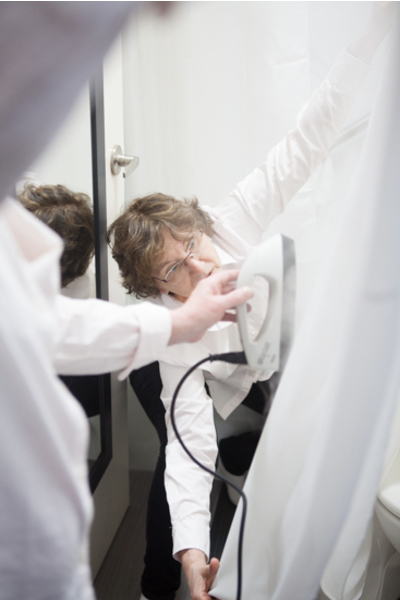 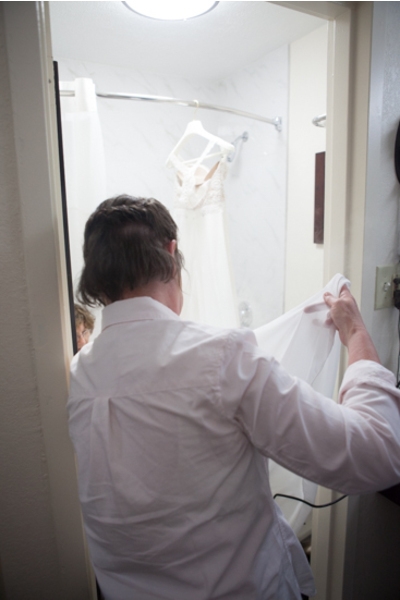 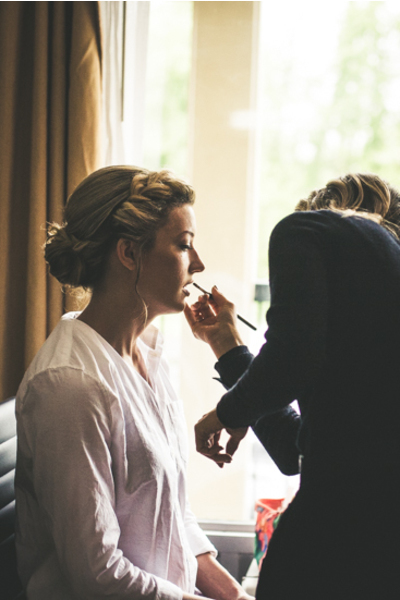 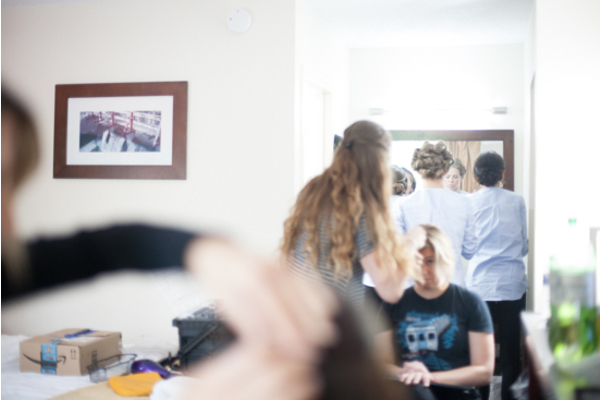 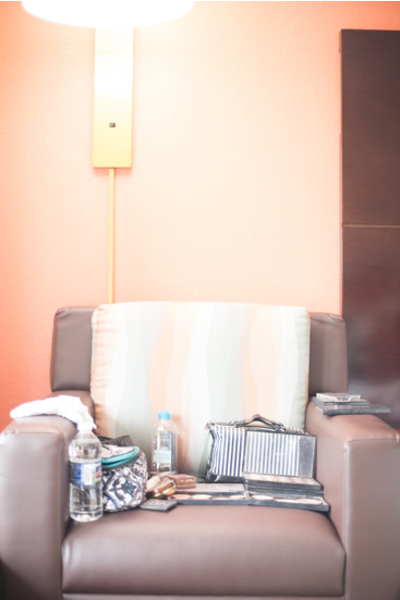 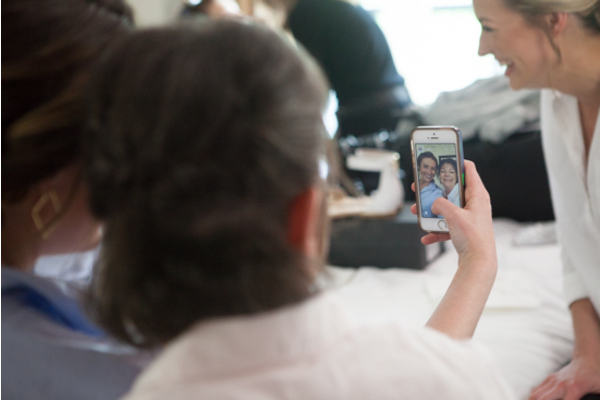 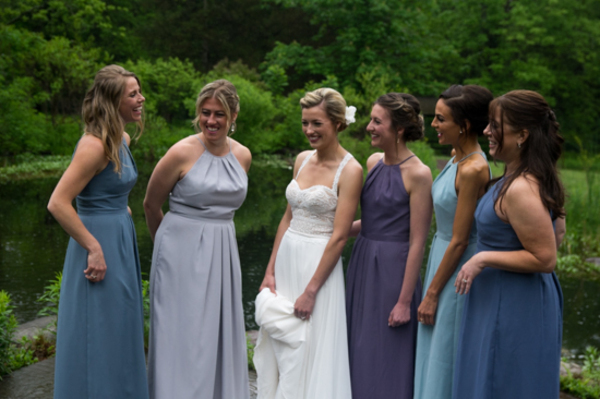 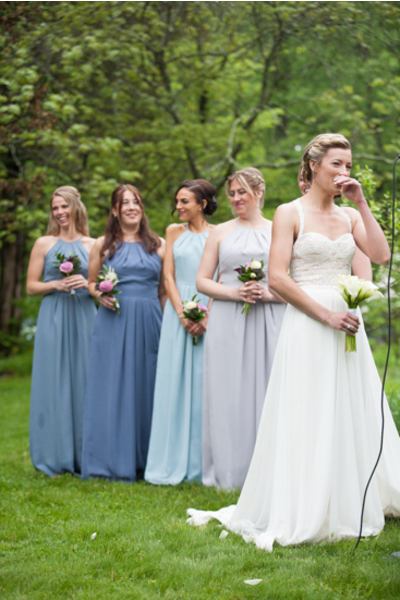 The loving hands of the bridal party helped Erin step into her elegant gown and complete any finishing touches. 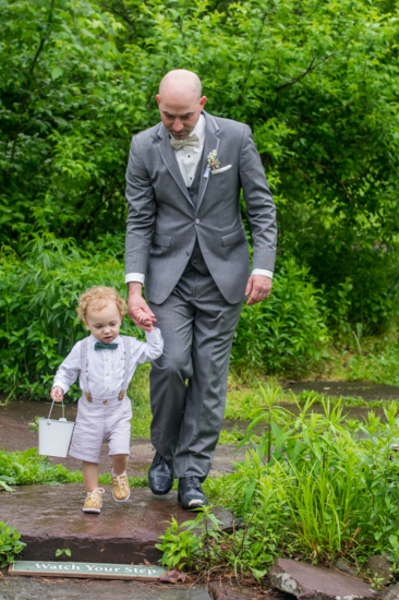 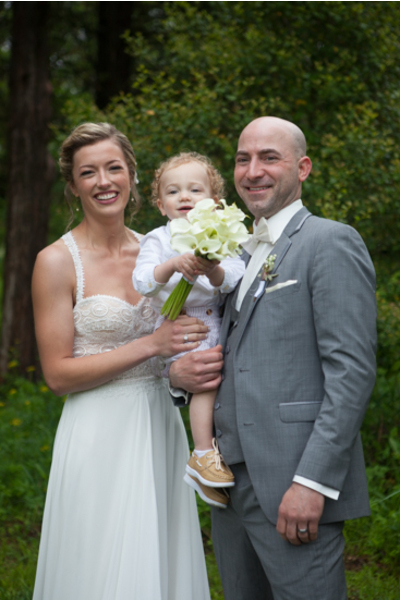 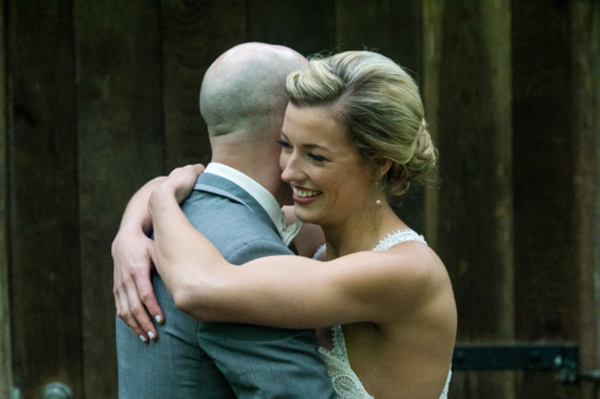 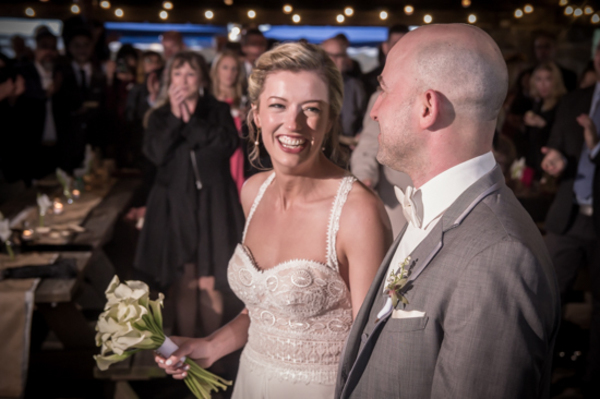 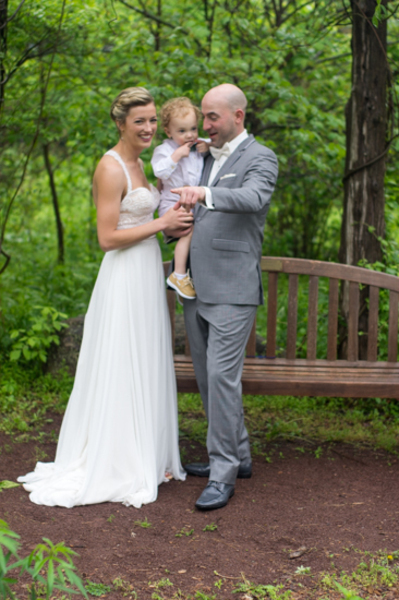 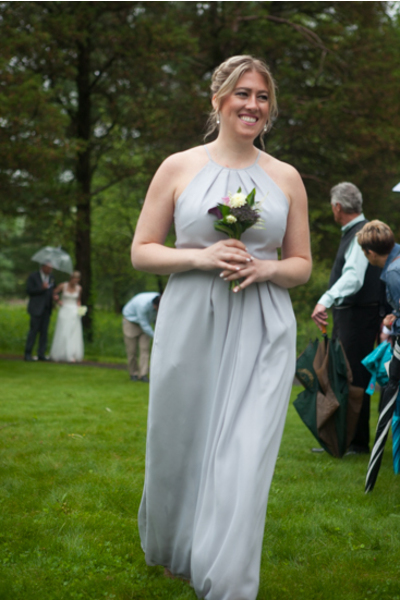 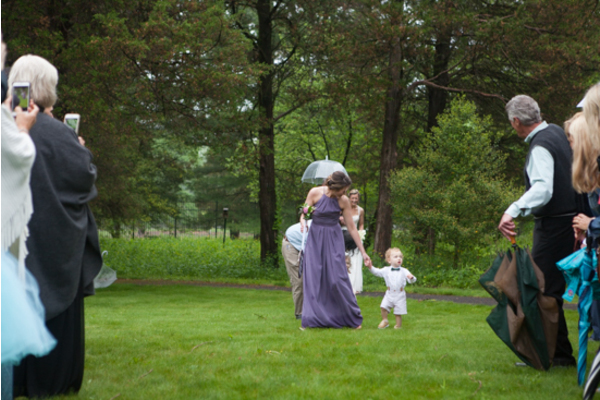 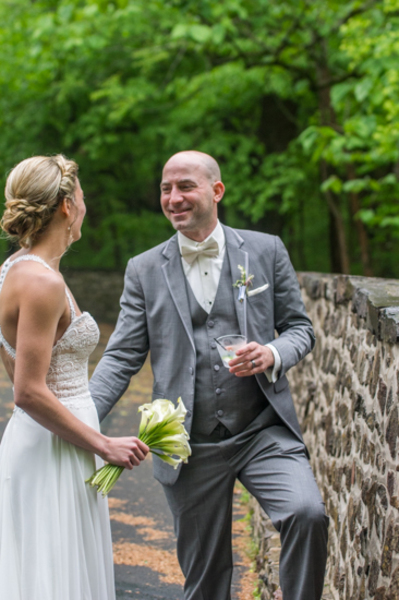 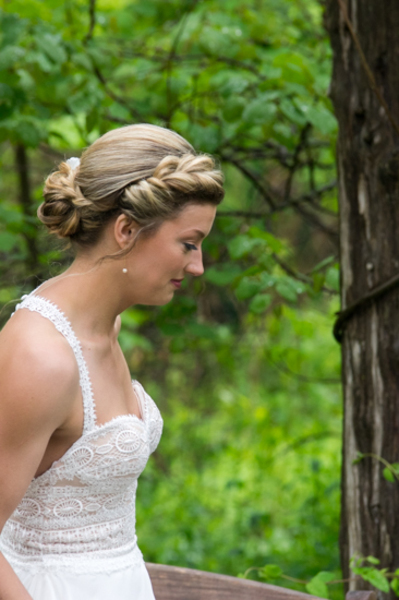 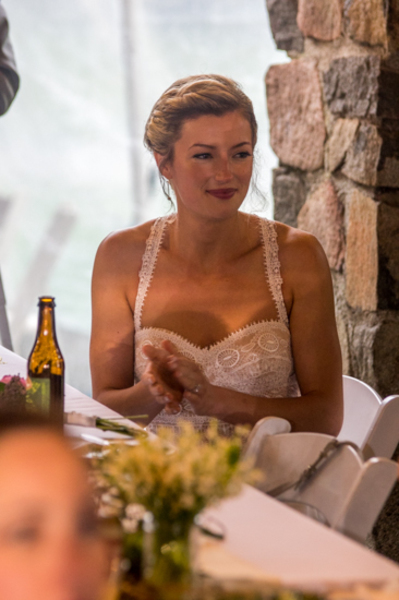 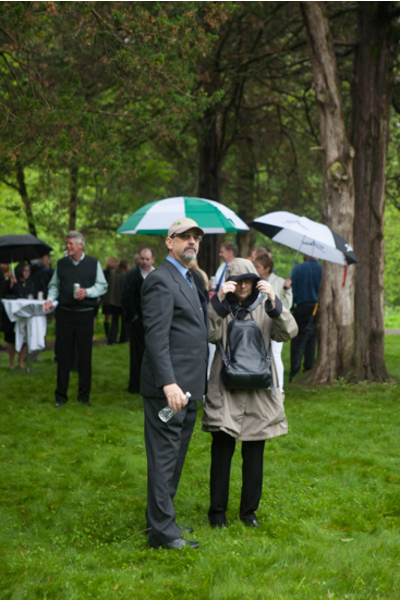 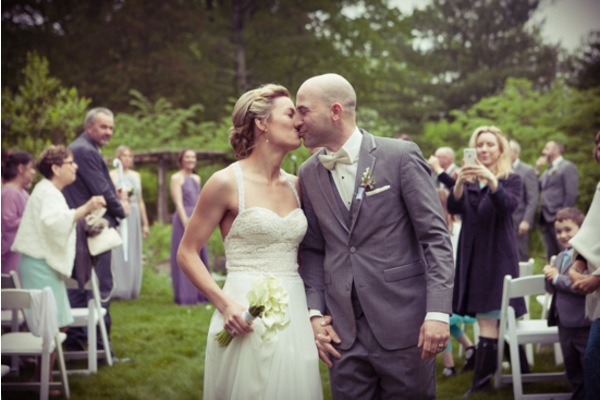 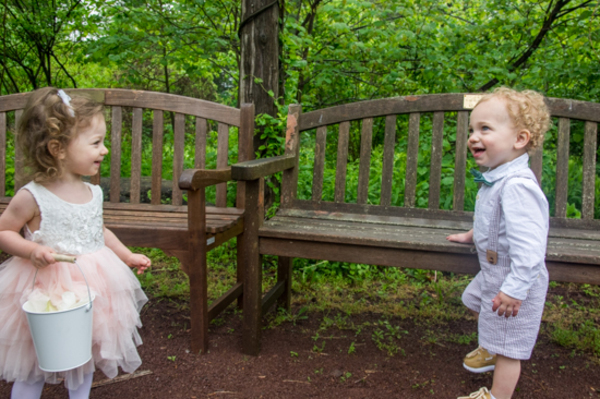 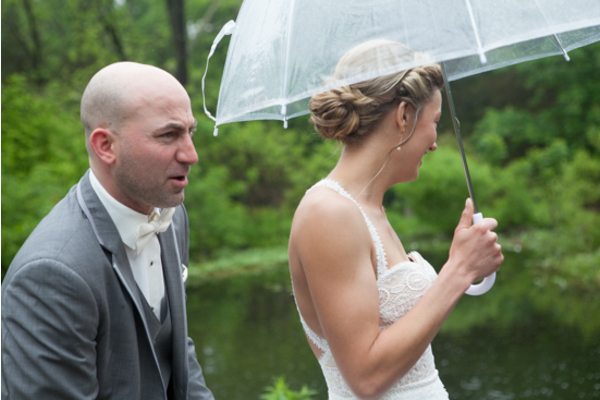 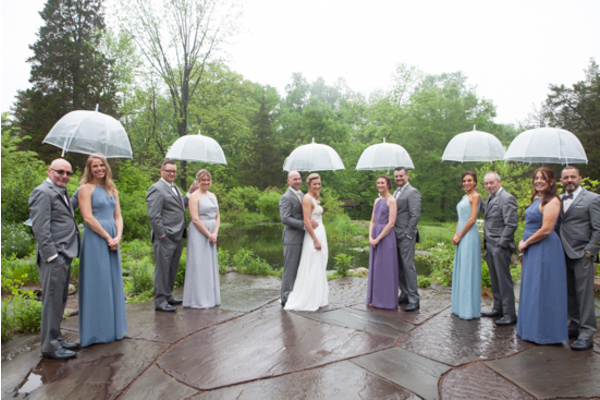 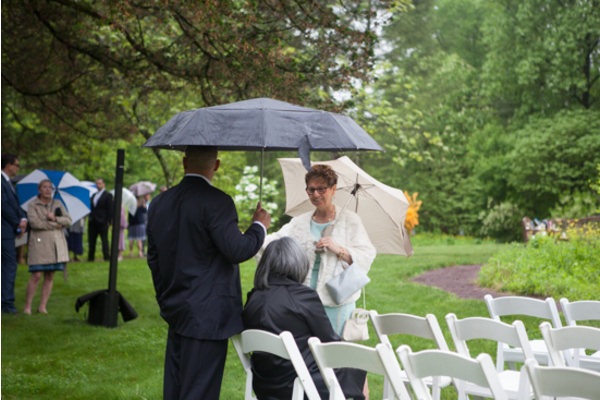 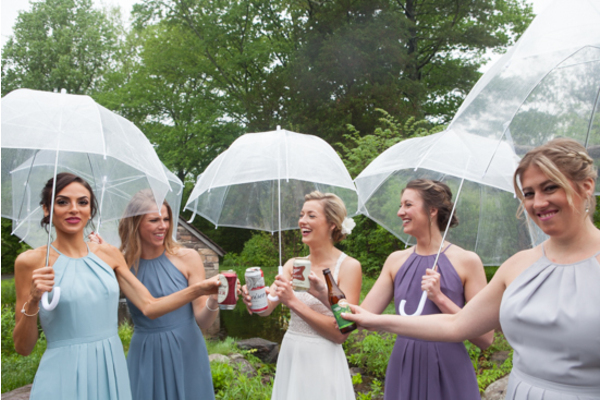 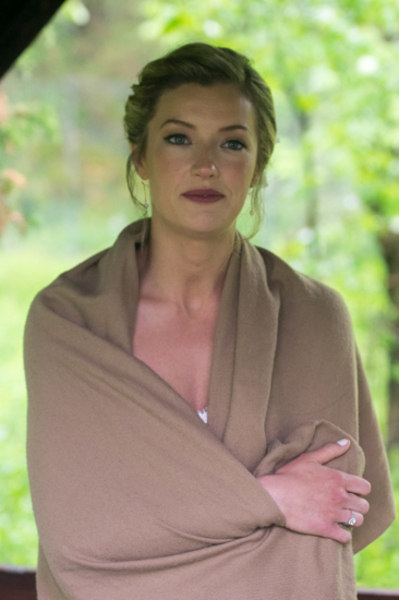 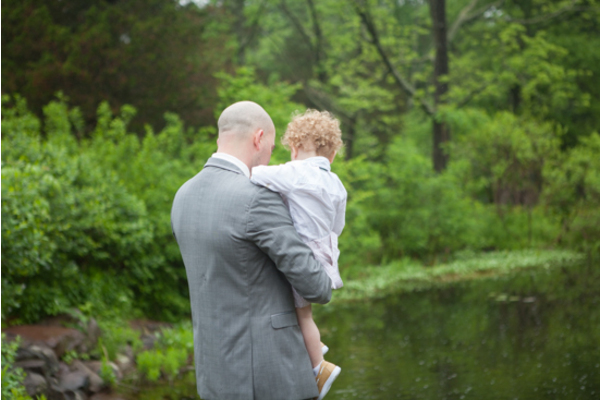 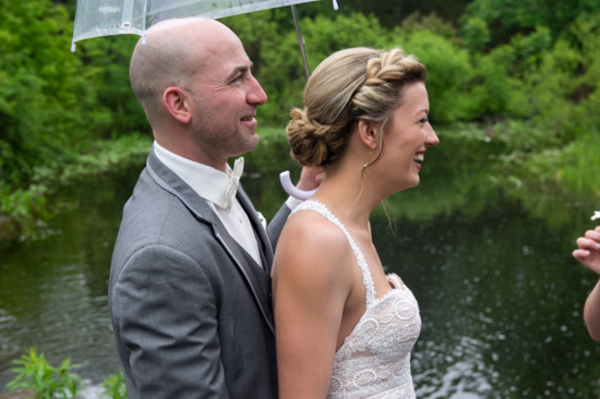 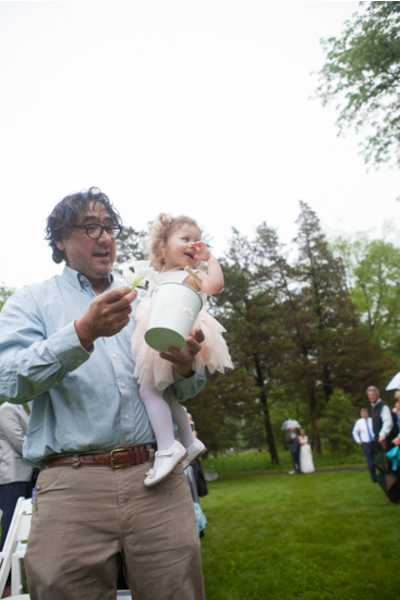 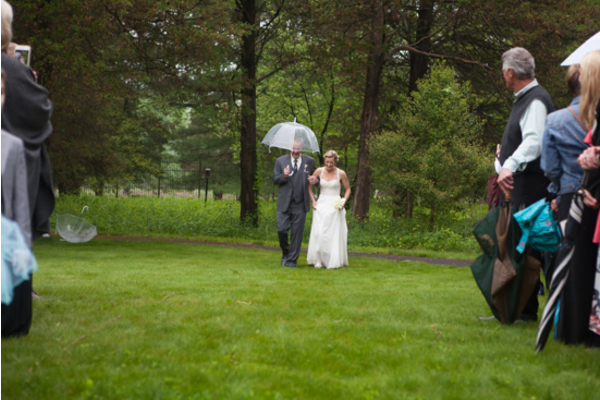 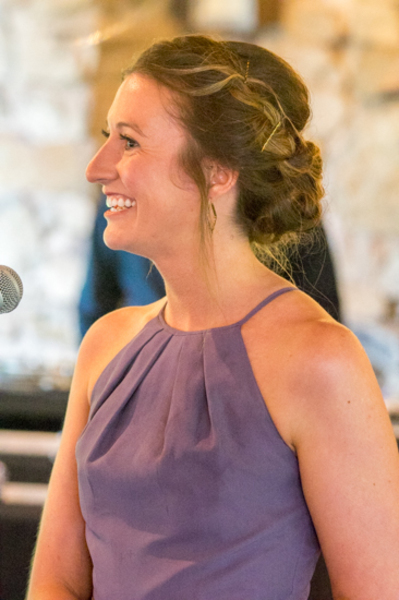 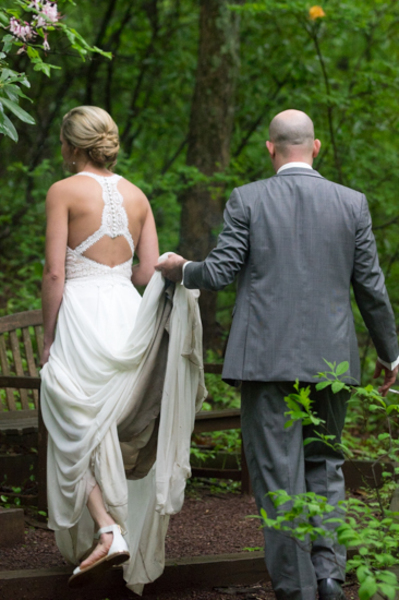 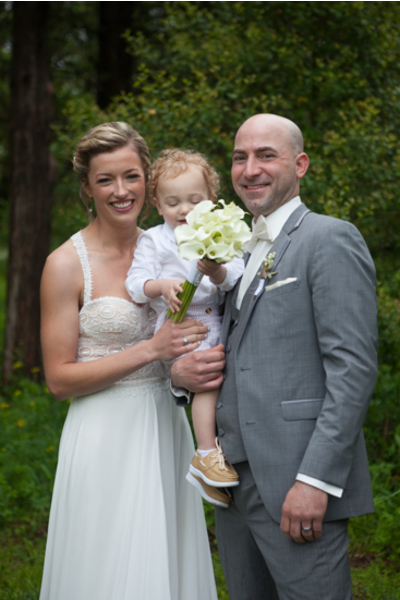 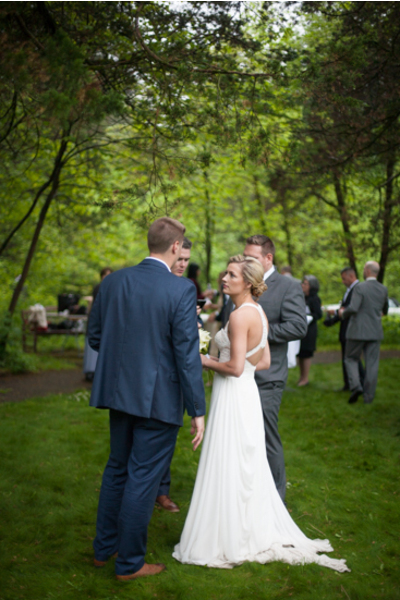 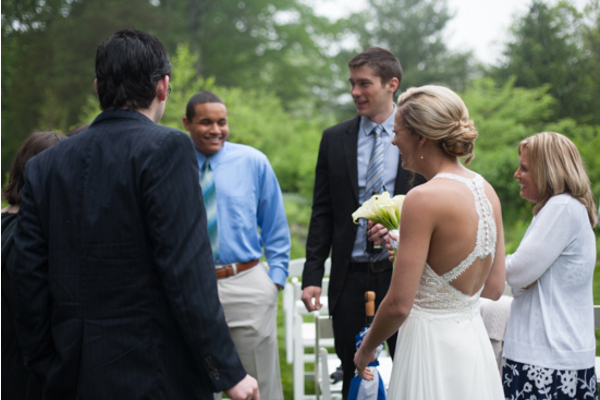 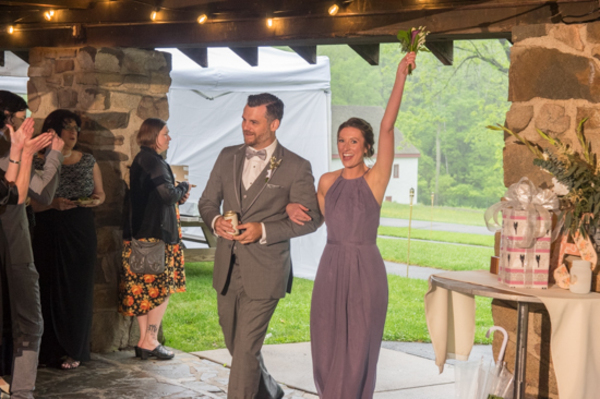 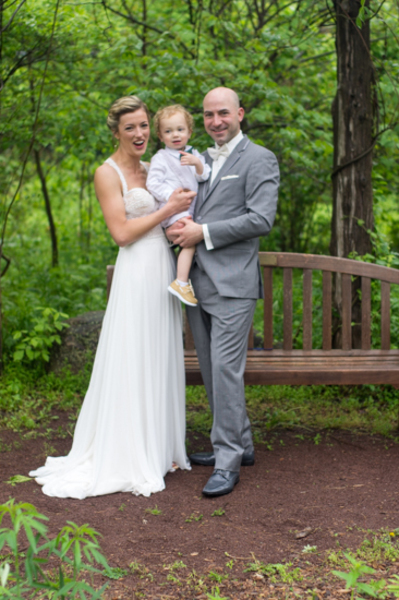 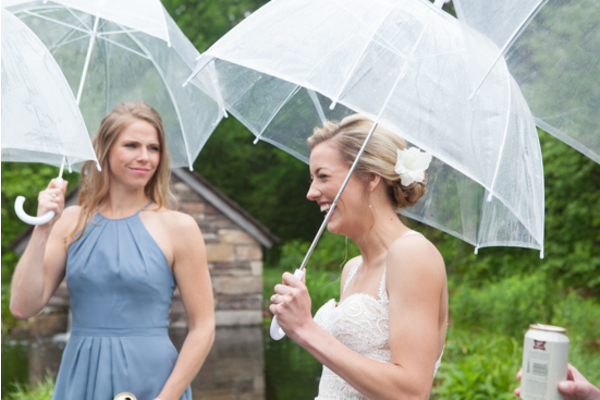 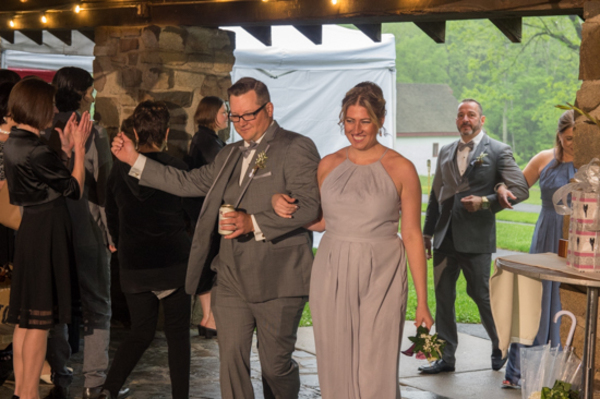 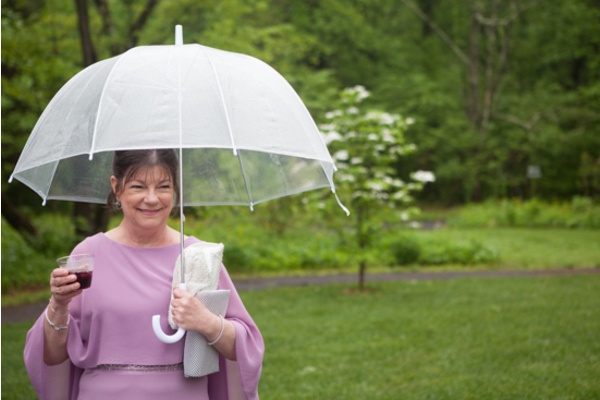 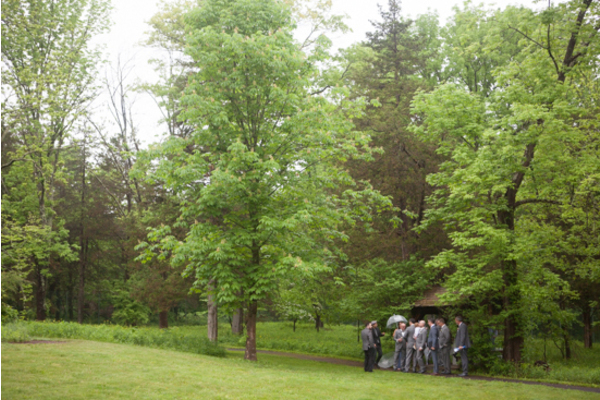 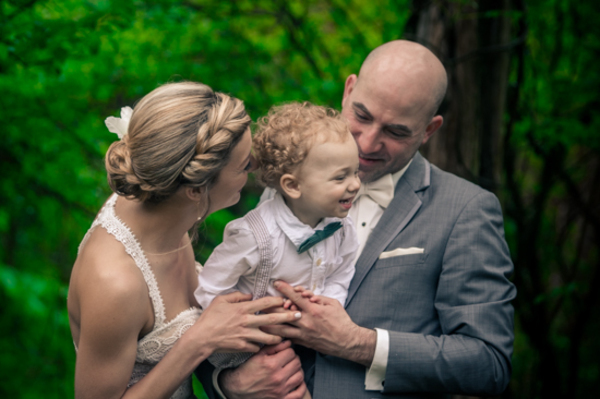 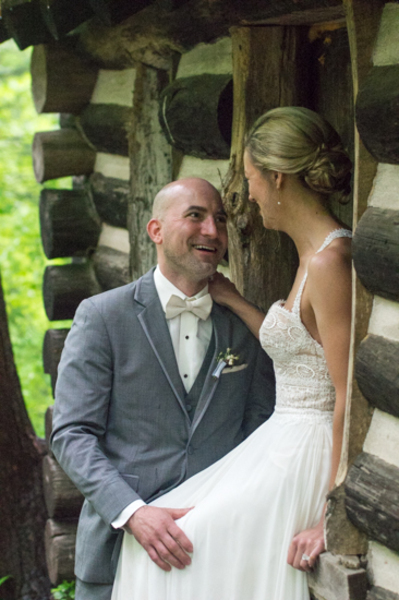 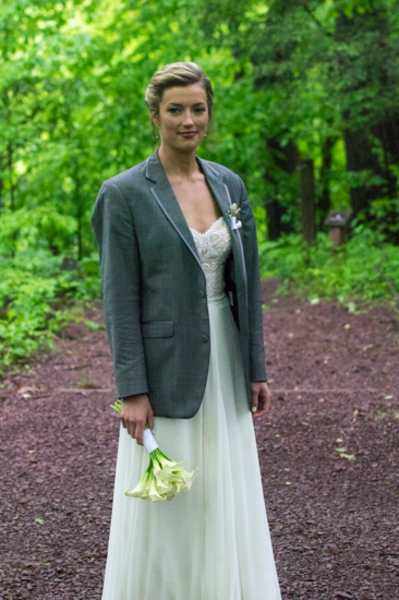 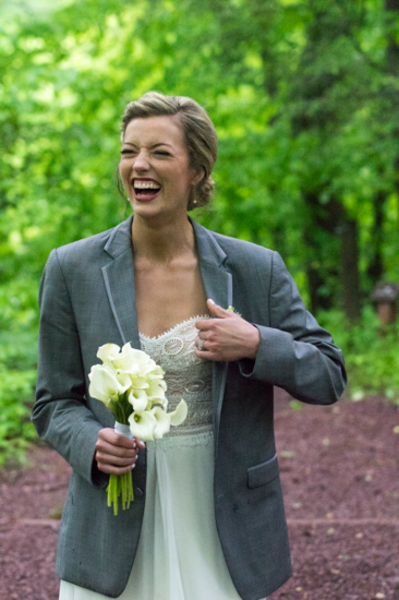 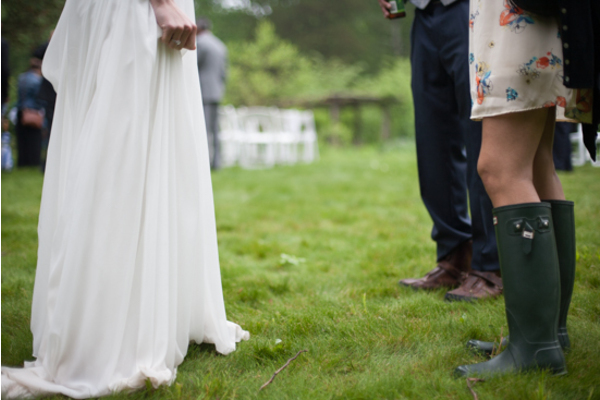 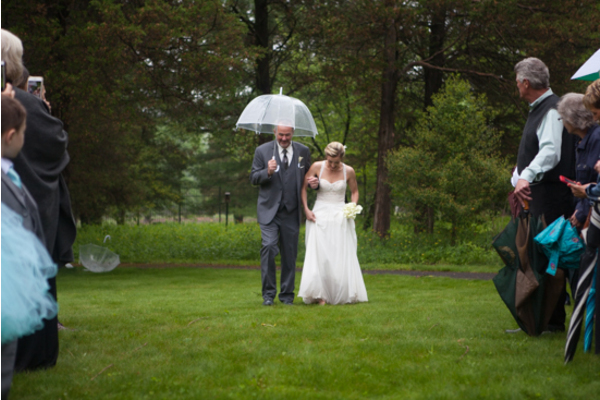 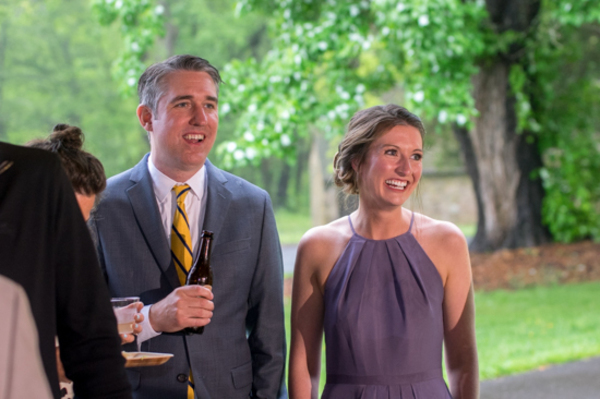 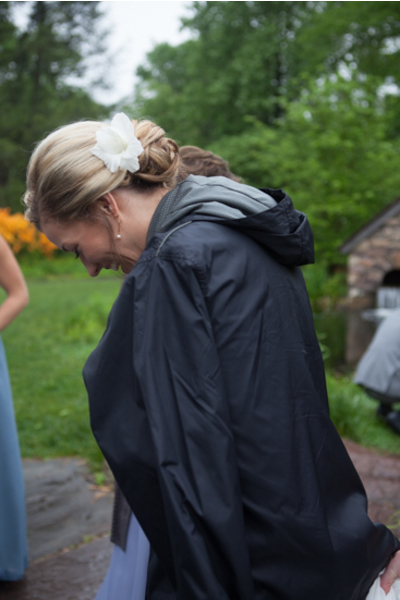 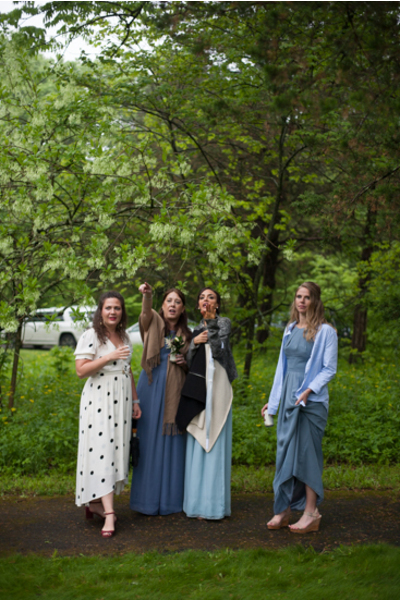 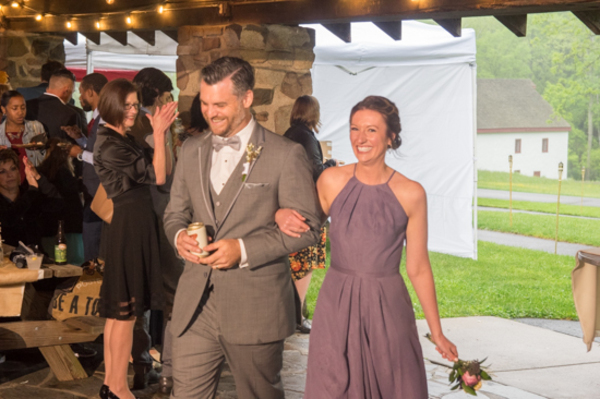 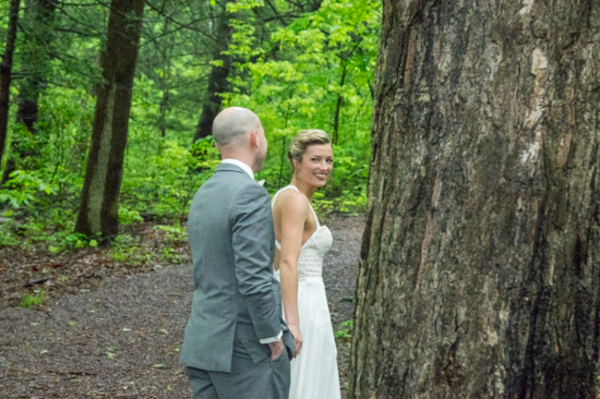 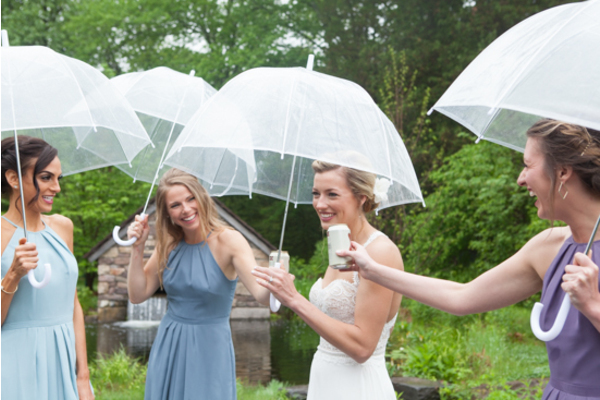 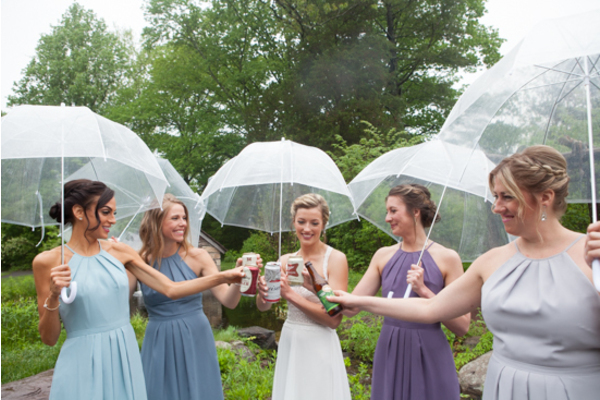 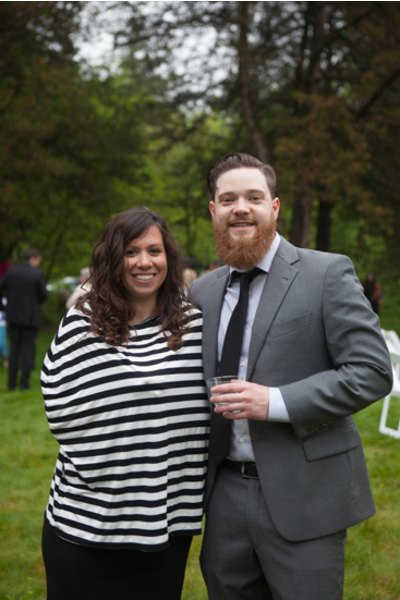 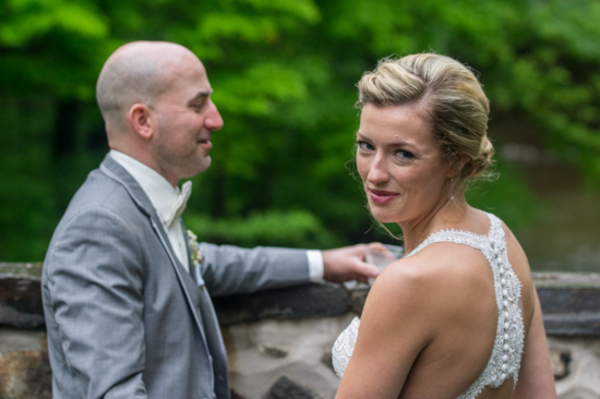 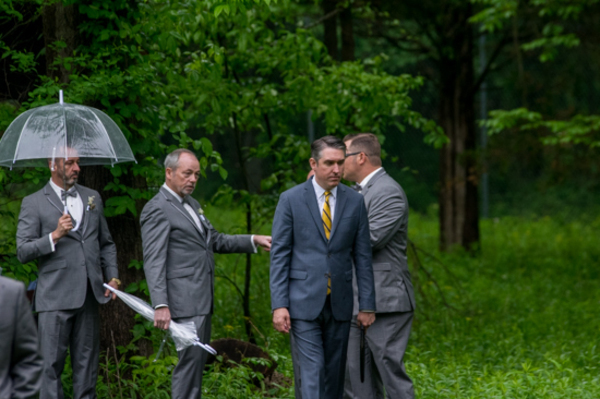 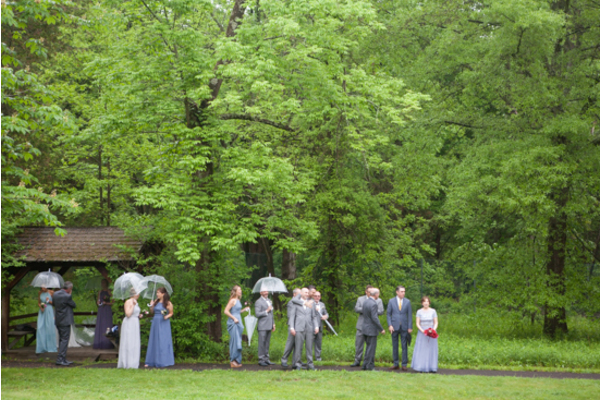 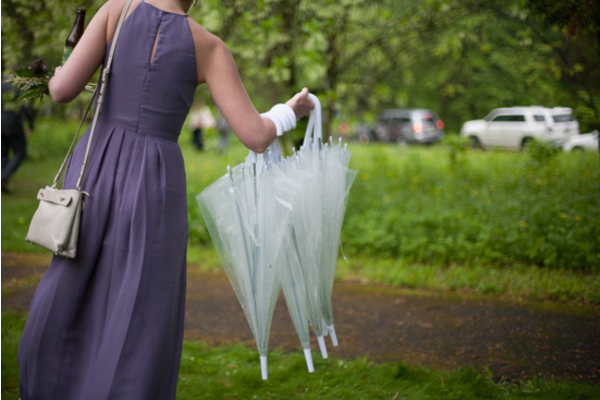 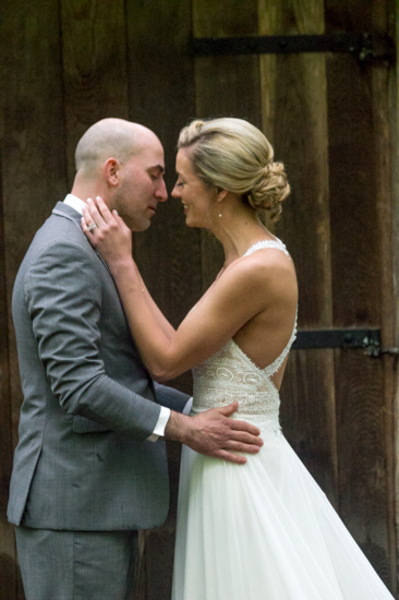 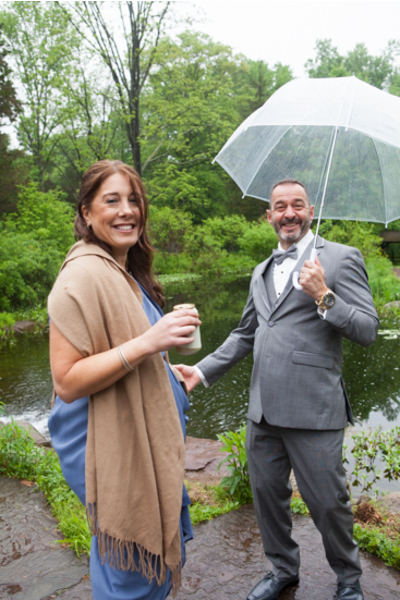 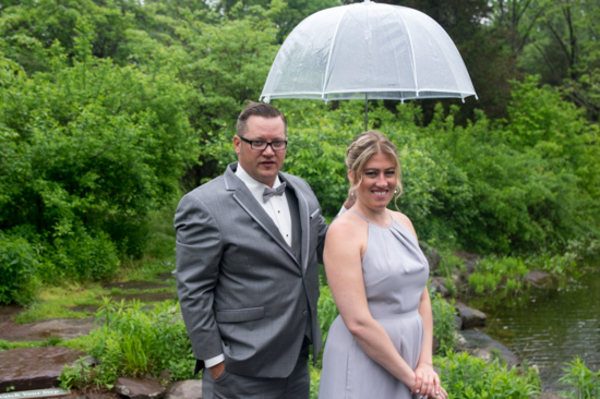 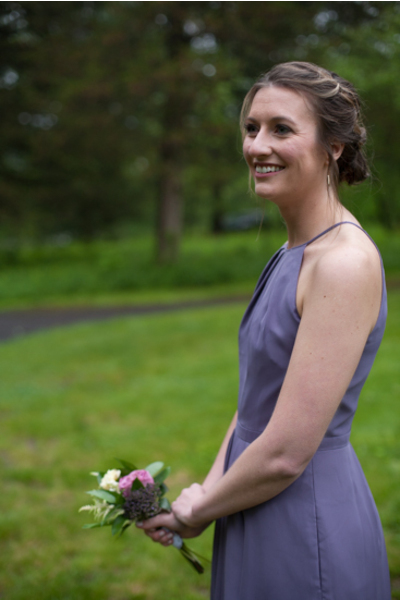 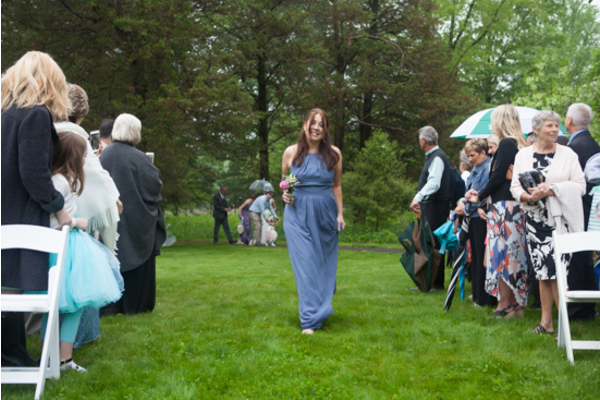 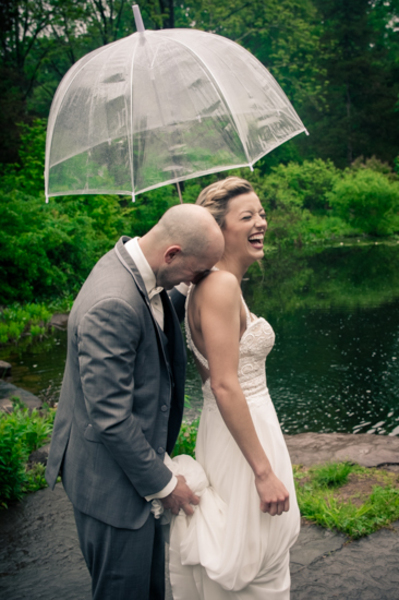 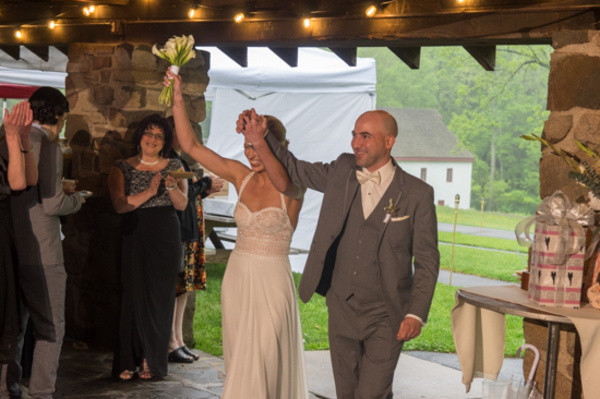 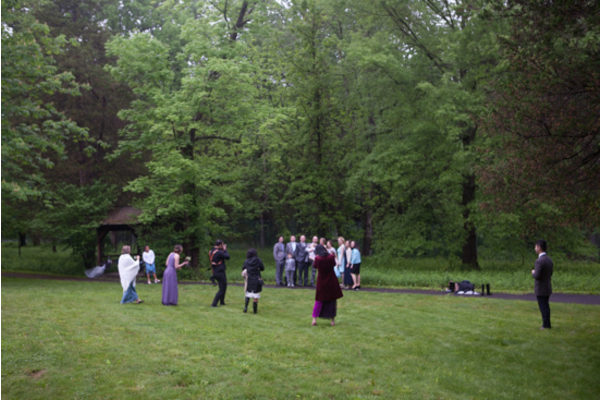 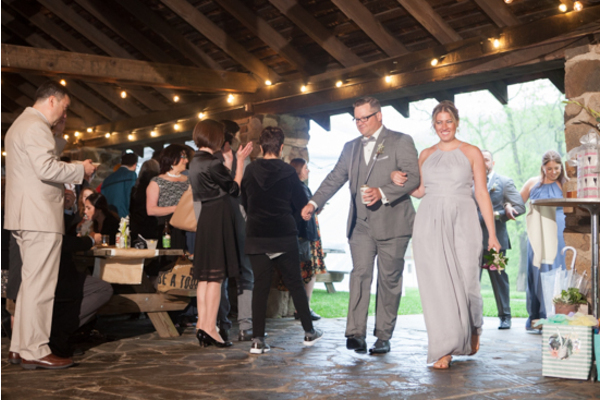 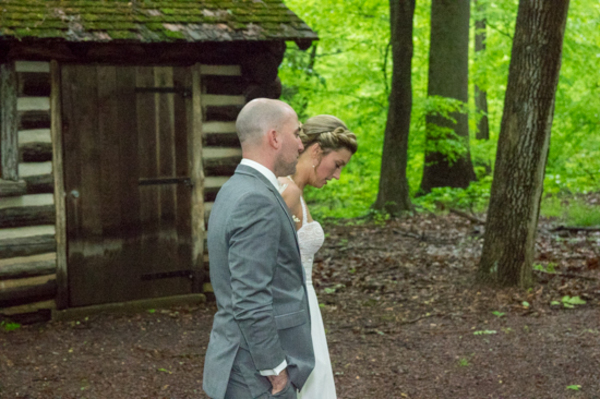 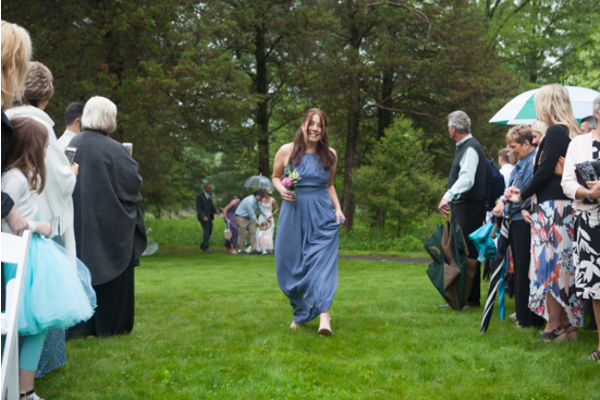 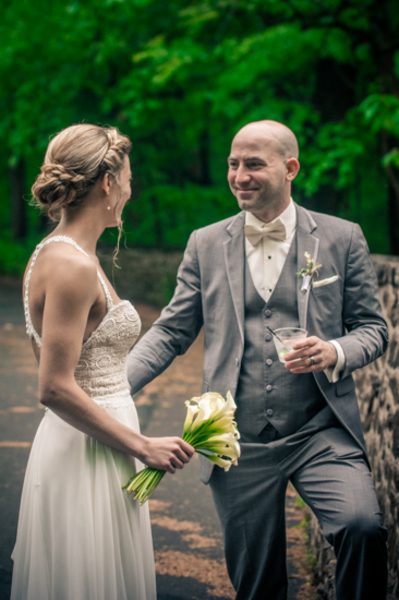 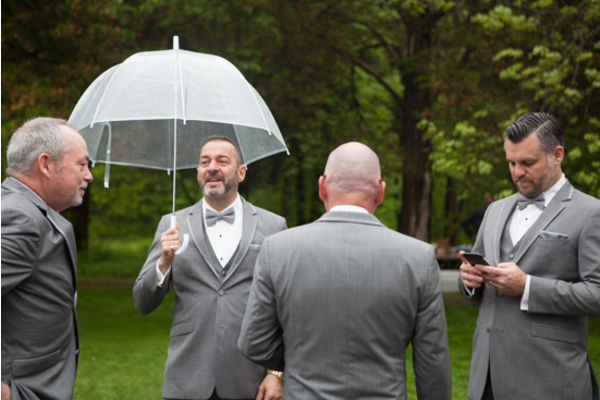 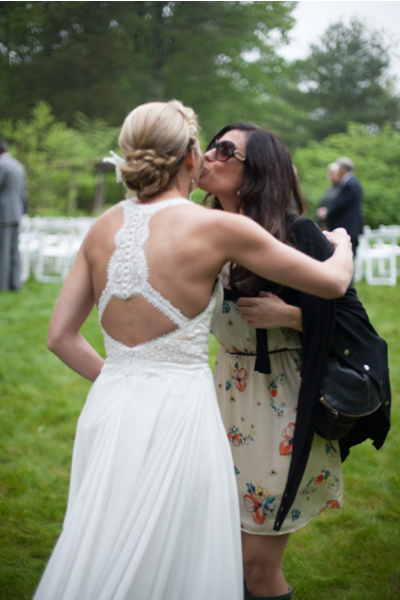 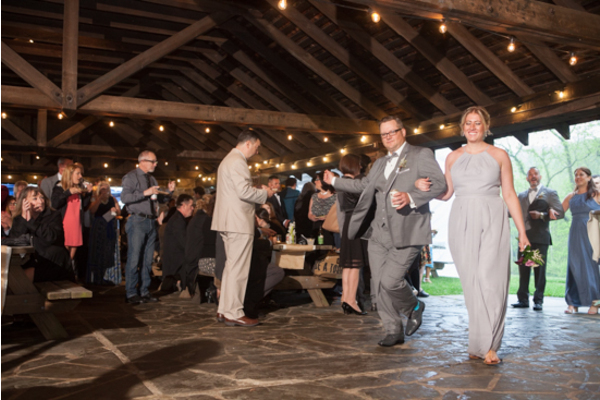 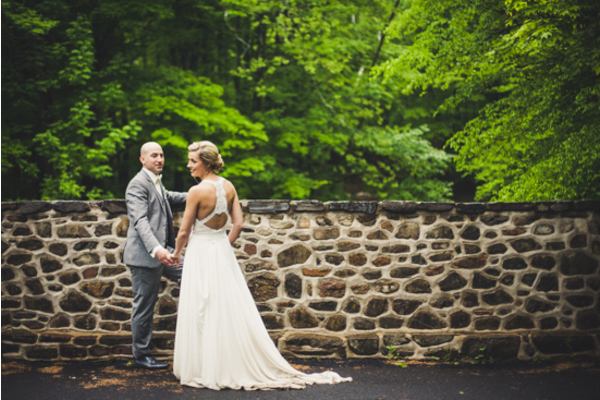 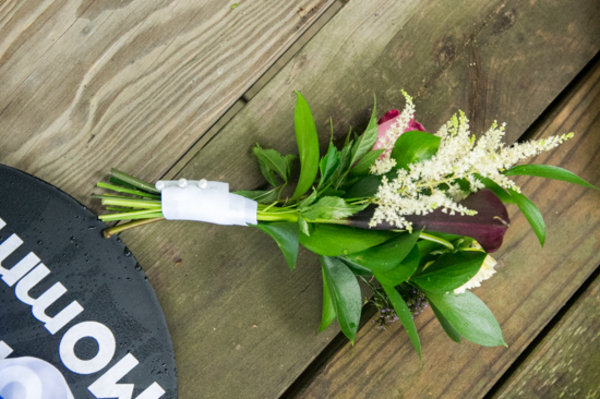 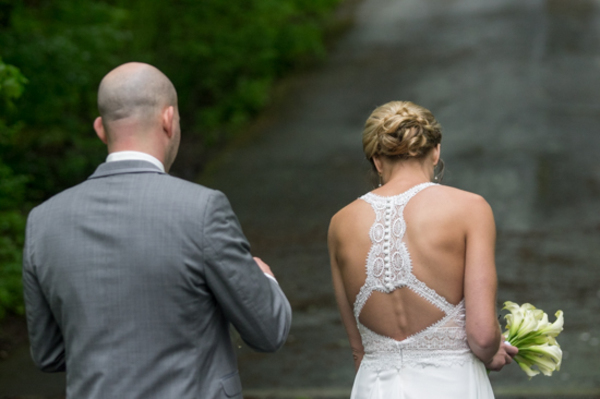 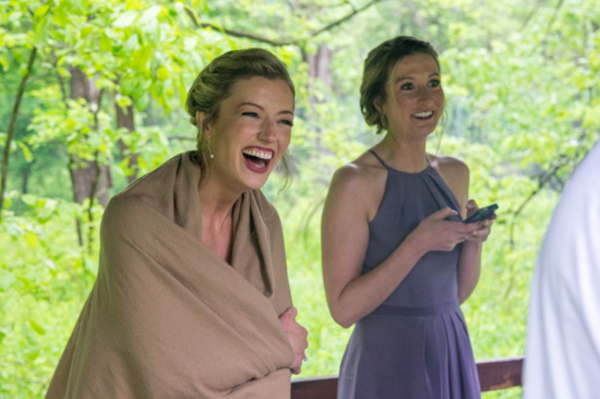 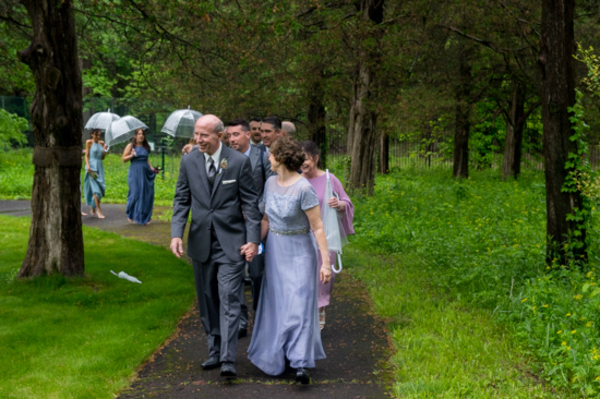 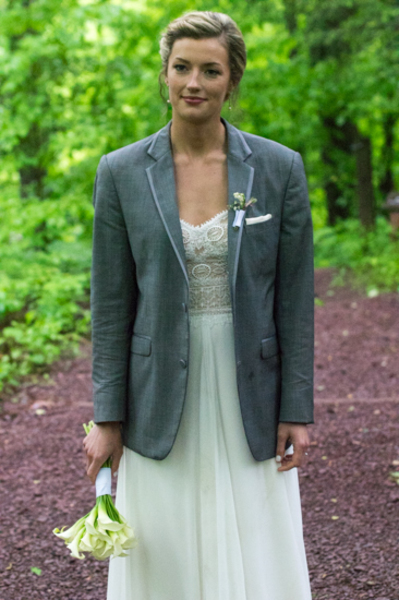 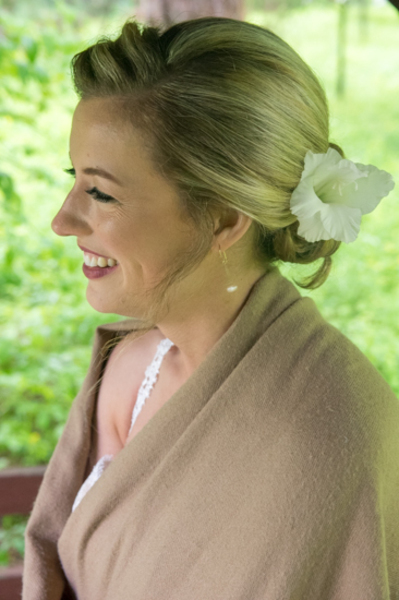 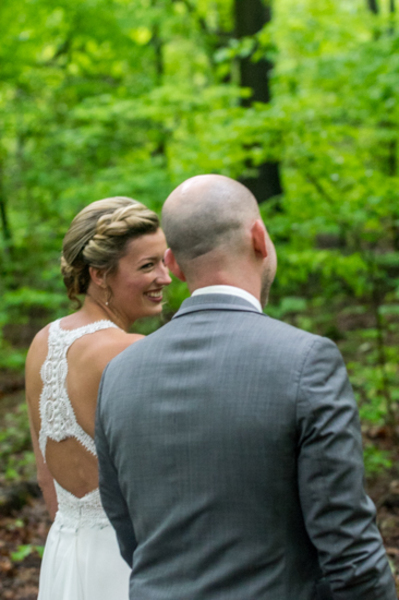 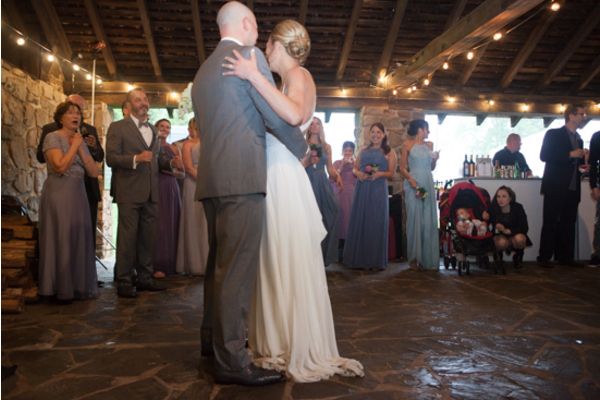 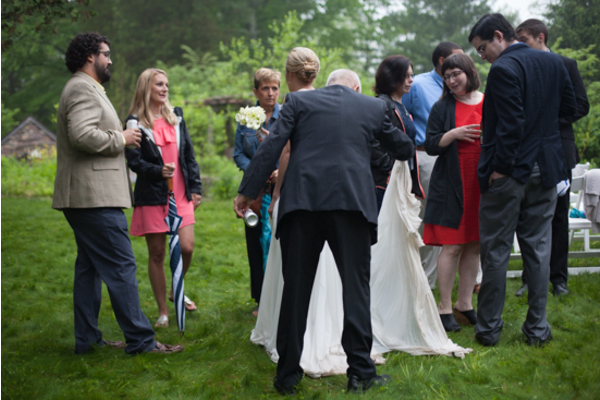 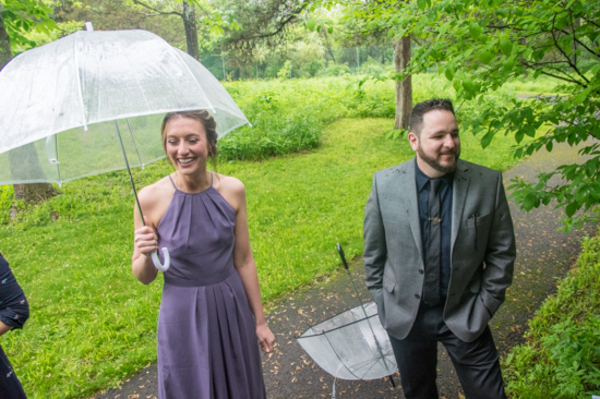 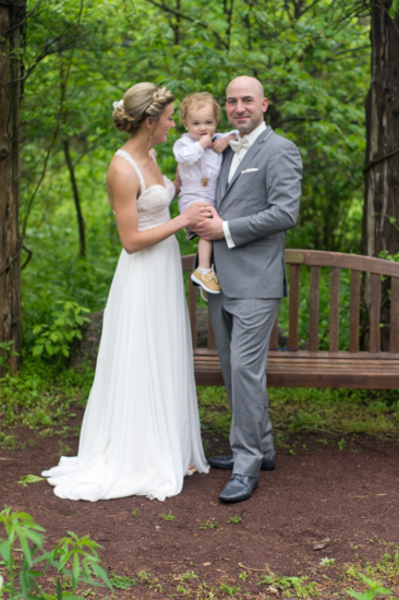 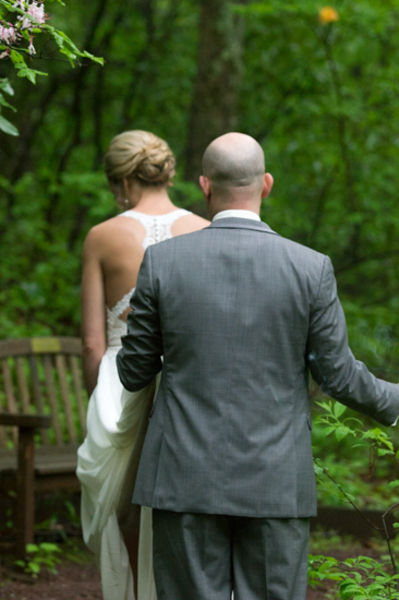 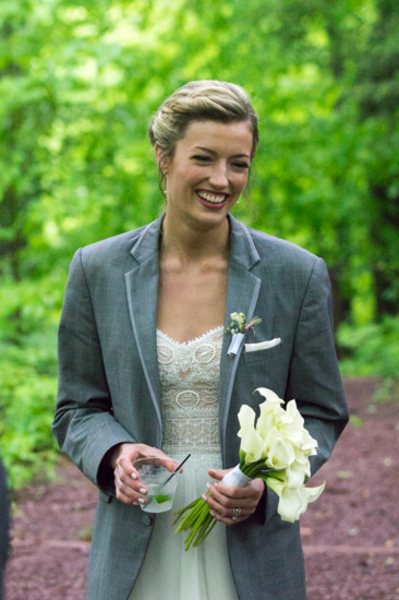 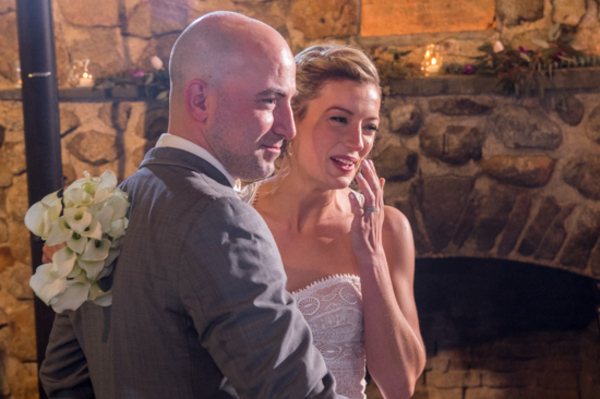 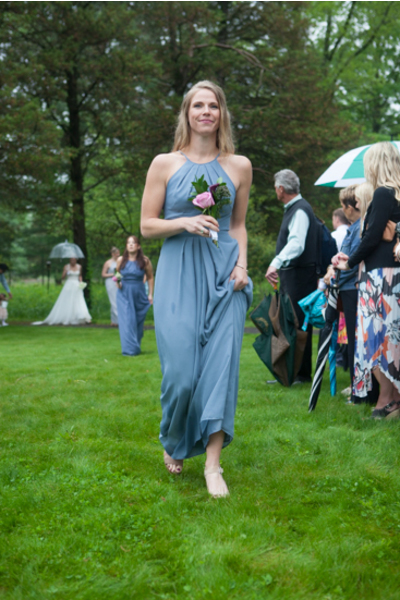 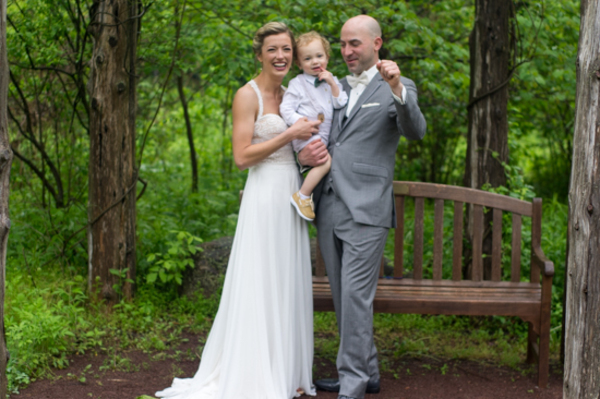 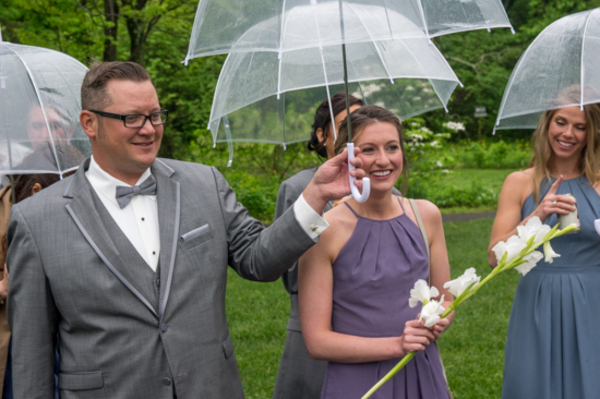 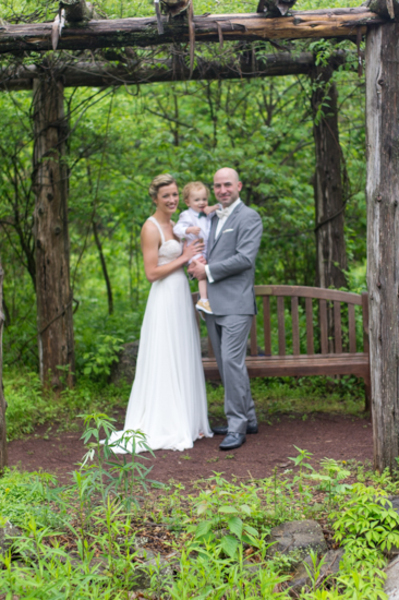 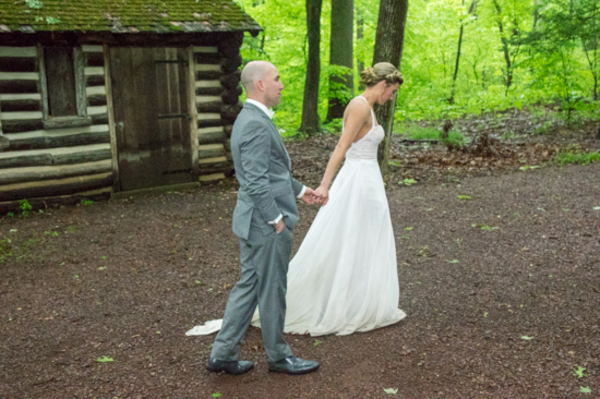 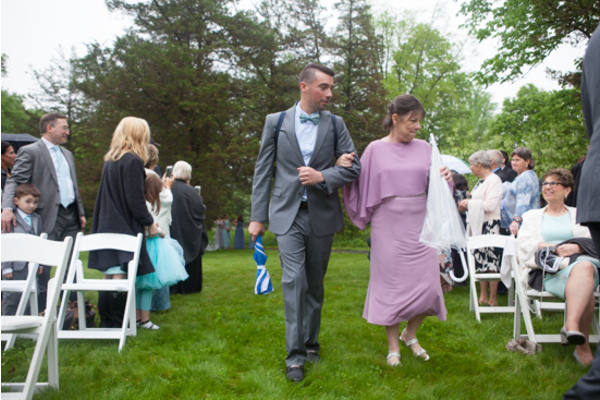 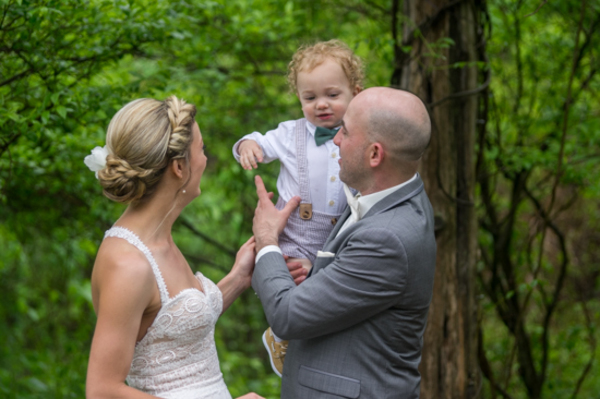 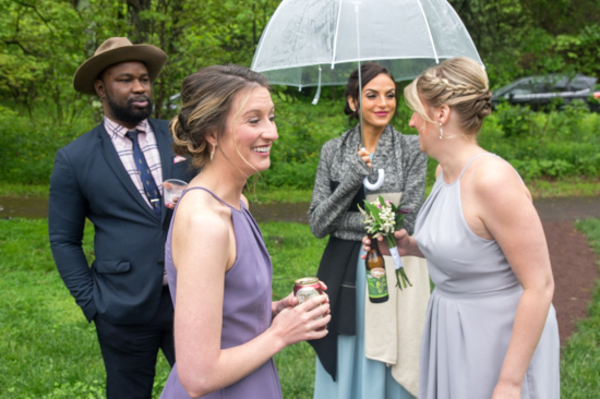 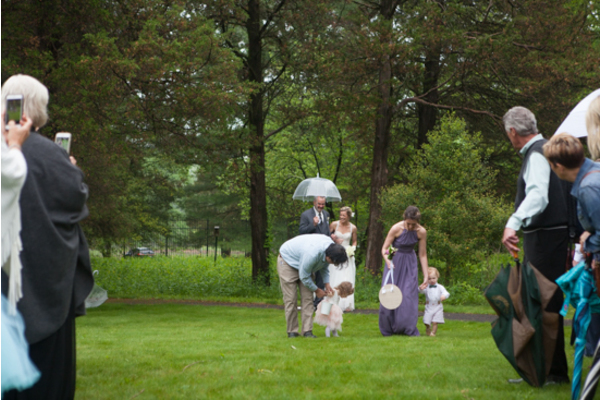 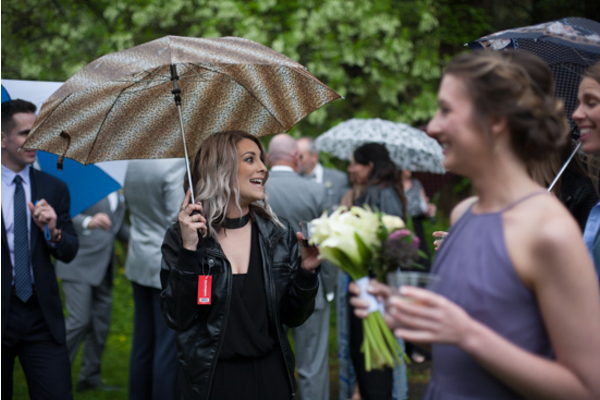 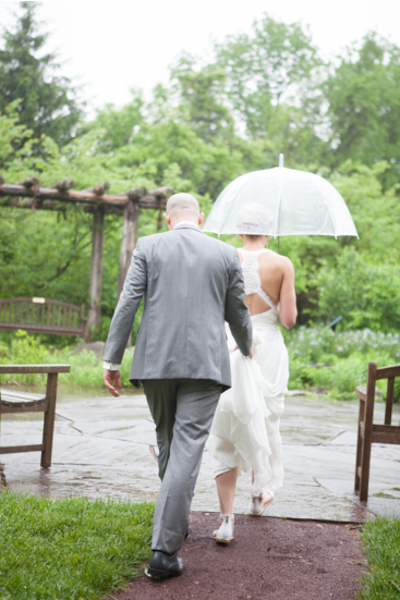 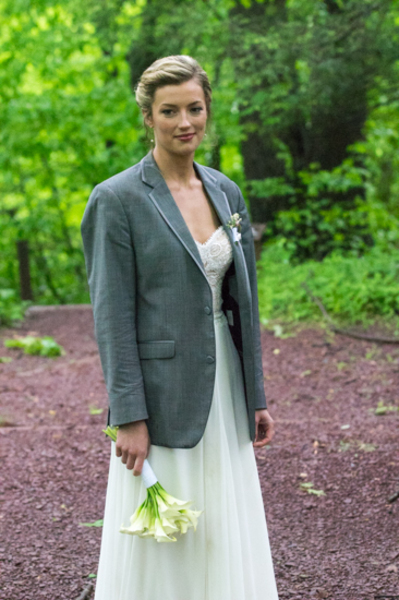 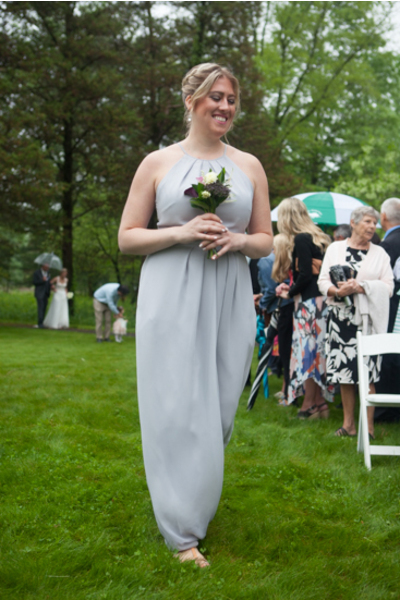 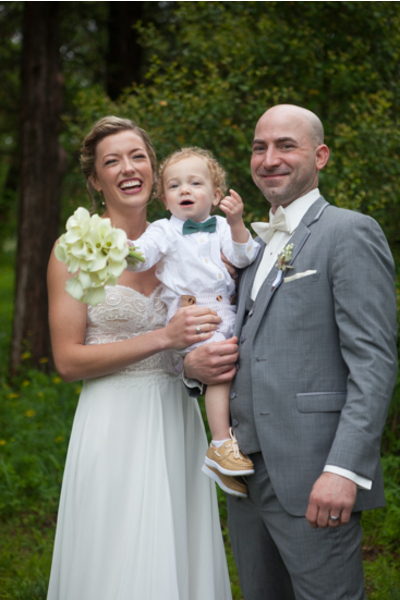 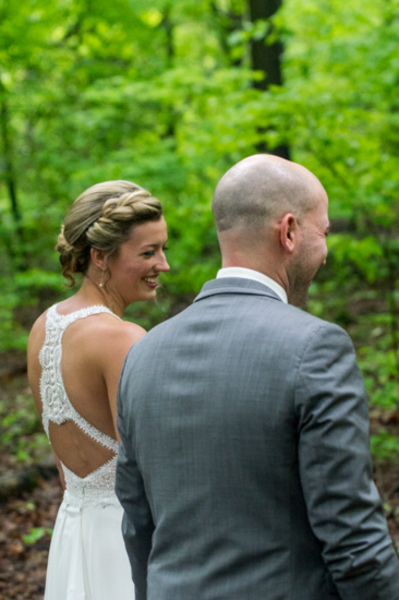 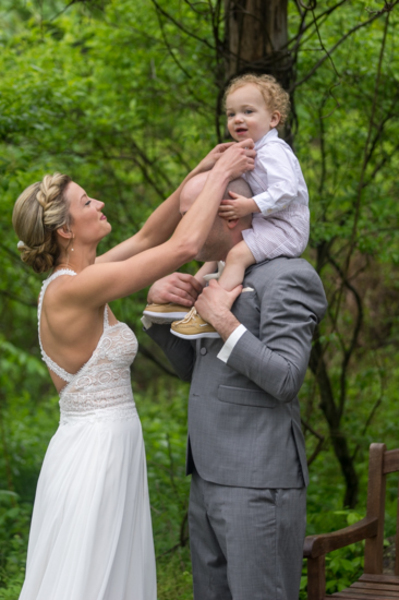 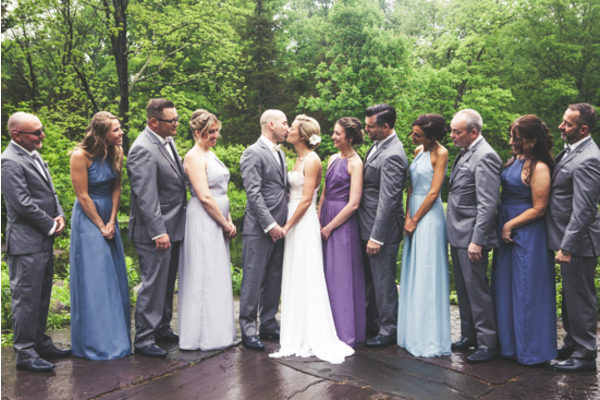 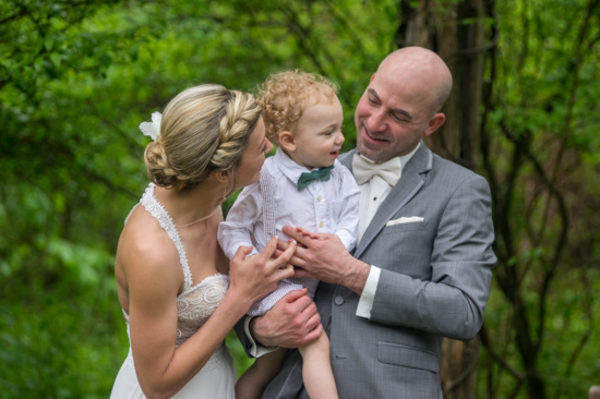 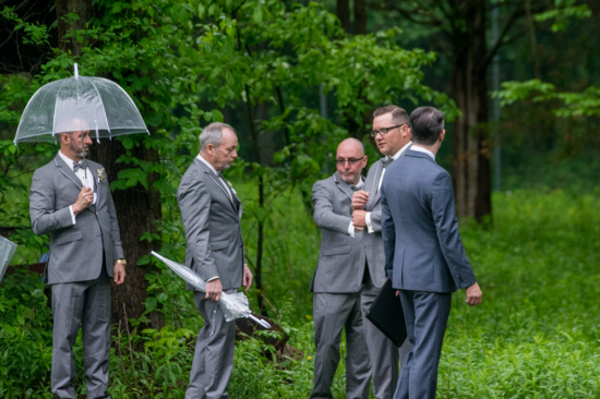 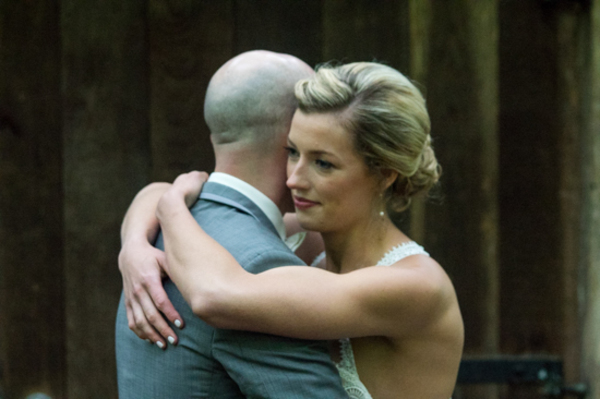 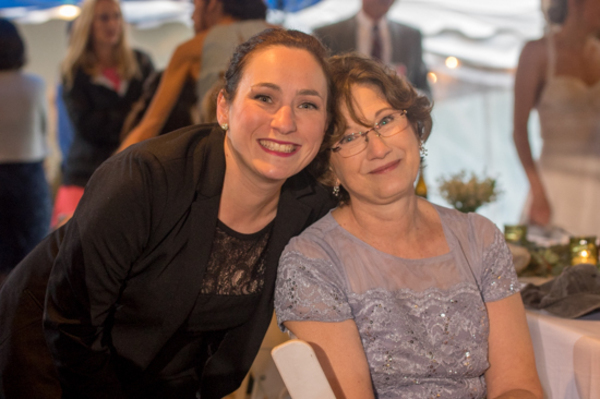 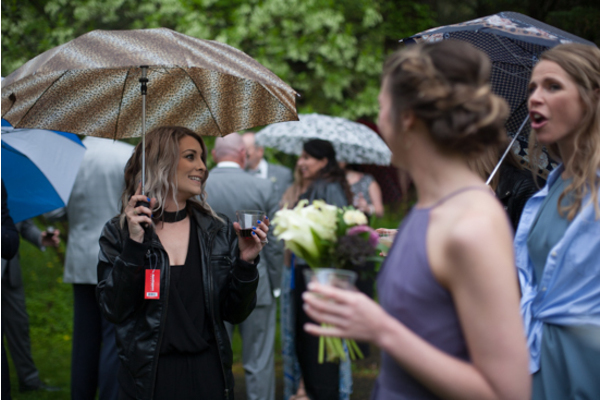 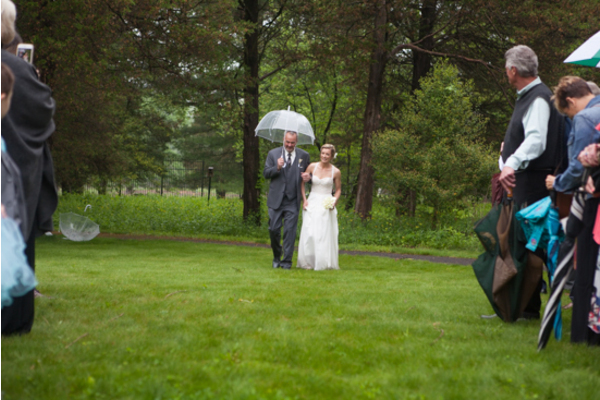 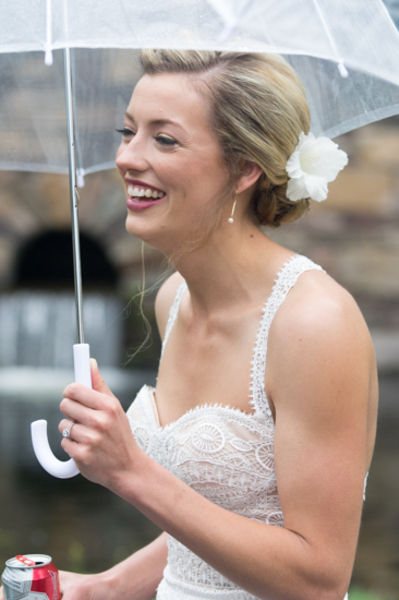 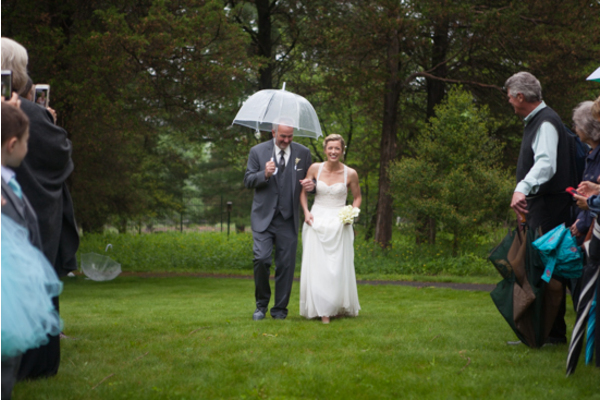 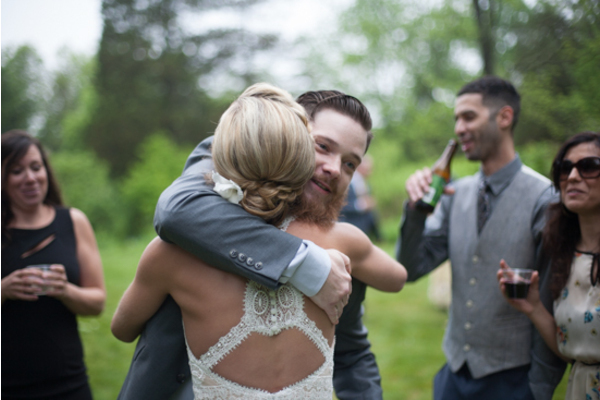 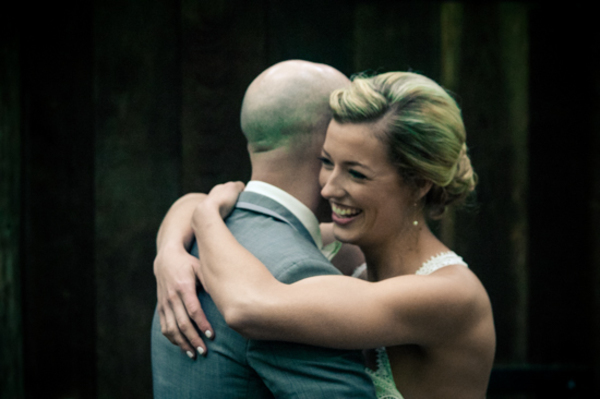 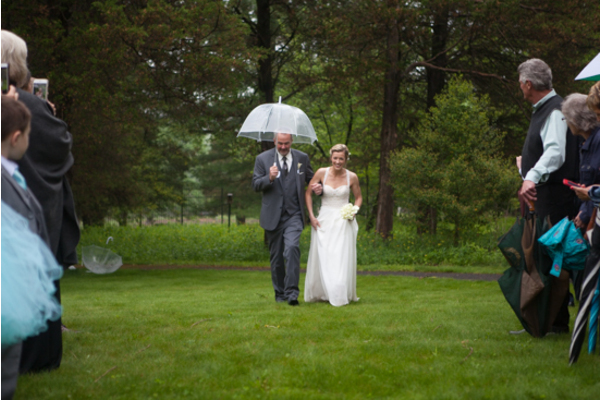 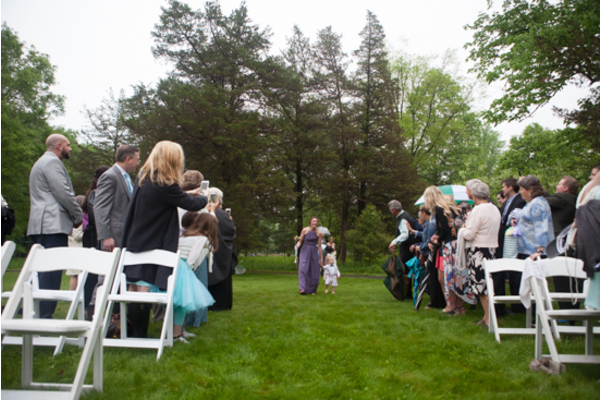 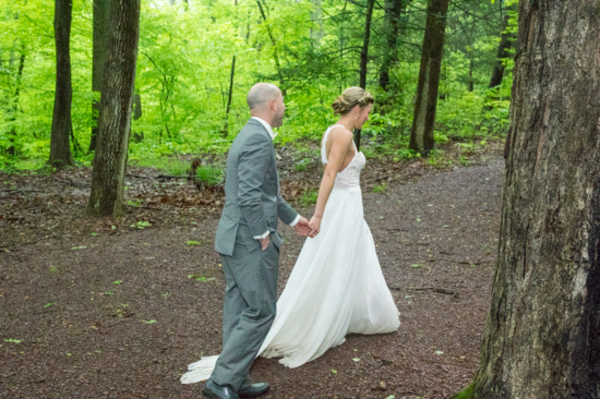 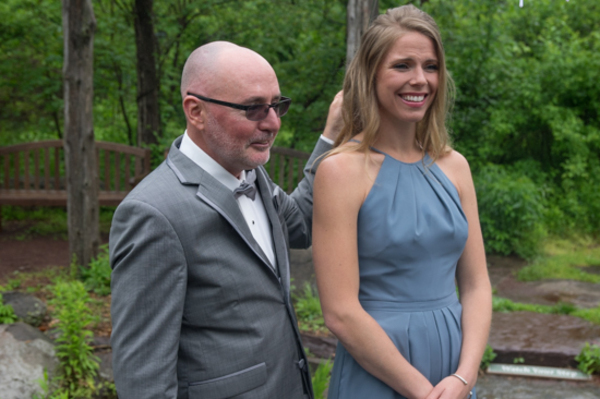 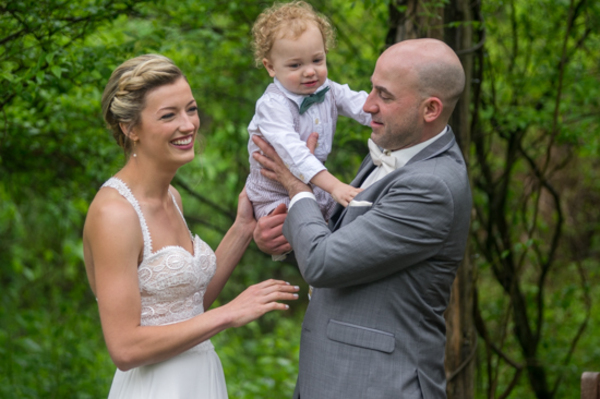 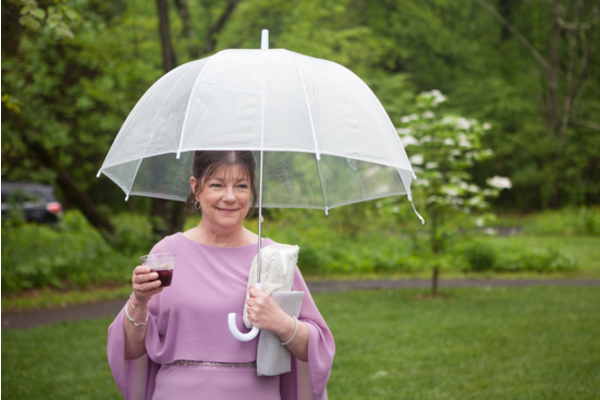 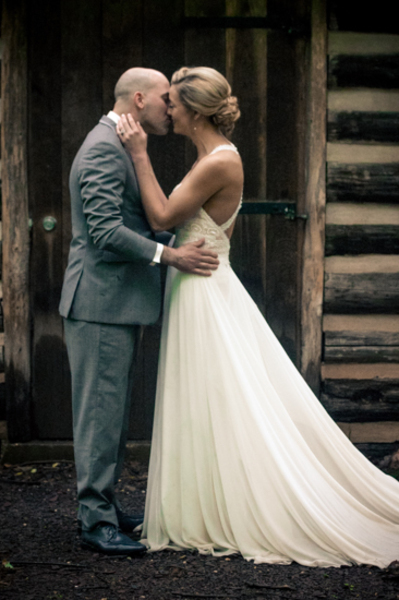 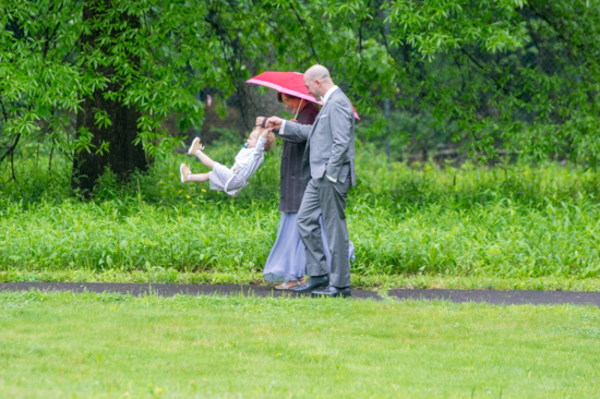 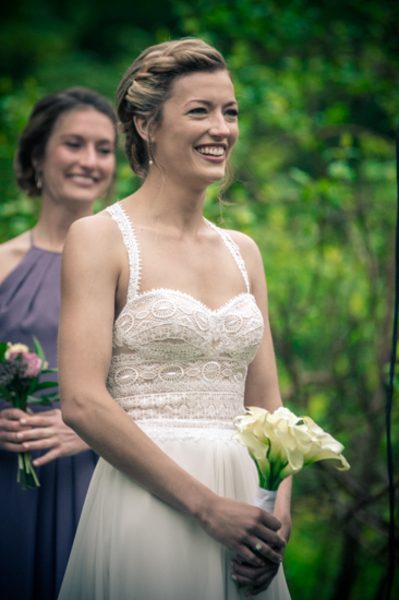 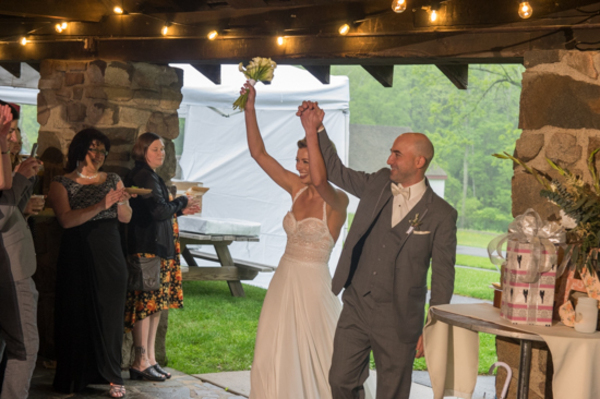 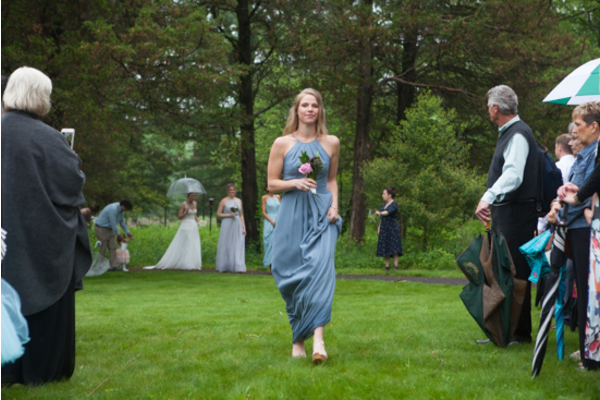 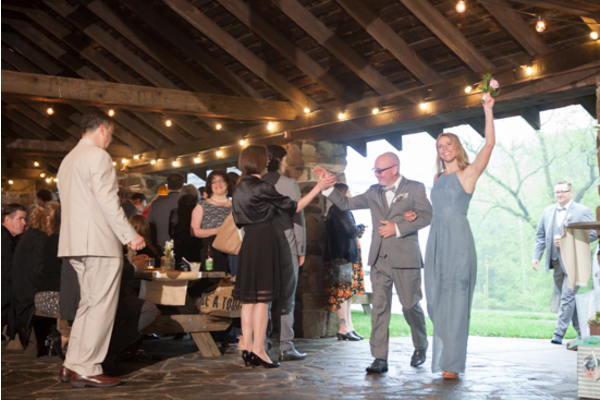 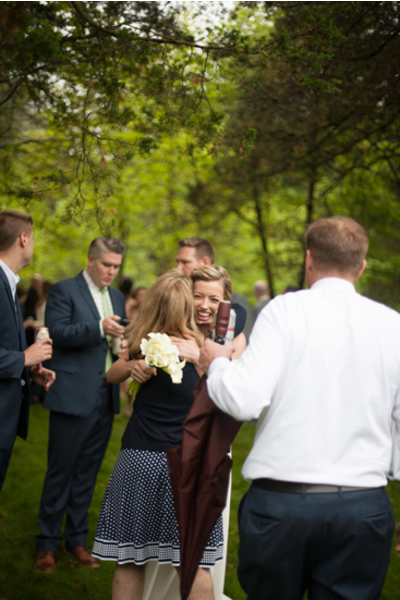 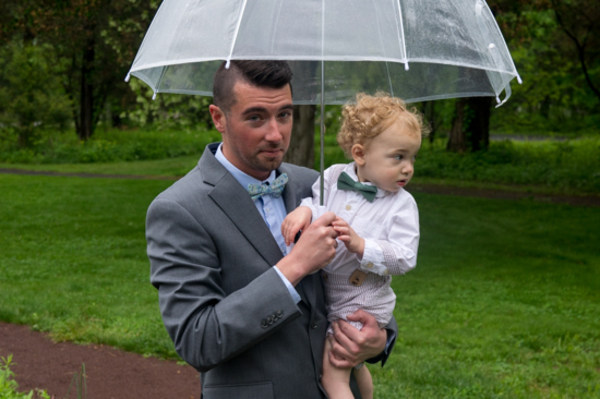 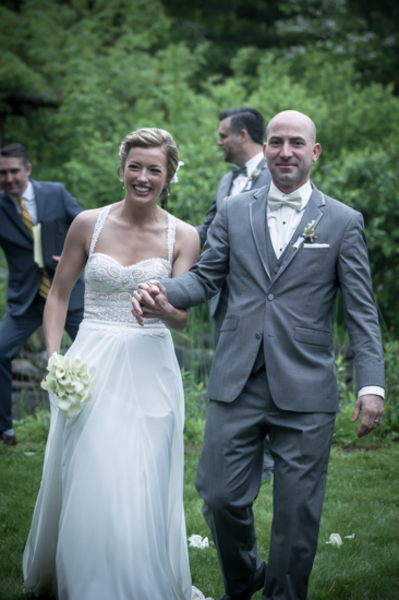 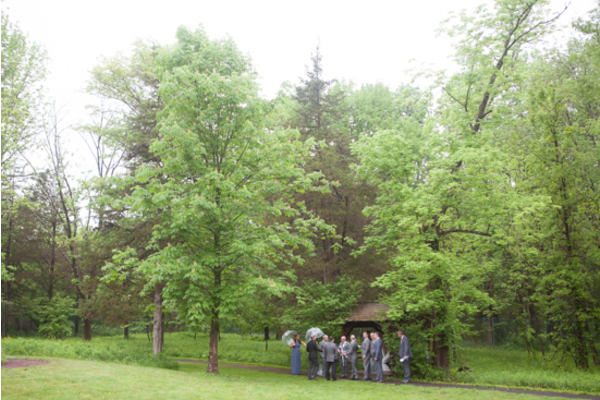 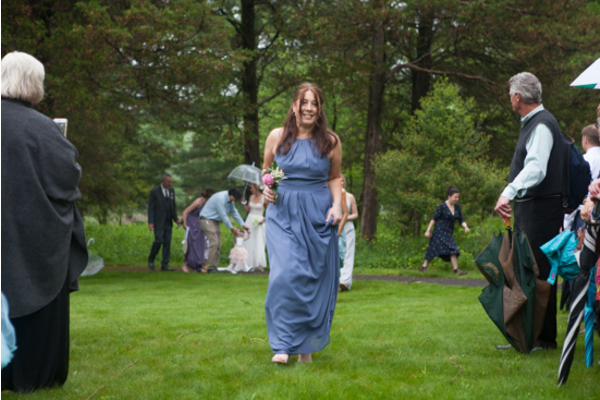 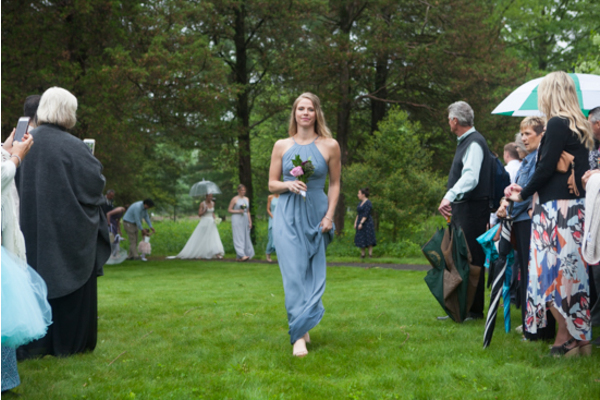 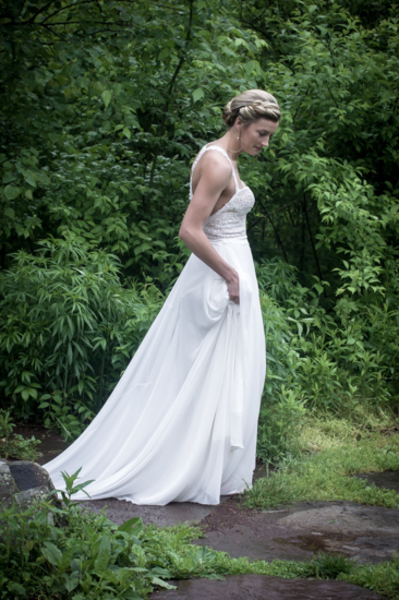 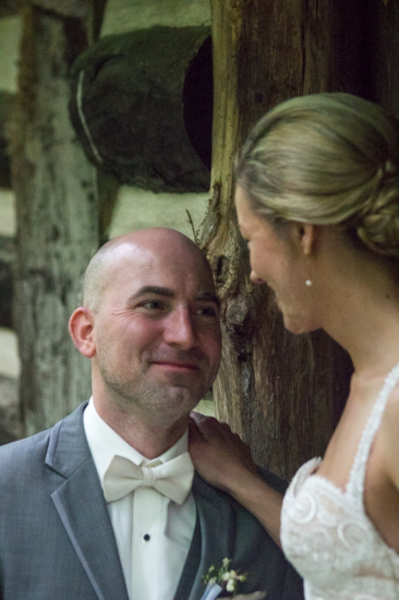 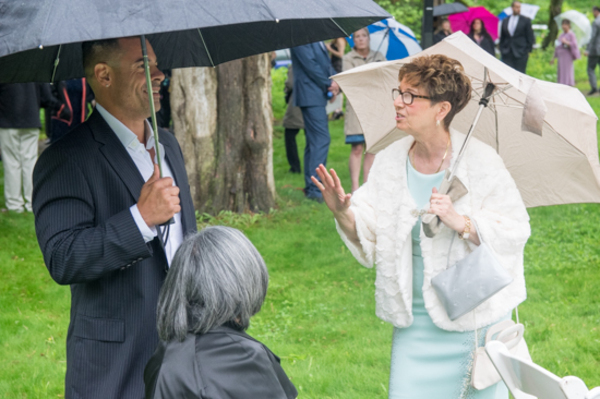 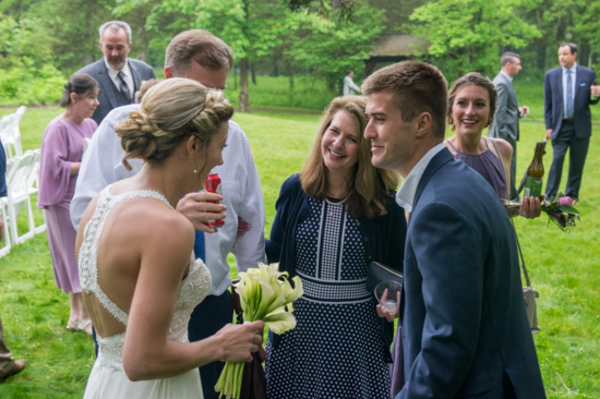 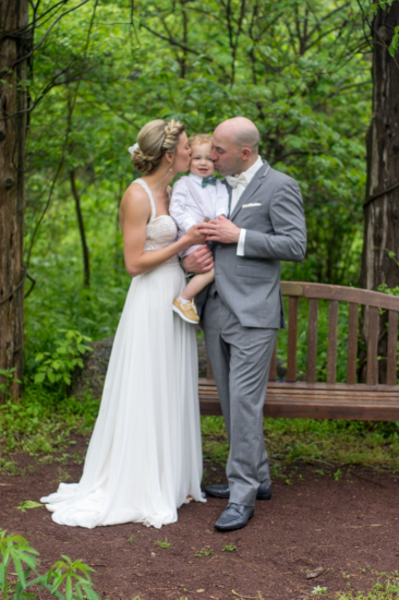 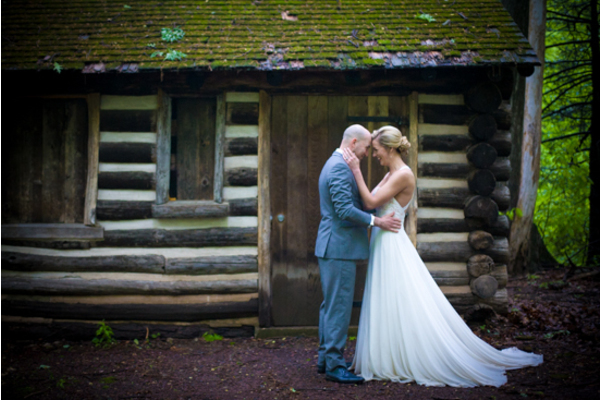 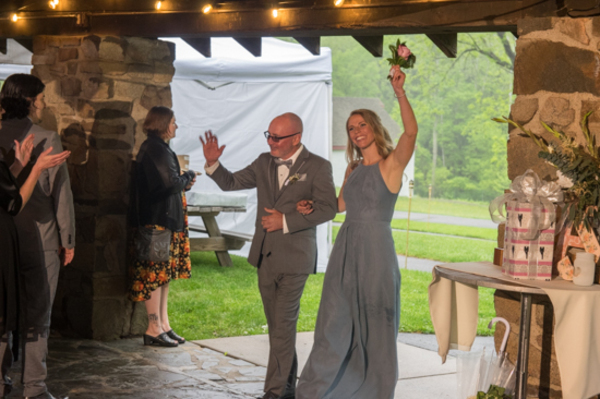 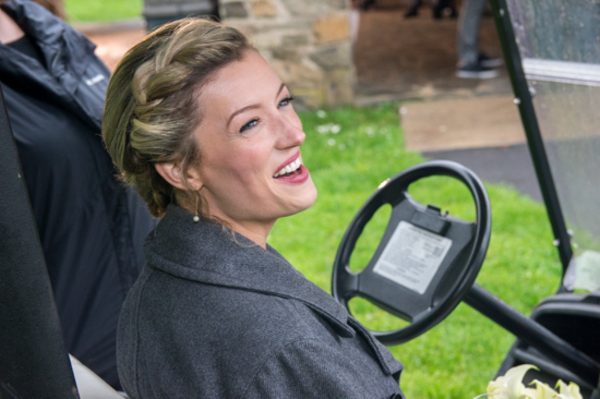 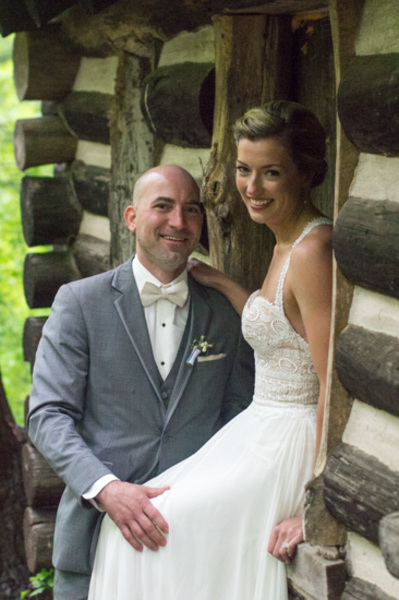 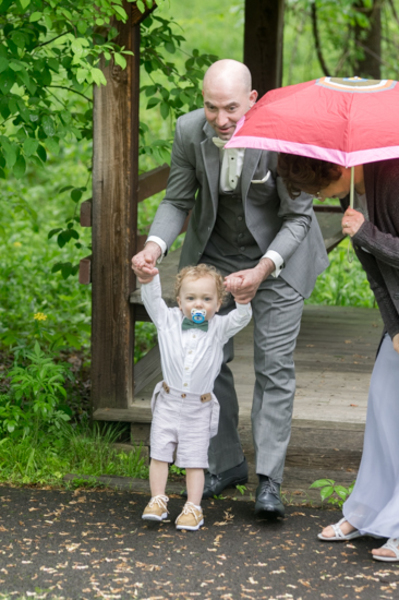 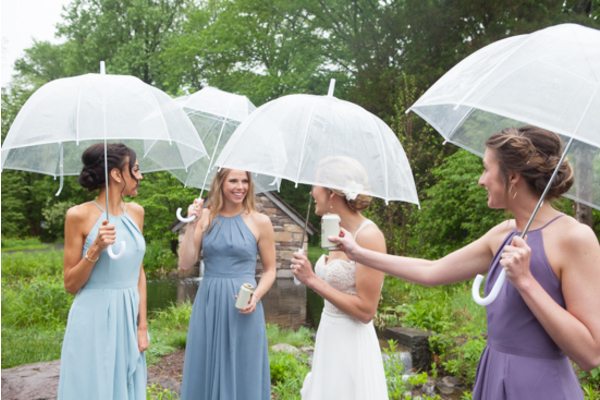 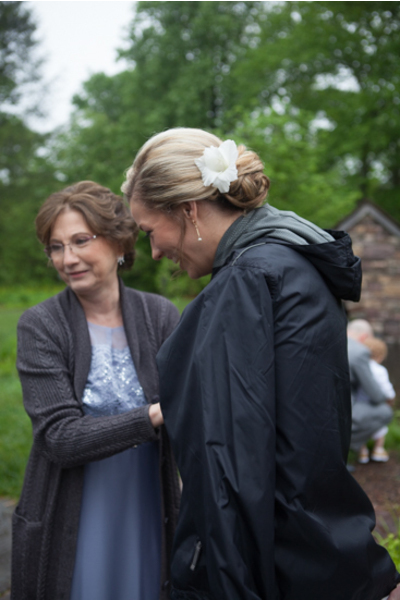 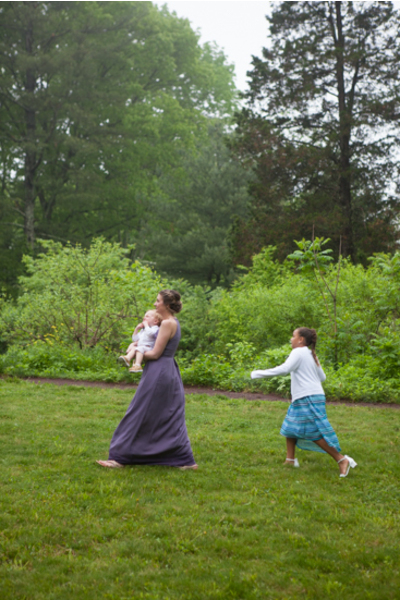 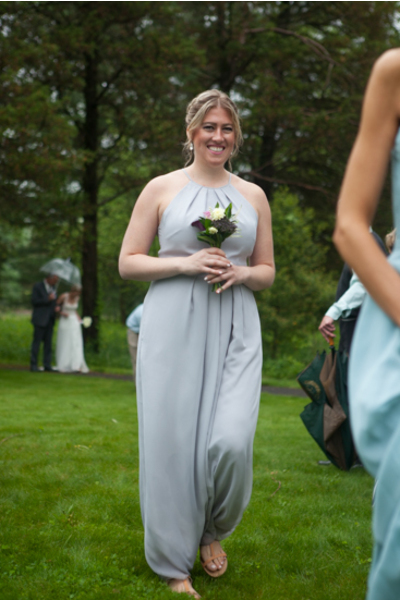 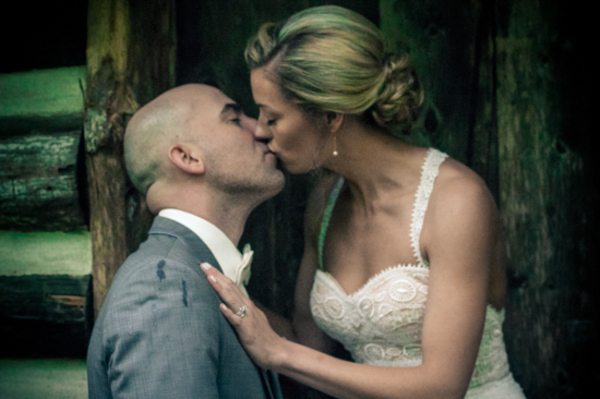 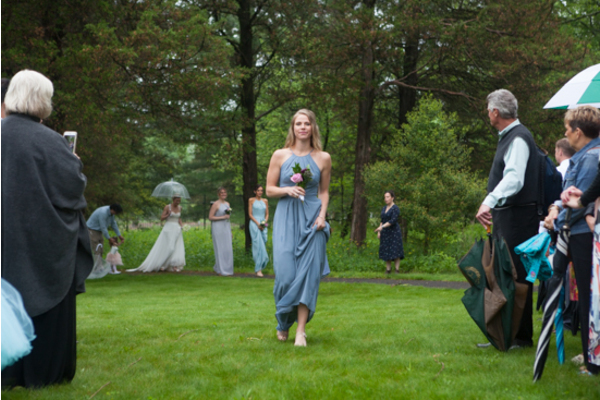 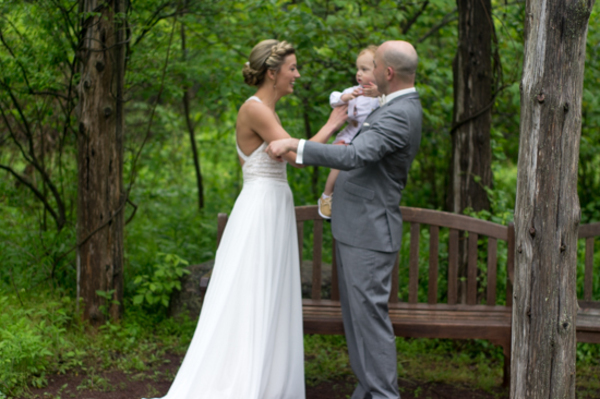 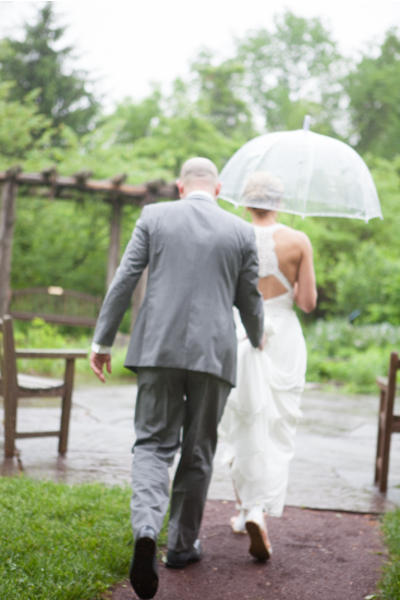 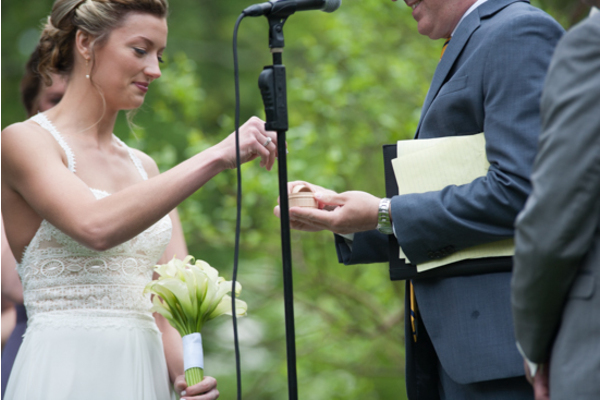 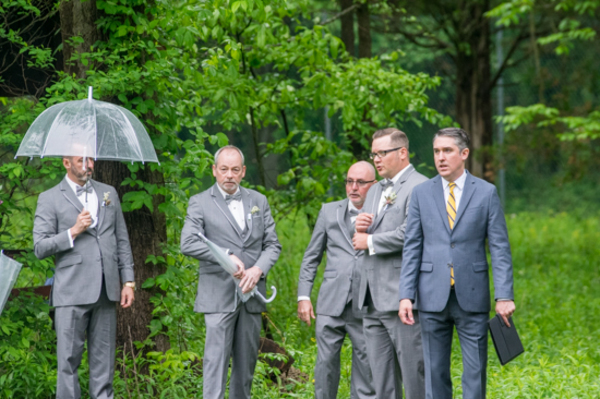 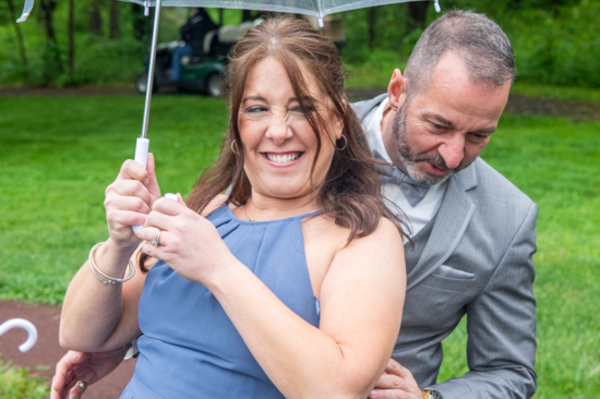 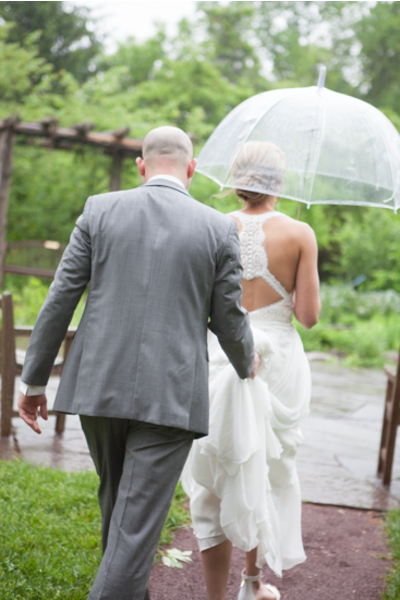 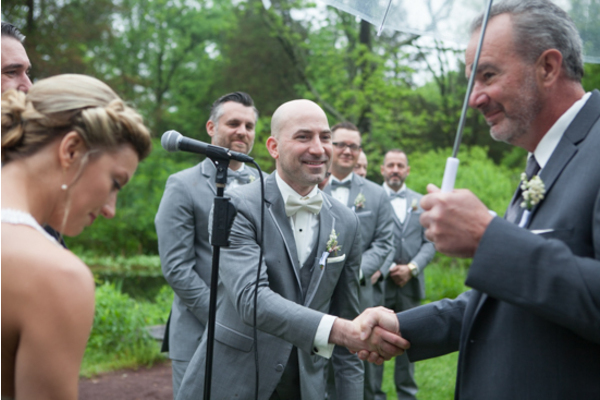 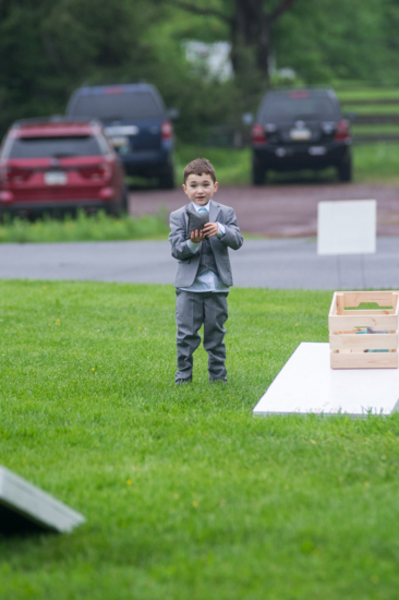 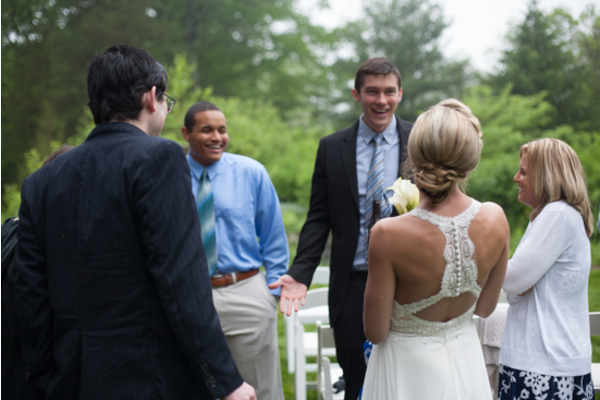 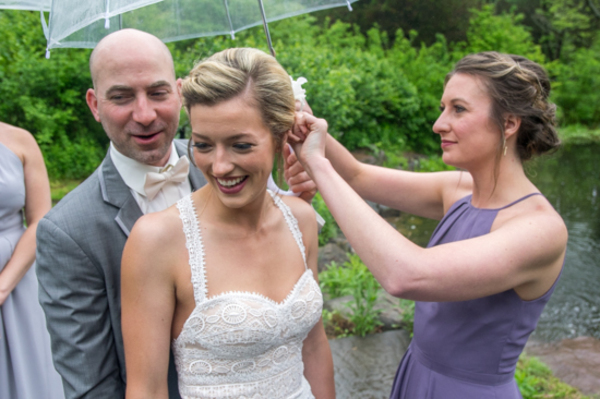 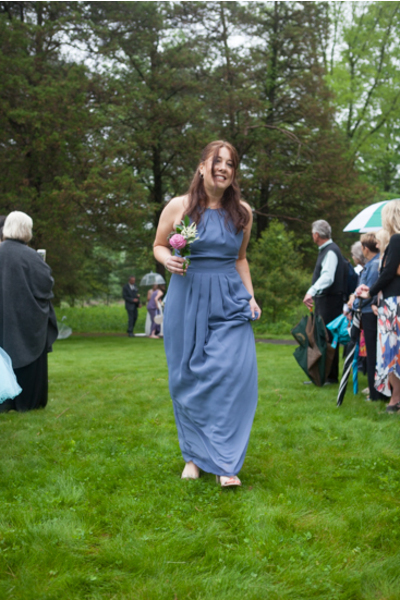 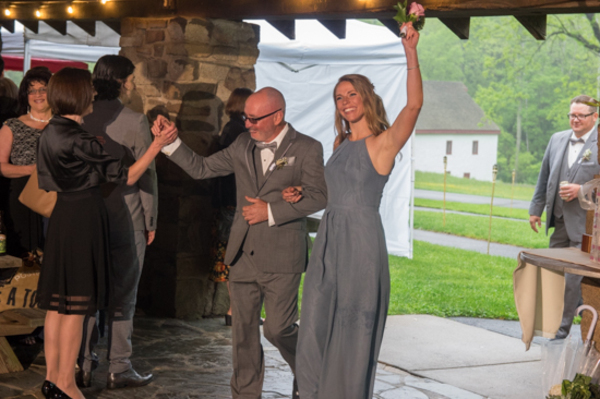 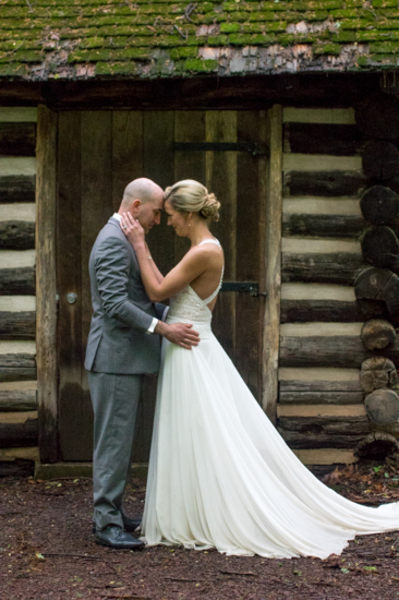 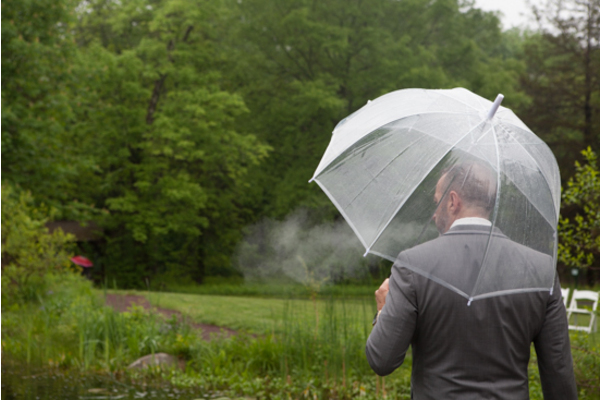 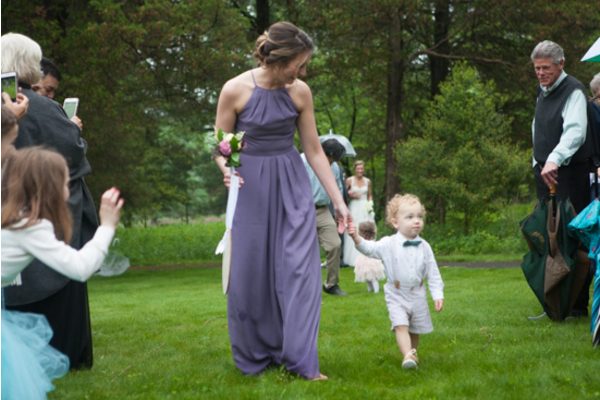 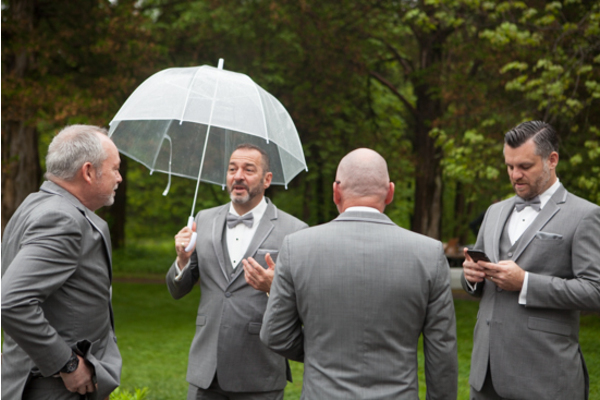 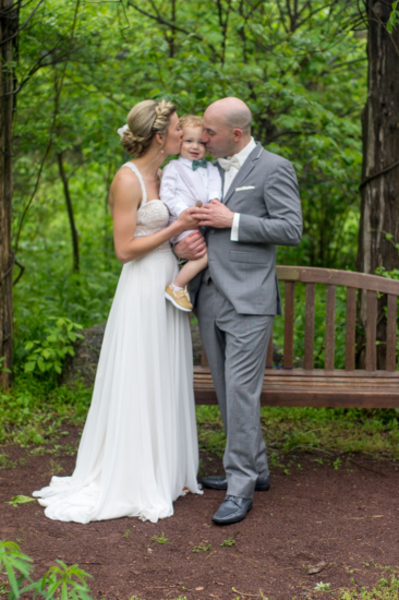 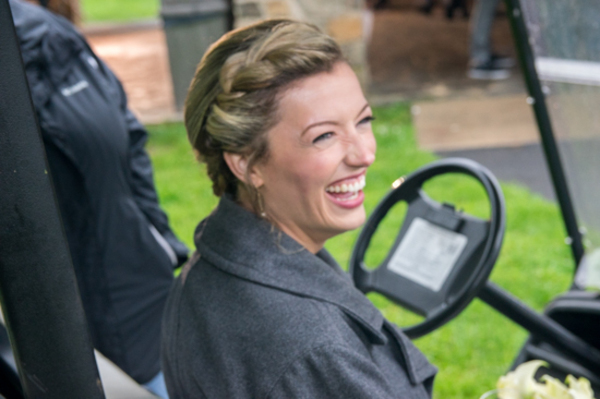 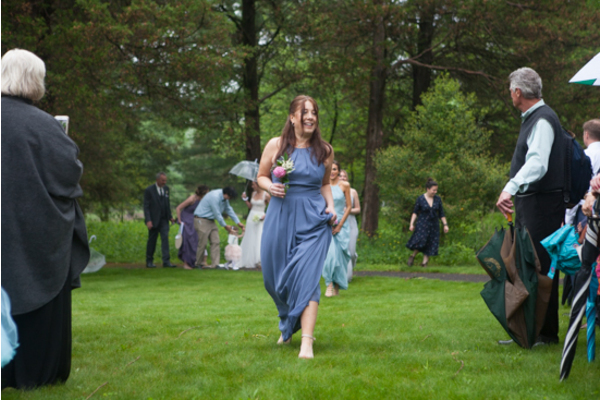 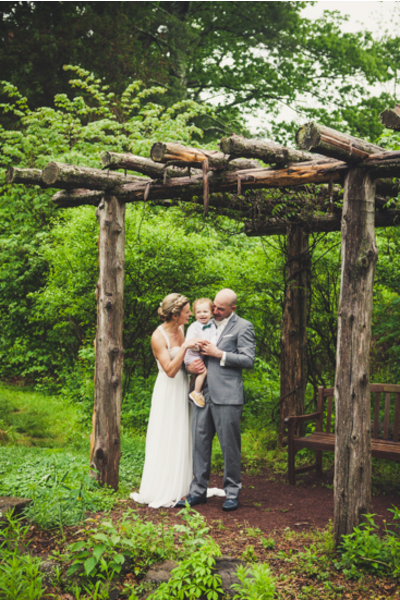 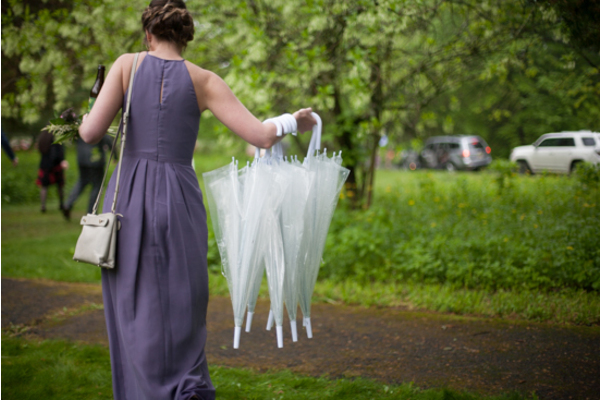 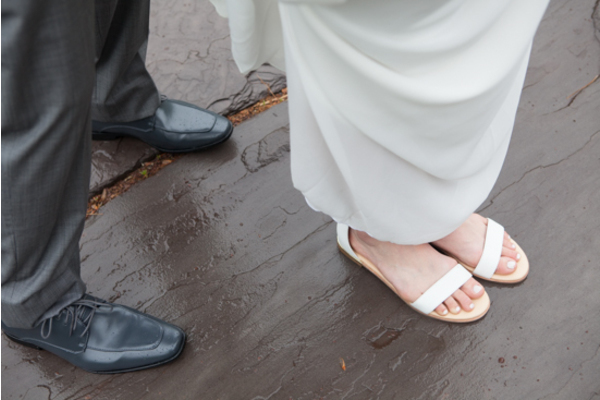 Even in the rain, Erin was radiating light in this outdoor woodsy wedding. 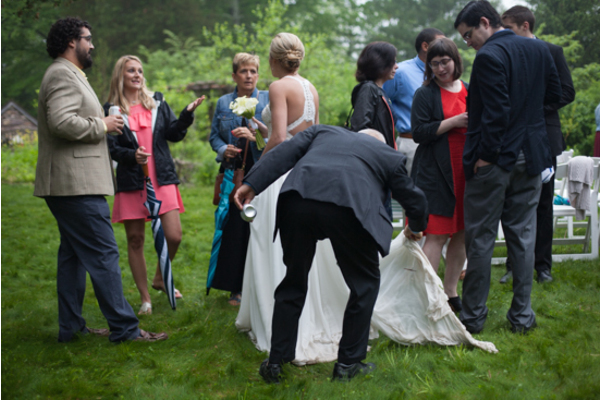 Josh was close behind Erin holding up her dress and making sure not to get it dirty before her appearance down the aisle. 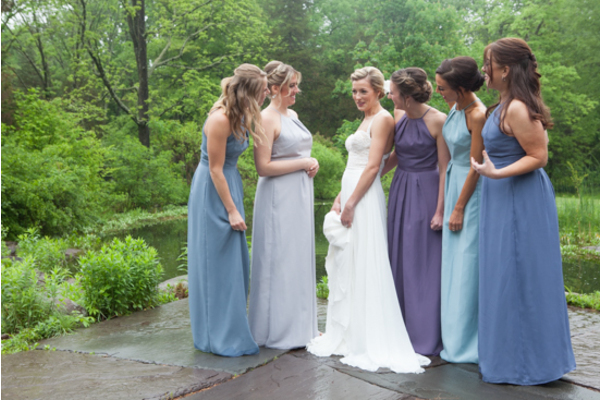 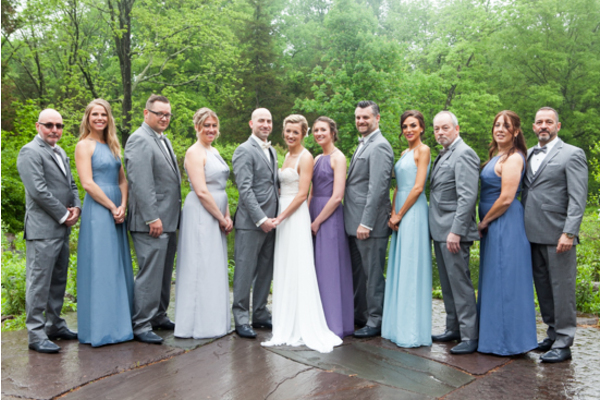 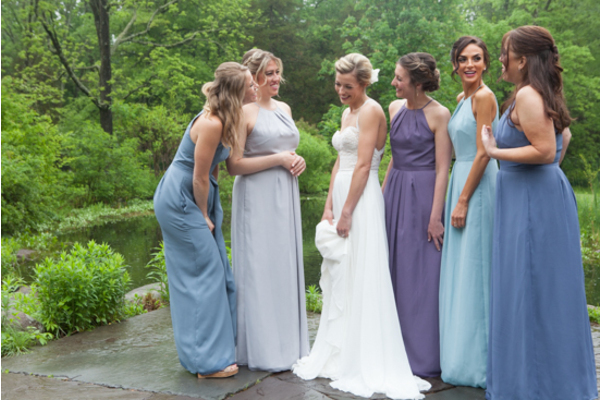 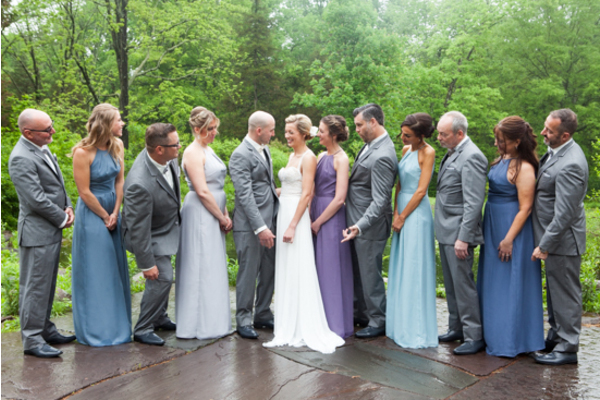 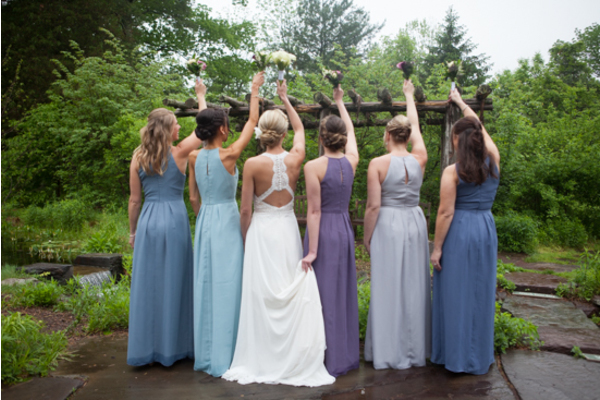 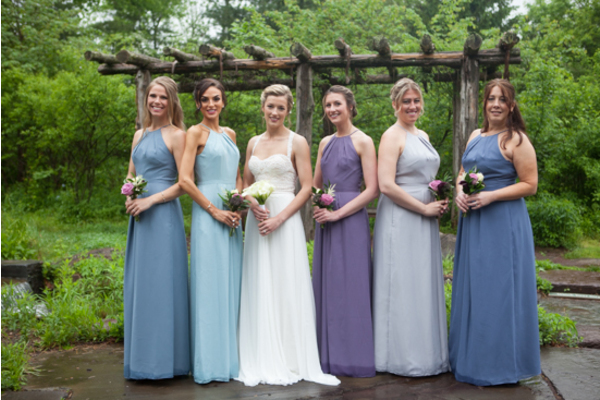 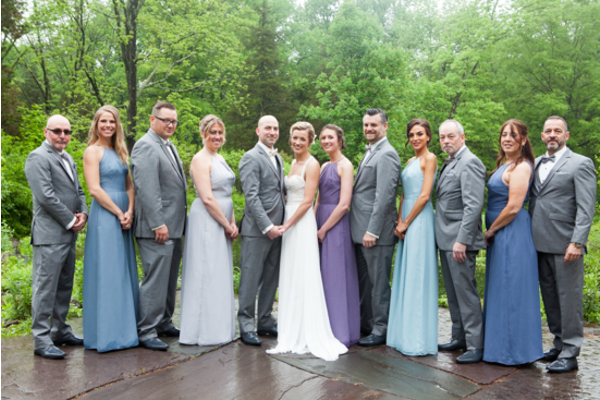 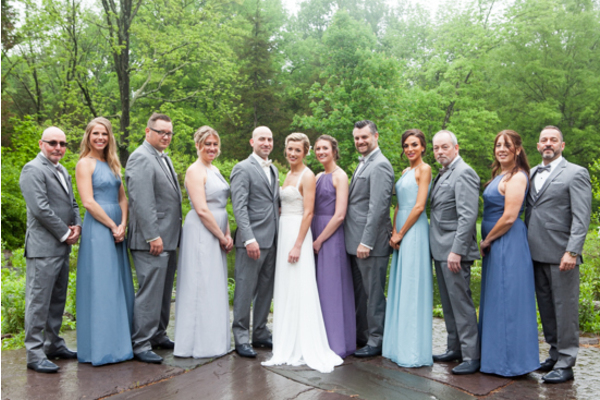 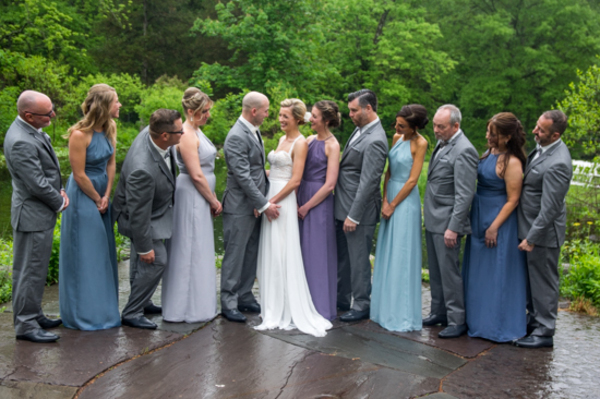 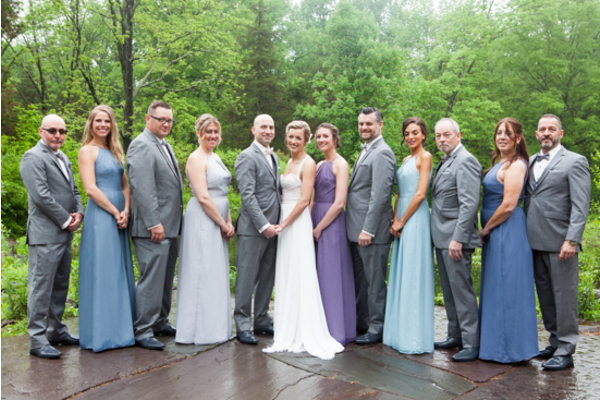 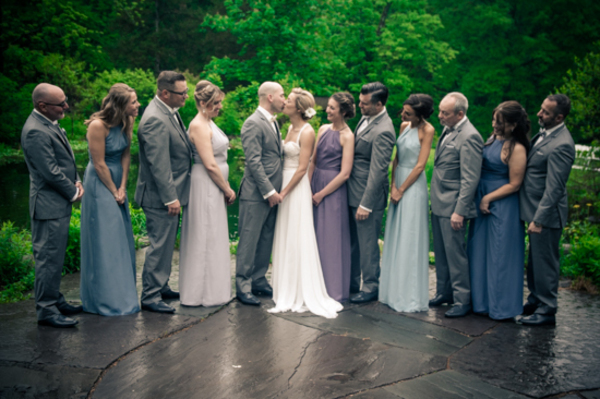 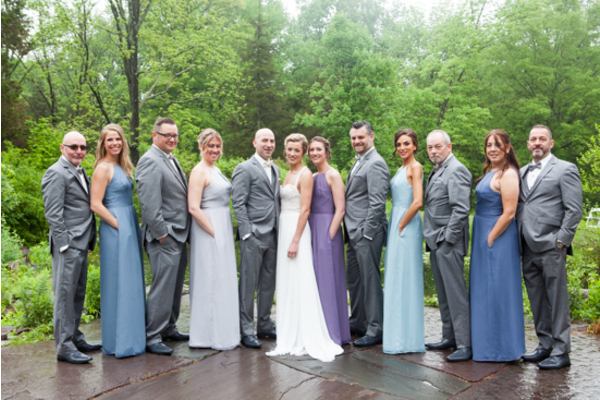 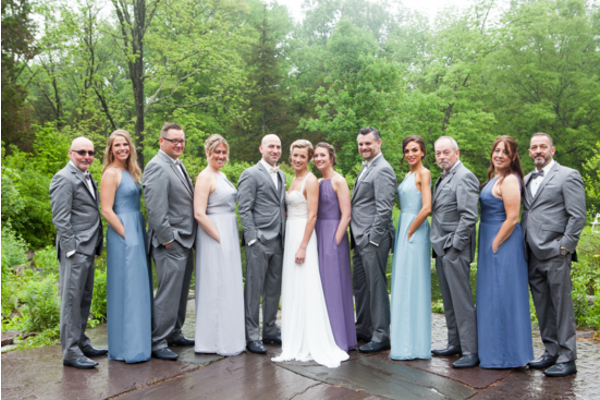 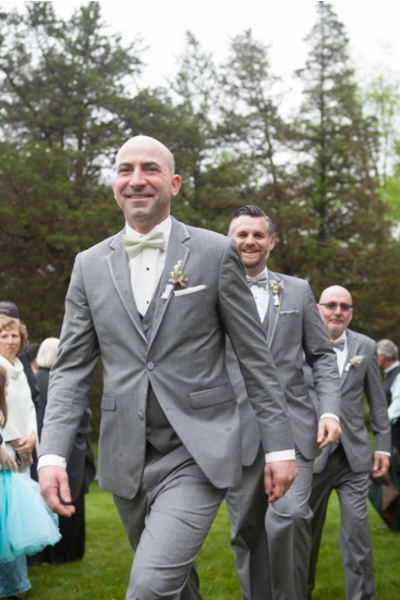 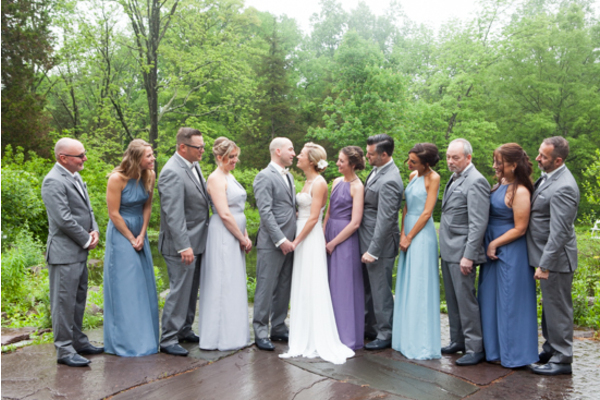 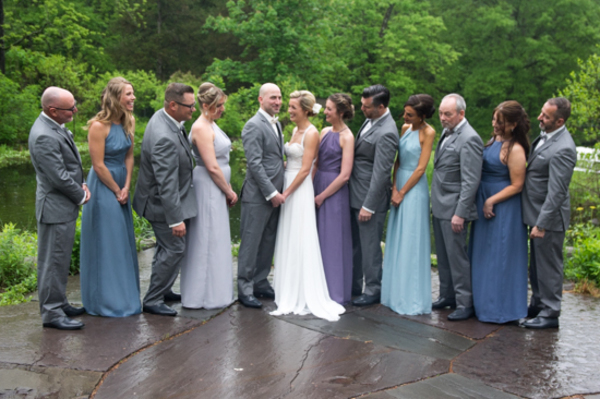 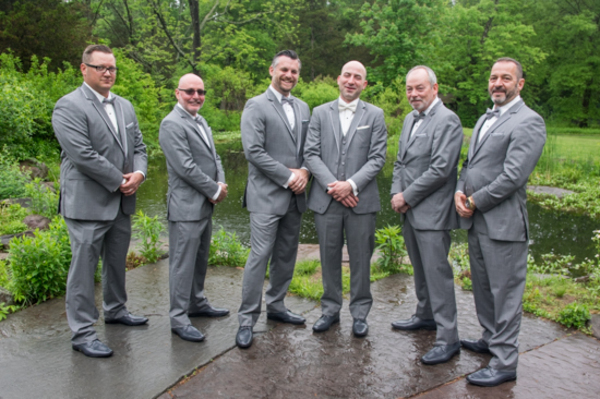 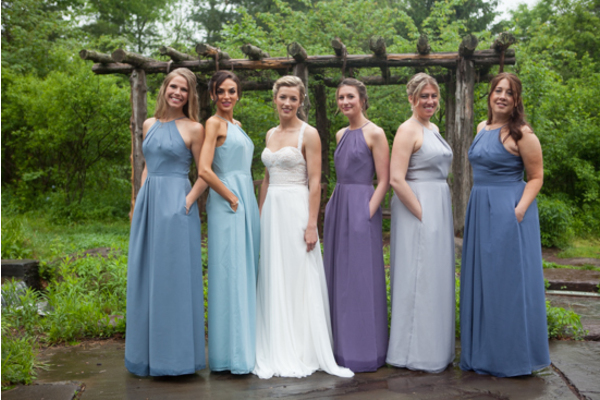 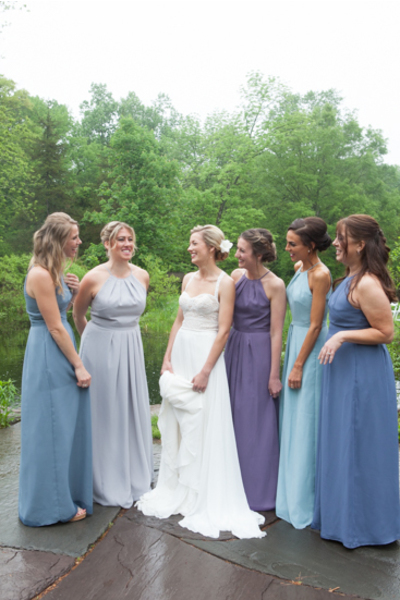 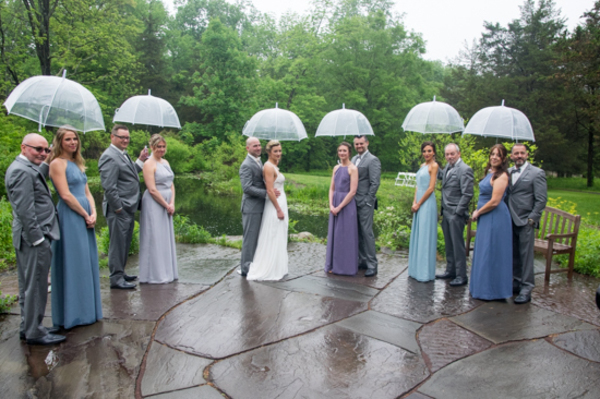 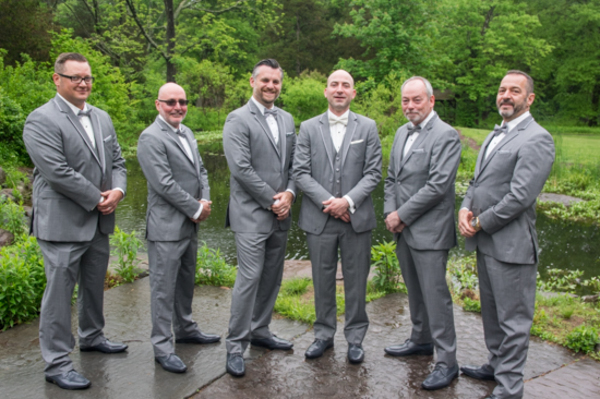 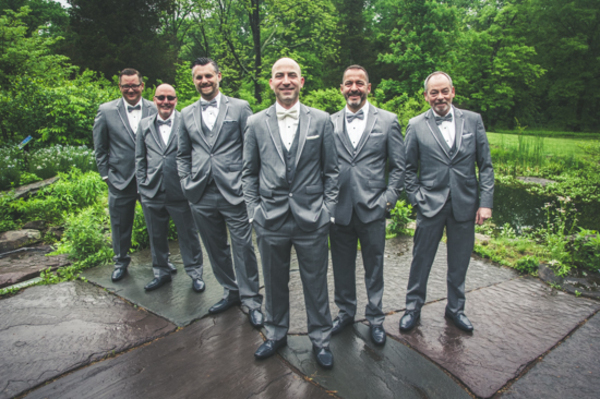 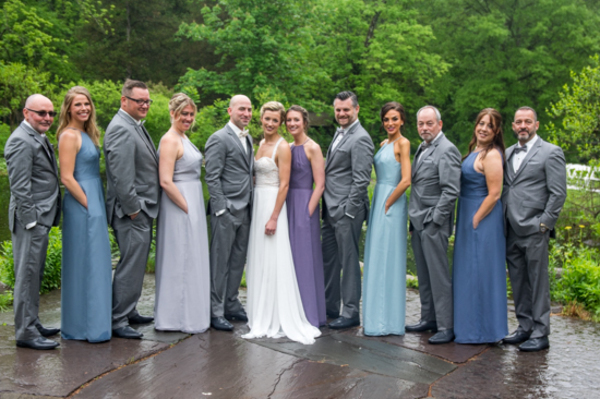 Our NJ Wedding Photographer captured the bridal party in the best light on this cloudy day. 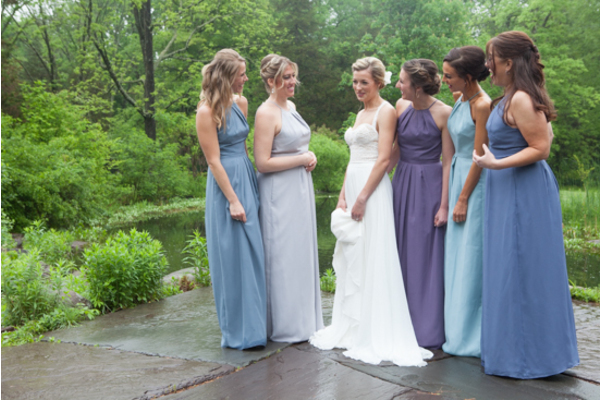 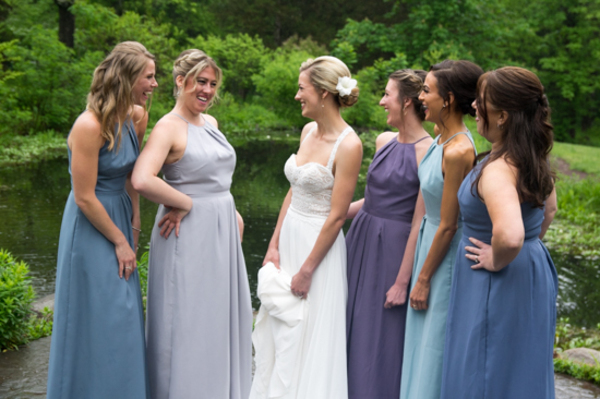 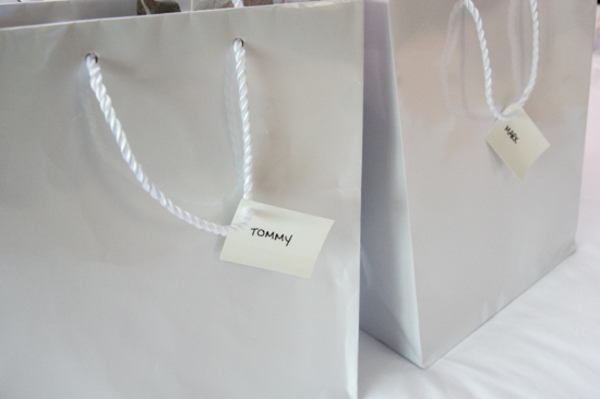 Shades of blue dresses made their way up to the alter awaiting the arrival of Erin. 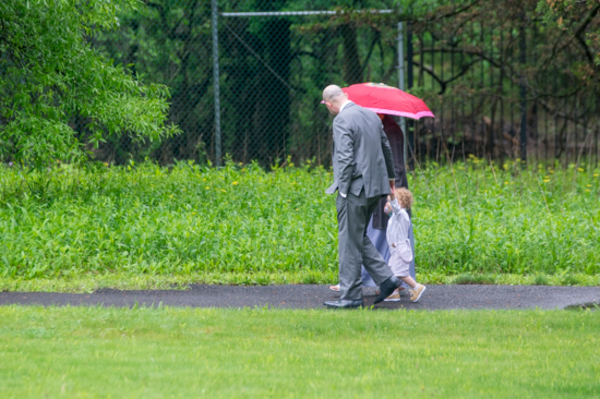 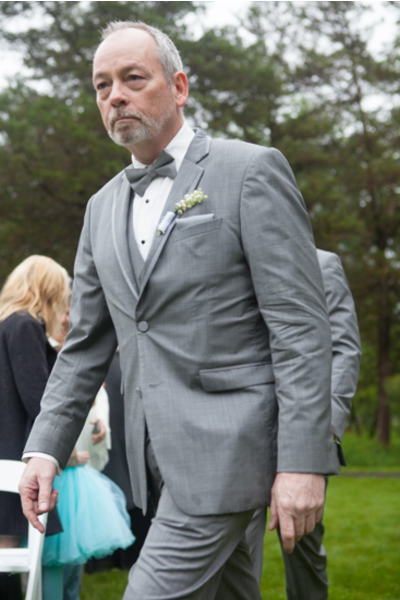 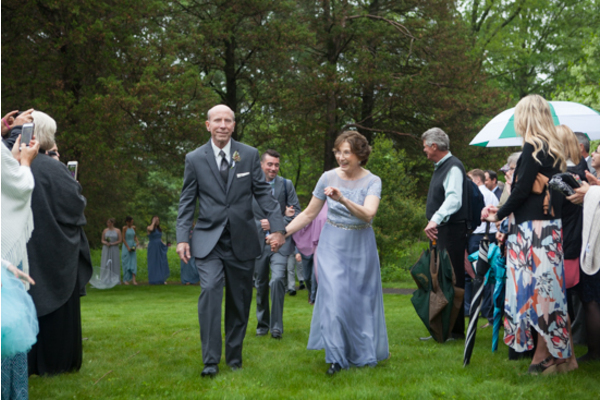 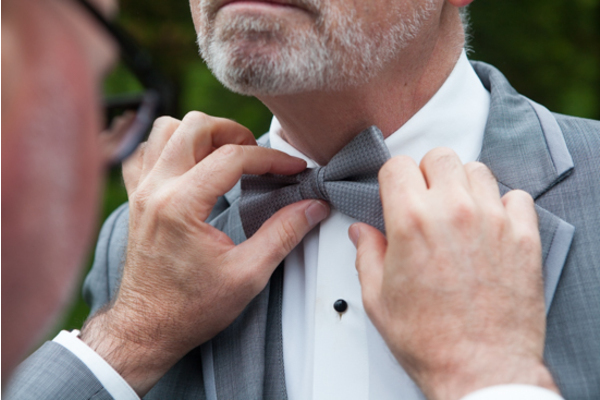 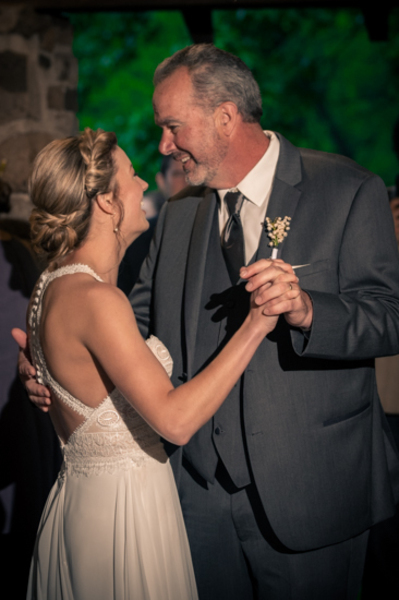 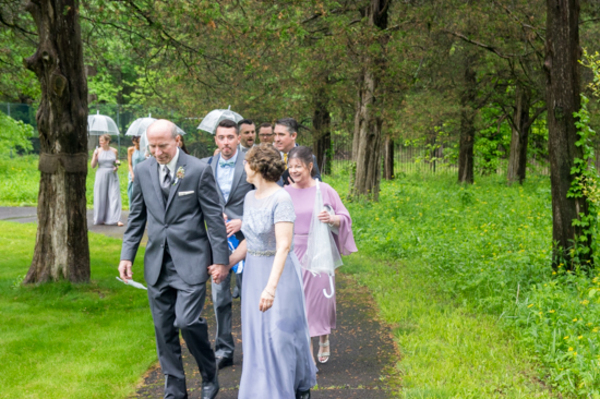 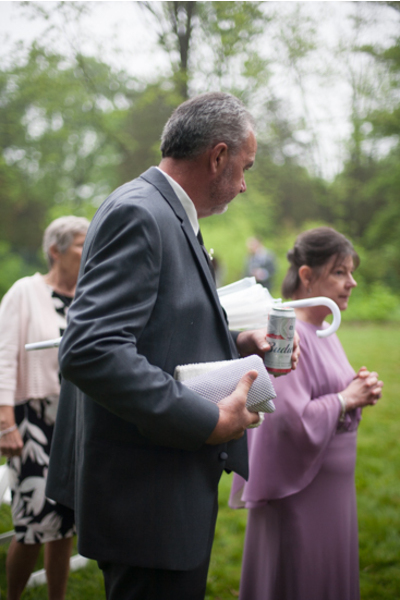 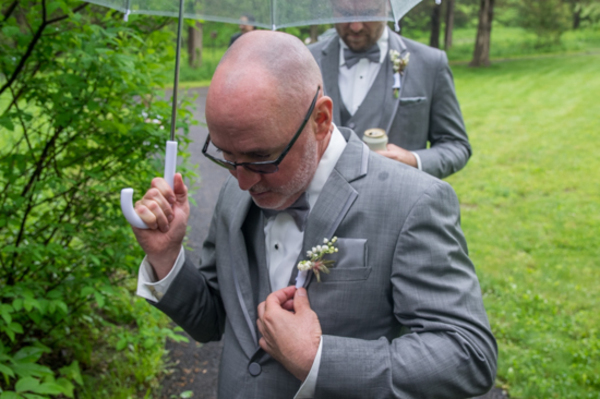 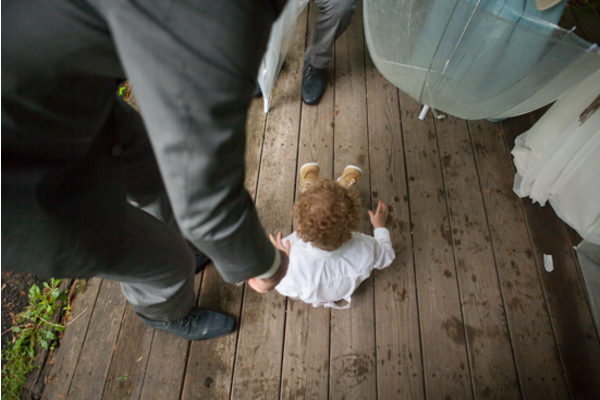 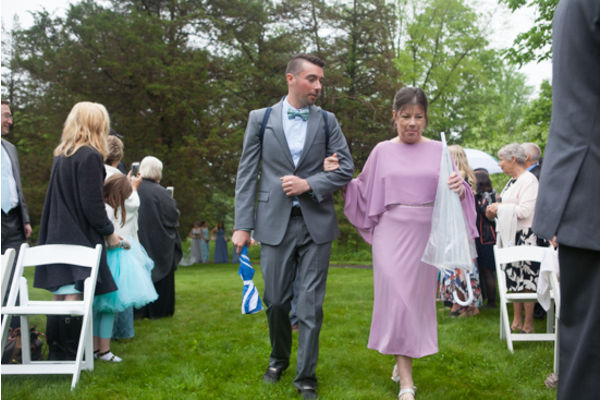 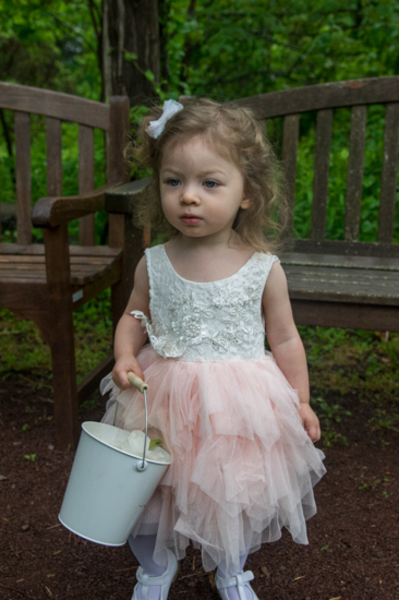 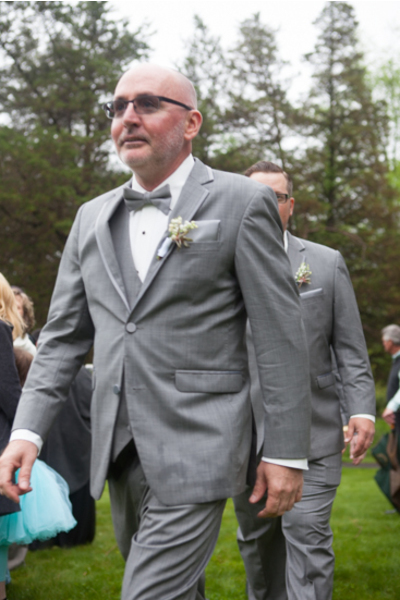 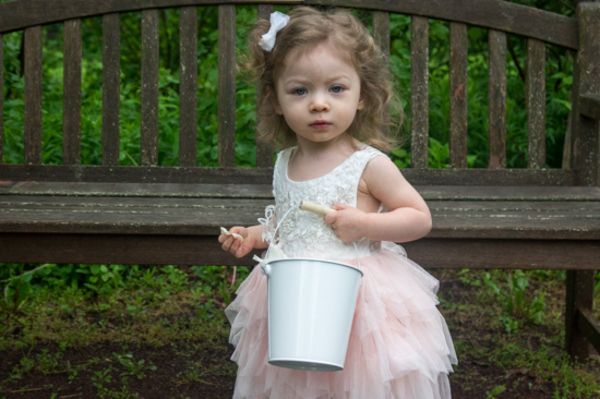 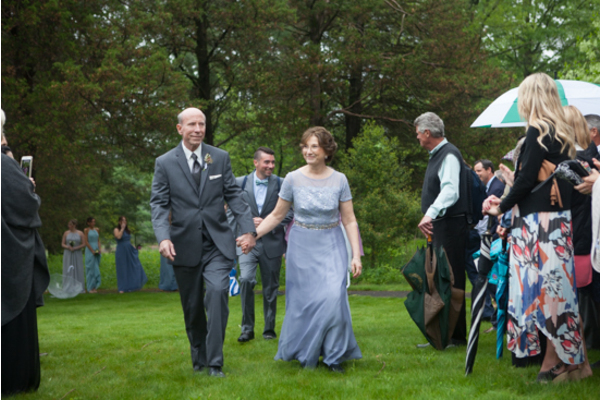 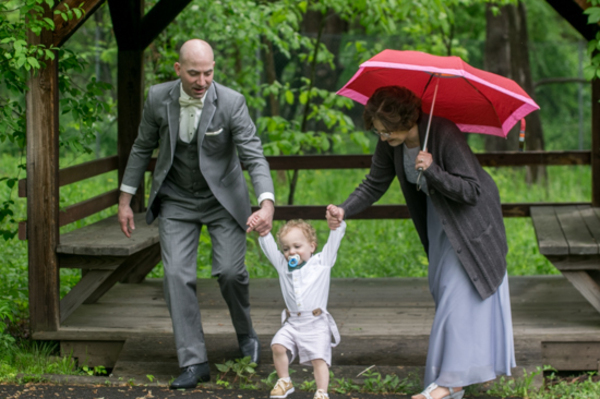 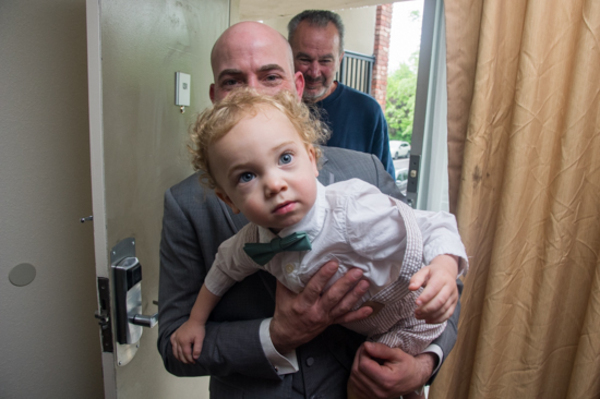 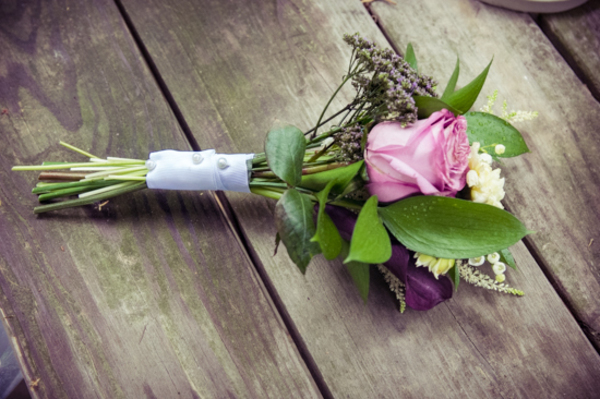 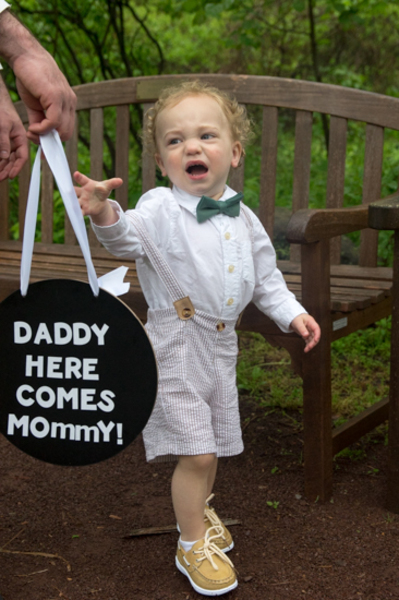 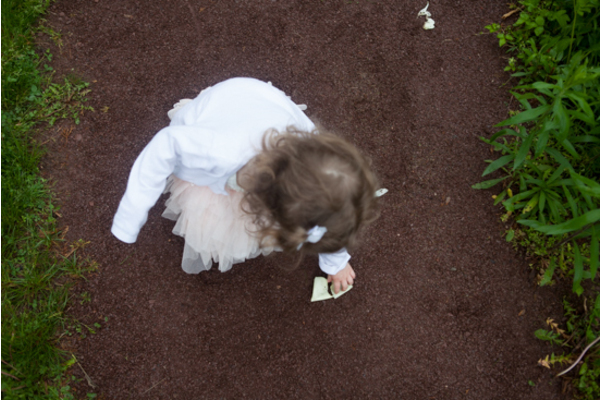 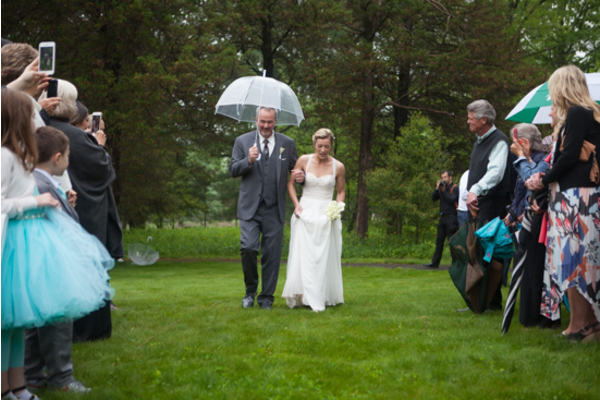 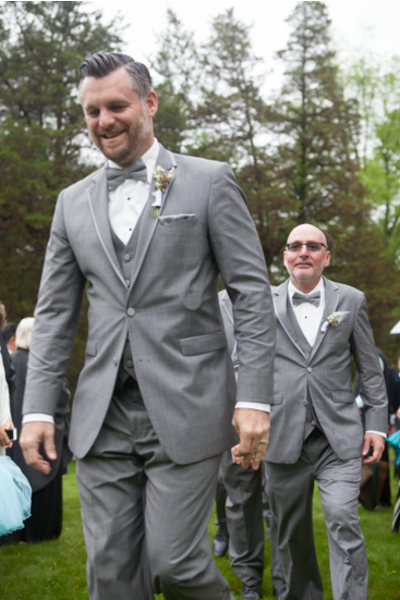 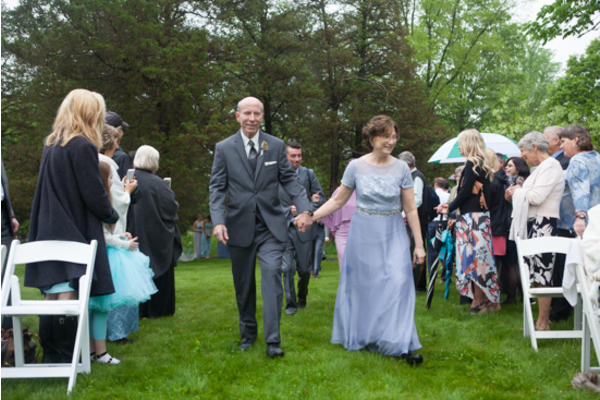 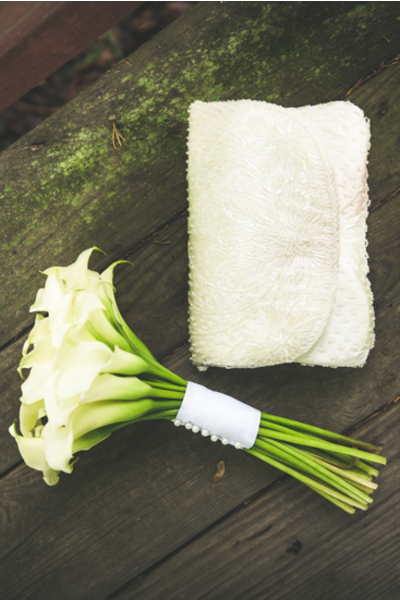 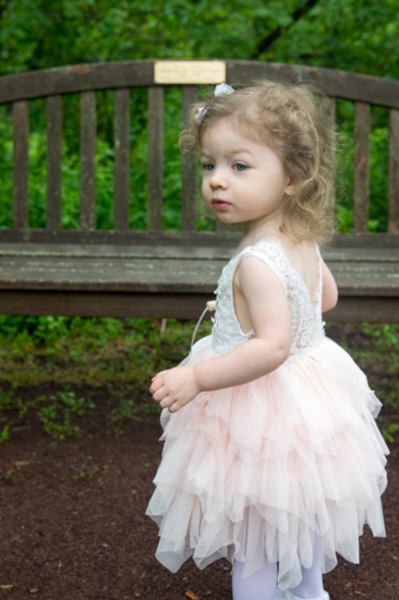 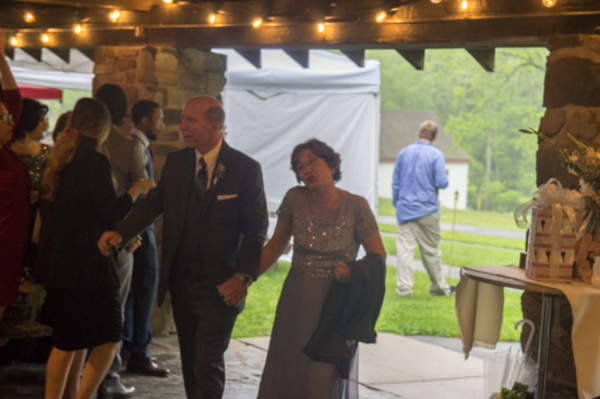 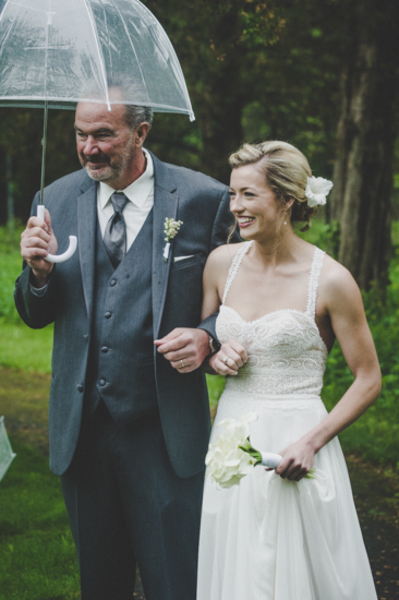 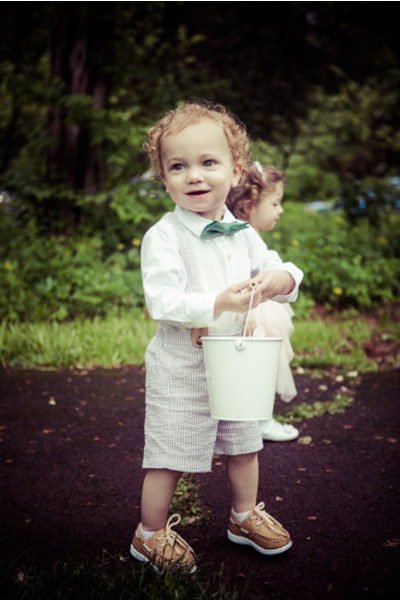 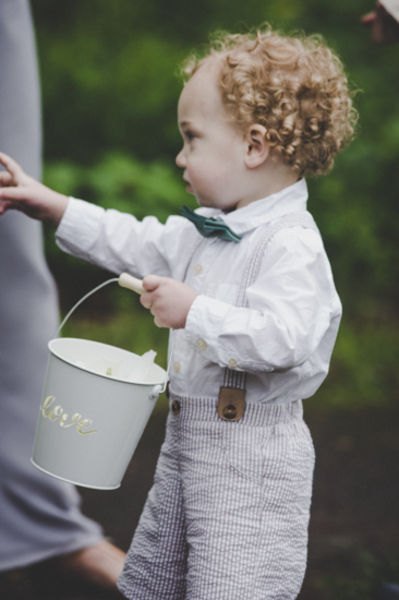 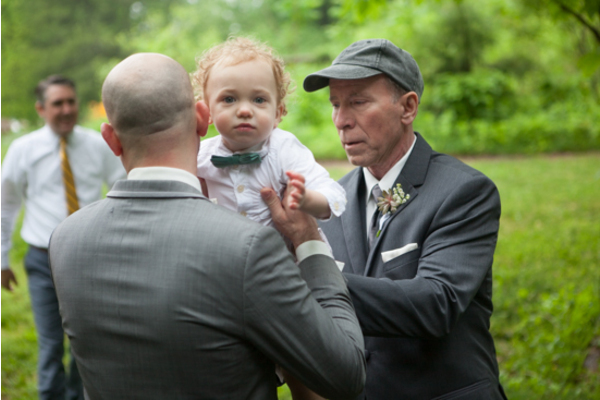 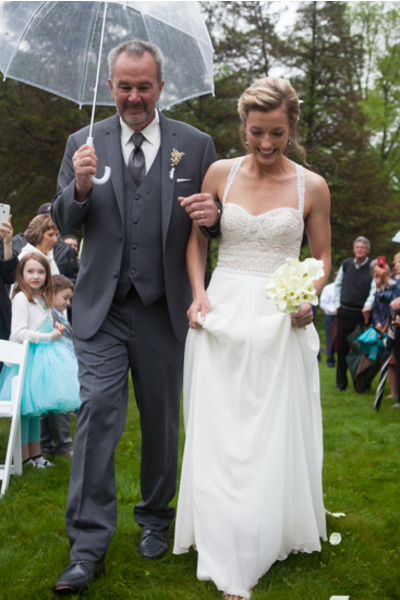 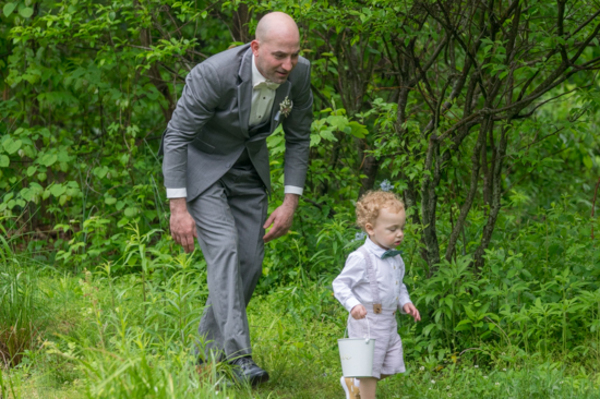 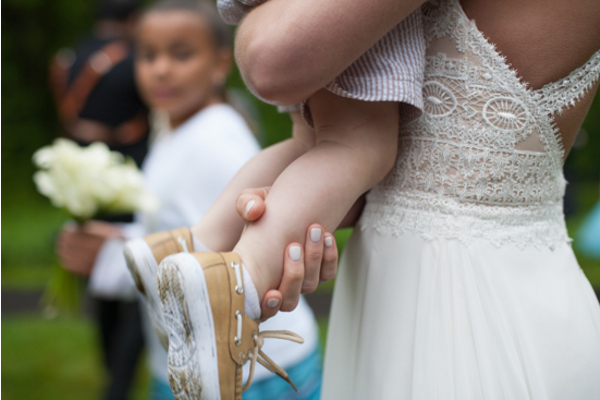 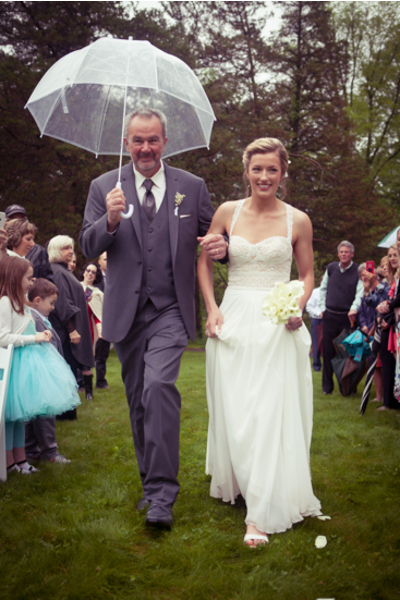 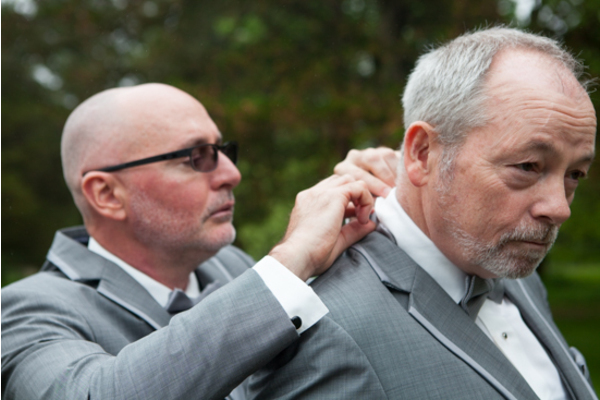 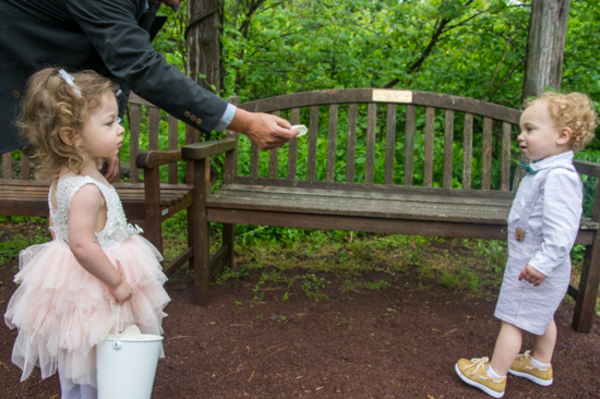 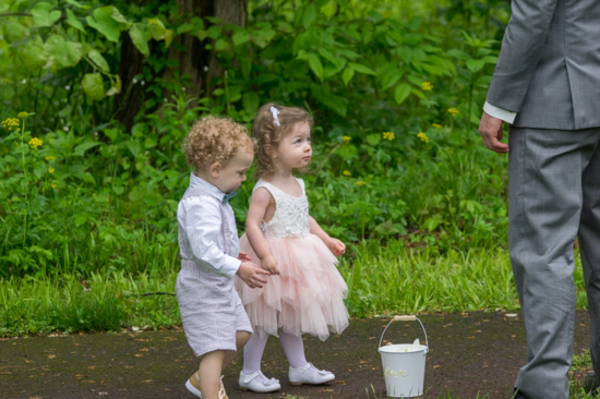 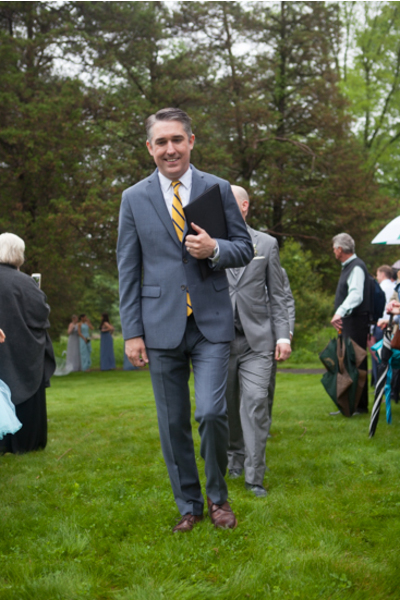 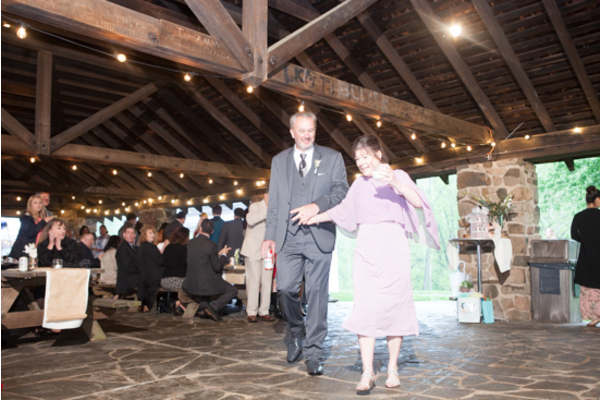 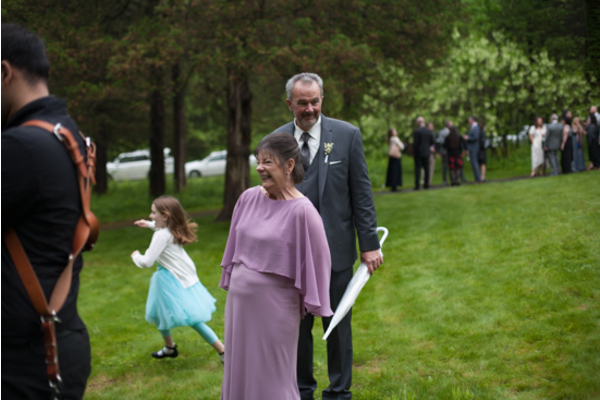 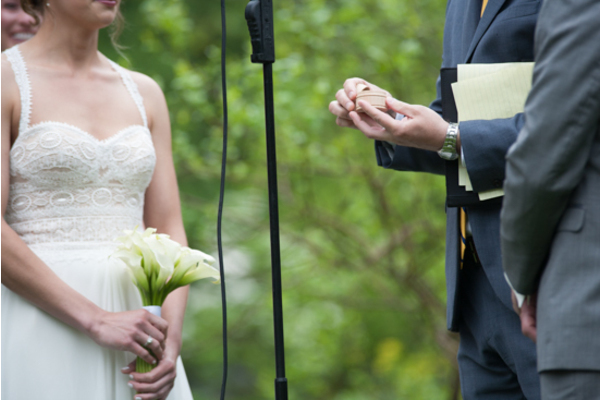 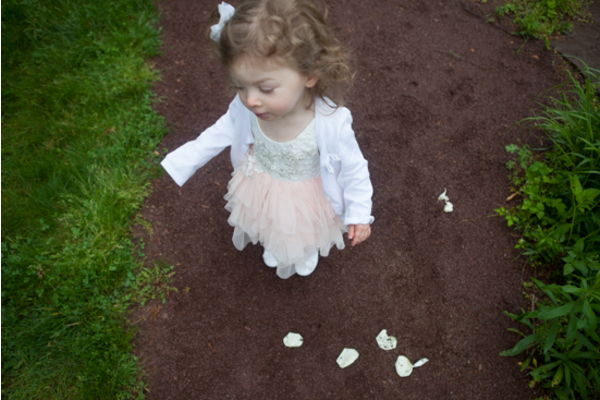 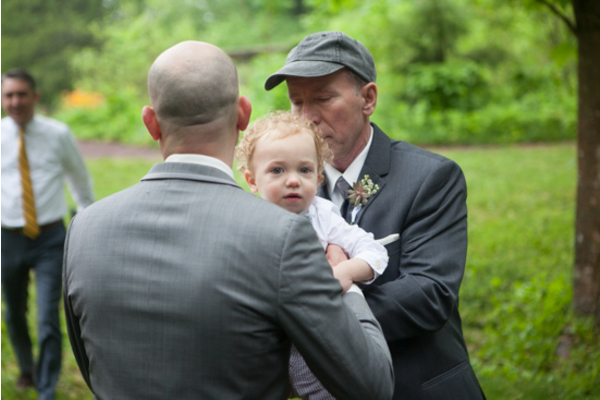 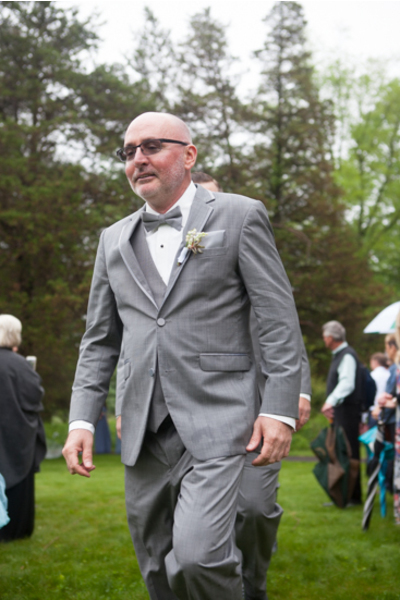 Covered with an umbrella held by her father, she followed in walking down the aisle. 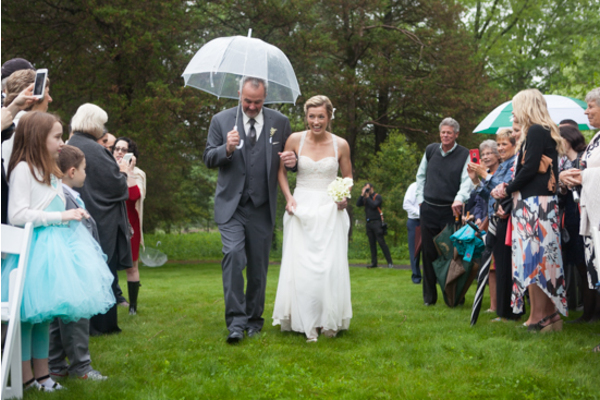 Despite the rain falling, there was no way to rain on this parade! 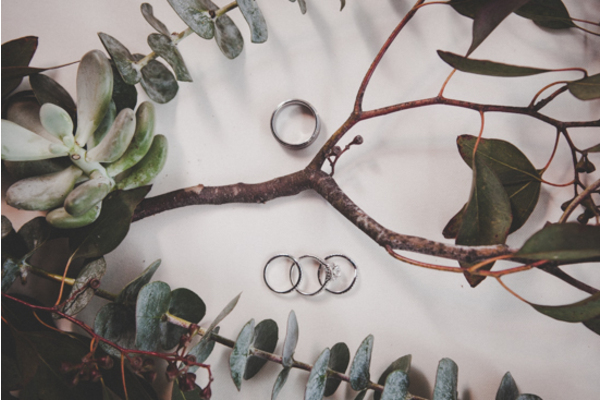 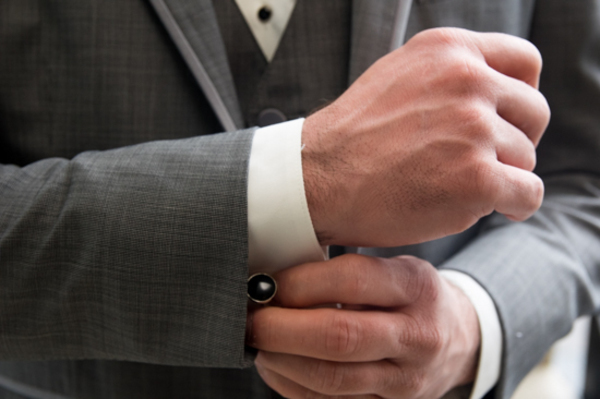 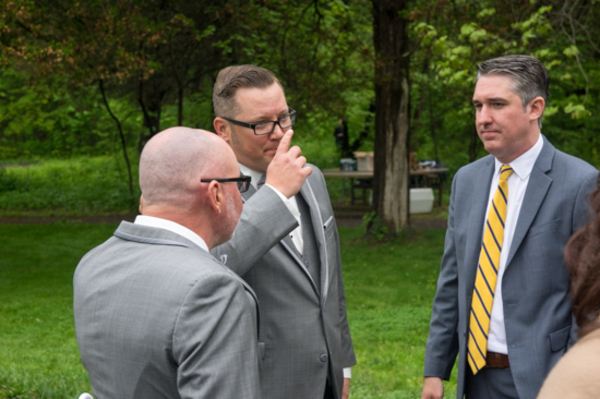 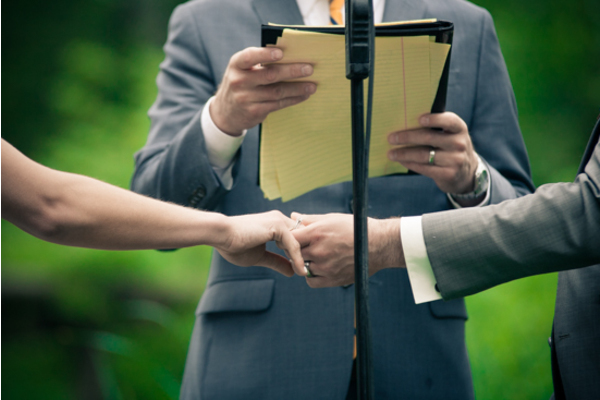 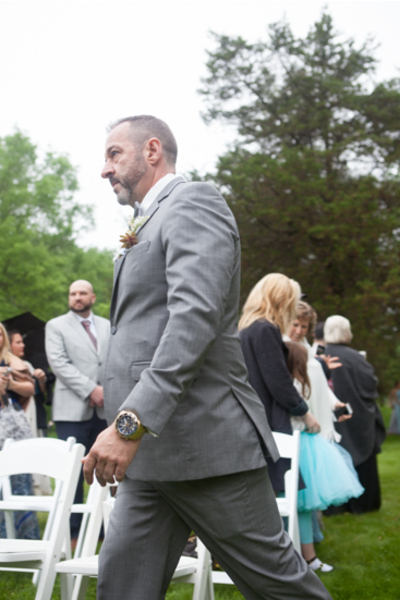 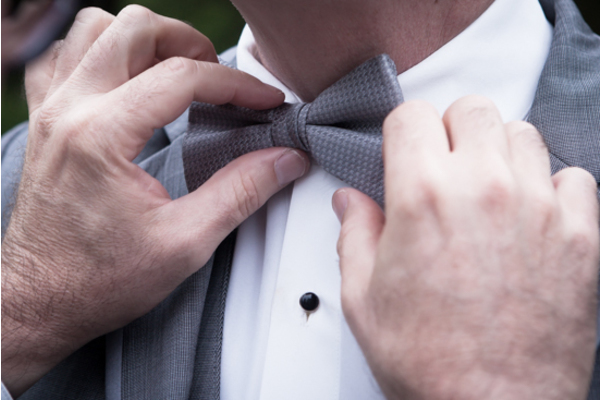 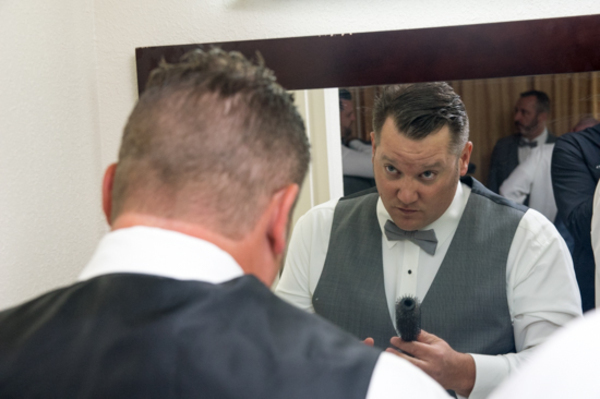 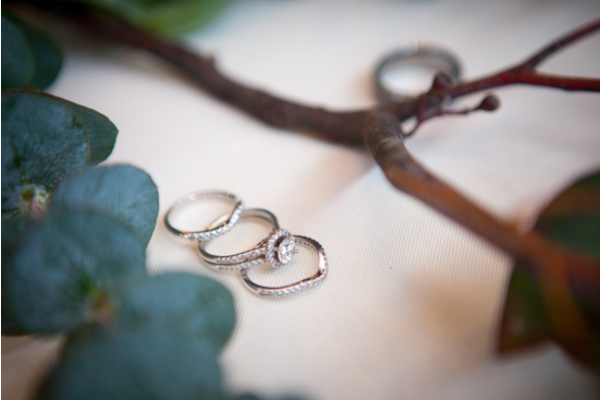 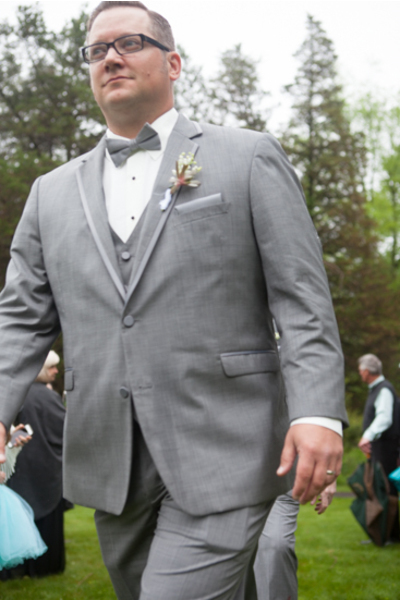 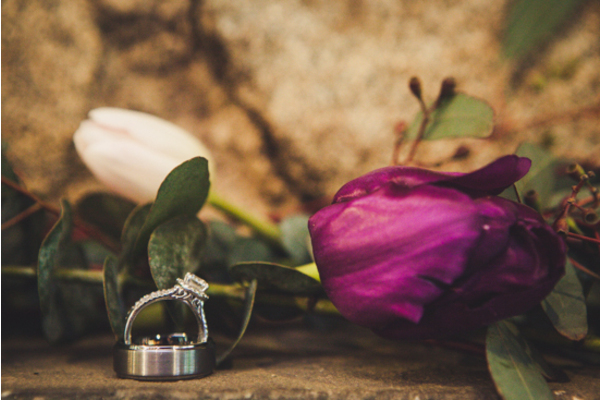 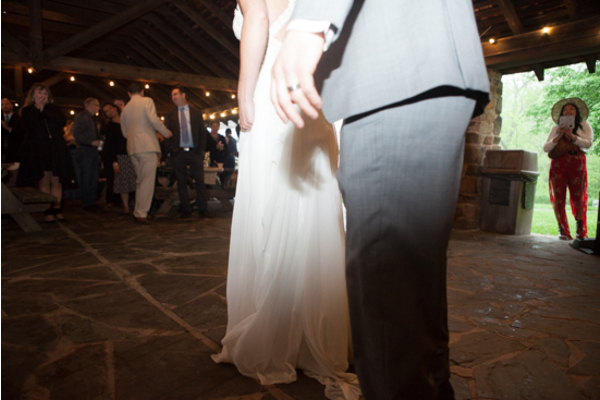 Josh took Erin’s hand and slipped on the ring that stood for much love and loyalty in their new marriage. 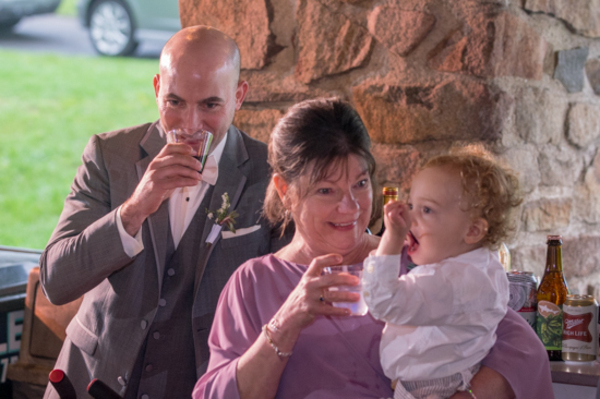 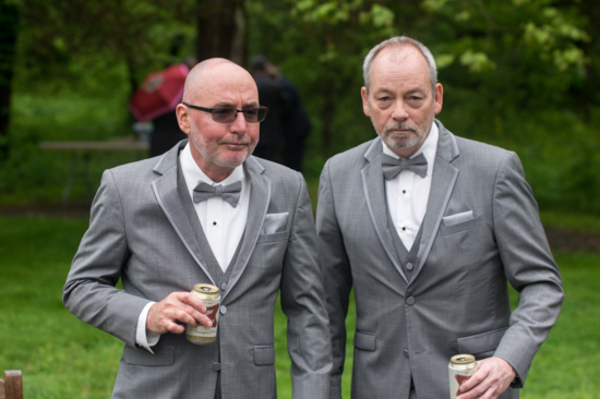 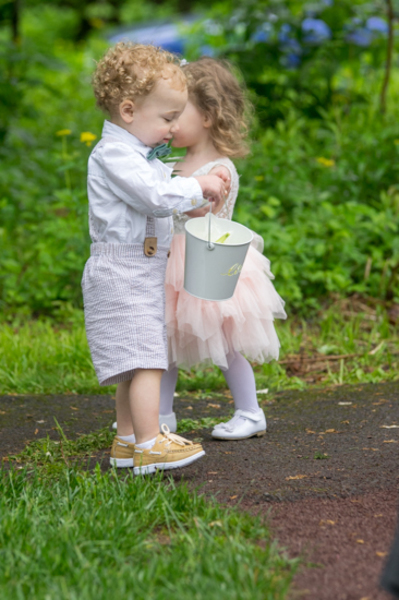 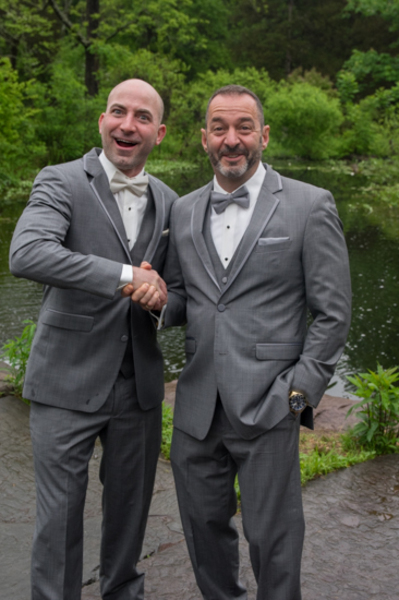 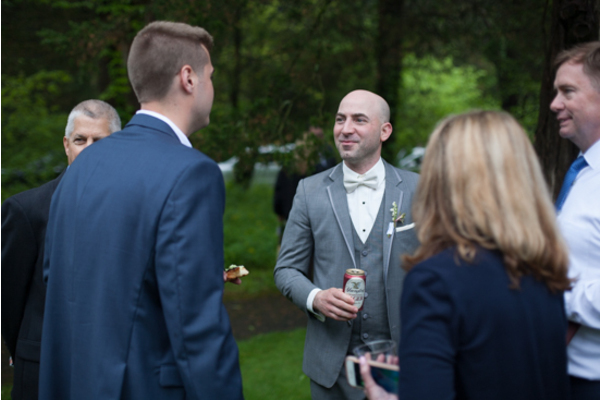 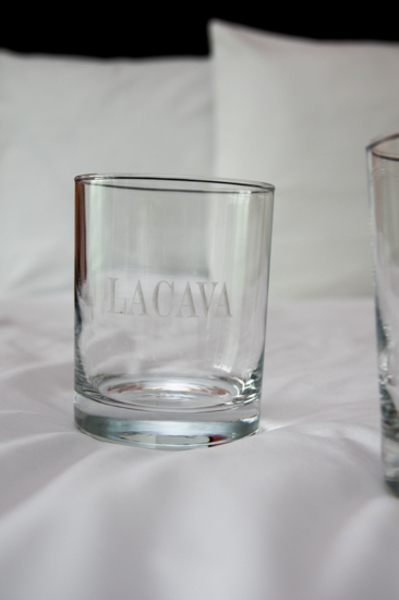 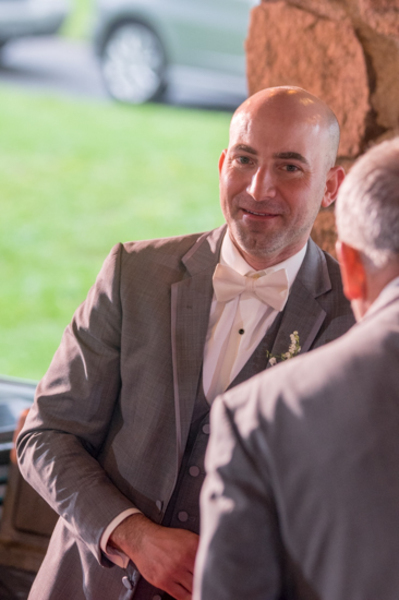 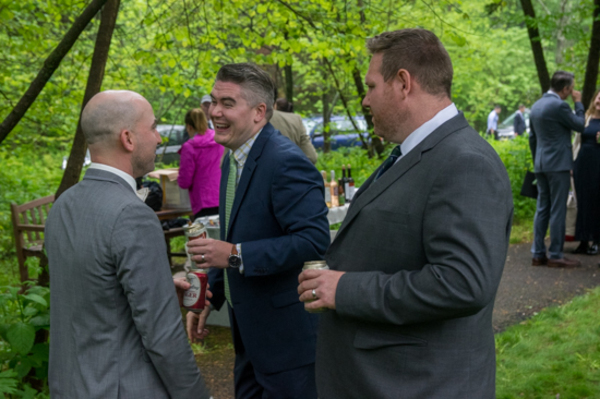 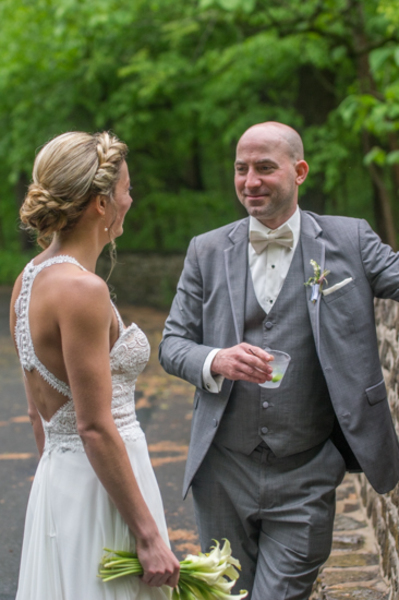 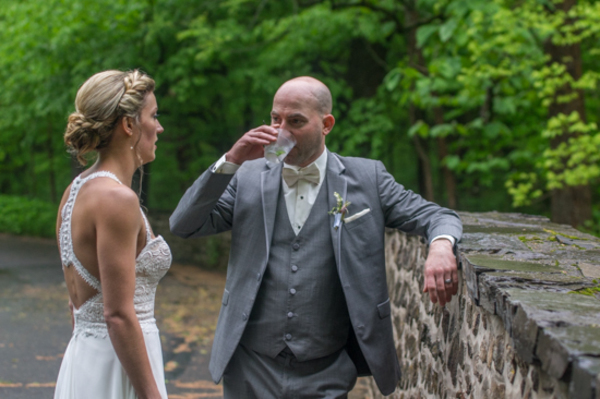 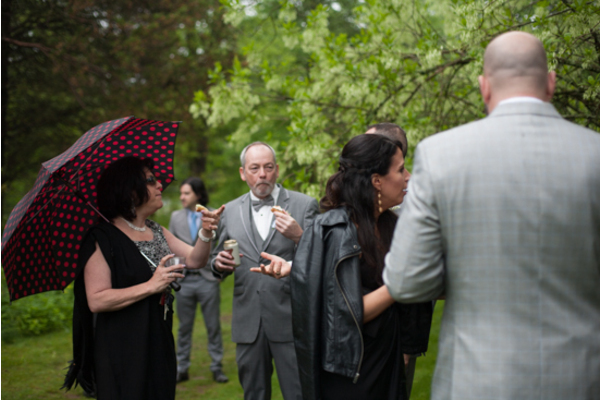 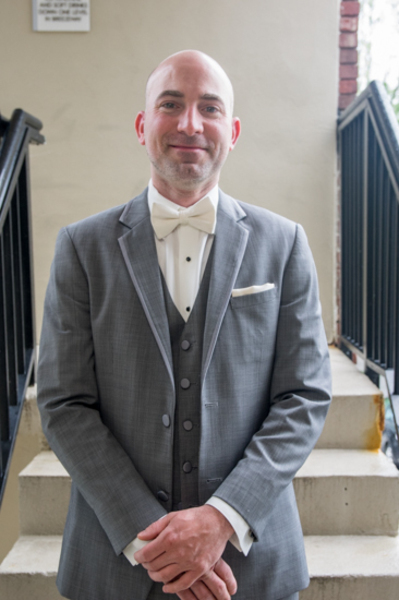 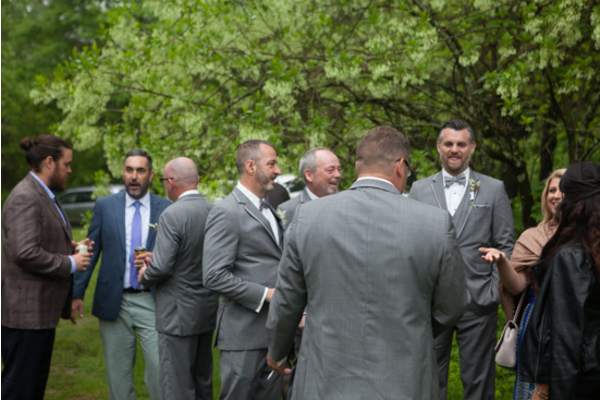 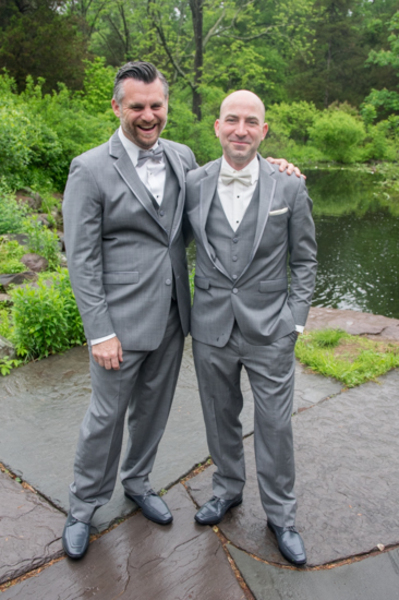 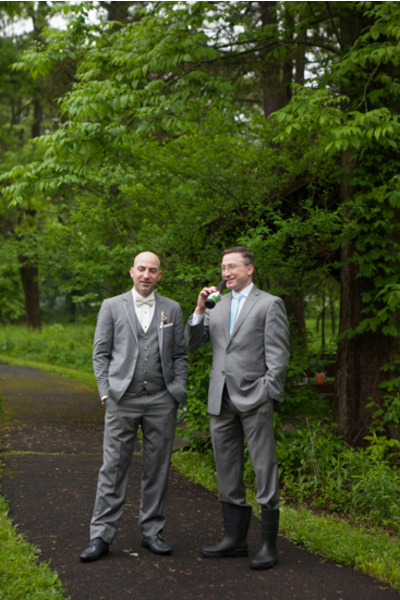 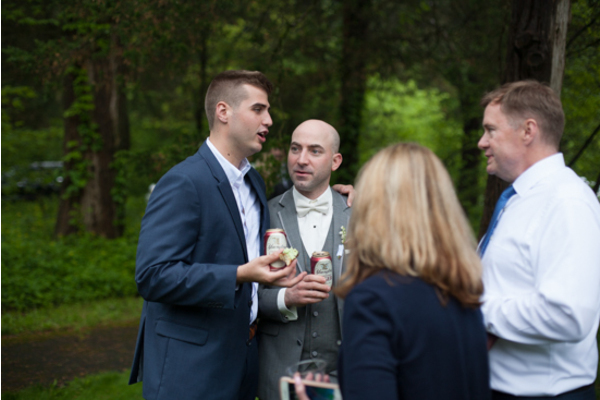 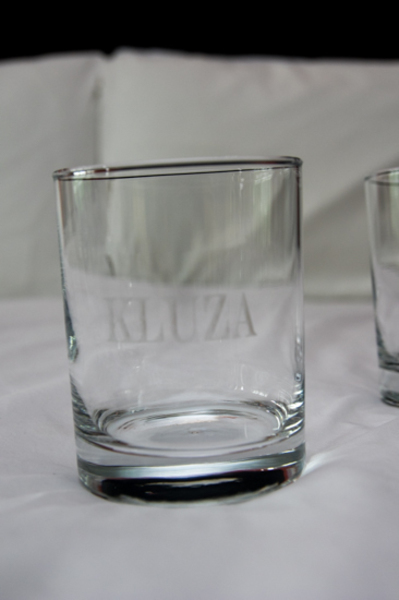 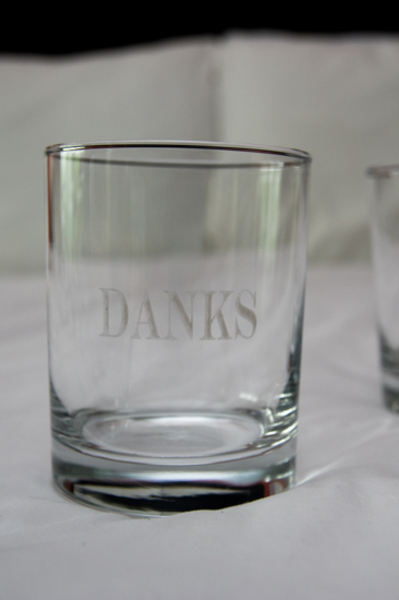 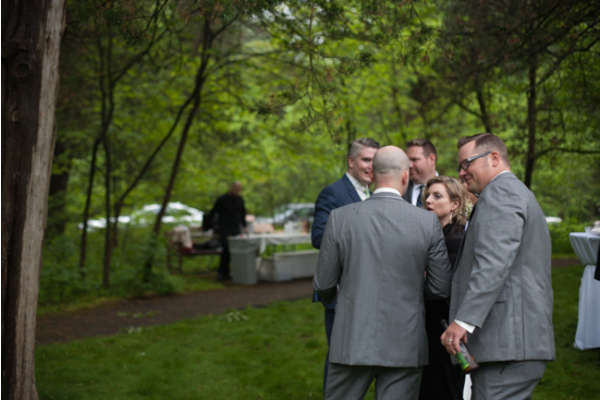 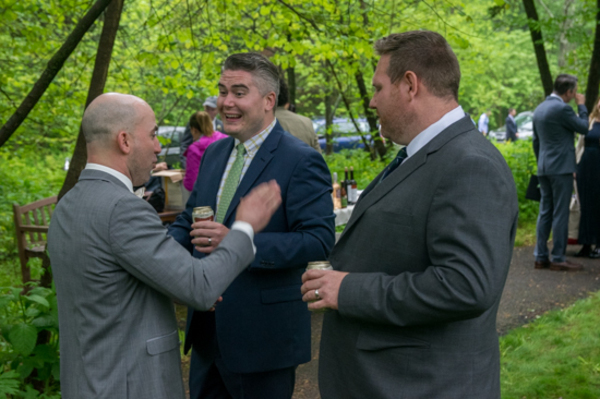 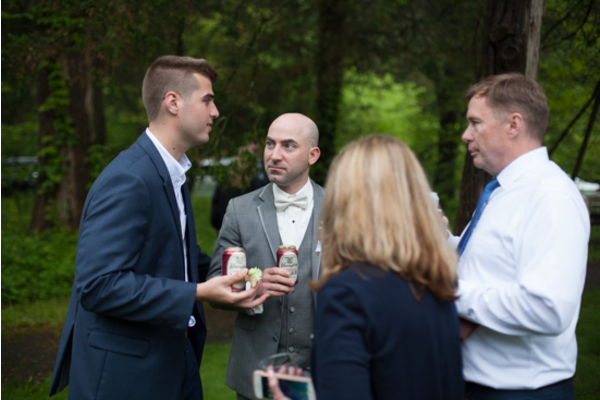 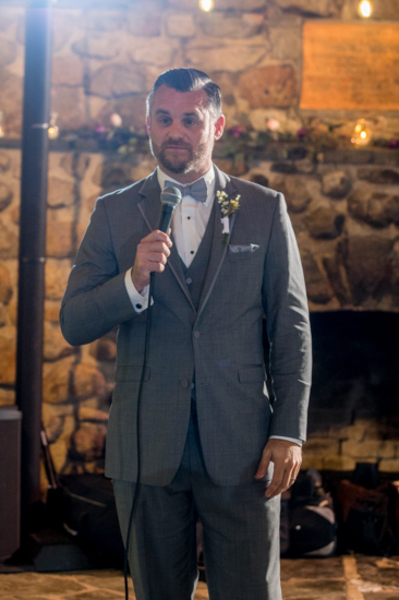 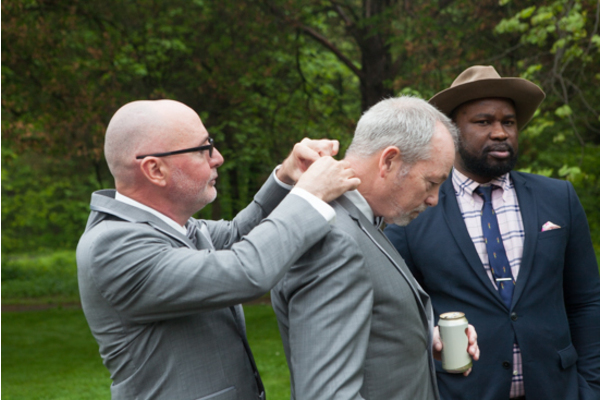 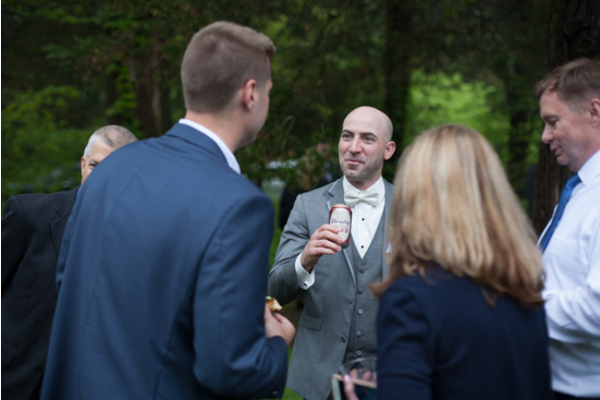 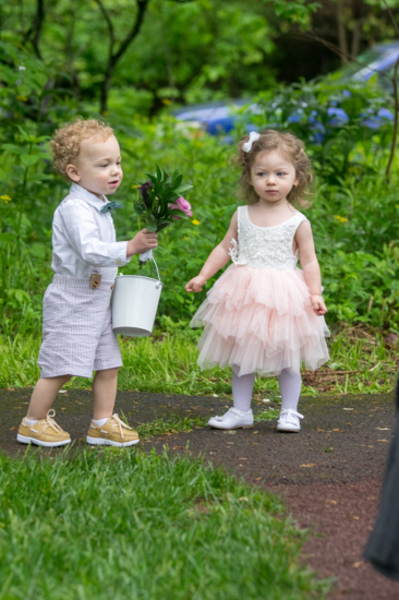 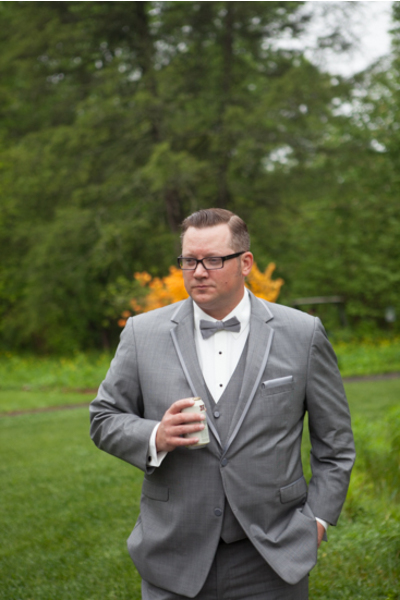 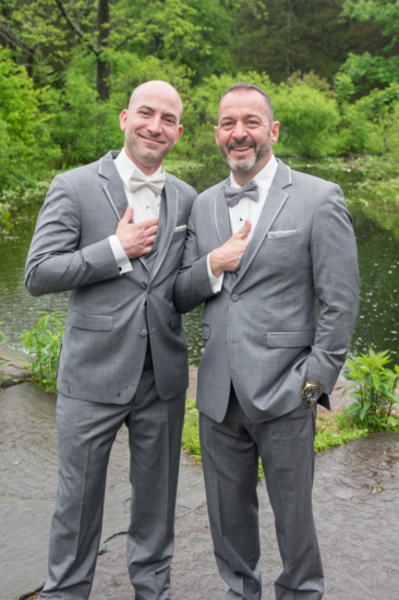 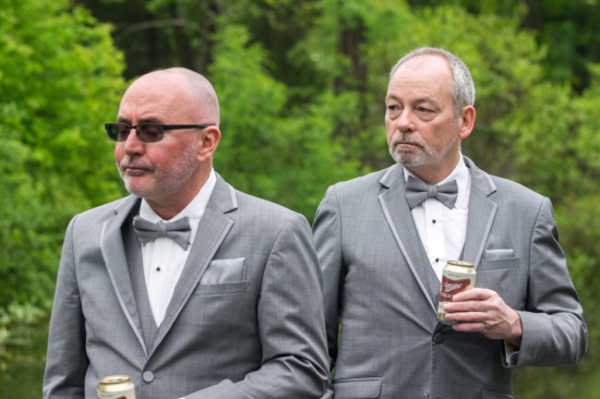 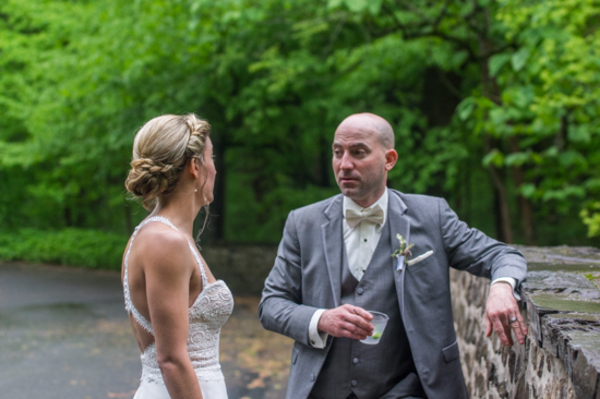 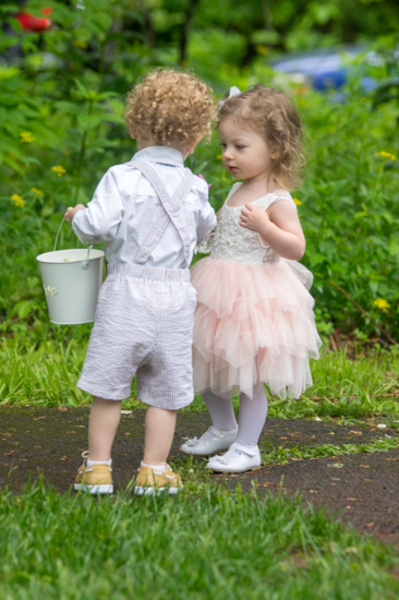 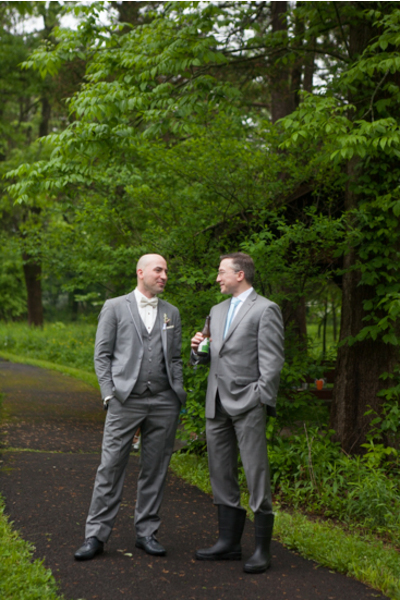 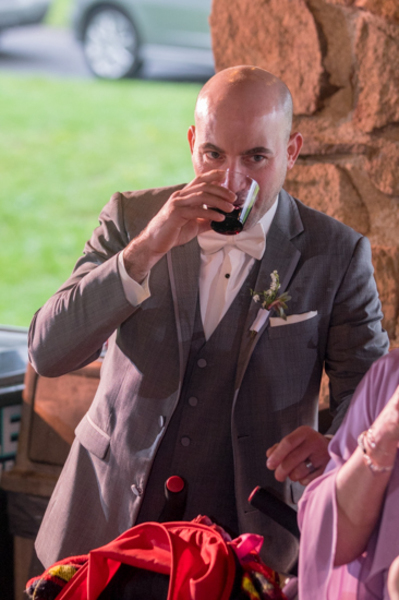 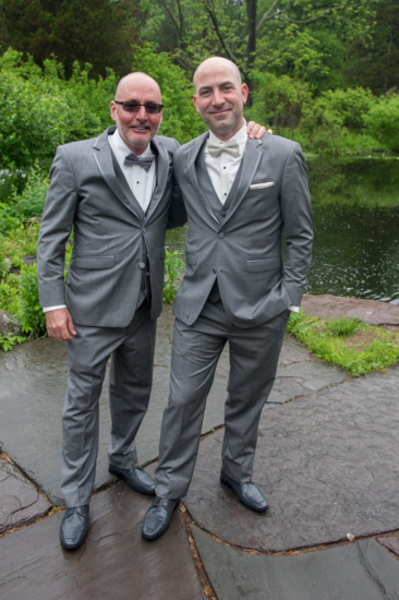 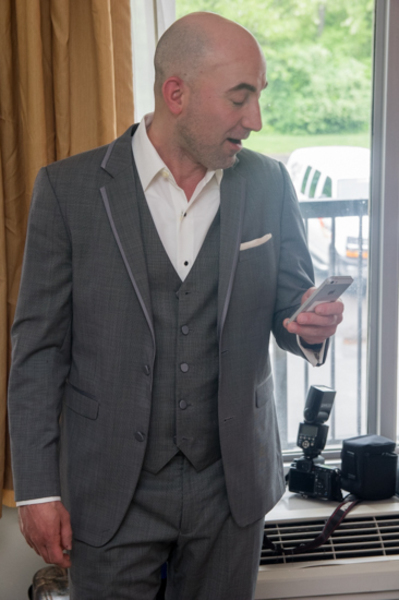 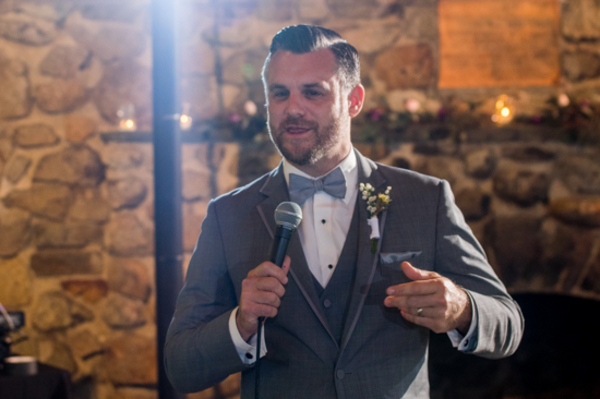 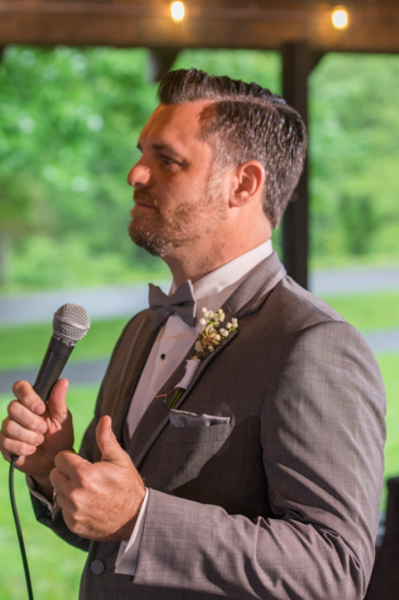 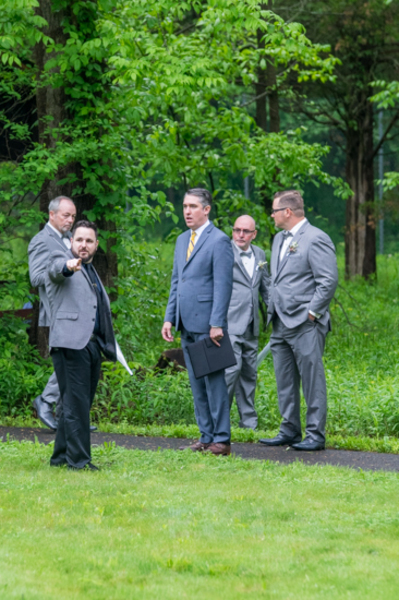 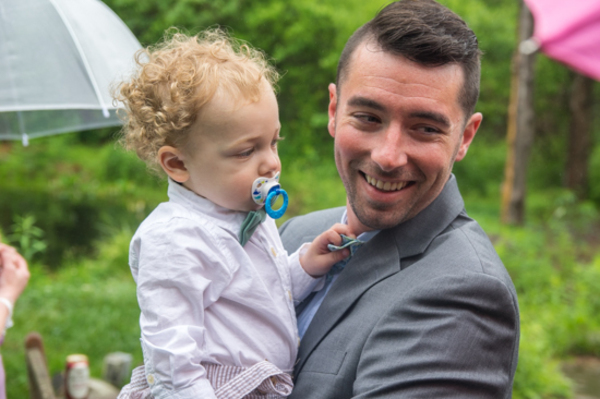 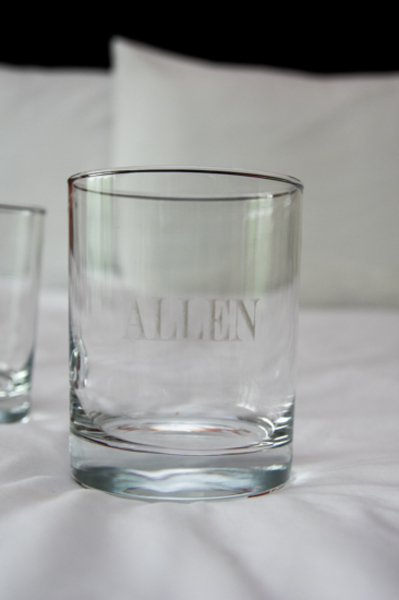 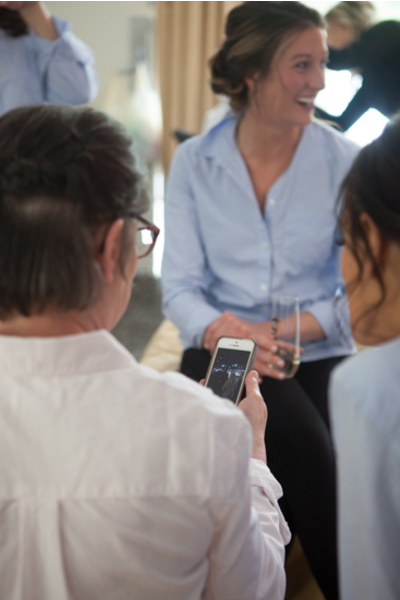 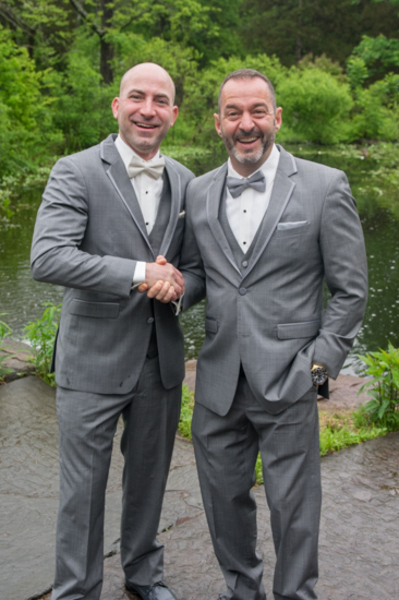 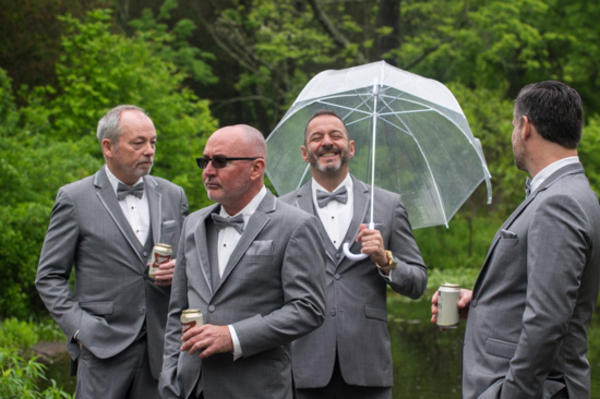 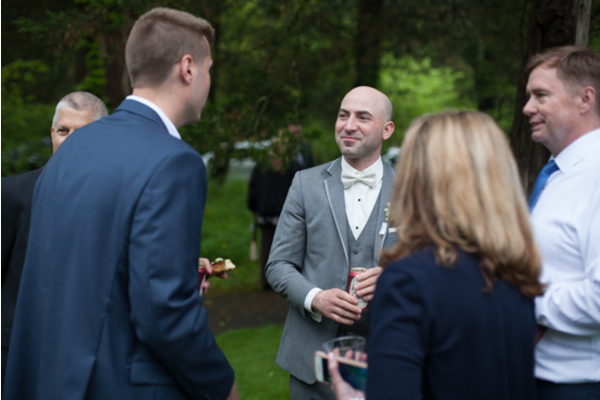 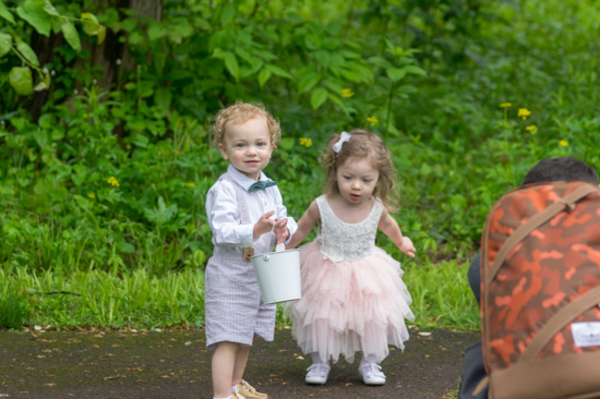 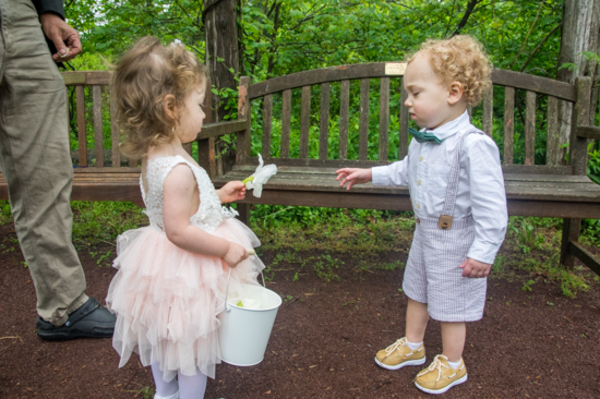 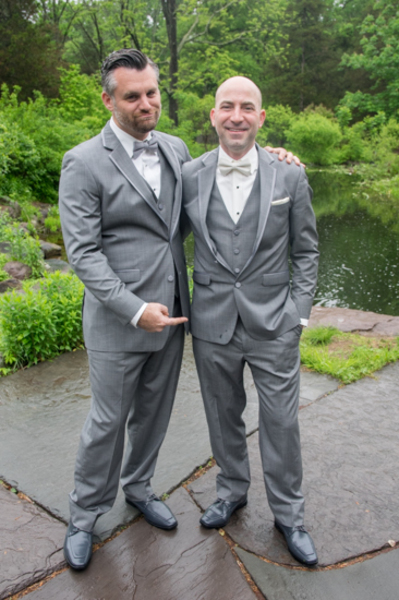 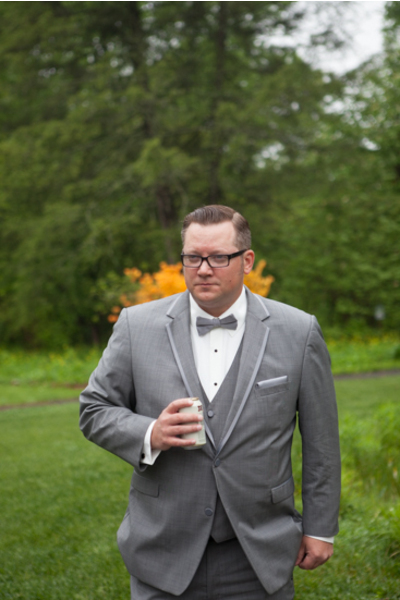 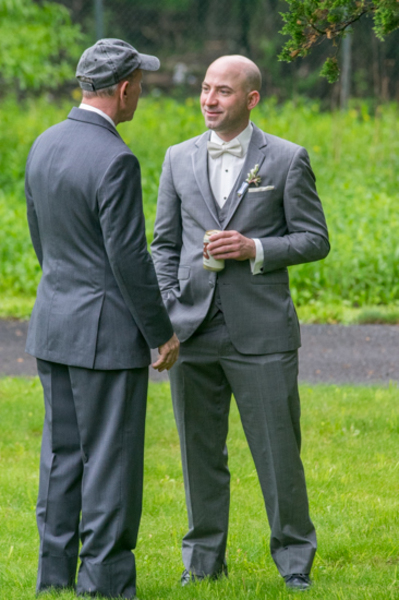 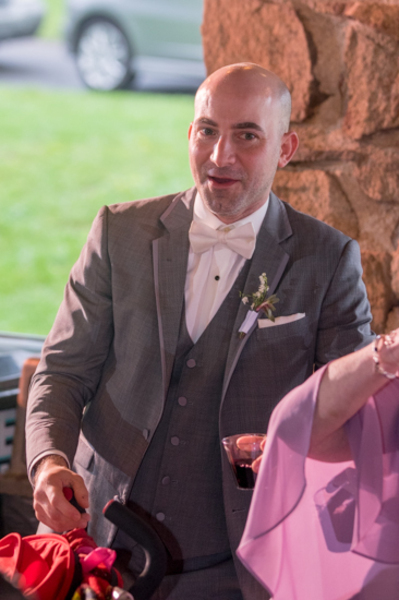 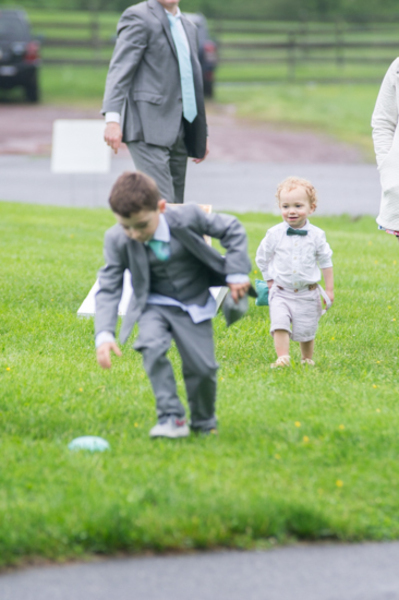 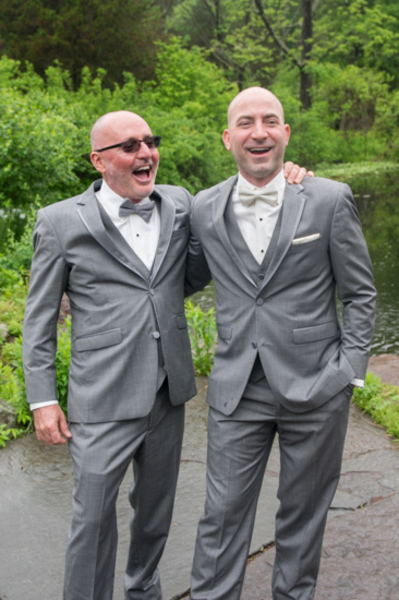 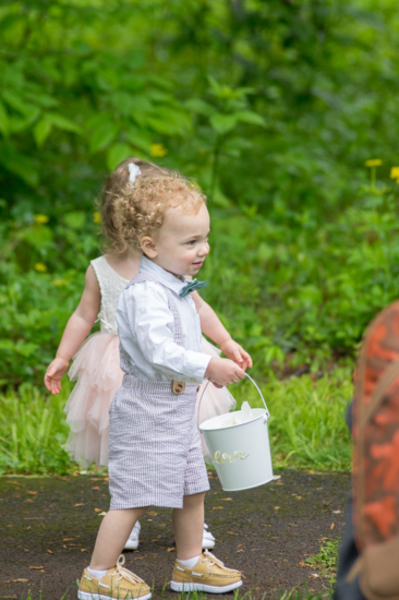 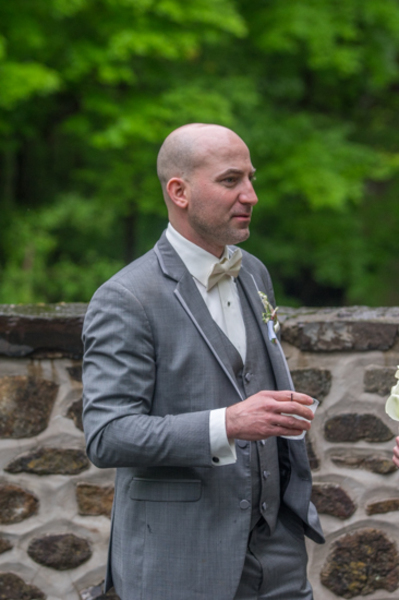 Next, our NJ Wedding Photographer snapped photos of all their relatives sharing a drink at their outdoor cocktail hour. 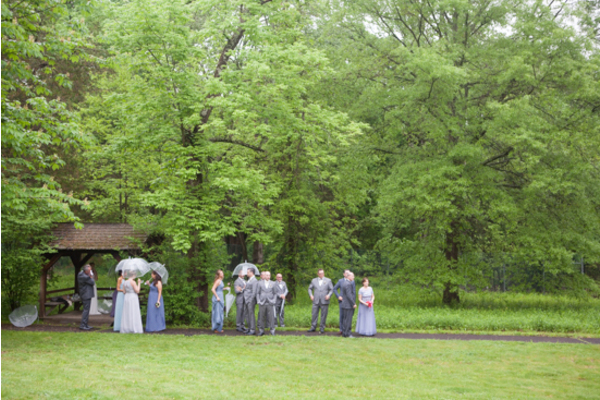 Soon, everyone headed inside to enjoy the lovely reception the couple had planned. 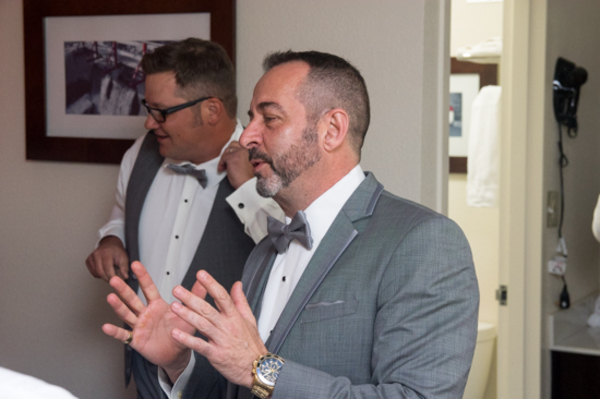 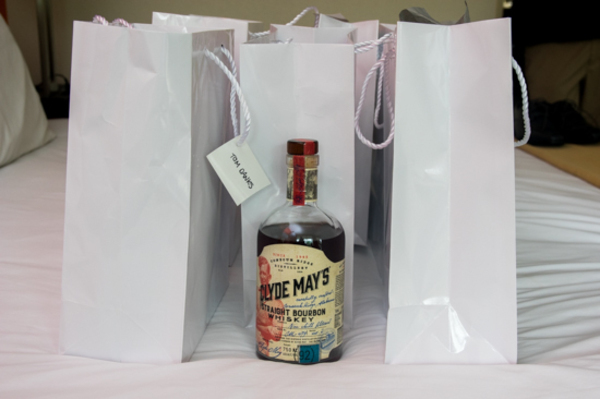 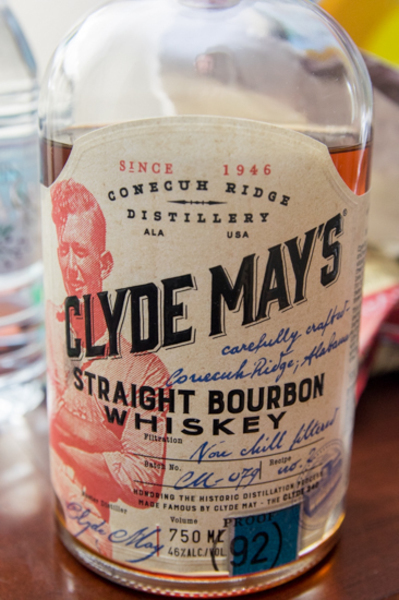 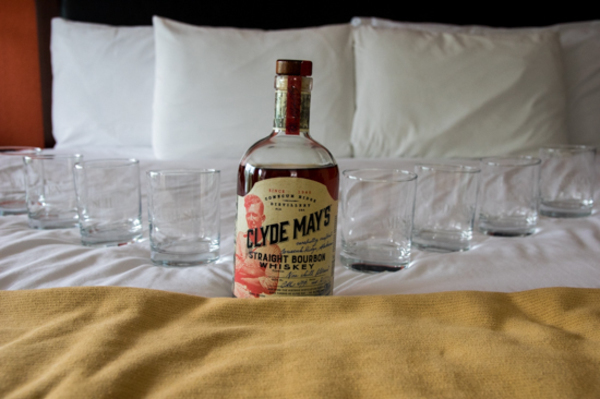 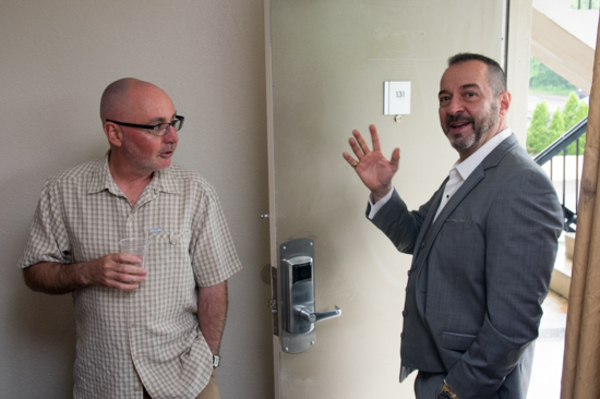 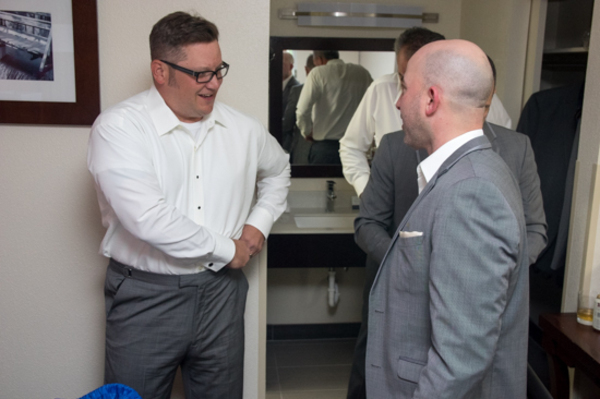 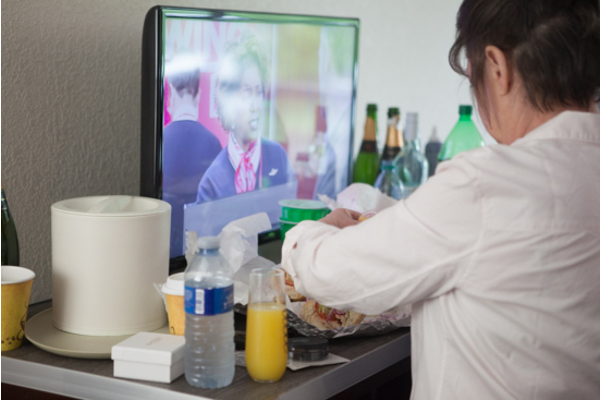 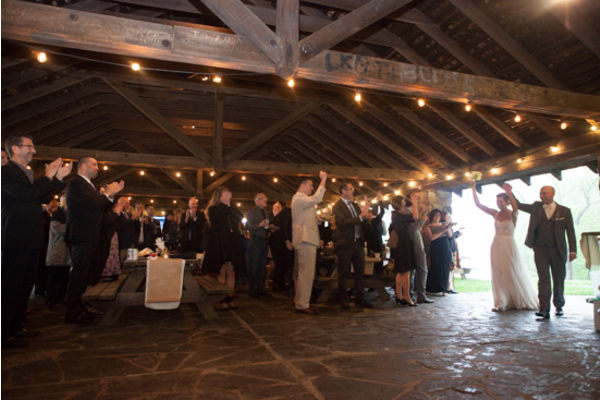 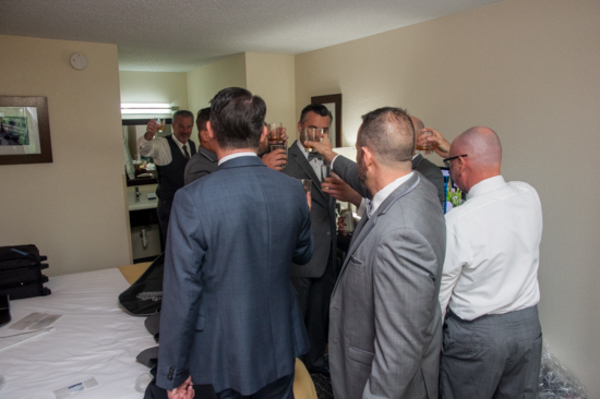 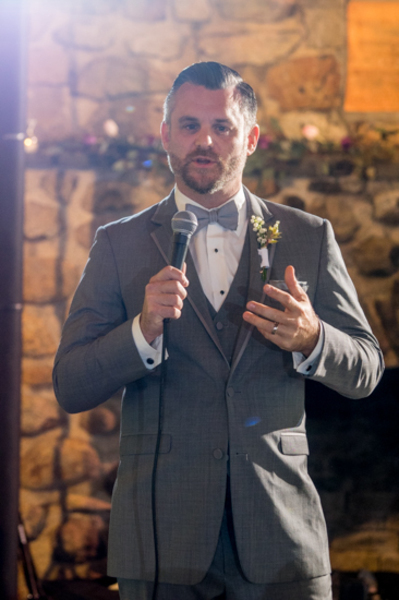 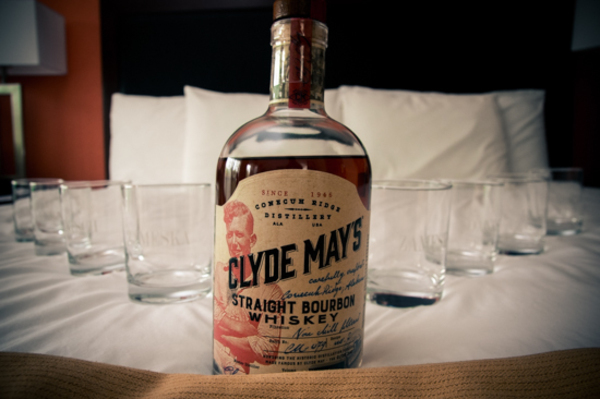 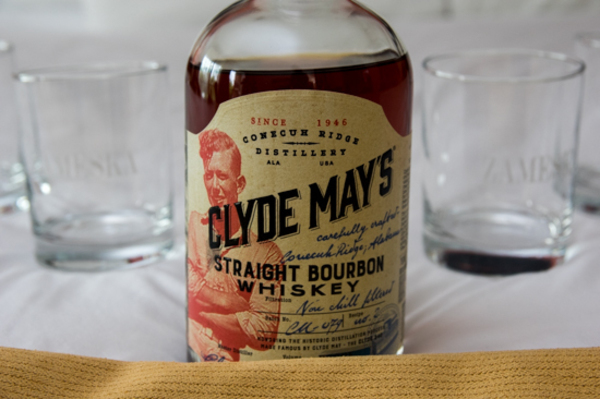 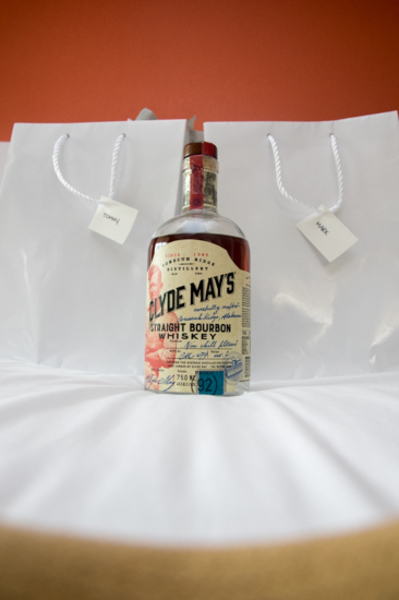 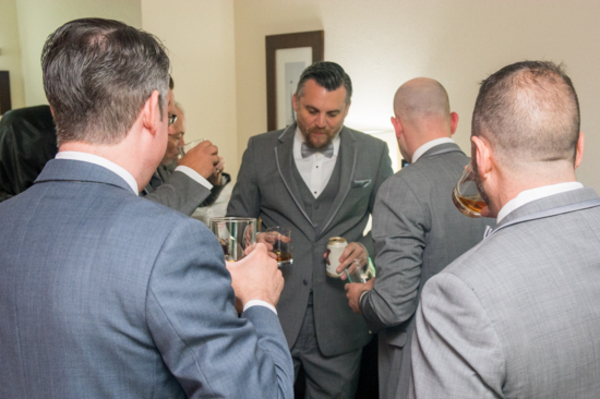 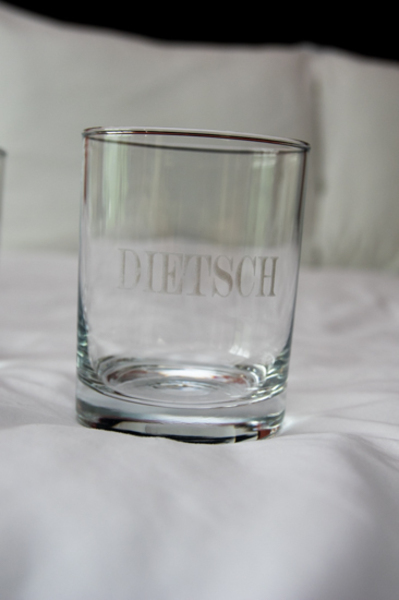 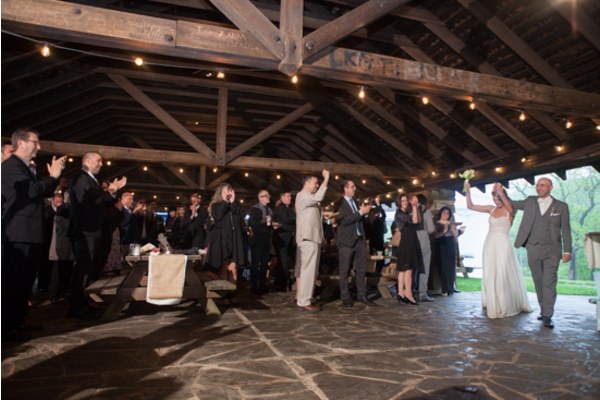 Speeches were given and toasts were made making this night one to remember! 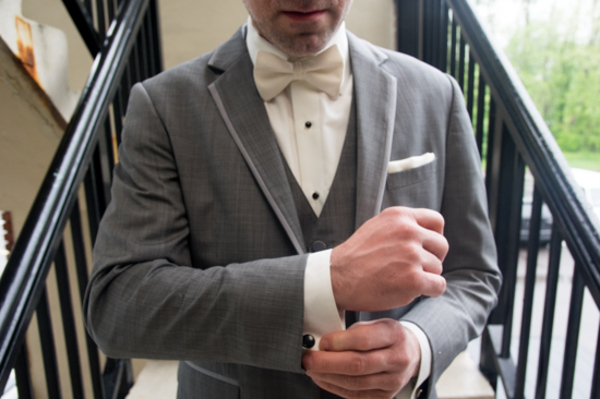 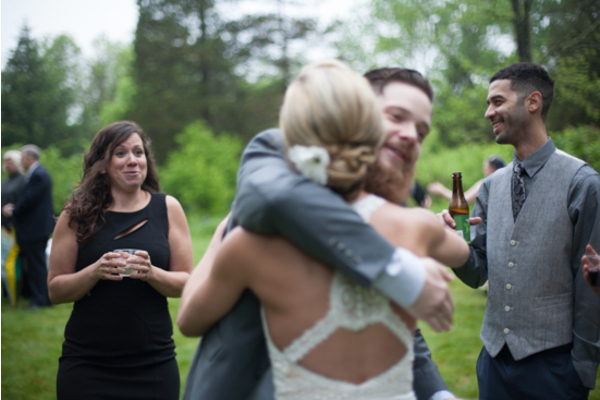 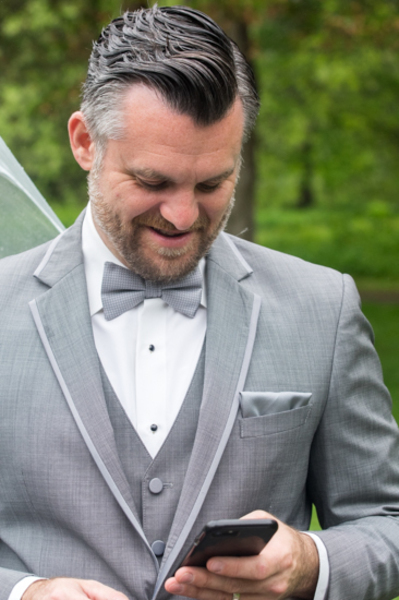 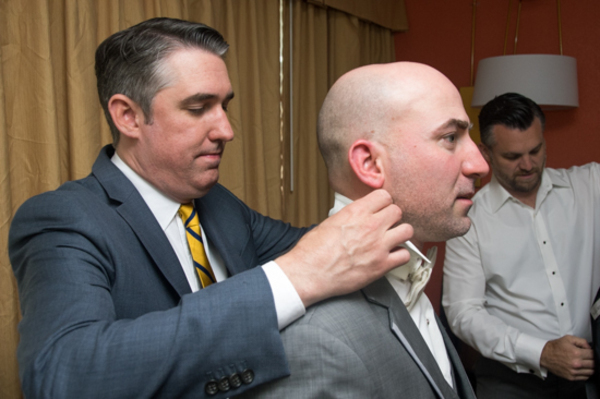 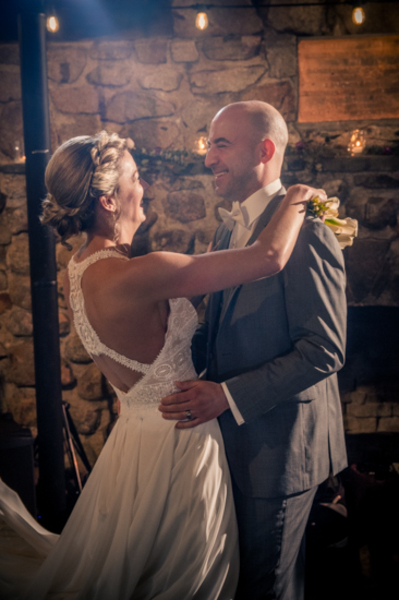 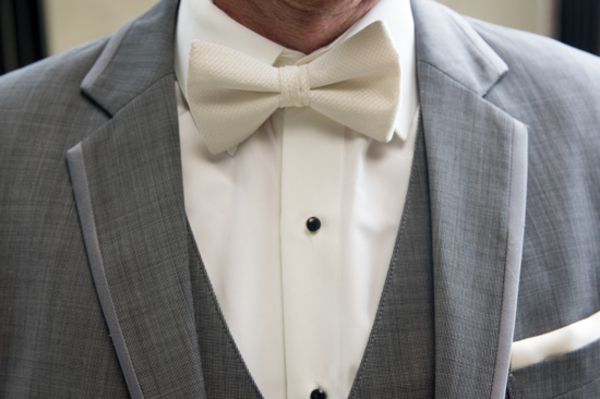 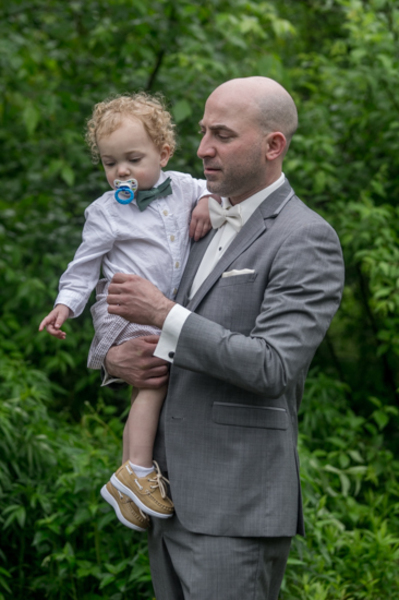 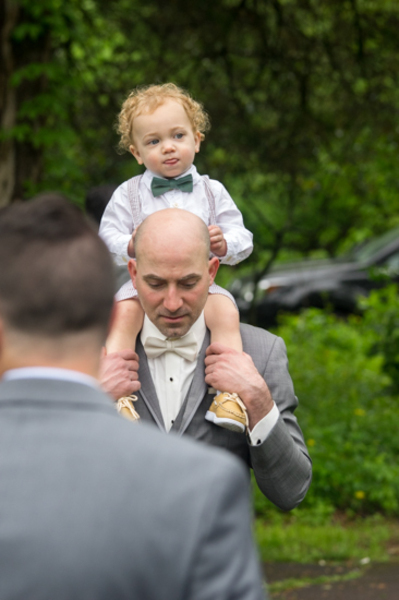 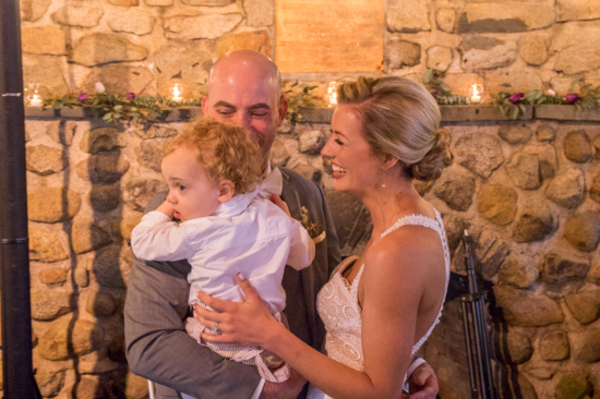 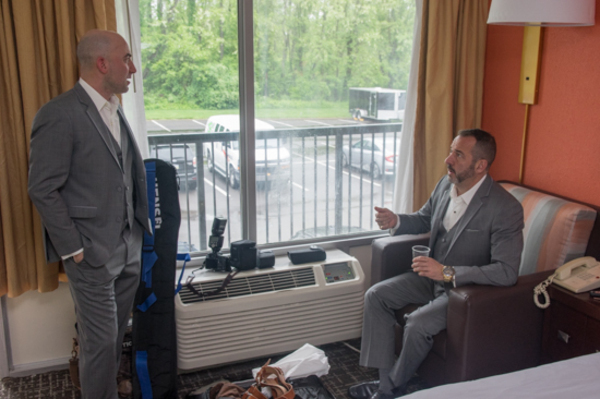 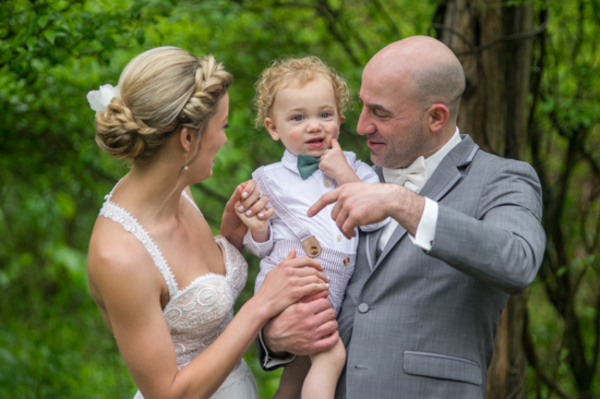 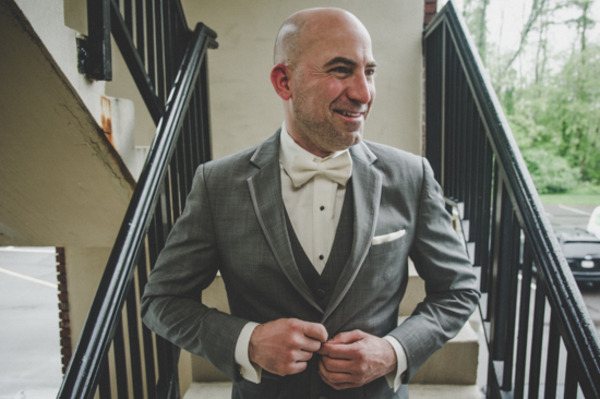 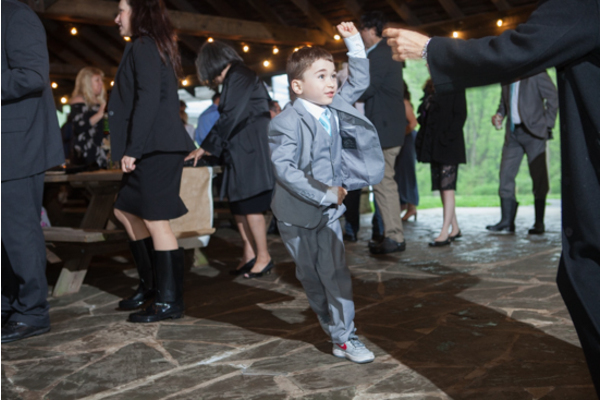 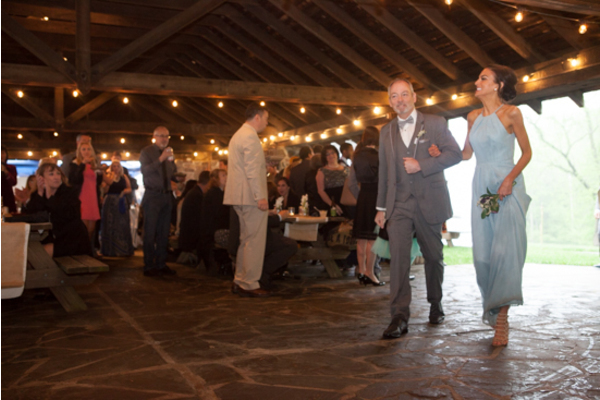 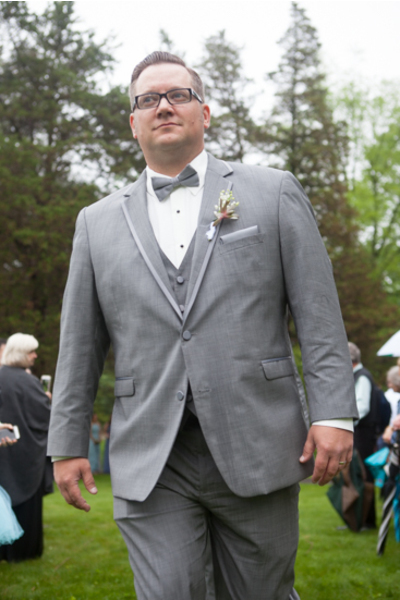 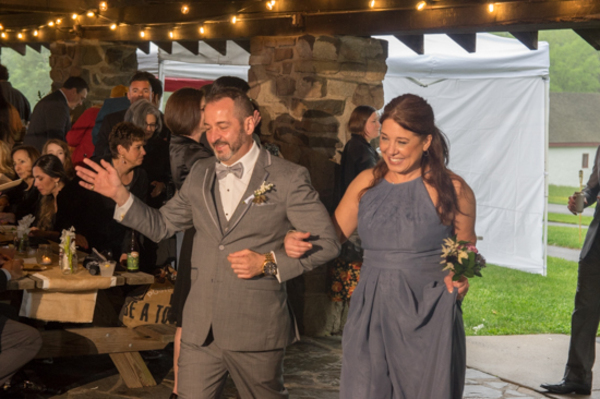 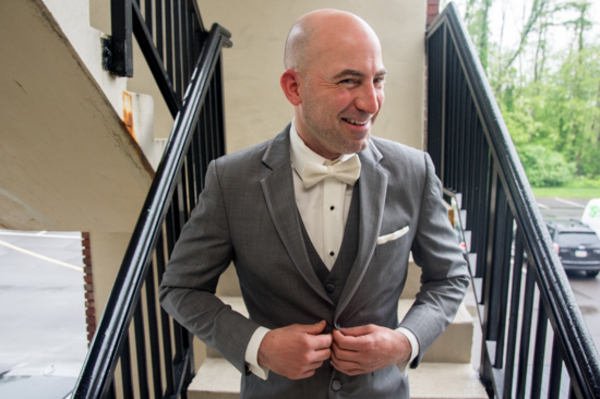 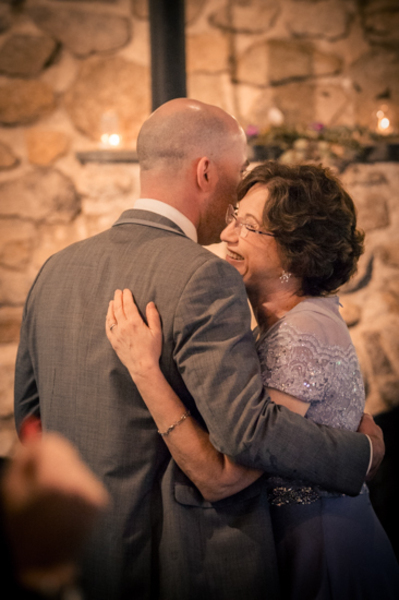 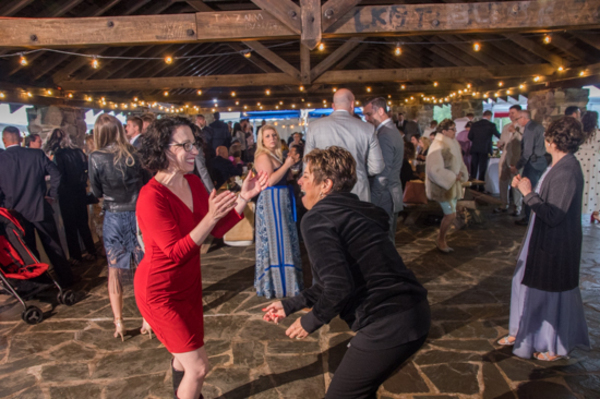 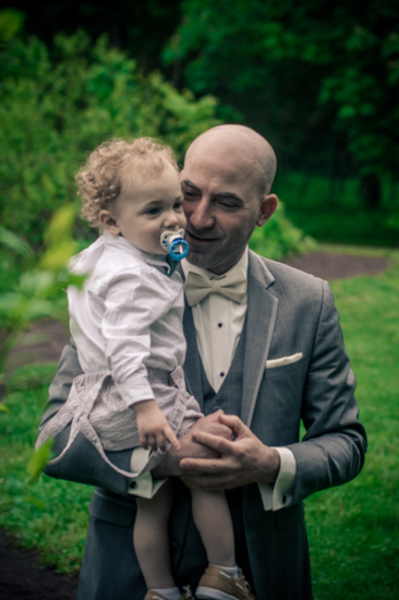 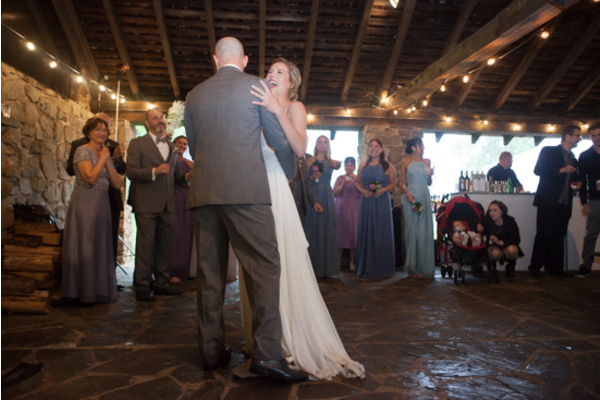 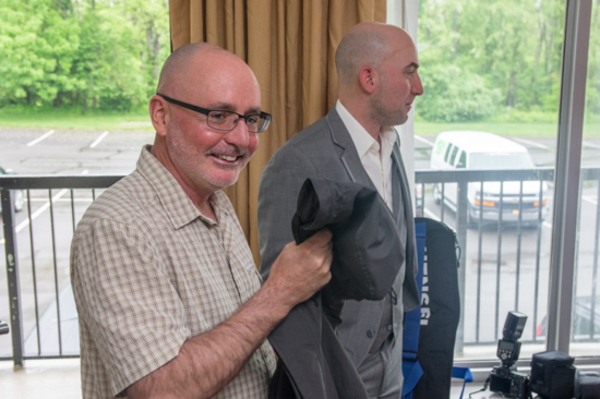 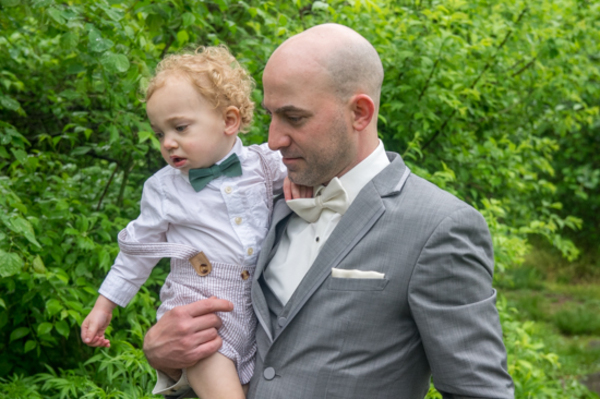 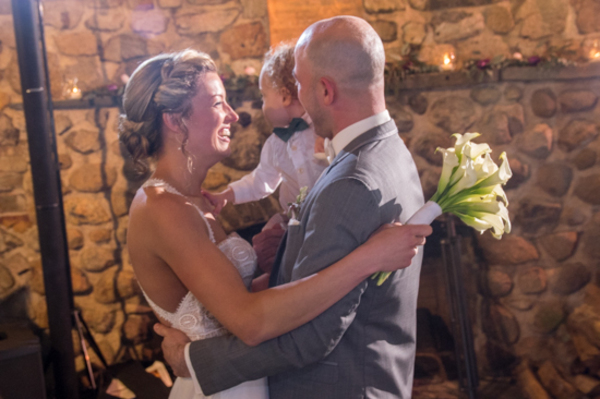 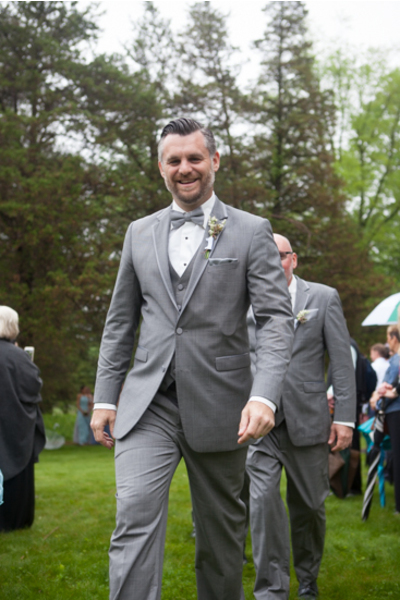 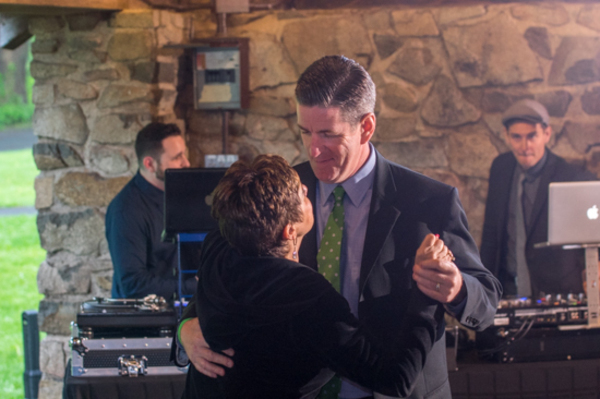 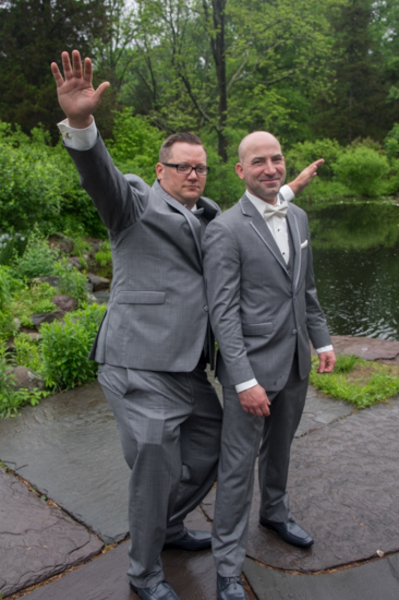 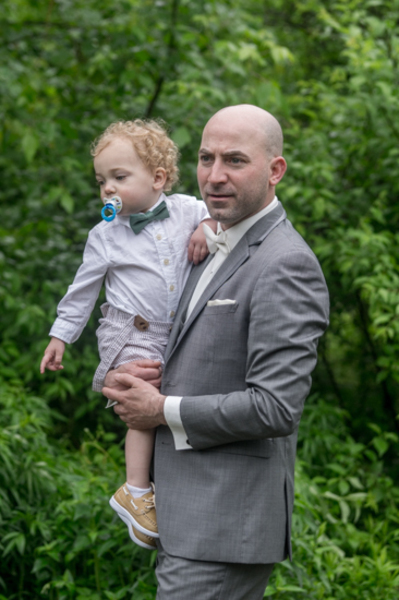 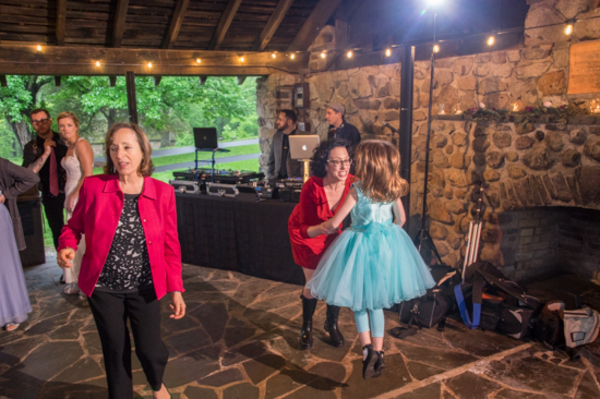 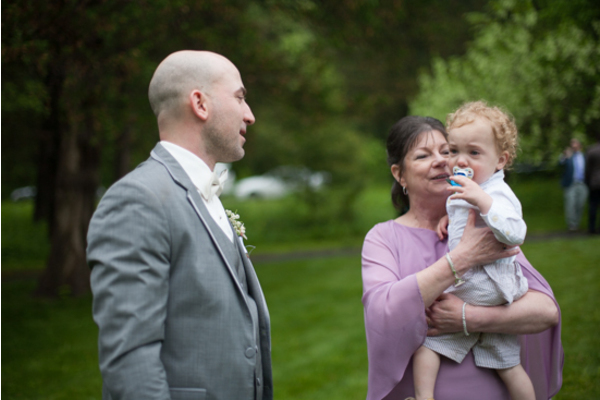 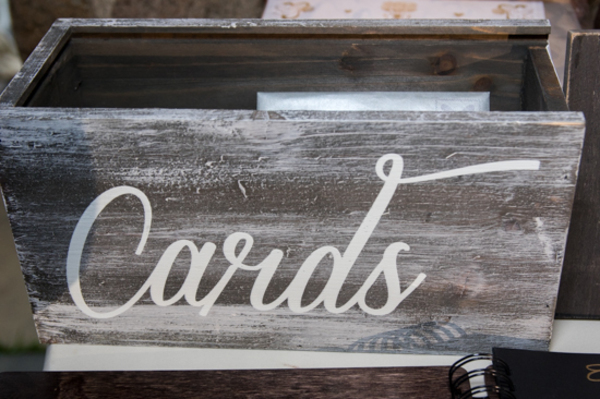 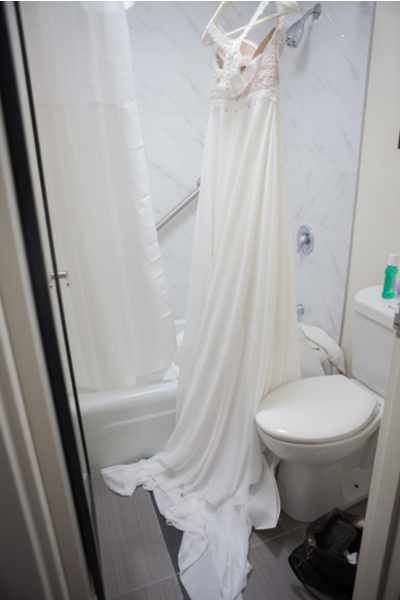 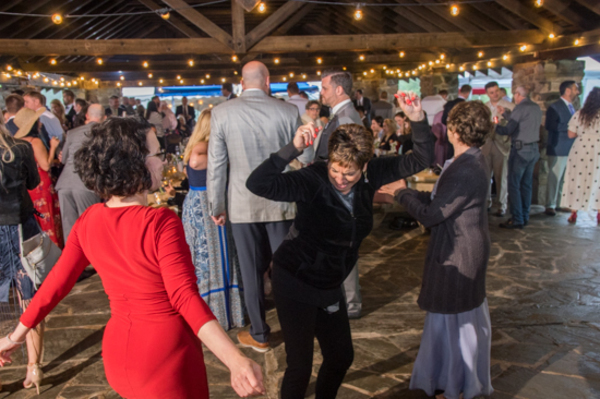 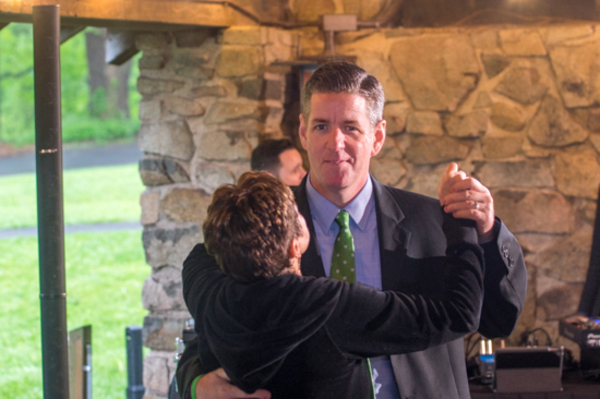 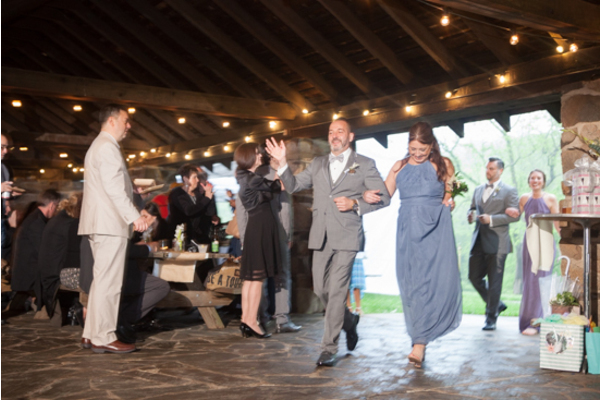 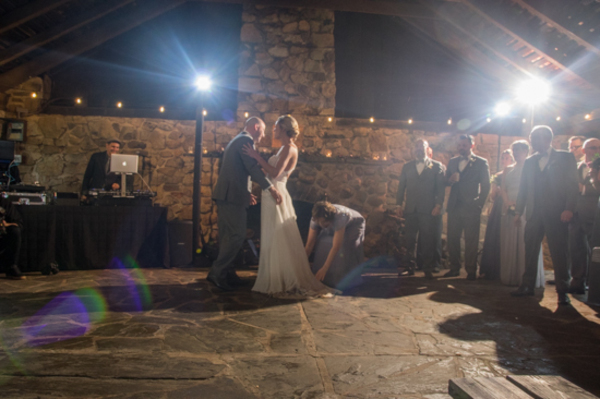 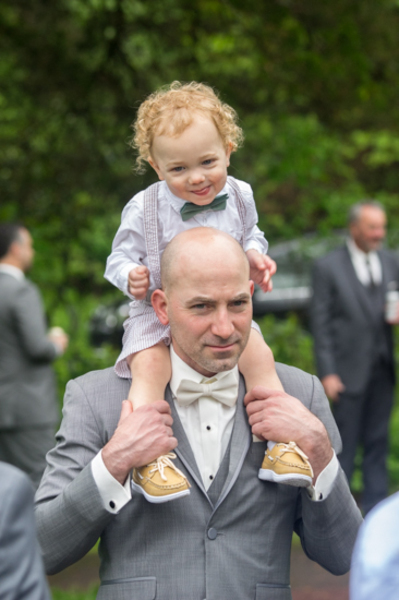 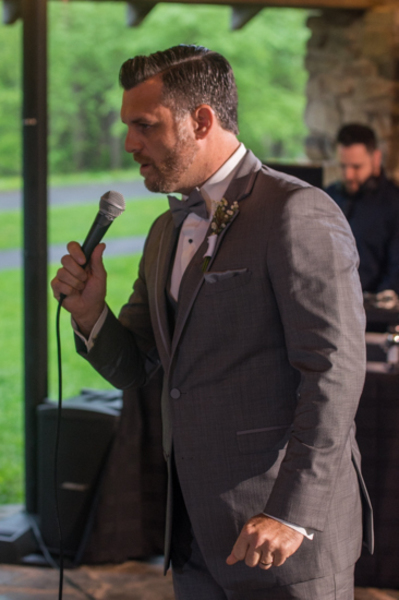 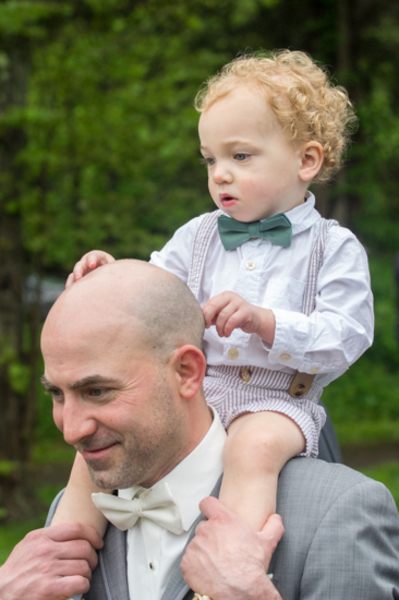 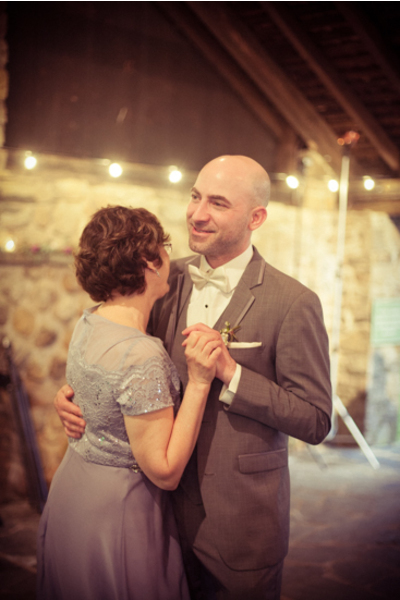 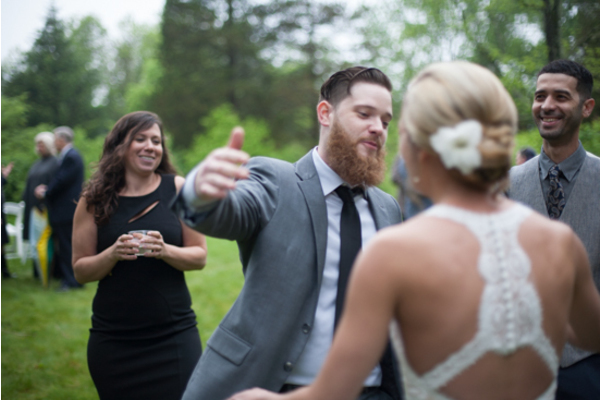 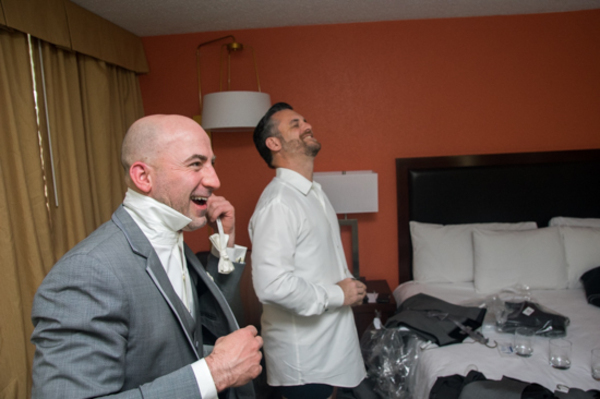 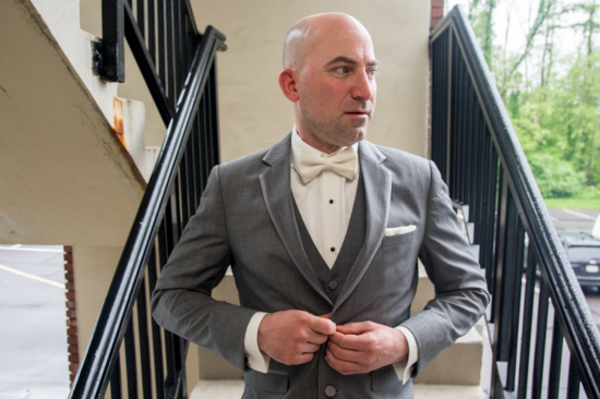 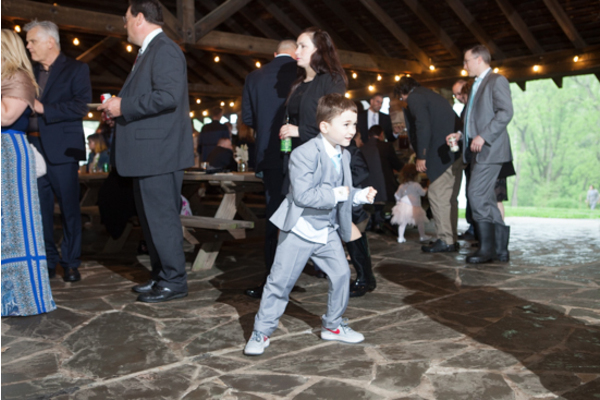 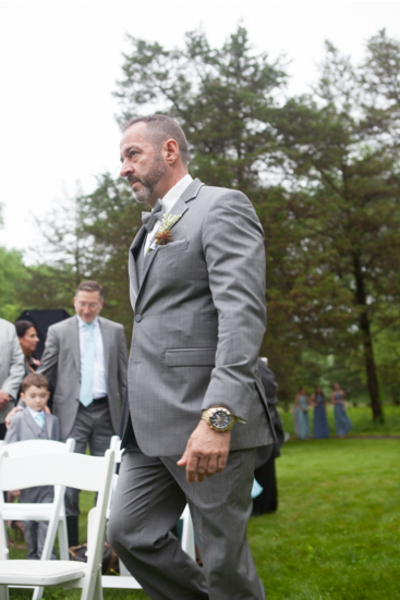 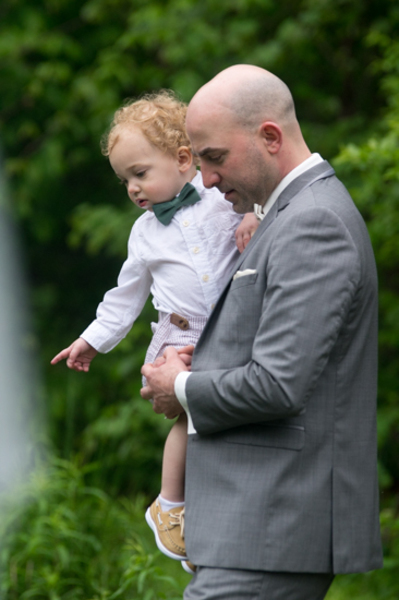 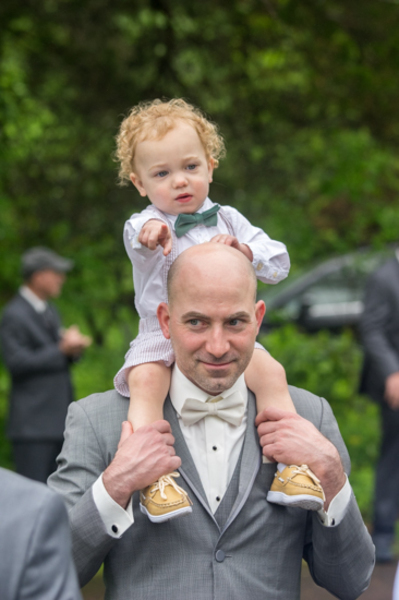 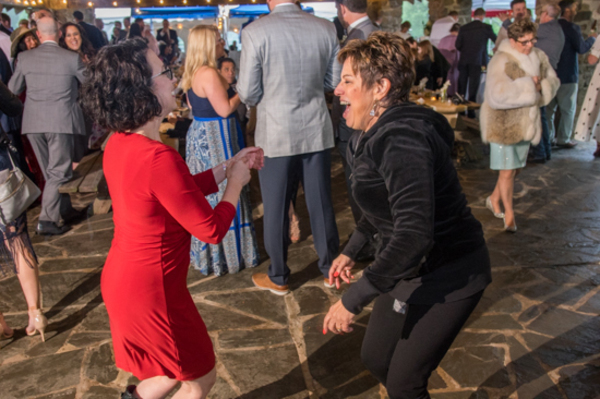 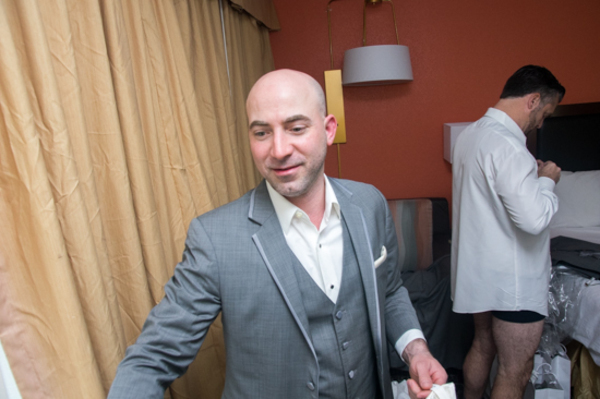 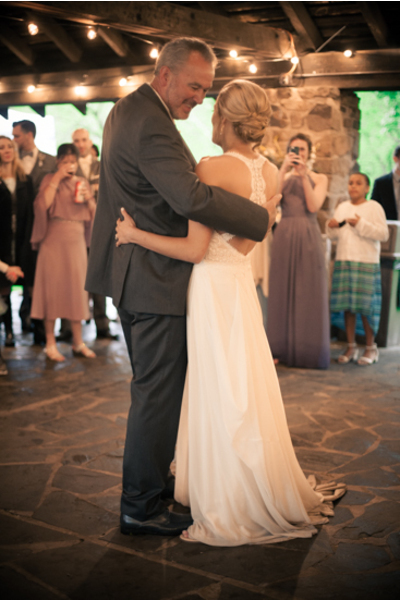 Lastly, our NJ Wedding Photographer captured everything from the first dance to the last that night! 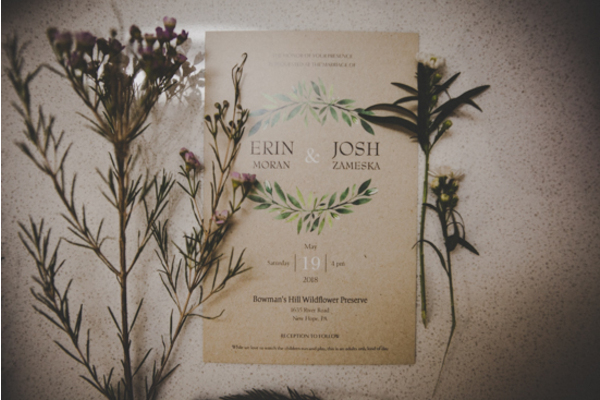 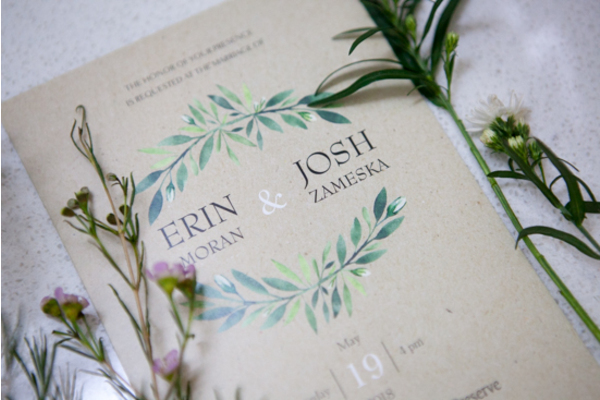 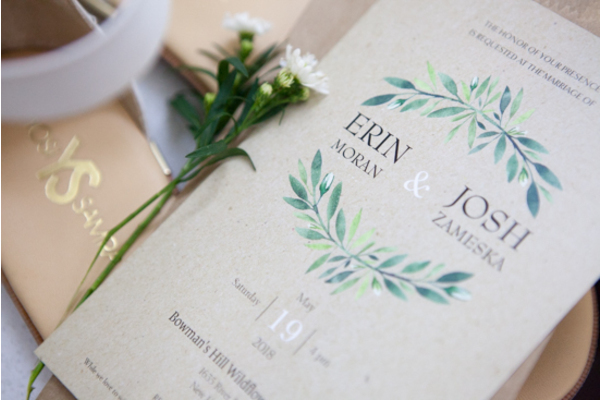 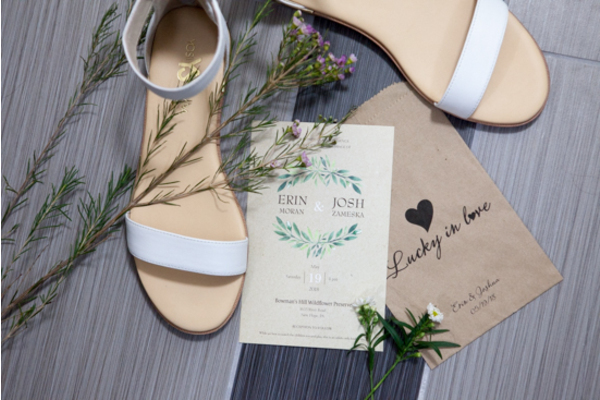 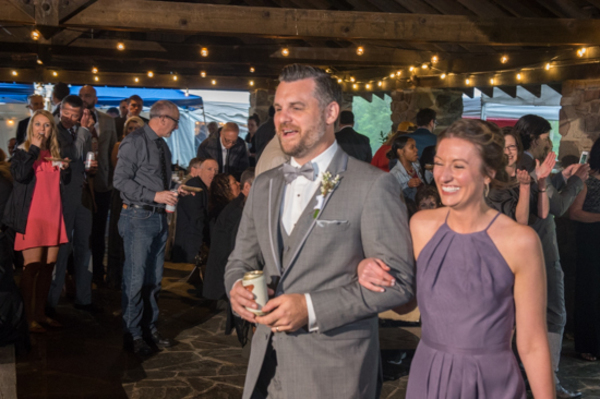 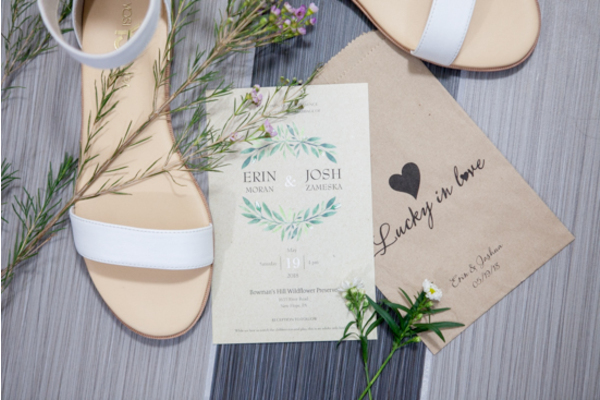 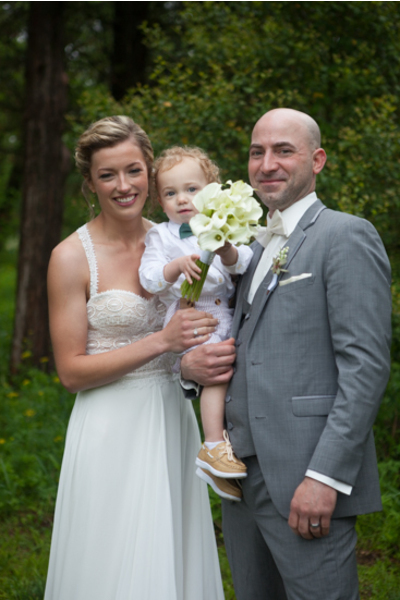 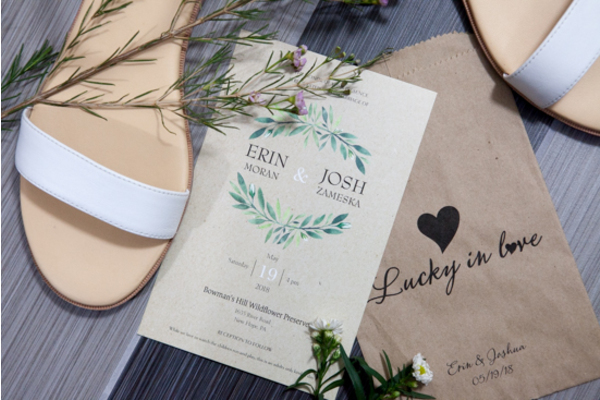 Congratulations, again, to Erin and Josh. 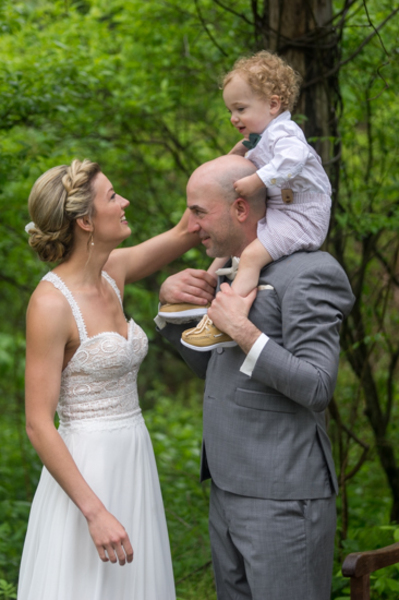 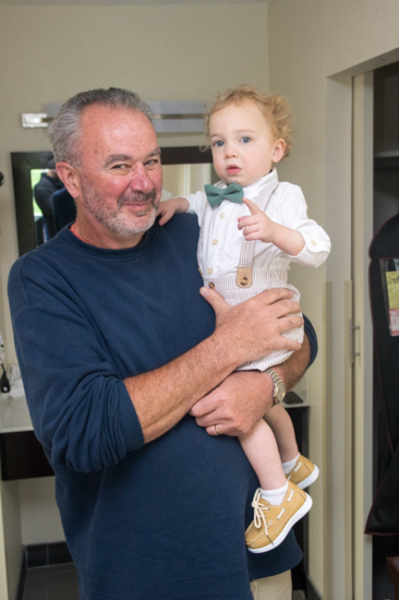 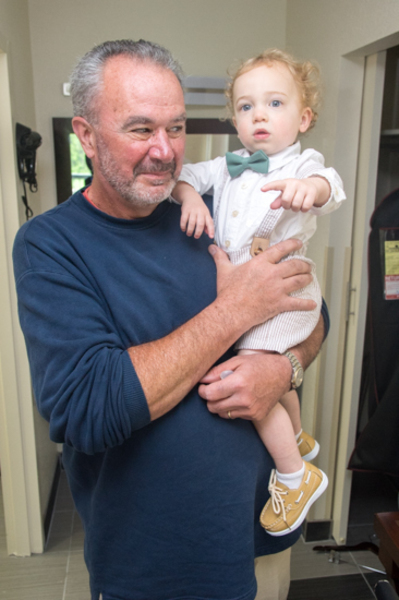 We loved celebrating your very special day!